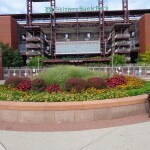 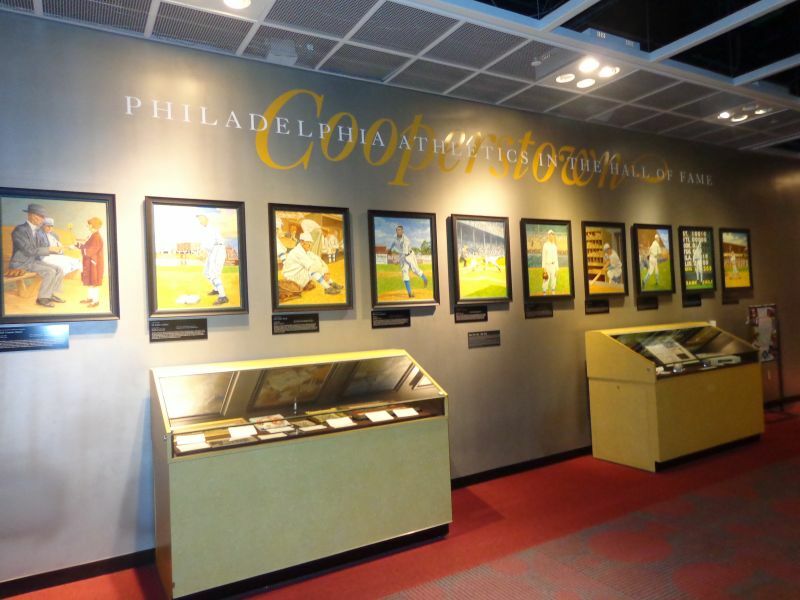 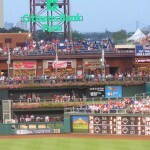 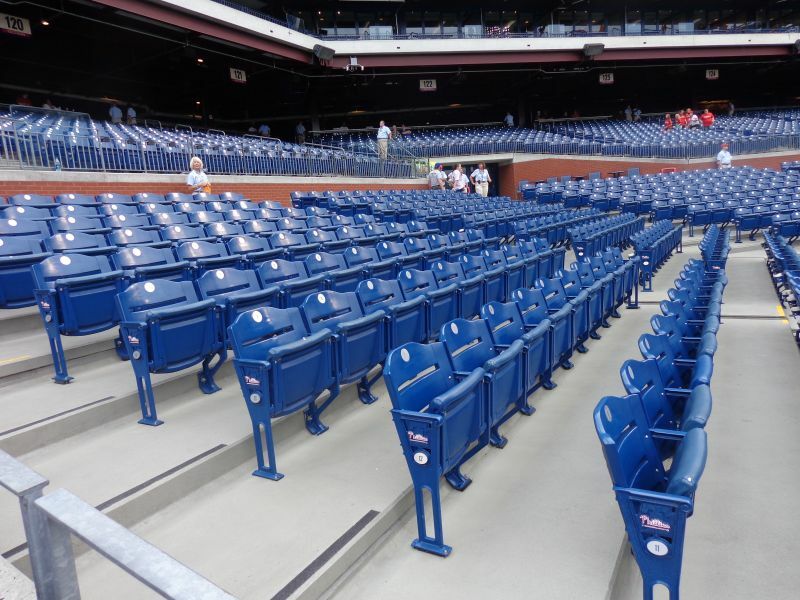 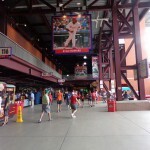 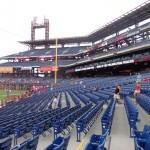 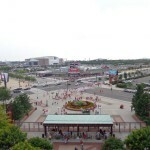 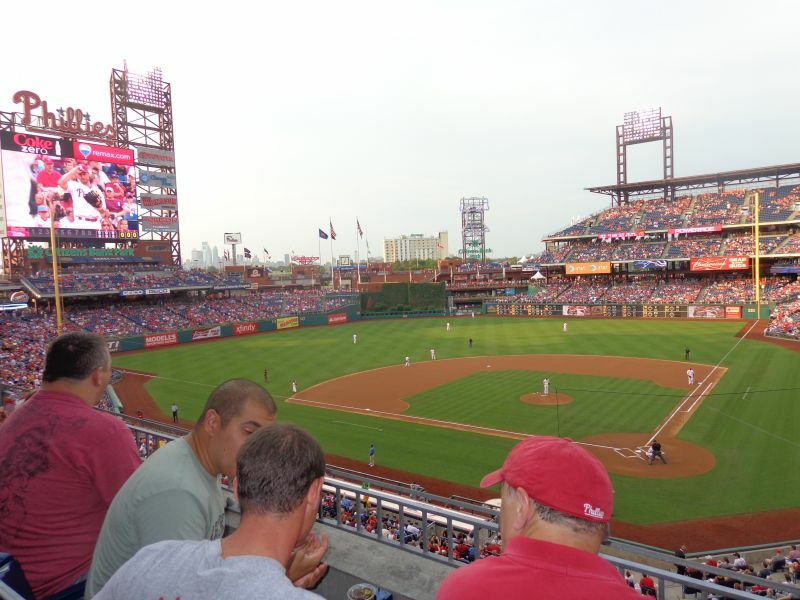 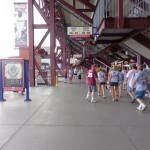 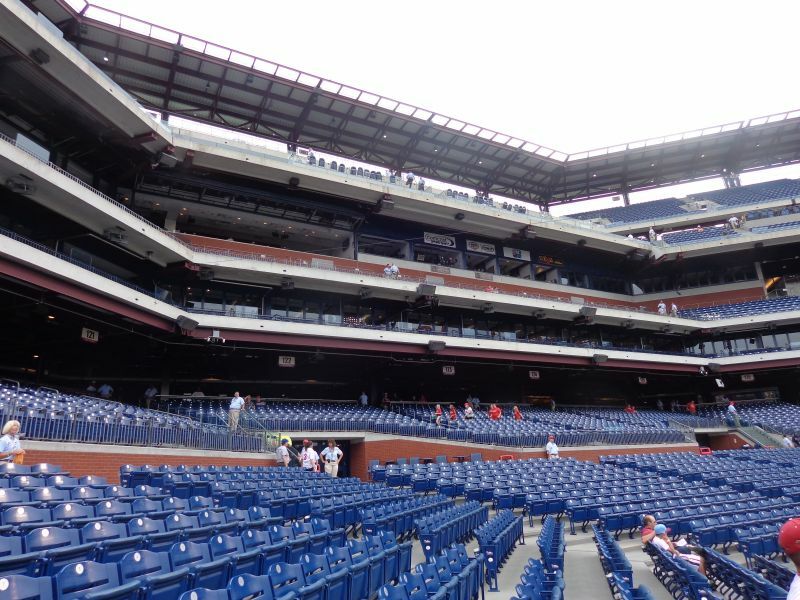 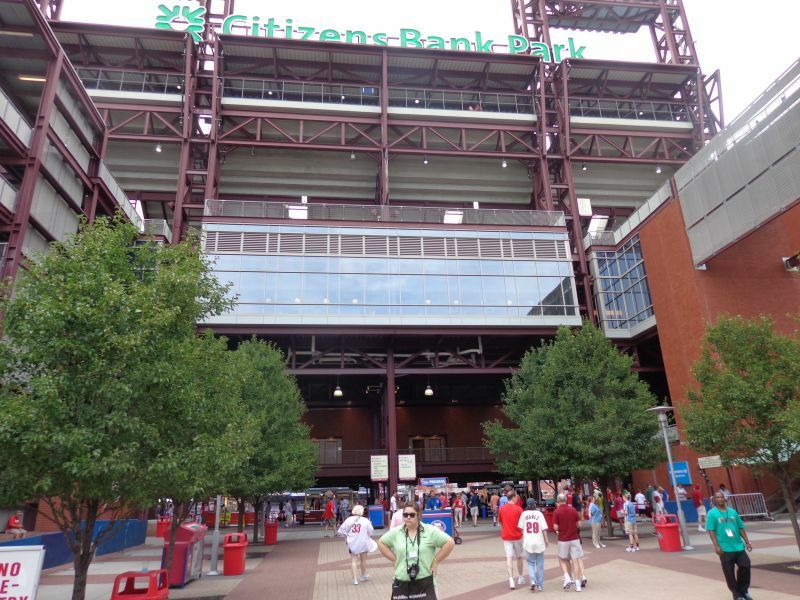 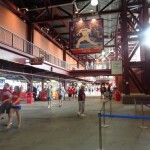 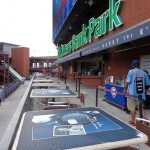 Upon opening in 2004, Citizens Bank Park was deemed a significant step forward in ballpark design through superior functionality and admirable attention to detail. 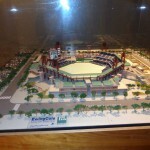 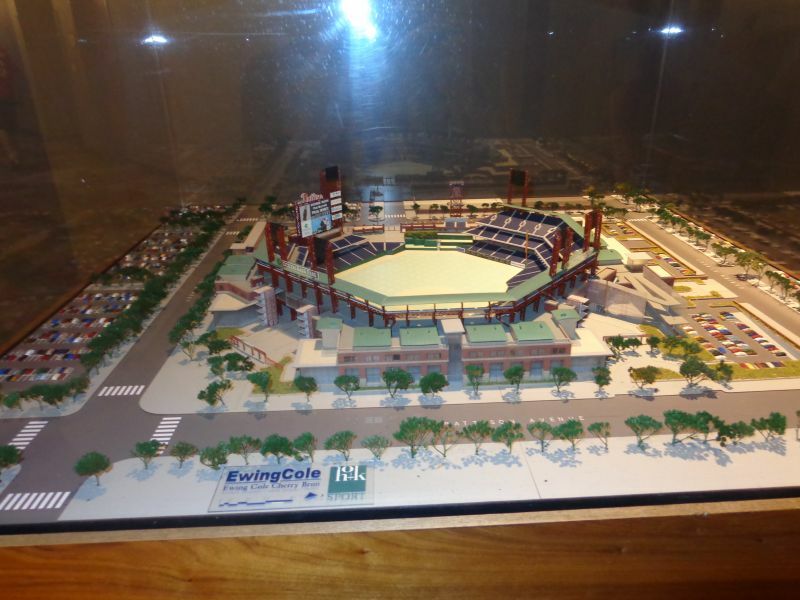 But the ballpark is more notable in what it lacks: a good location. 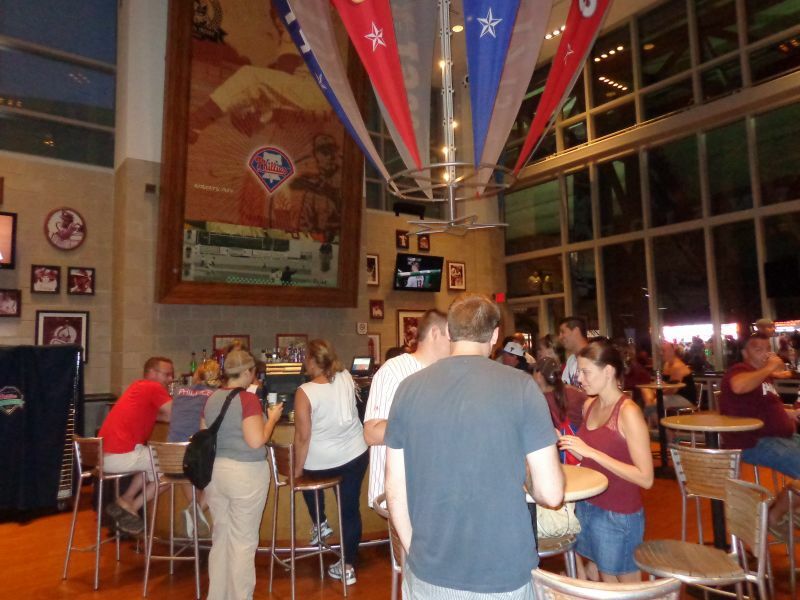 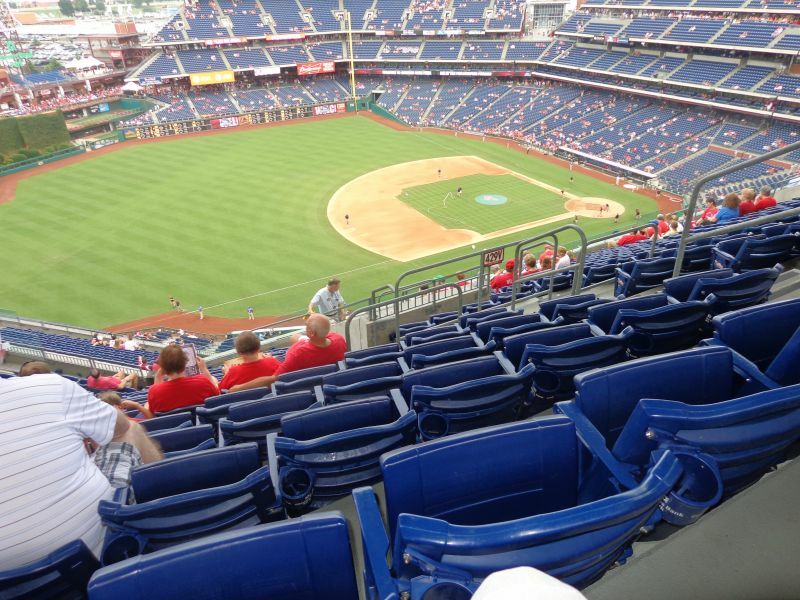 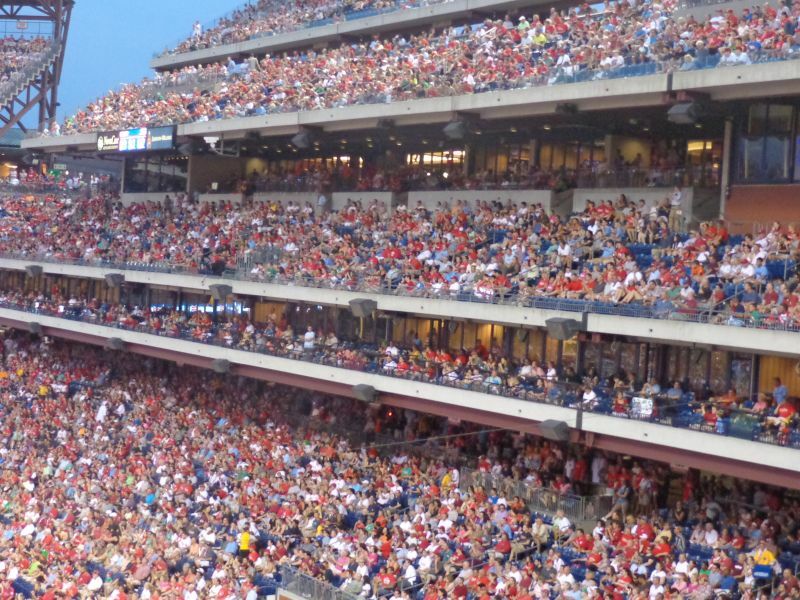 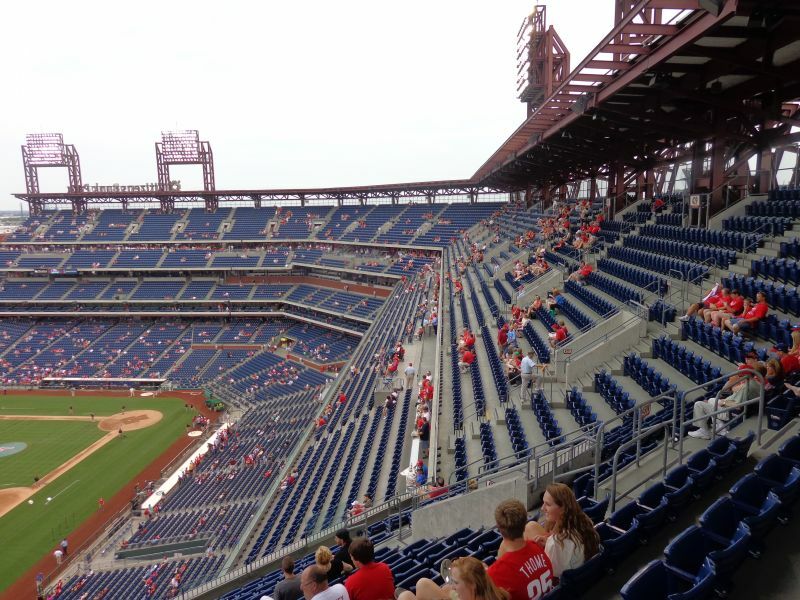 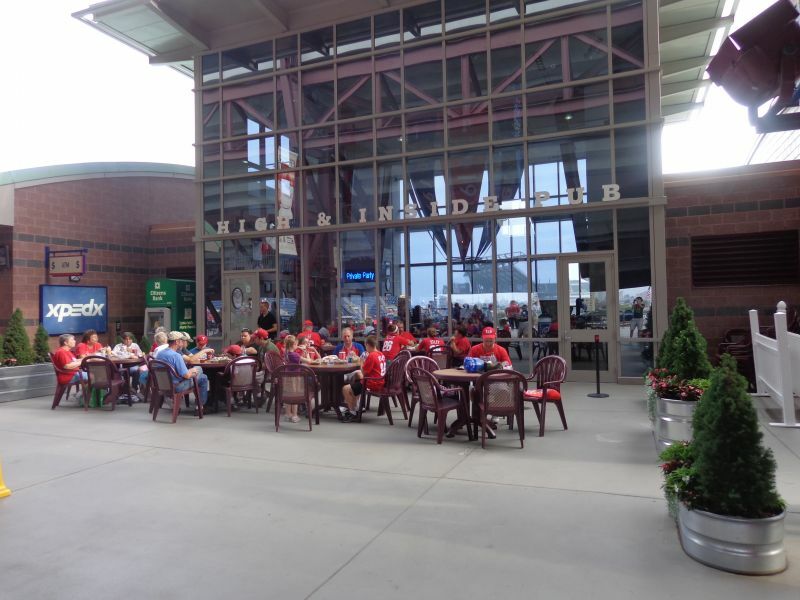 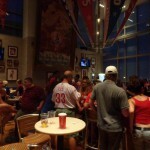 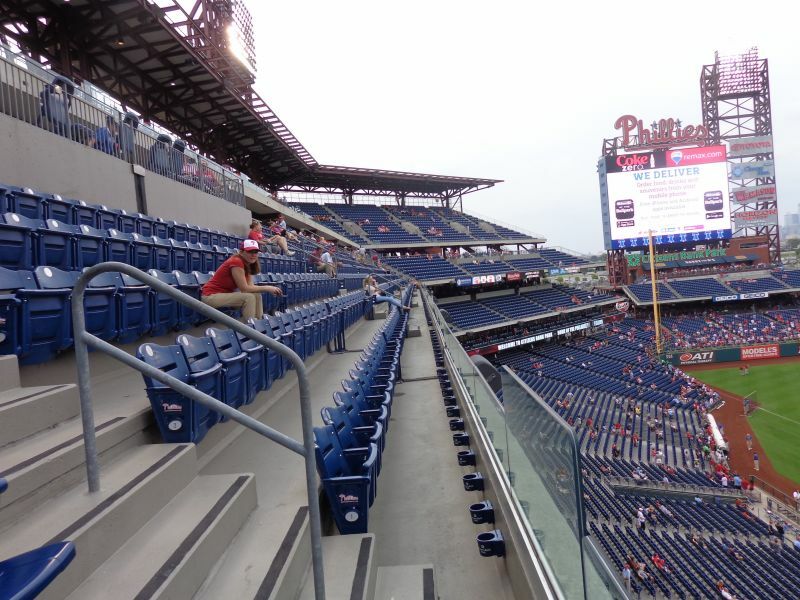 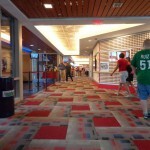 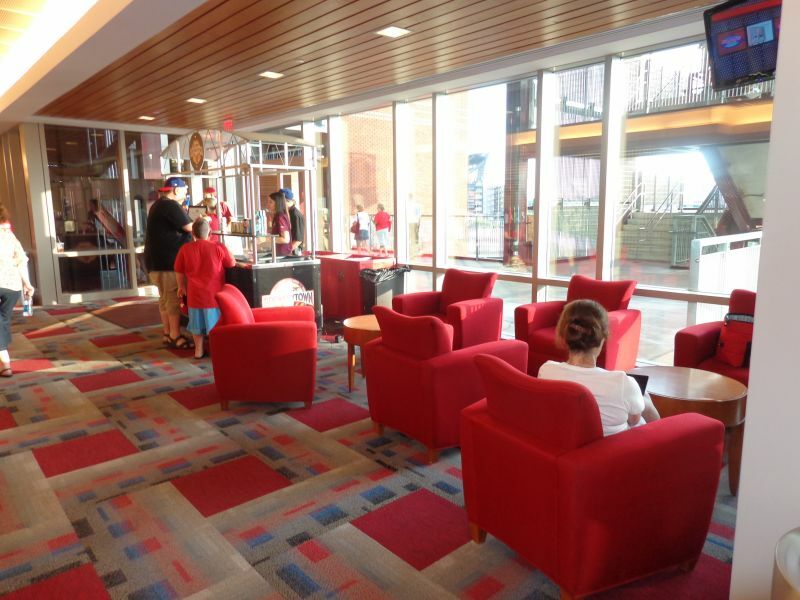 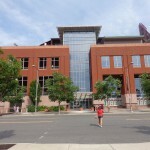 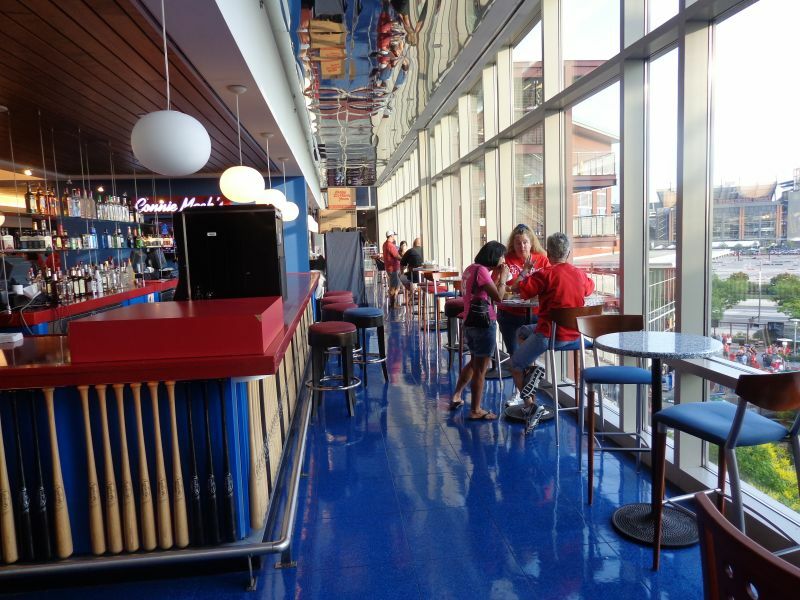 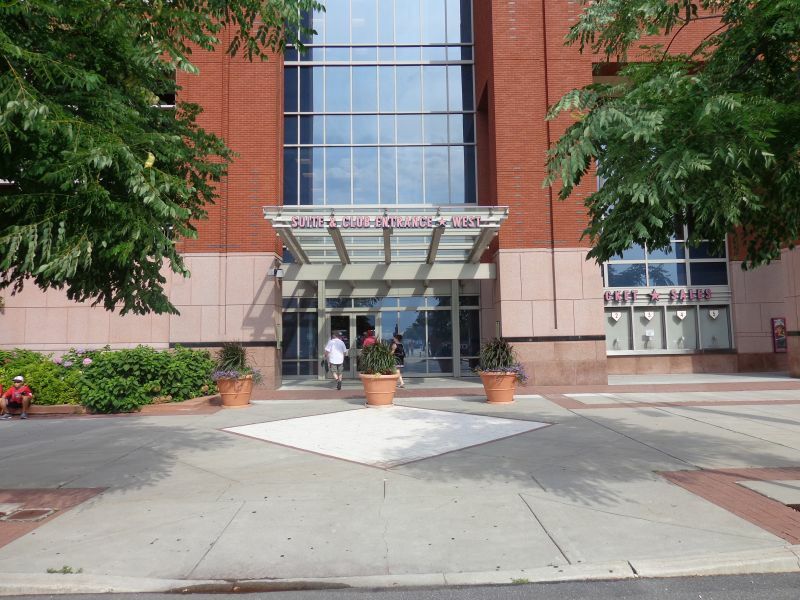 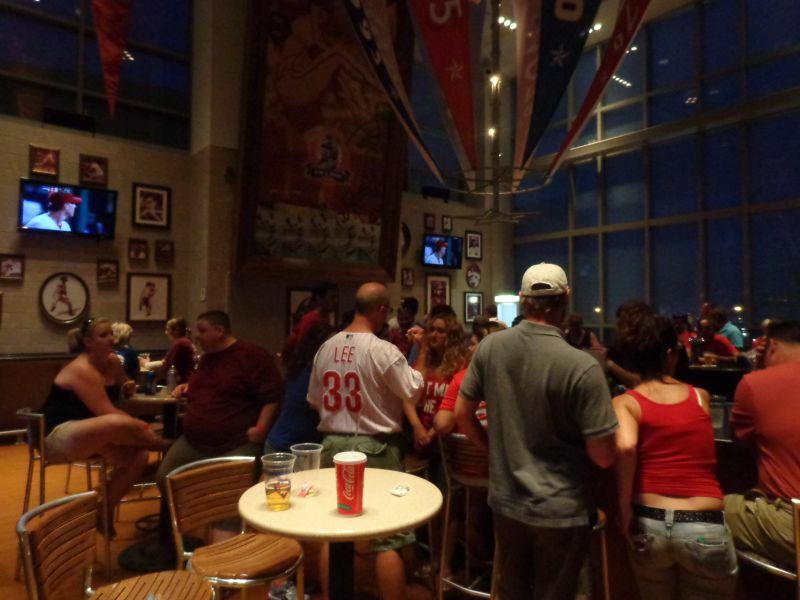 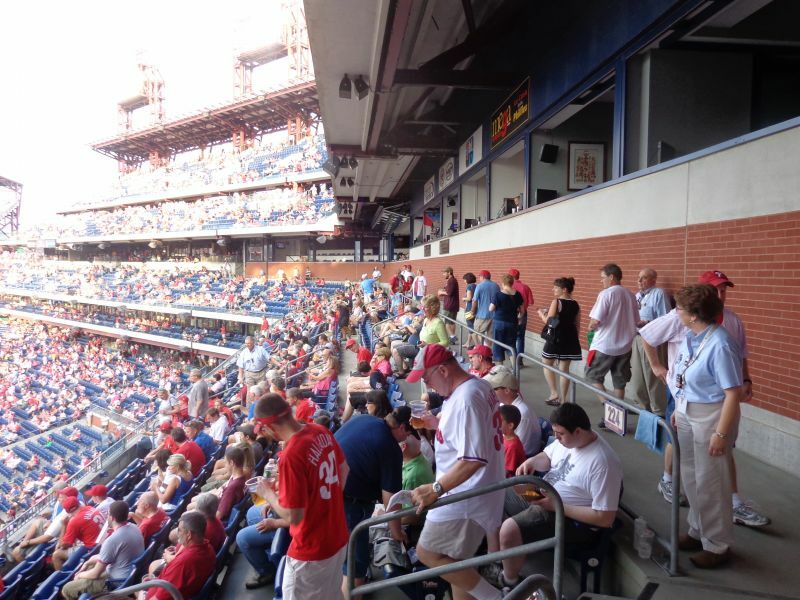 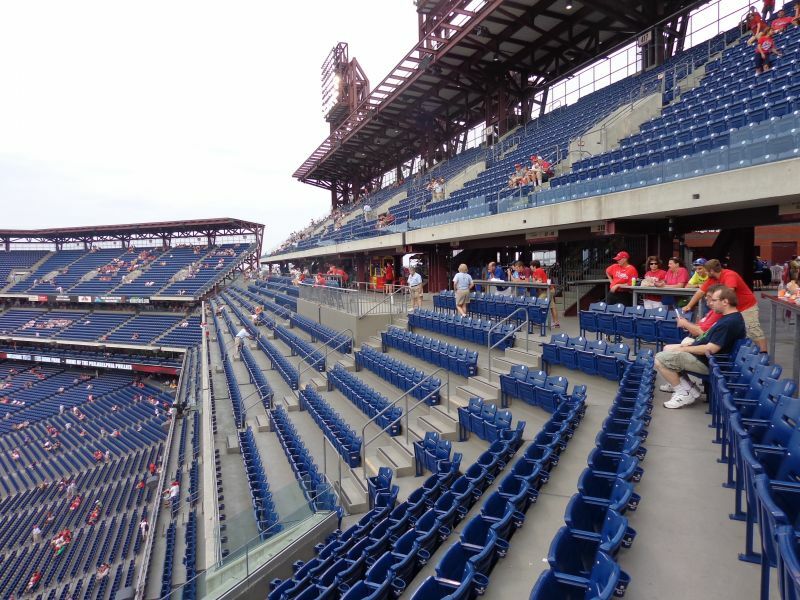 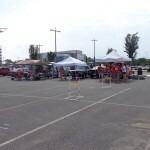 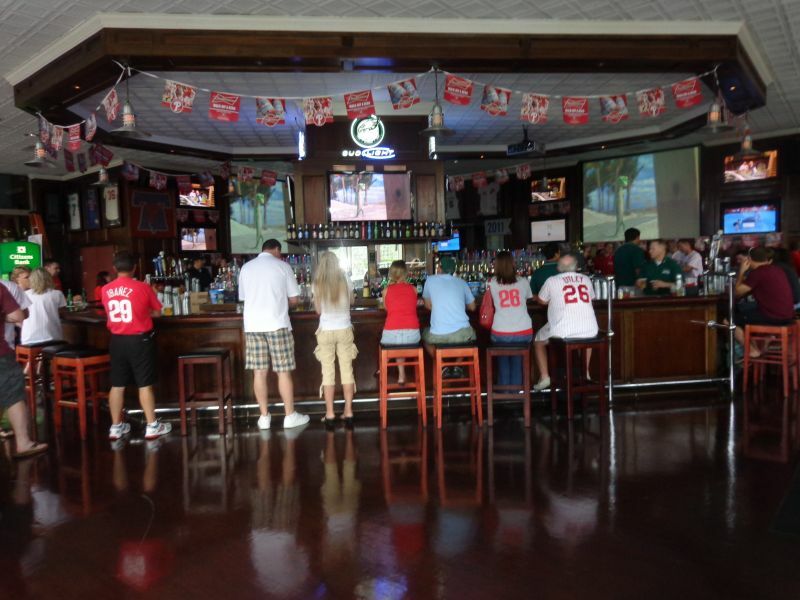 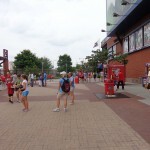 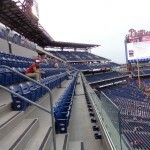 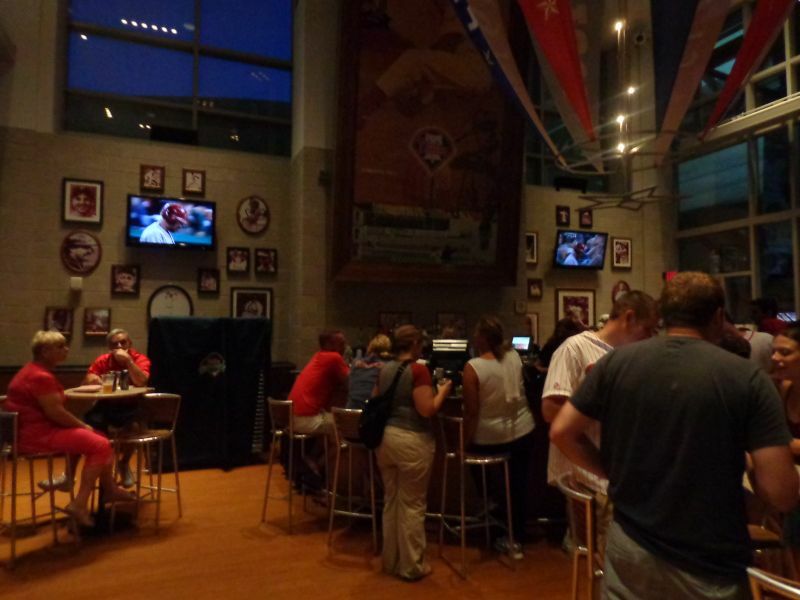 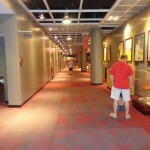 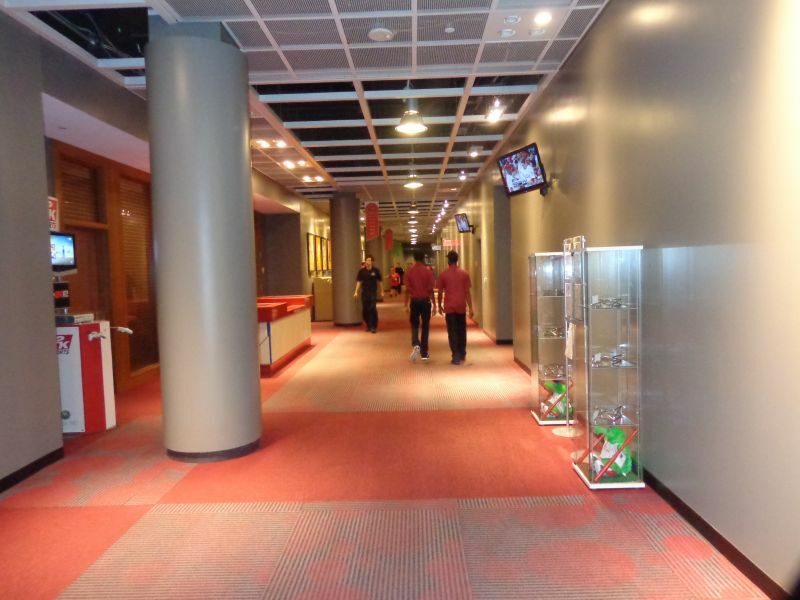 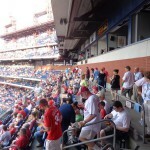 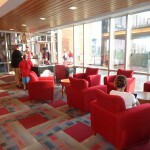 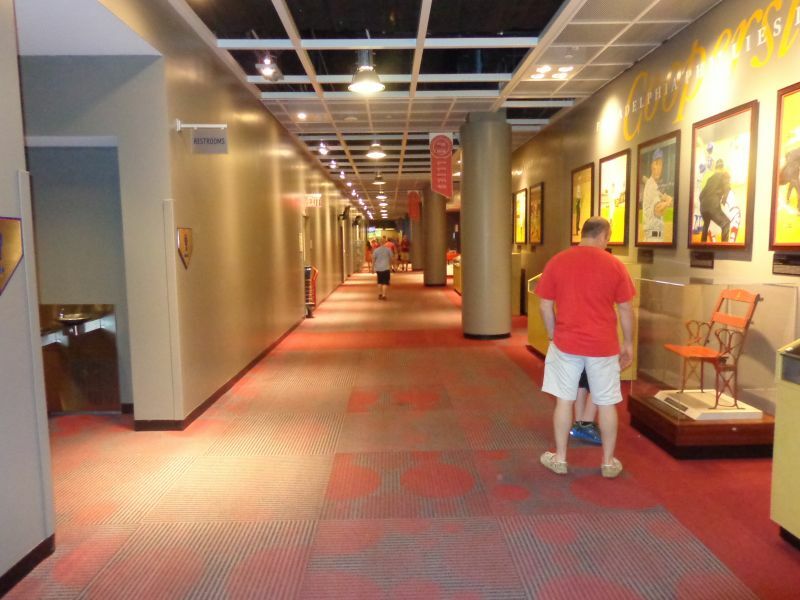 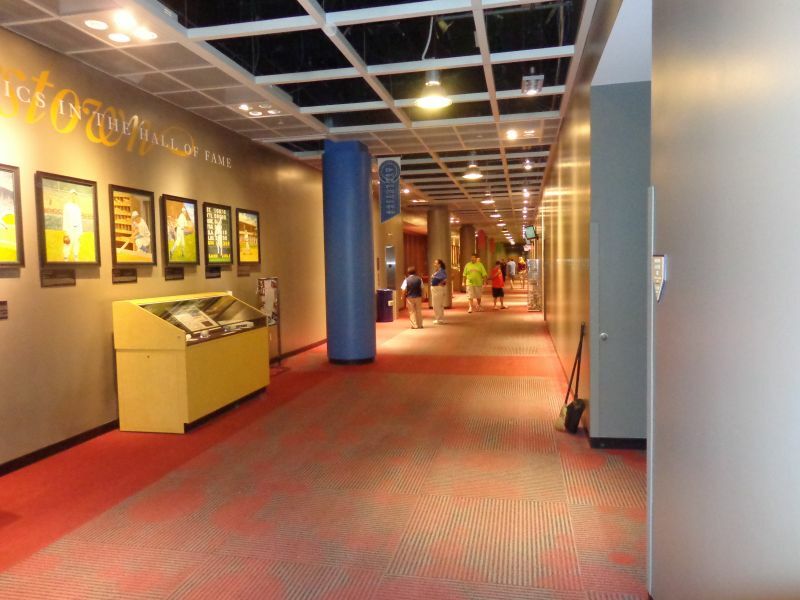 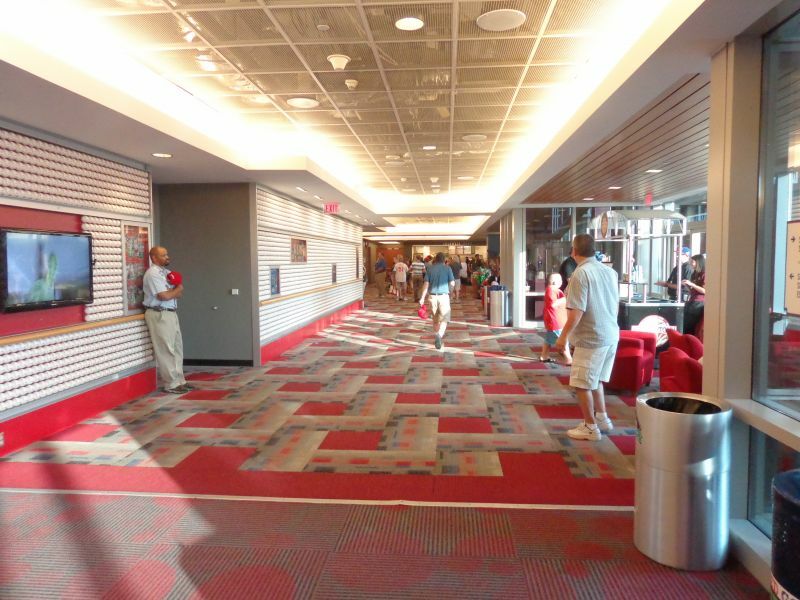 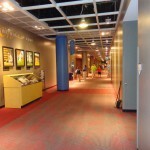 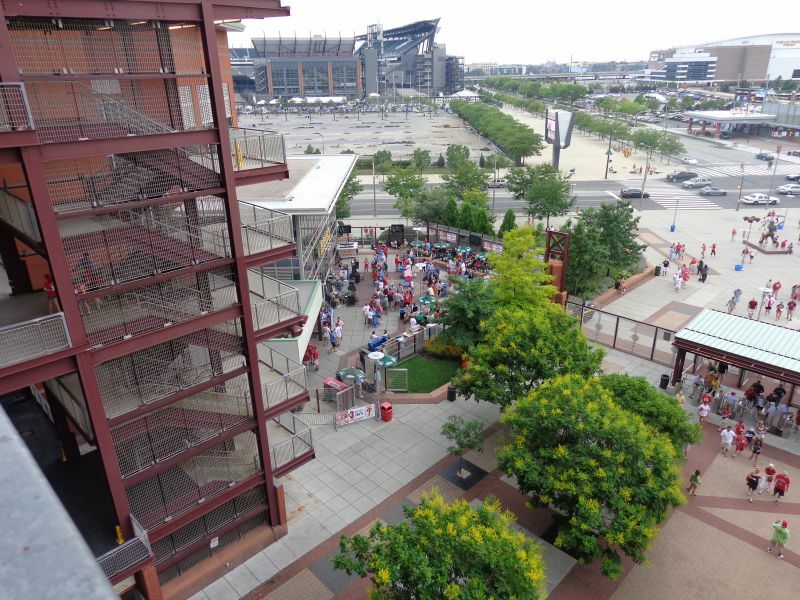 The Phillies’ fan friendly pad is an outlier in the ballpark community in two senses. 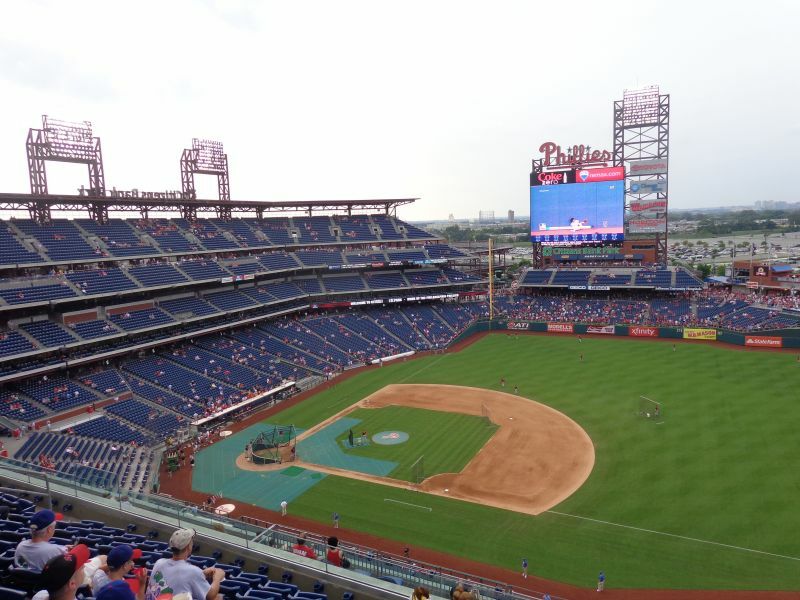 There’s often a lot of difference of opinion in something as subjective and tribal as a baseball team’s home, but the reviews are nearly unanimous in their tune here: this is one of the better ballparks in baseball, but the setting prevents it from being one of the best overall. 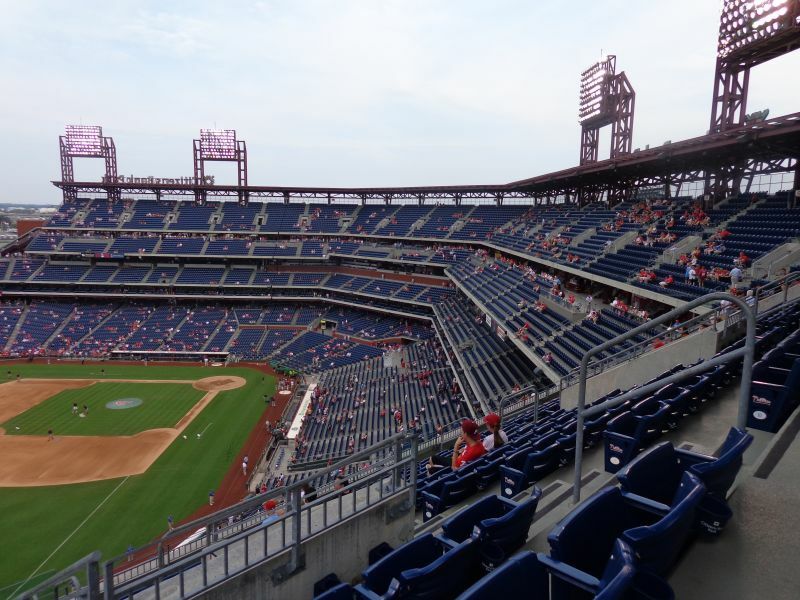 At the same time, it’s the only post-1991 major league stadium with a poor location and subpar local scene that gets generally good reviews. 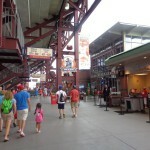 Ballparks are products of their surroundings. 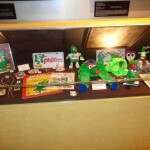 The true retro movement is about context in a community. 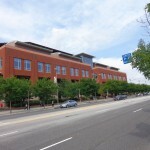 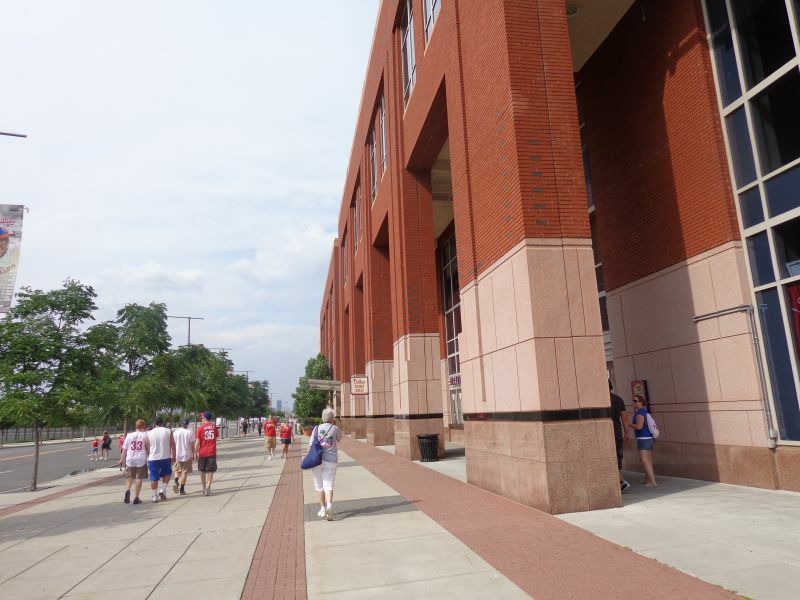 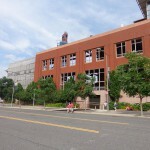 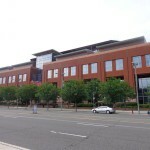 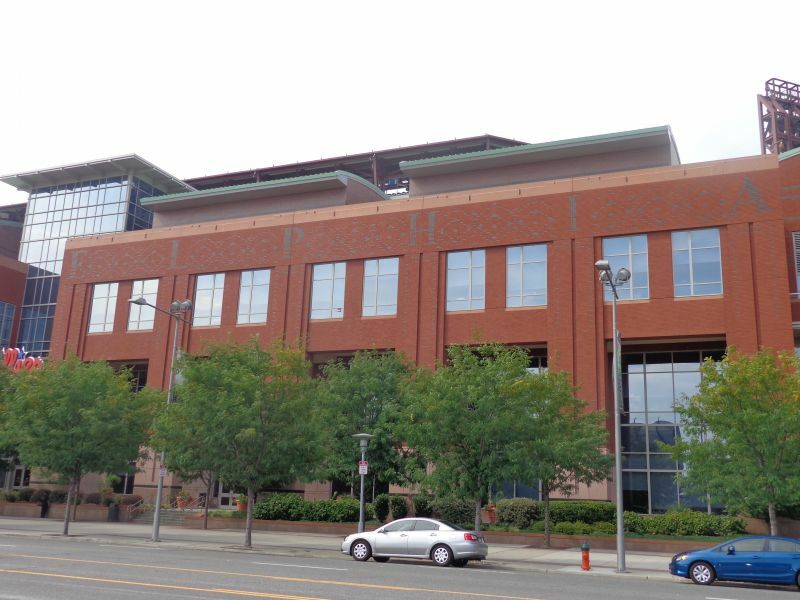 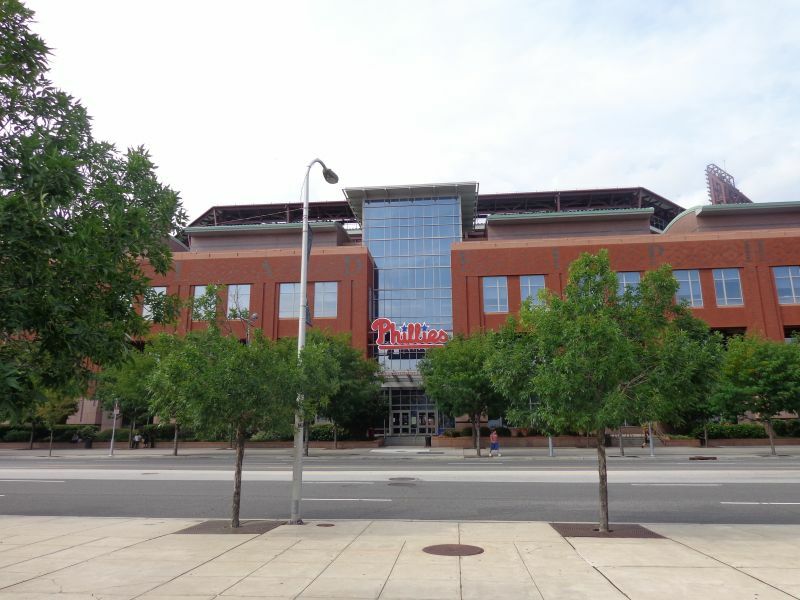 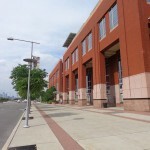 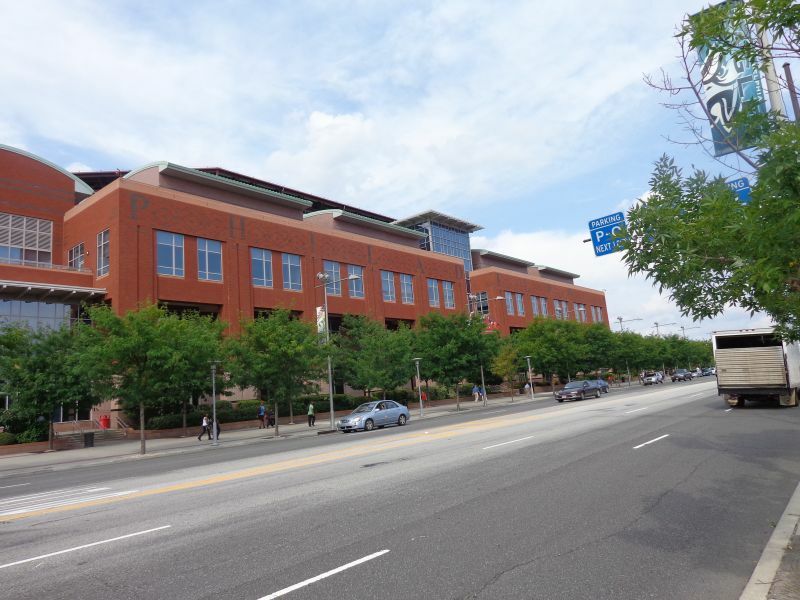 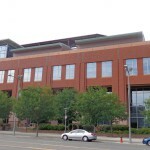 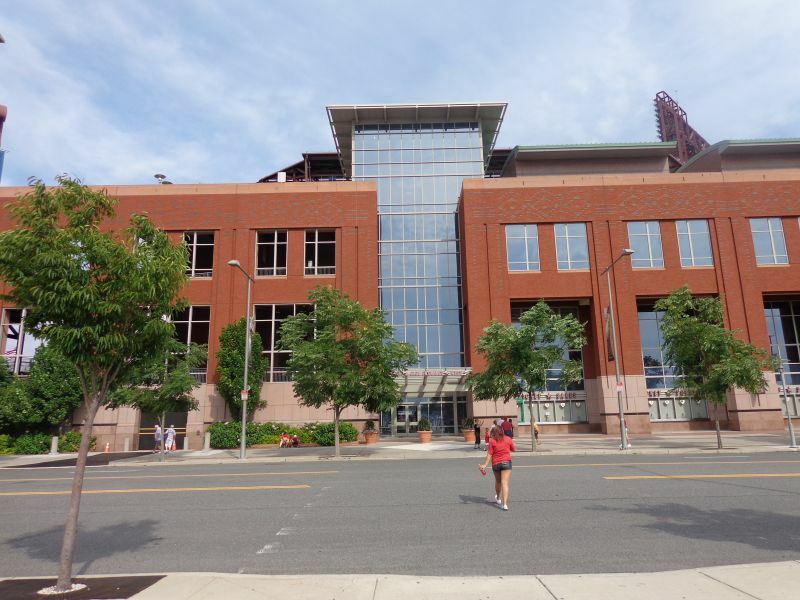 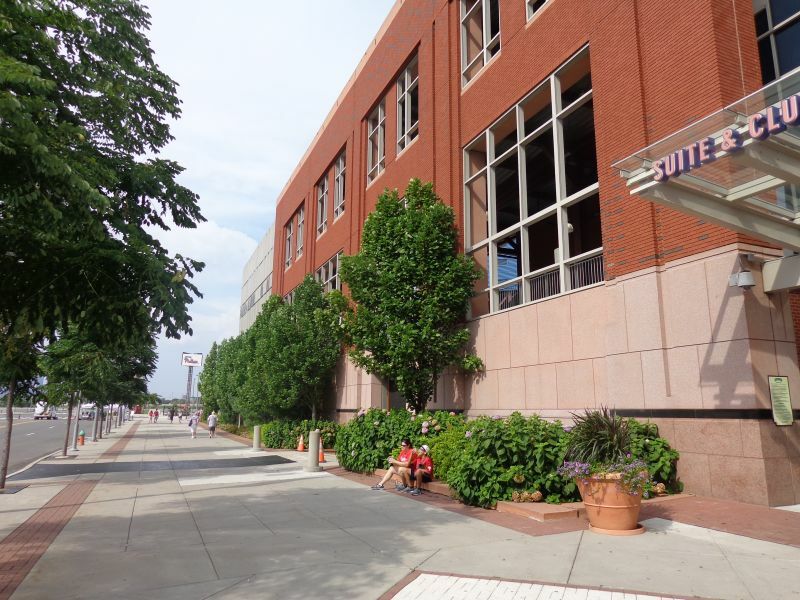 When the Phillies’ new downtown location got rejected in the early 2000s, fans groaned and architectural critics denounced the possibility of another “retro” structure without a sense of place. 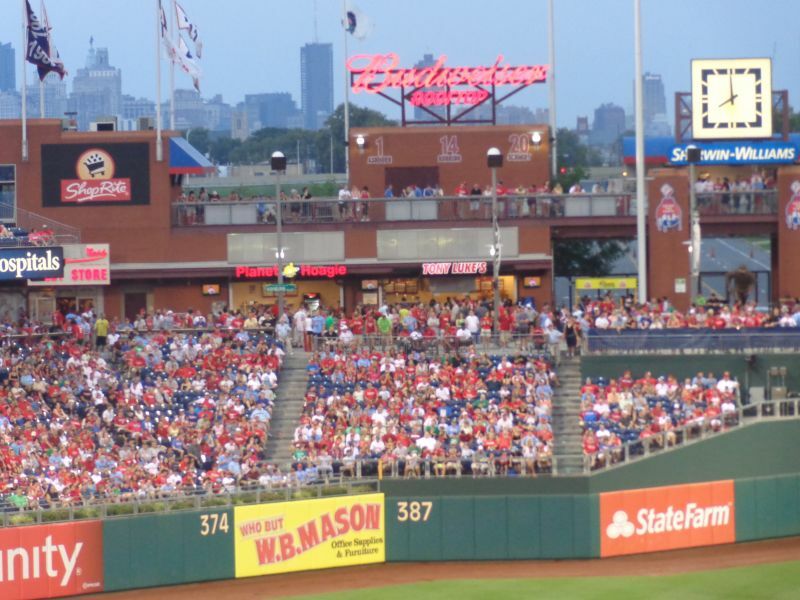 Judging by public opinion from its debut to today, Citizens Bank Park has overcome that, in what is clearly a well-regarded ballpark. 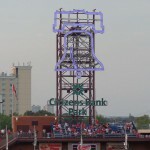 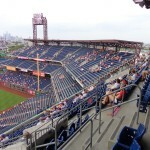 In fact, given its high marks for innovative design, exceptional functionality, and fan-friendly amenities, what’s more remarkable is that Citizens Bank Park doesn’t overcome its cardinal deficit to an even greater degree, failing to enter top-10 territory, which leads me to my central thesis. 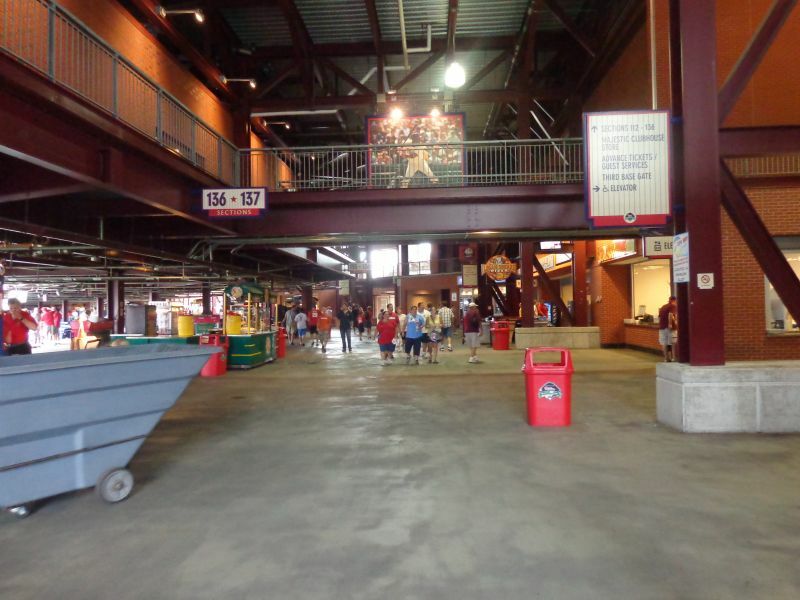 Citizens Bank Park features attractively sharp interior lines and great amenities, but the absence of any sense of place is palpable. 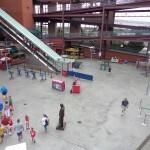 This photo does a good job of illustrating the undesired “retro ballpark in a parking lot” aesthetic. 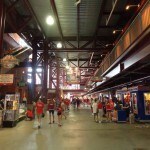 It lacks that vital contextual connection seen in the best ballparks. 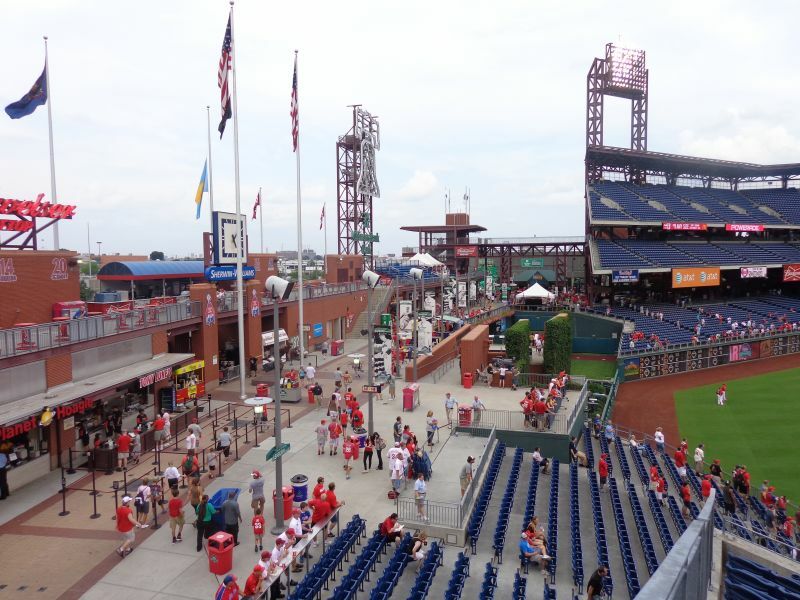 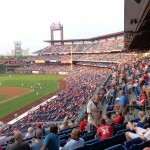 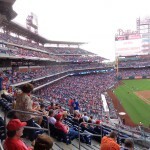 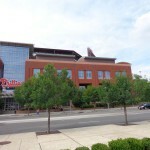 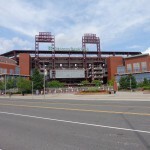 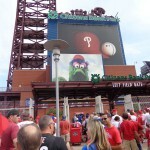 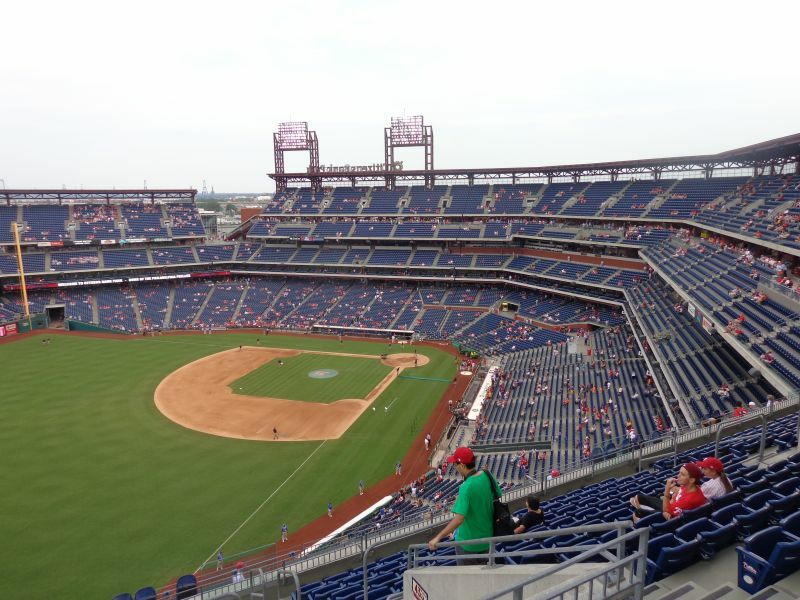 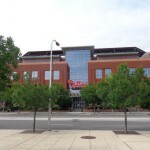 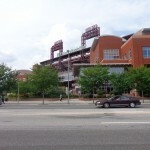 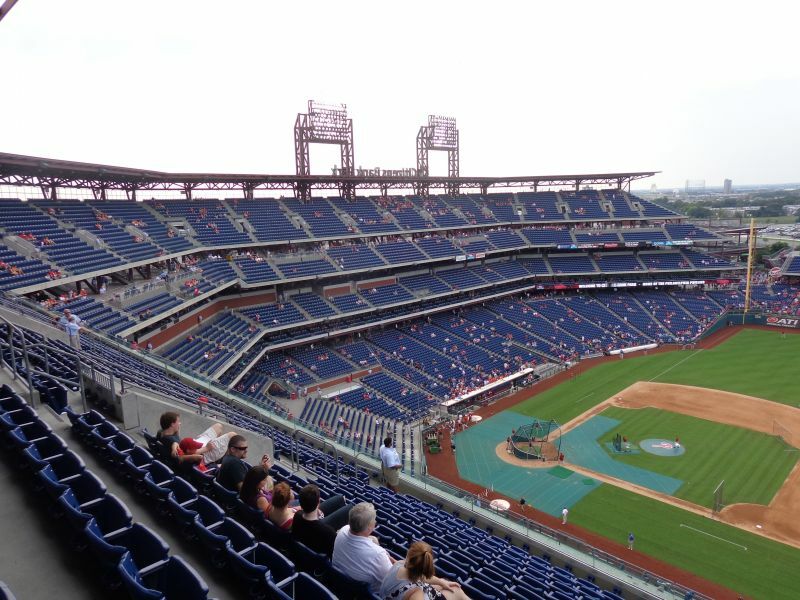 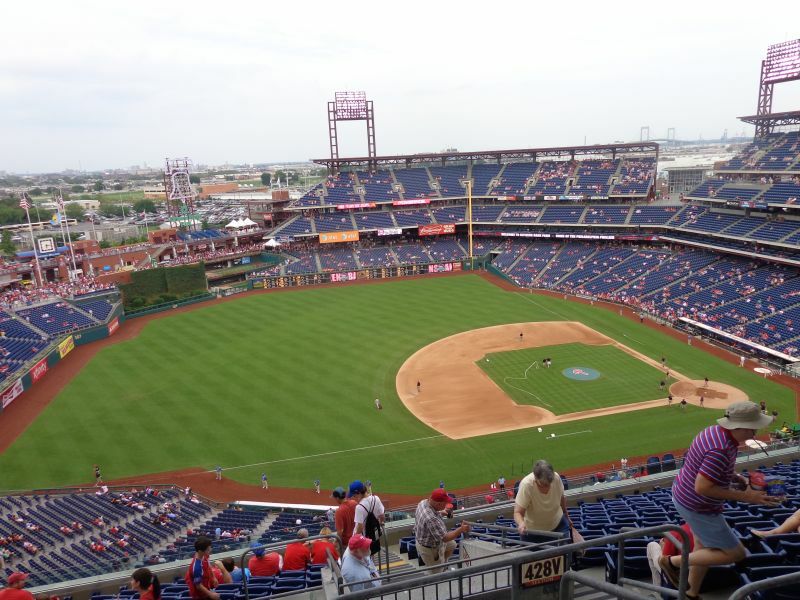 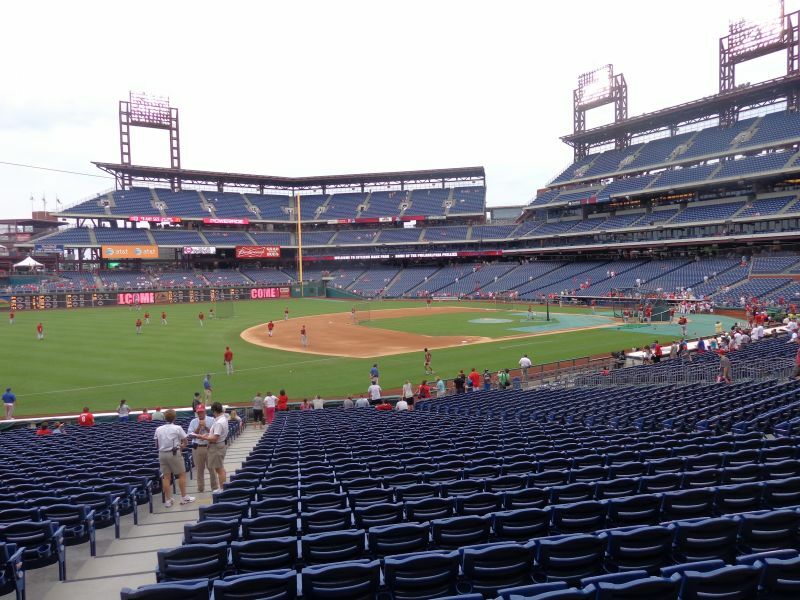 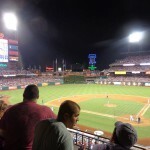 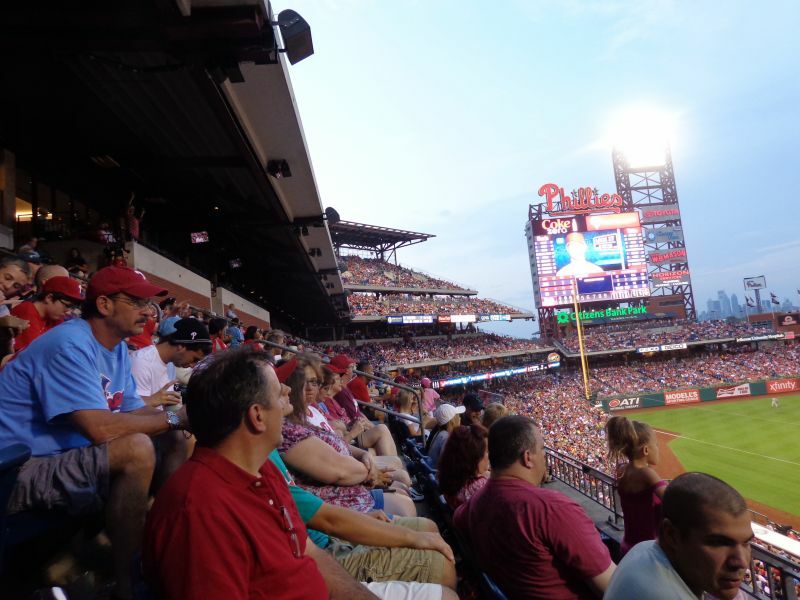 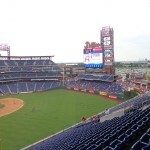 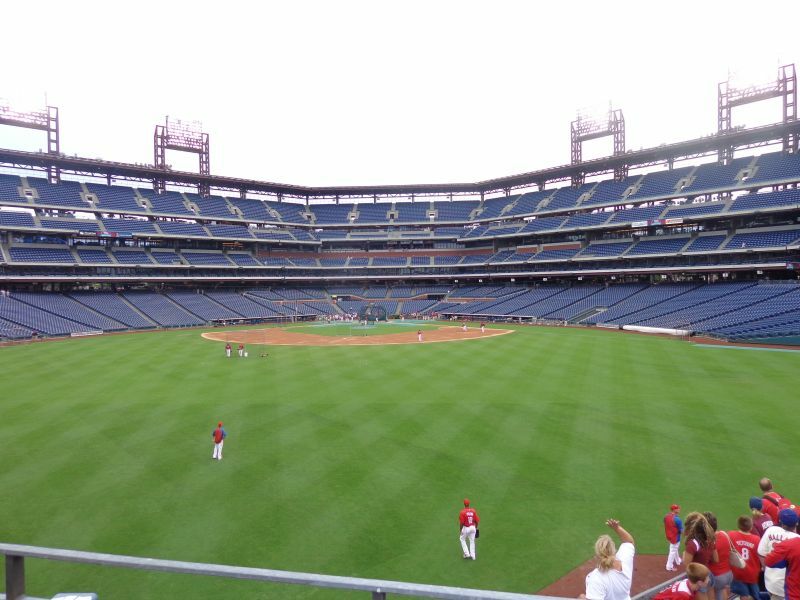 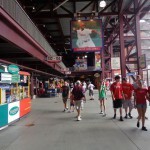 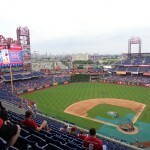 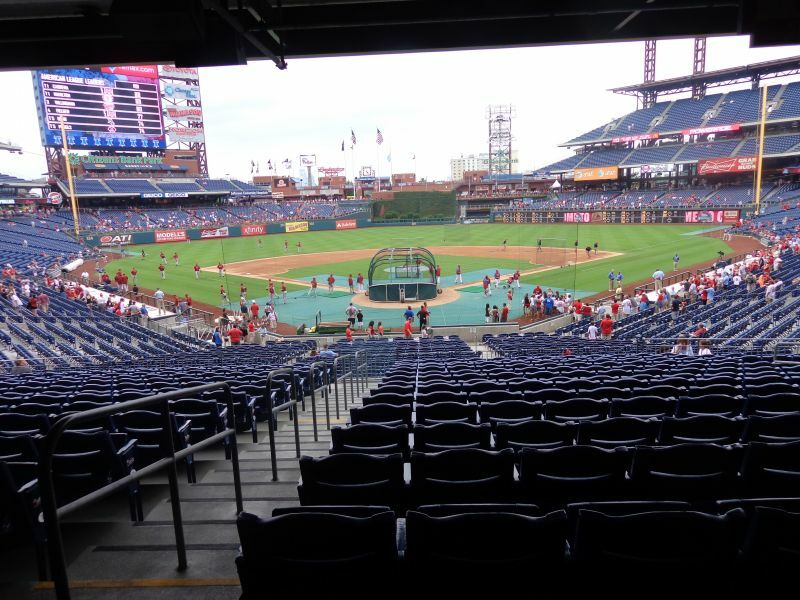 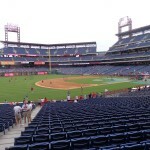 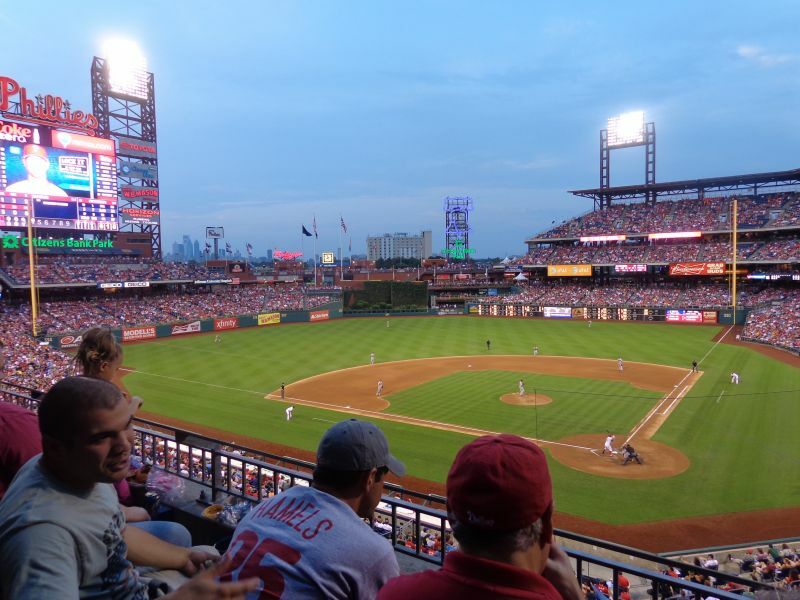 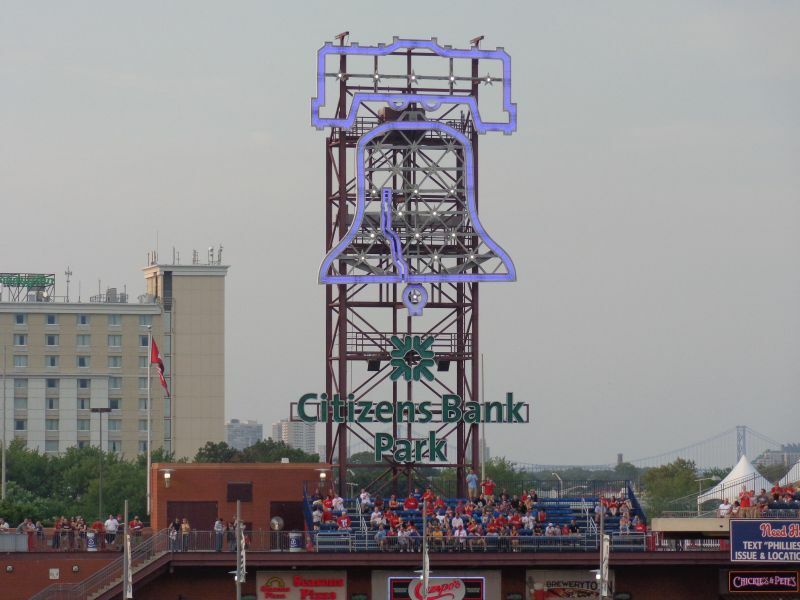 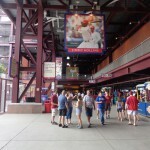 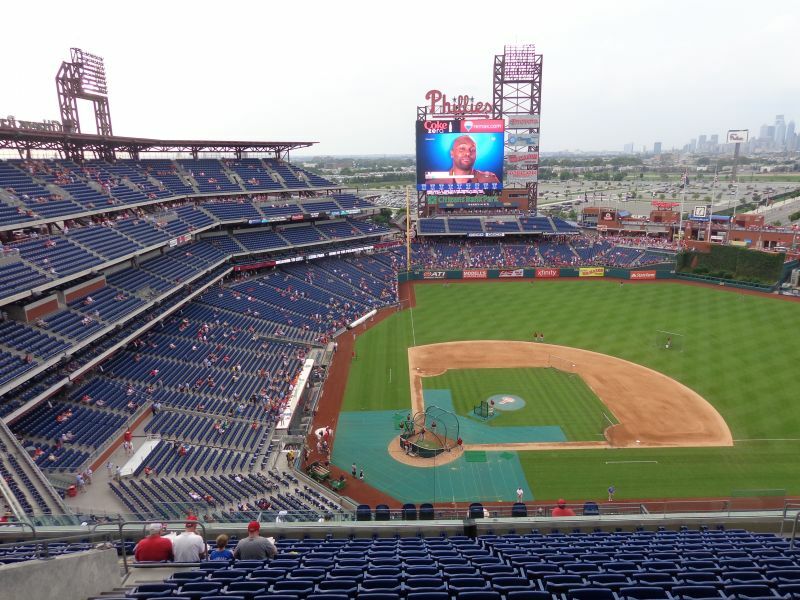 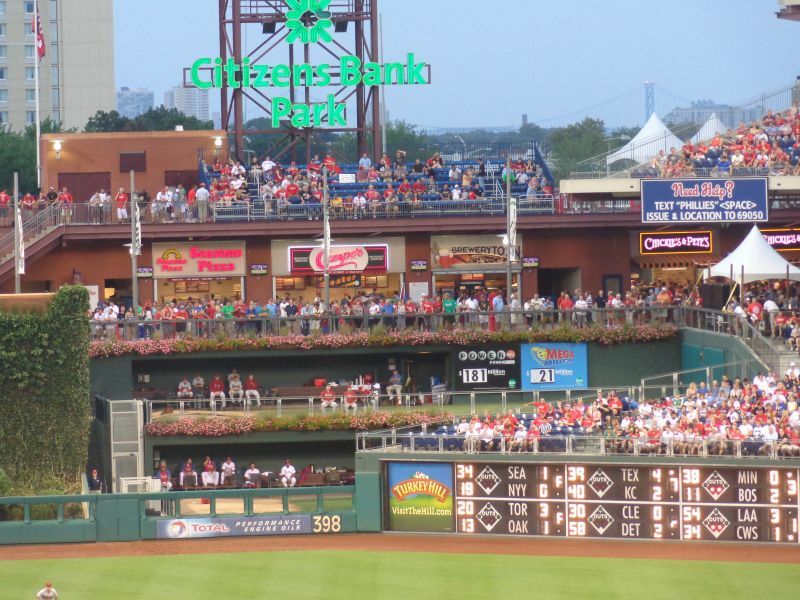 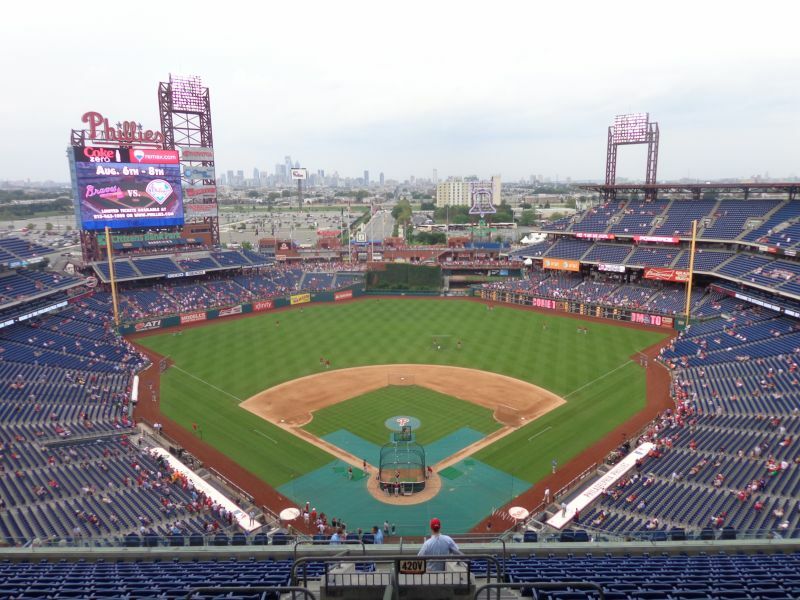 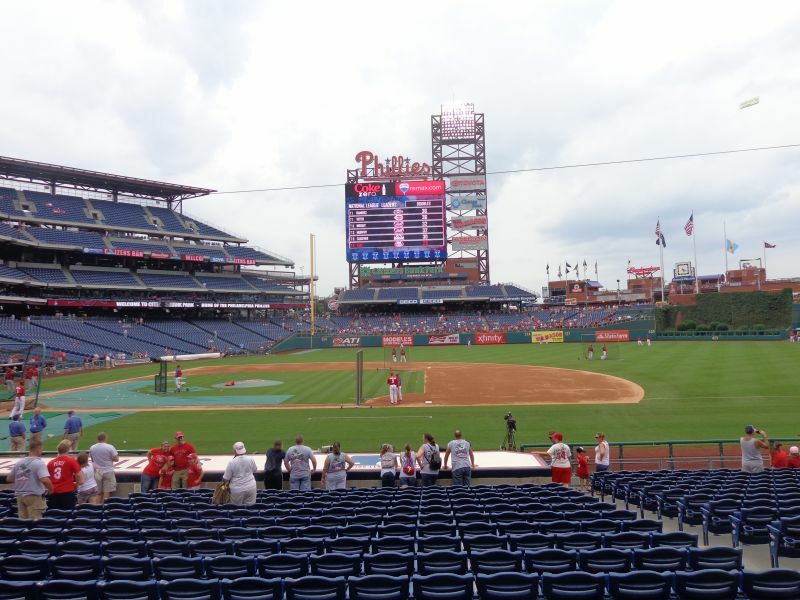 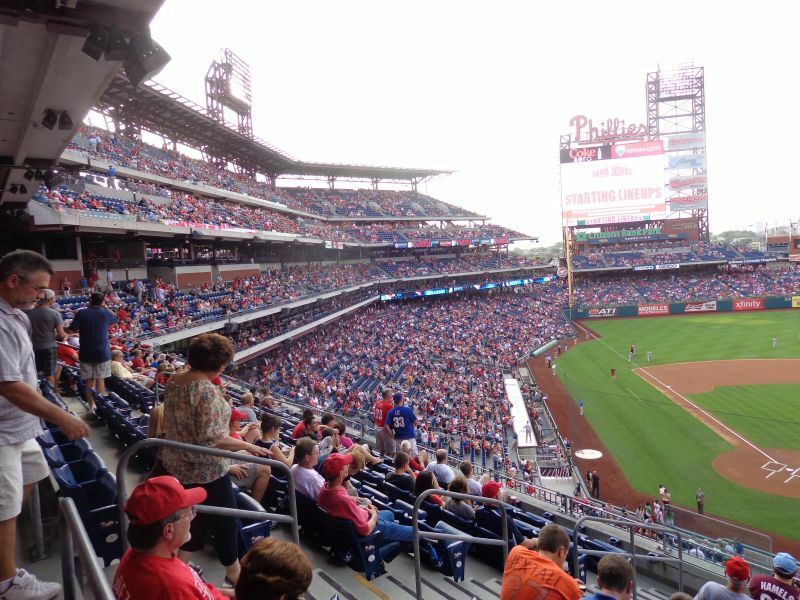 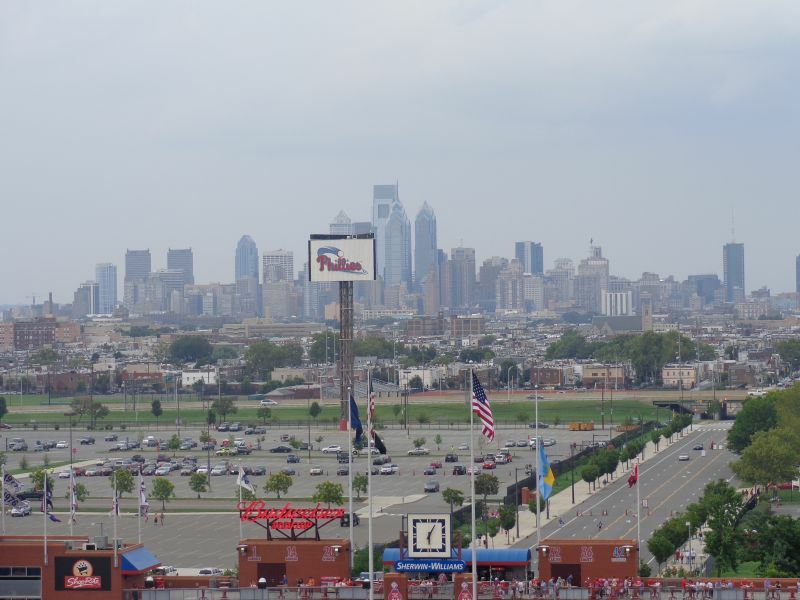 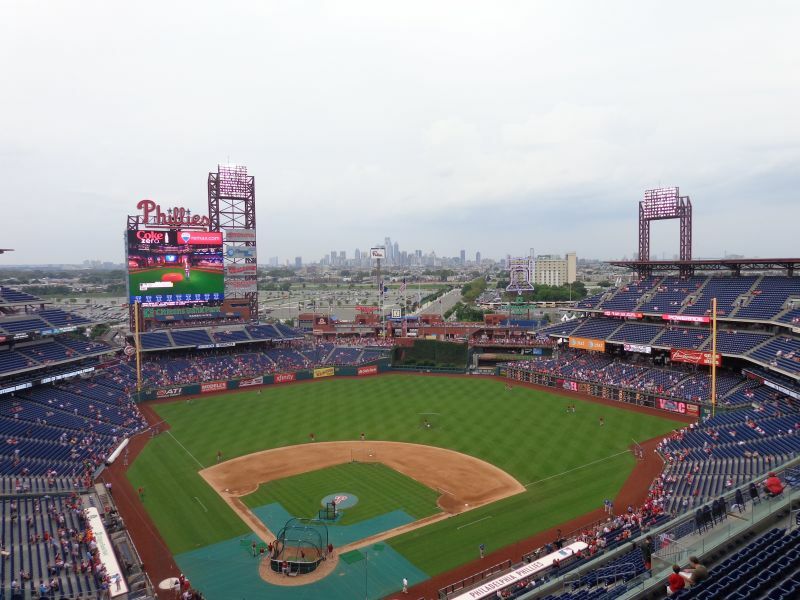 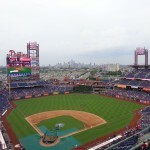 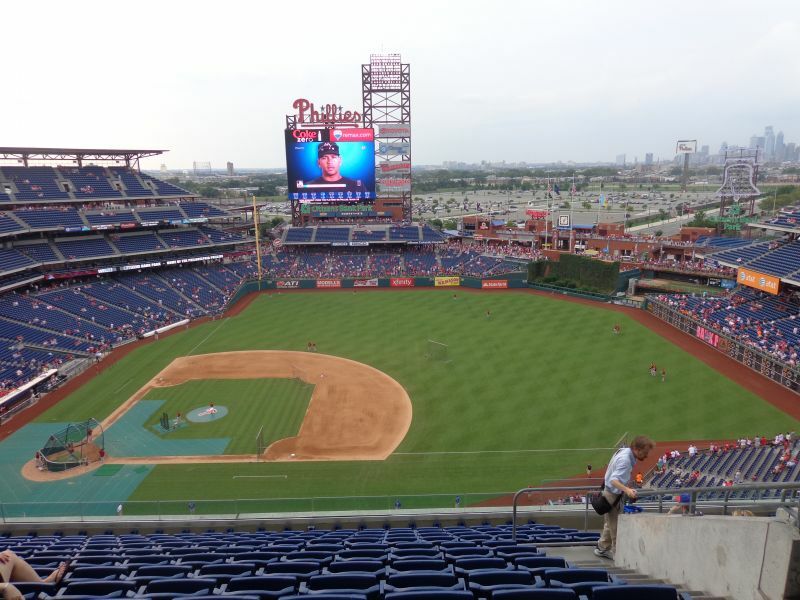 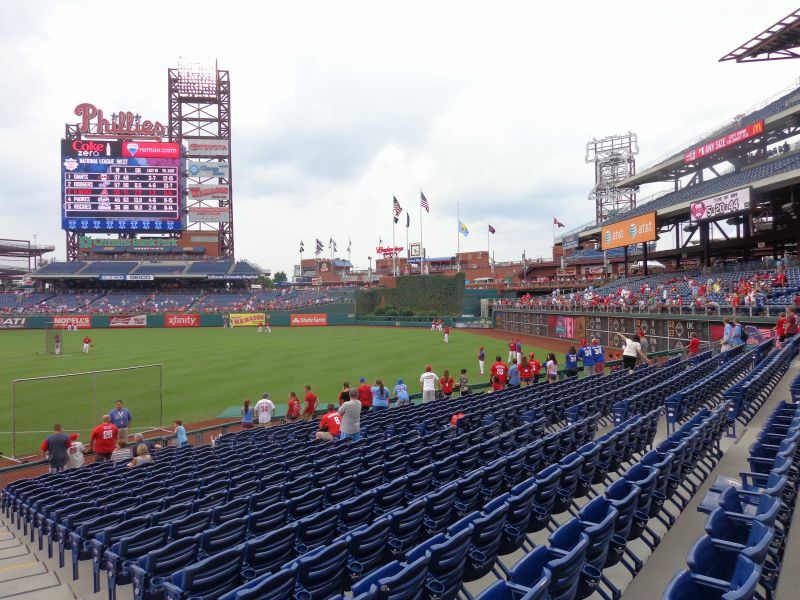 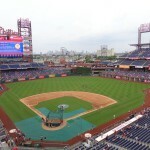 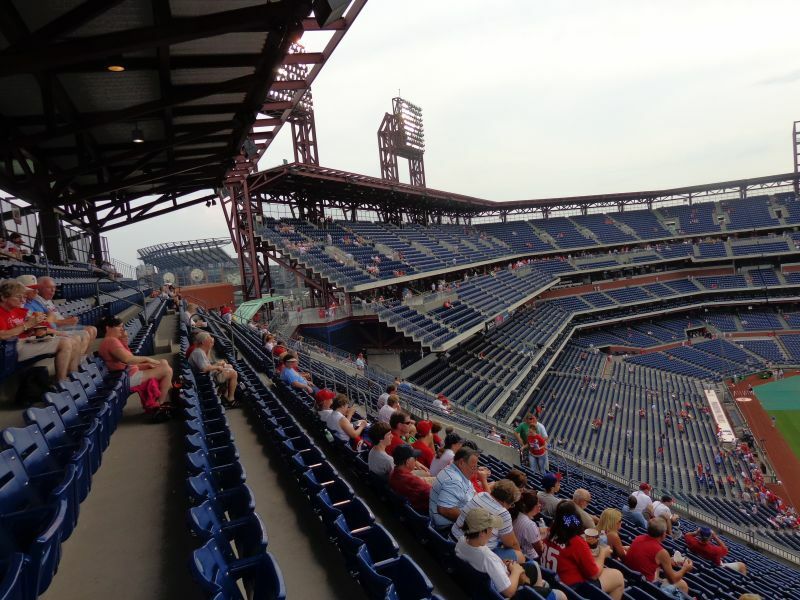 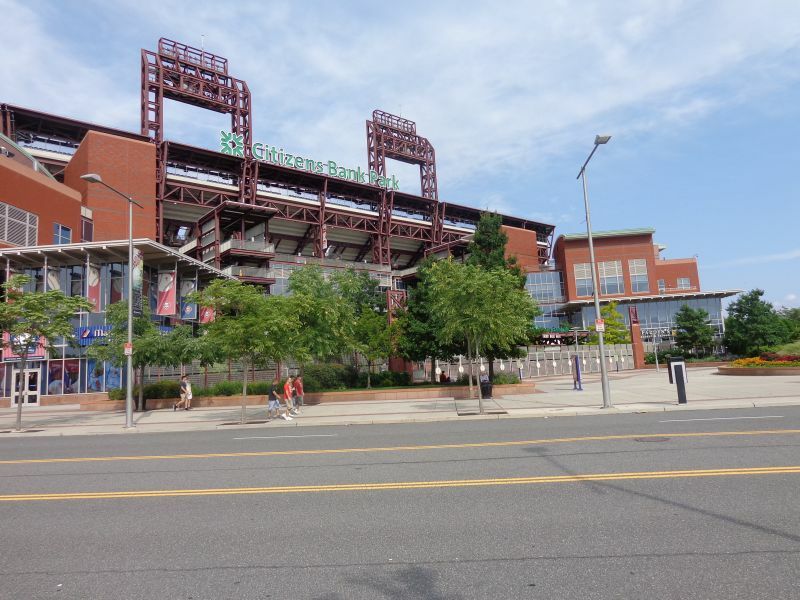 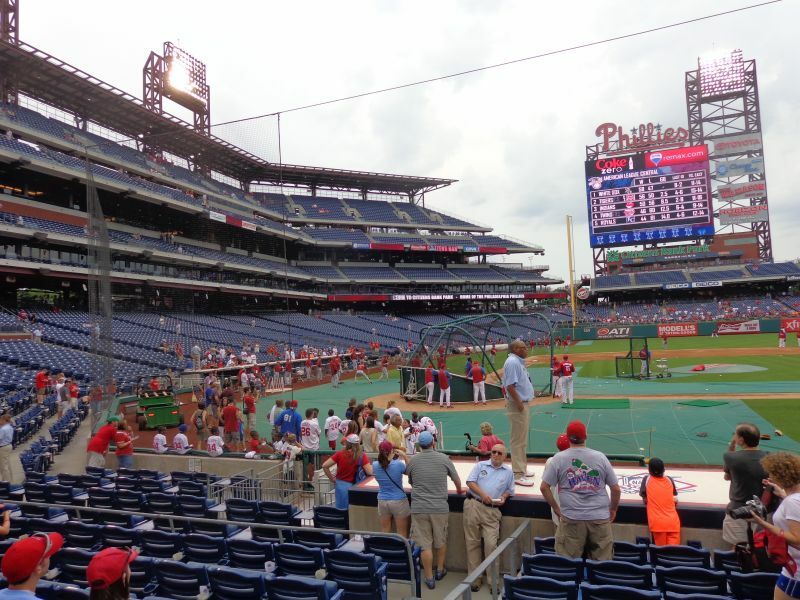 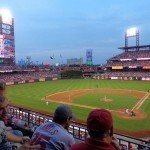 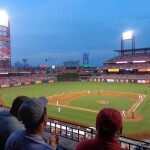 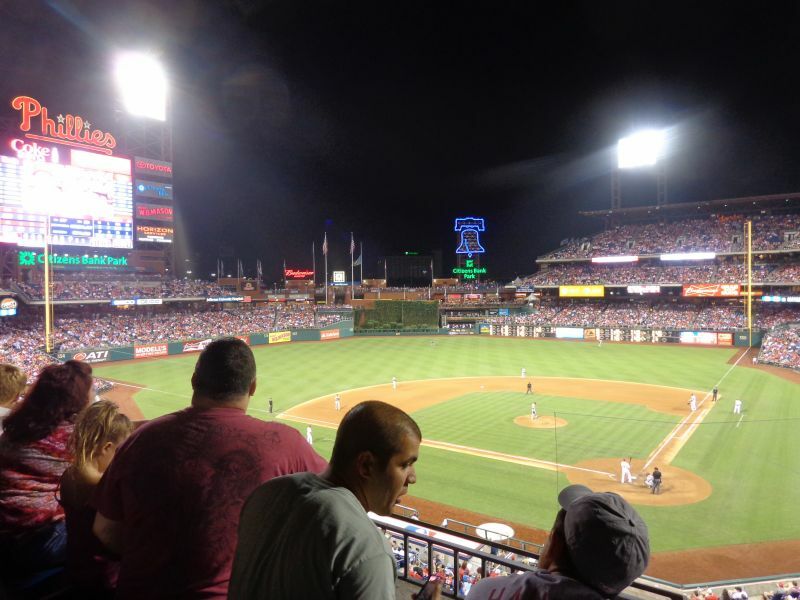 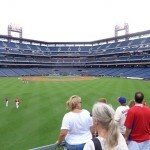 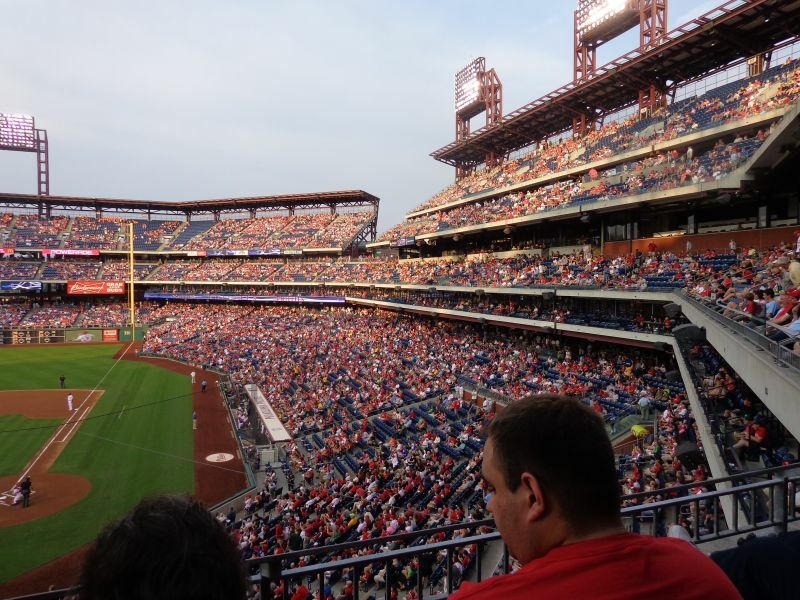 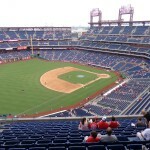 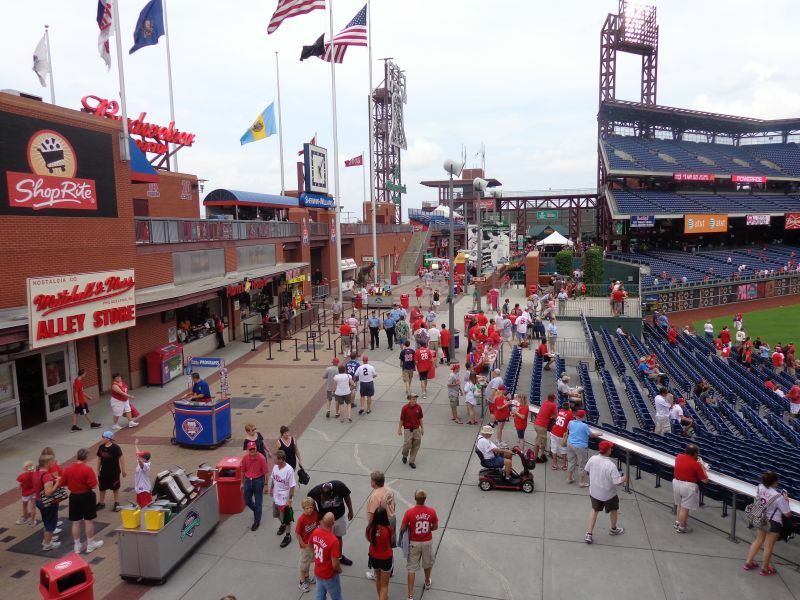 Citizens Bank Park illustrates that having at least a good location is a necessary condition for building a great ballpark. 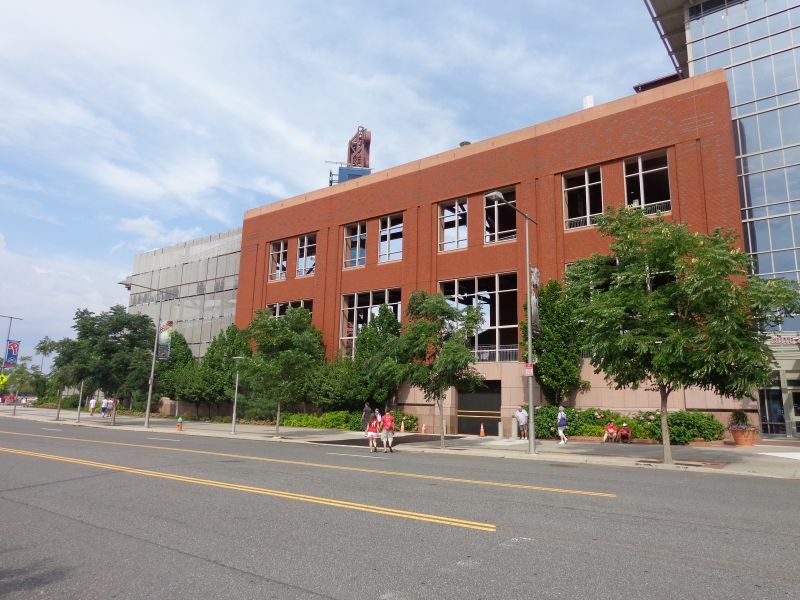 Perhaps not having a roof is the only other necessary condition. 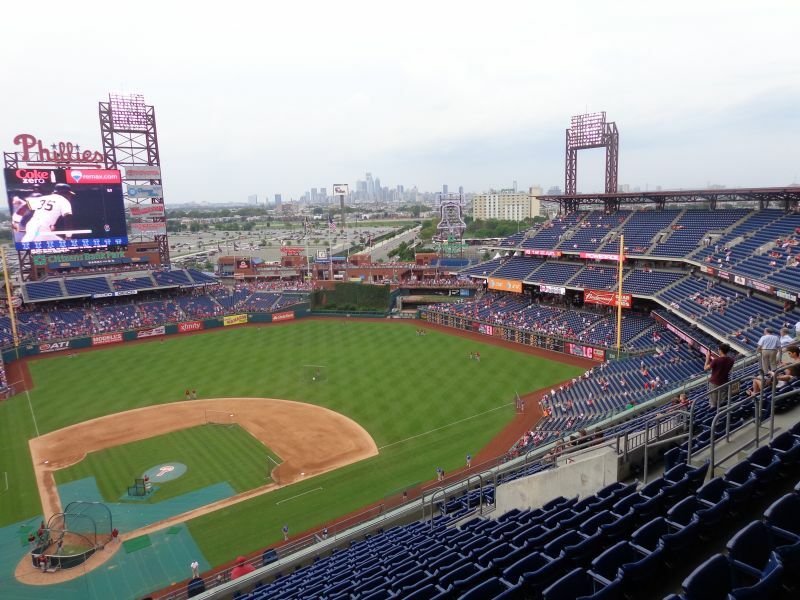 Despite excelling in other objective categories, Citizens Bank Park is a tad below the 10-13 other ballparks that could be construed as great, ranging from 84.5-91+. 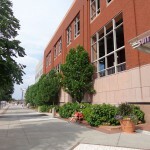 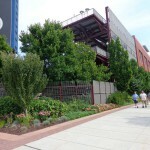 And, you guessed it, the 10-13 other parks are centrally located or have flavorful local scenes. 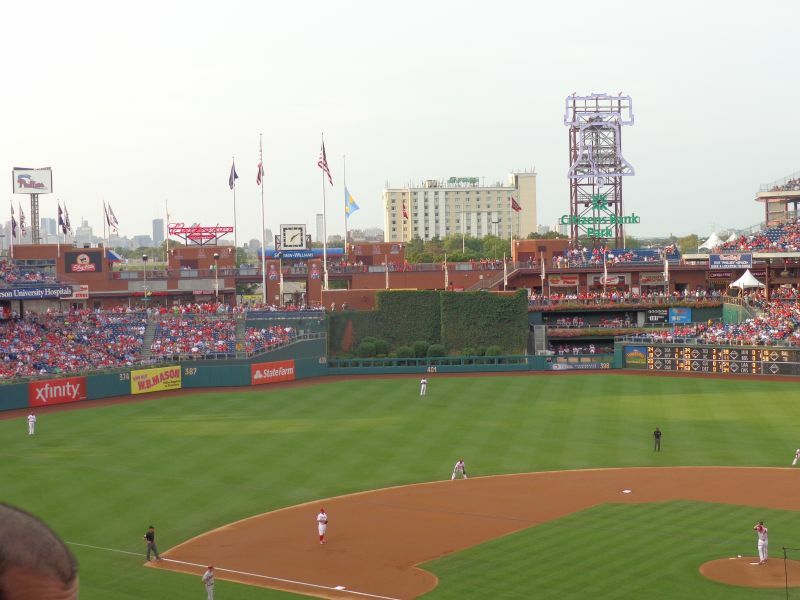 So, why is a good location necessary for building a great ballpark? 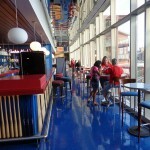 Because integrated contextual aesthetics, derived from a good location featuring skyscrapers, urban bridges, rivers, or bays, are the most significant factor of the interior aesthetics. 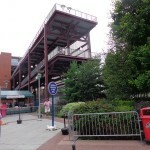 Also, trendy retro architecture works better if that treatment is derived from a historical urban landscape. 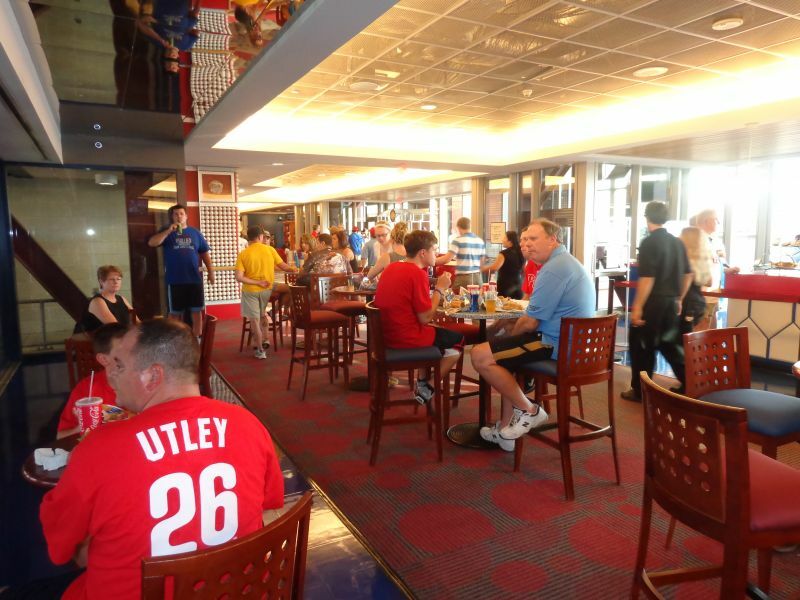 The extent to which the quality of the location correlates with the quality of the interior aesthetics and overall ballpark experience is striking. 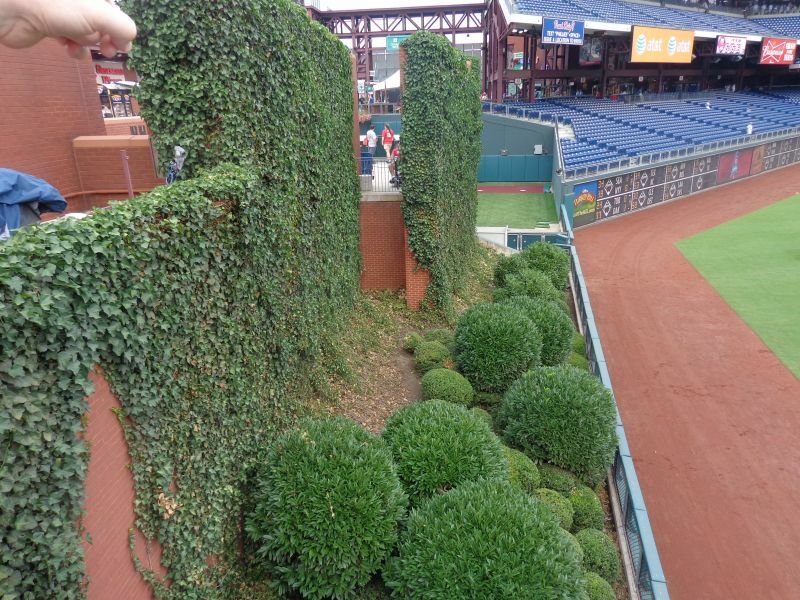 Ballparks that simply let the local environment take over are often more successful in their interior aesthetics. 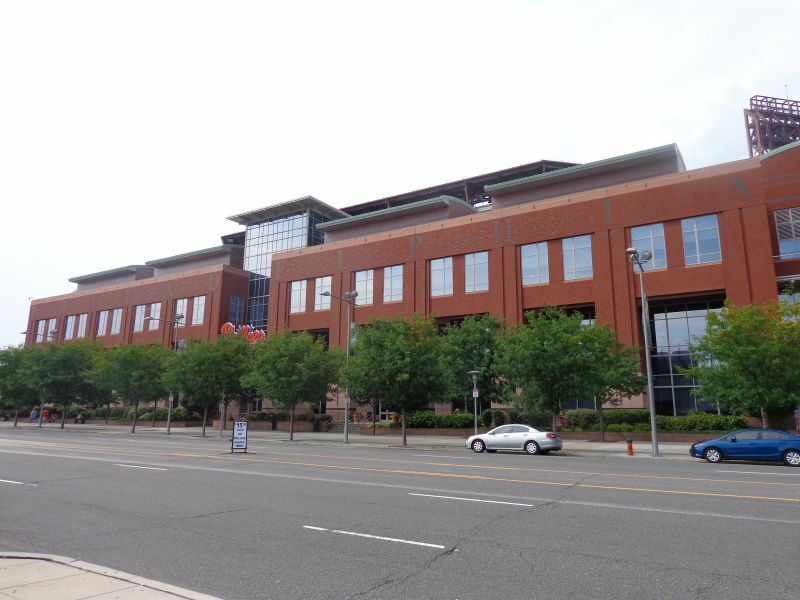 Formulaic red brick exterior designs may also seem more acceptable when they are tangibly adapting to borders and resemble the local context, while those in the middle of nowhere can sometimes verge on intolerable in their mundanity. 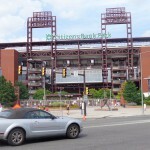 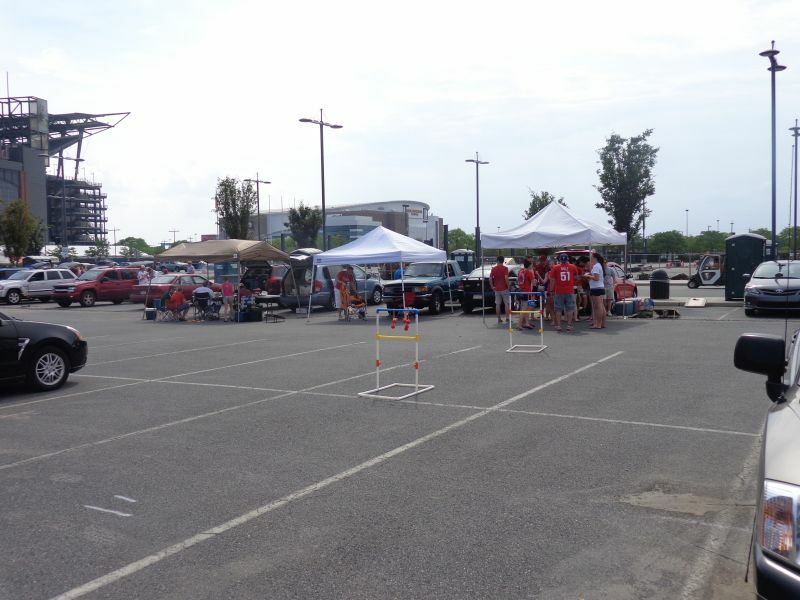 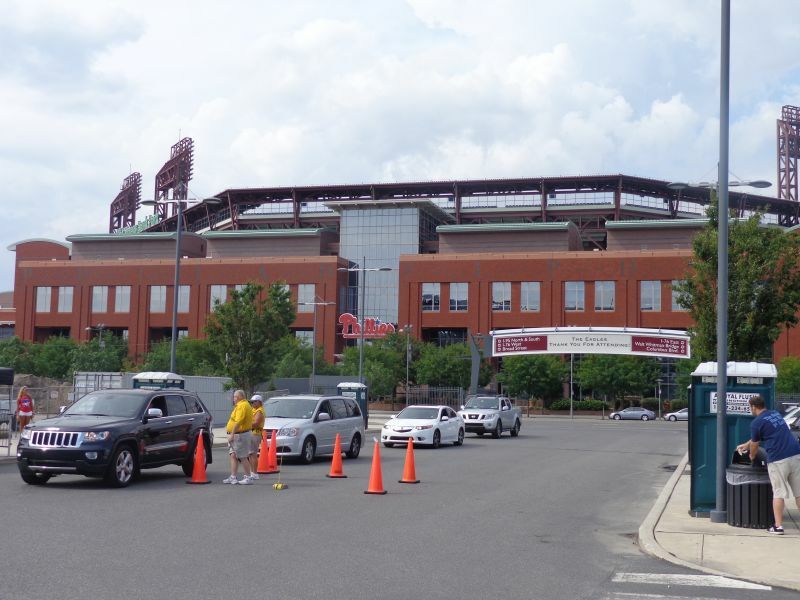 Citizens Bank Park doesn’t have a context, in what is undeniably a suburban park in a sea of parking spots. 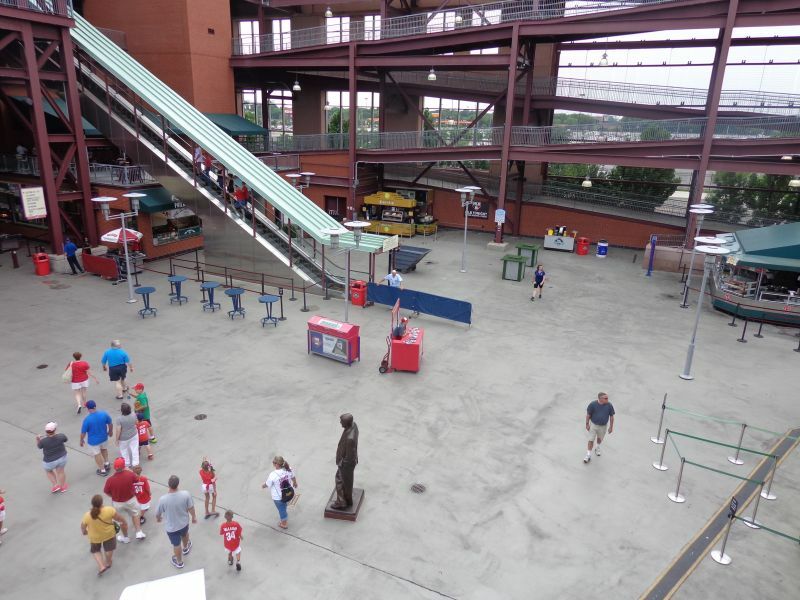 The contours of Citizens Bank Park are meant to look like they adhere to an urban landscape (more on that later), as great ballparks are sculpted to observe their context with great care, but it comes off as obvious mimicry here. 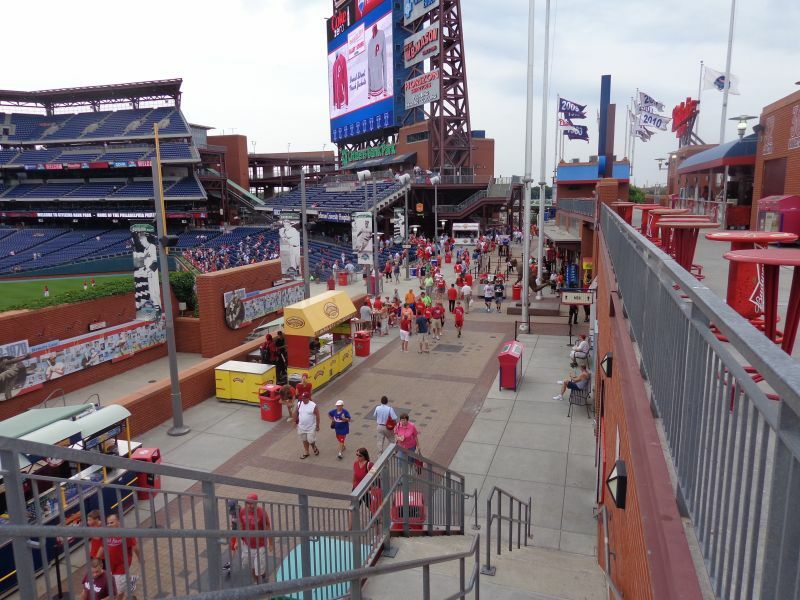 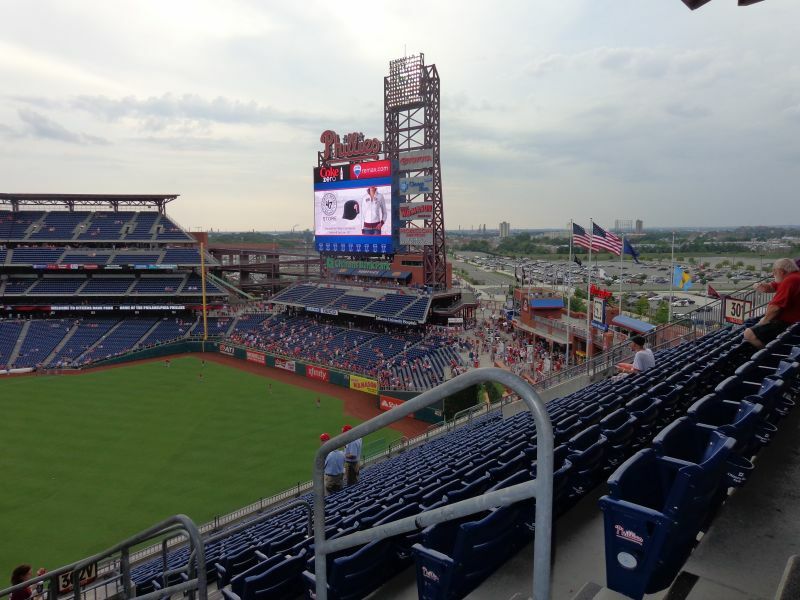 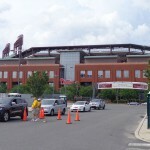 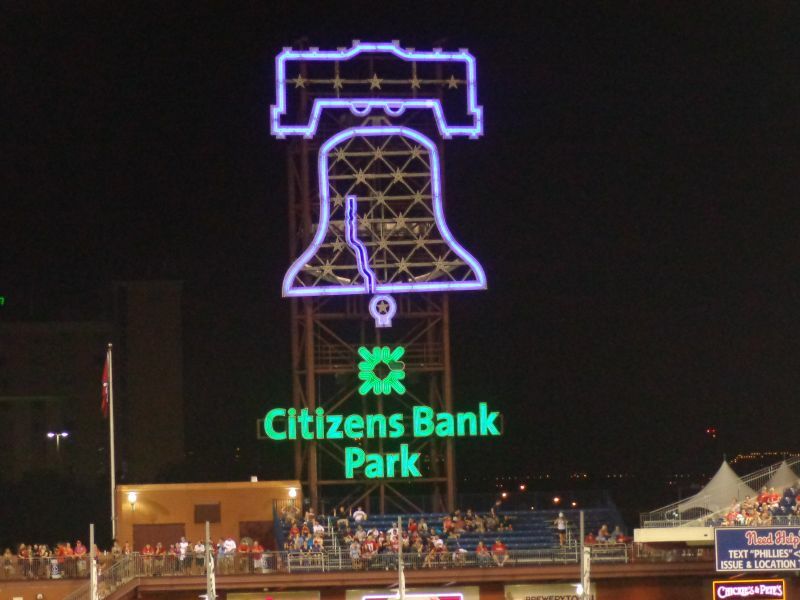 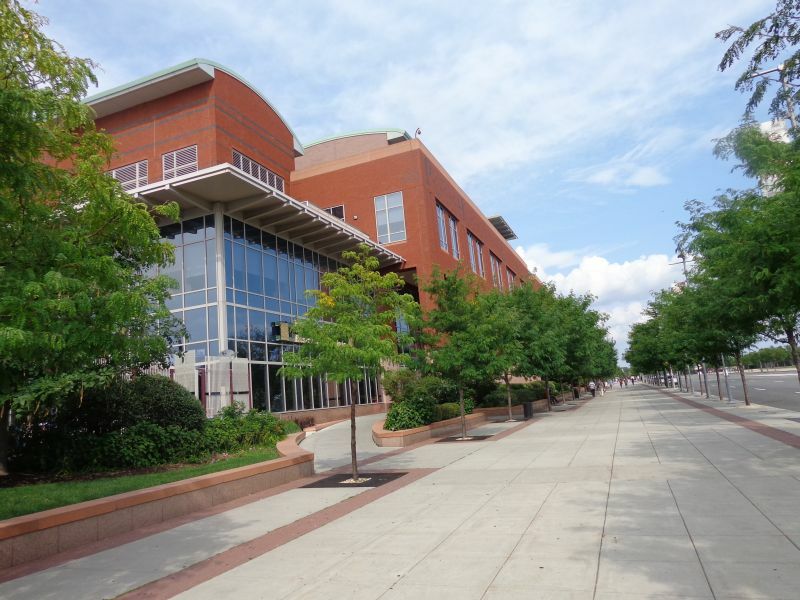 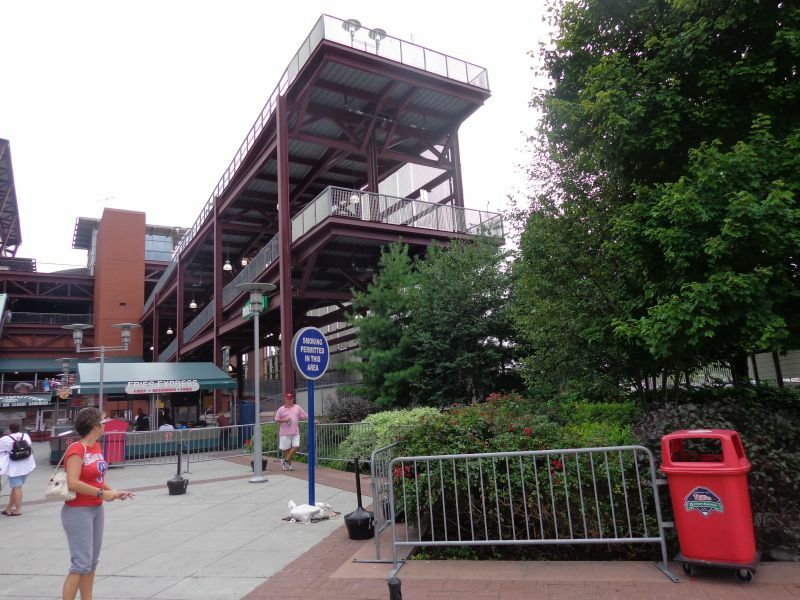 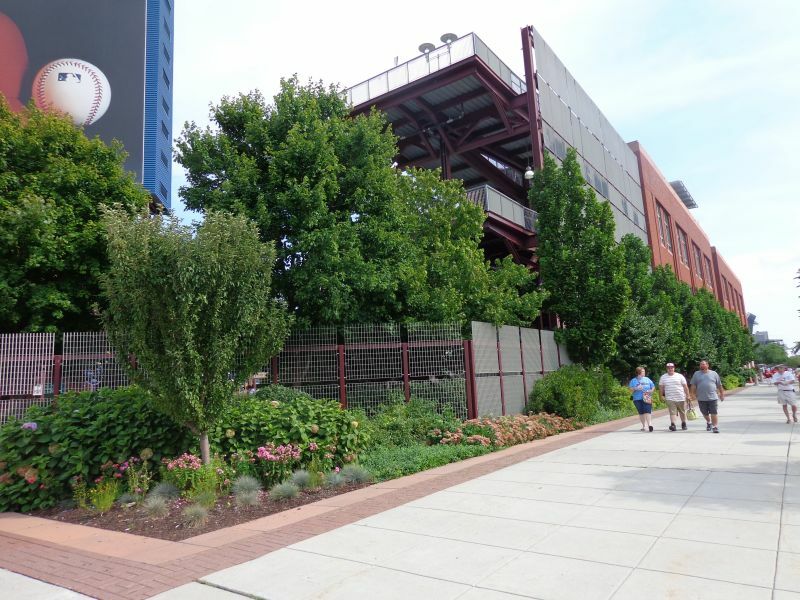 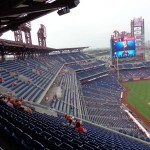 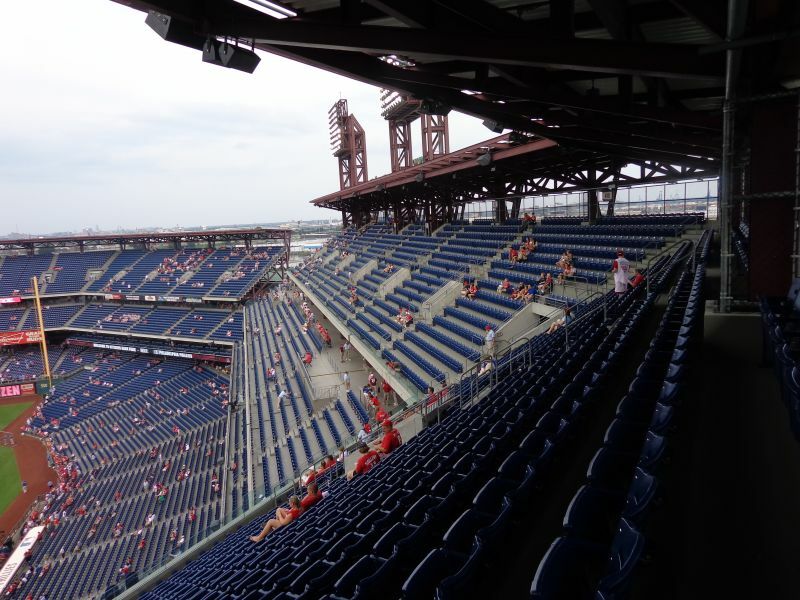 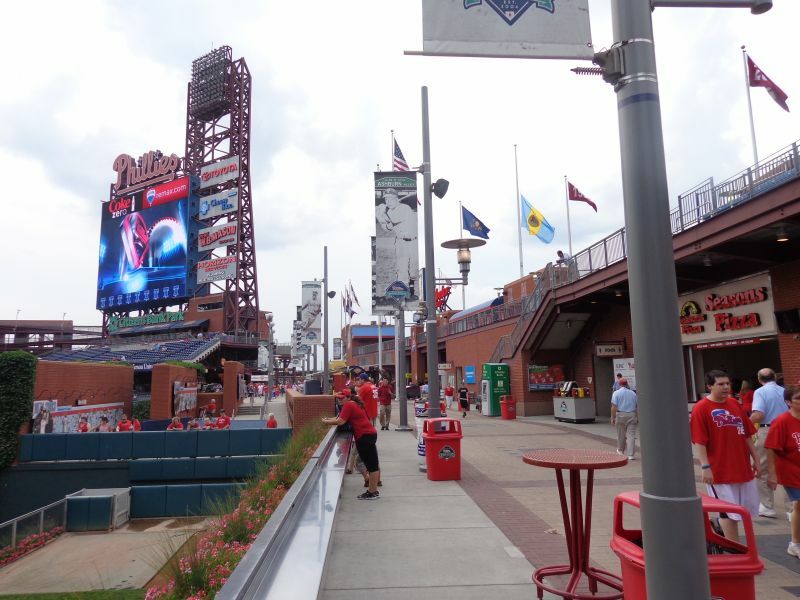 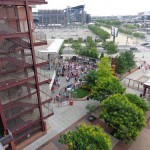 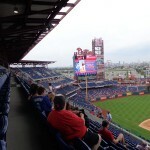 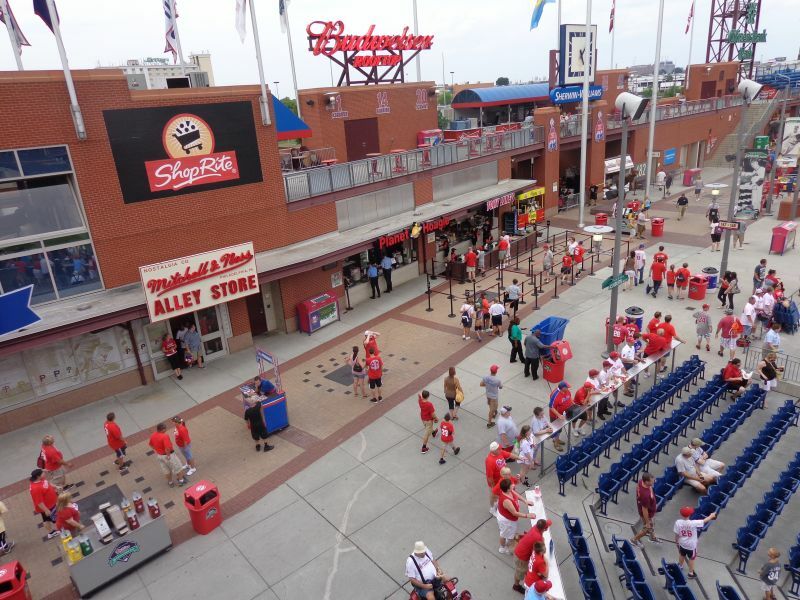 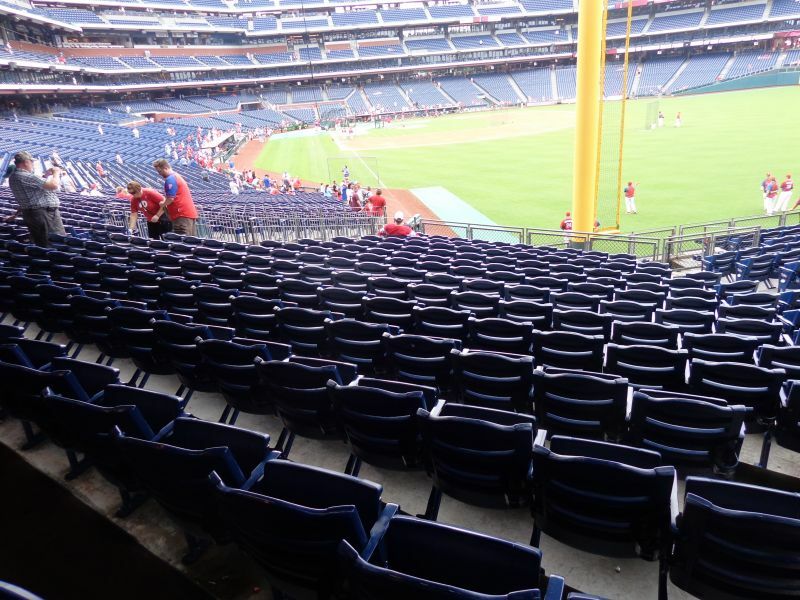 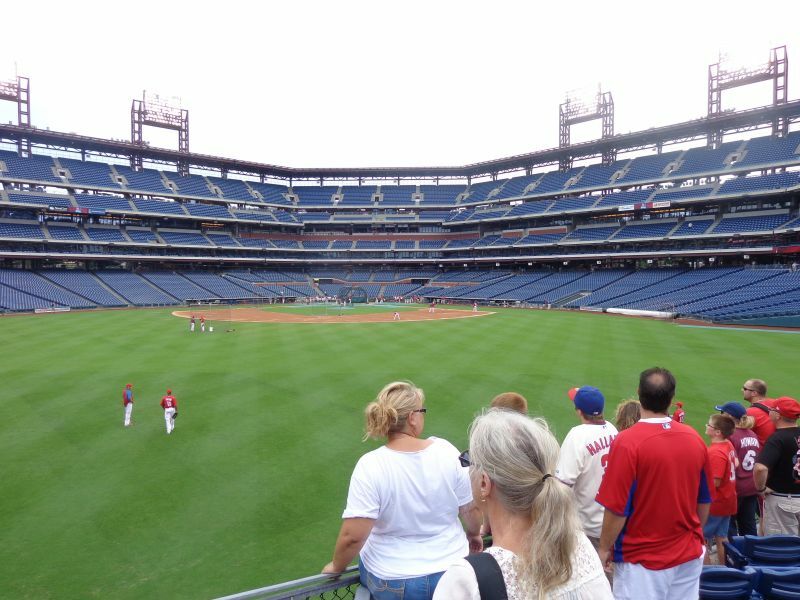 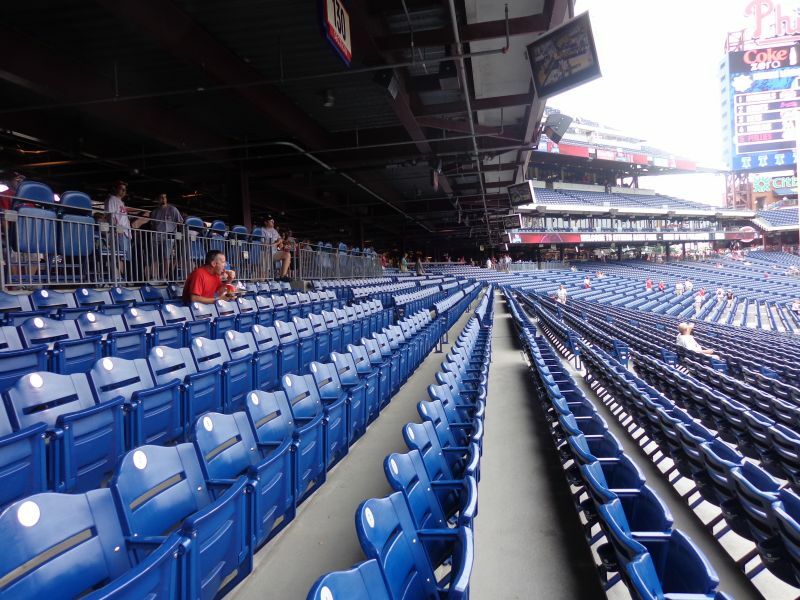 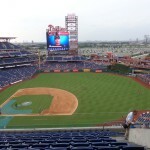 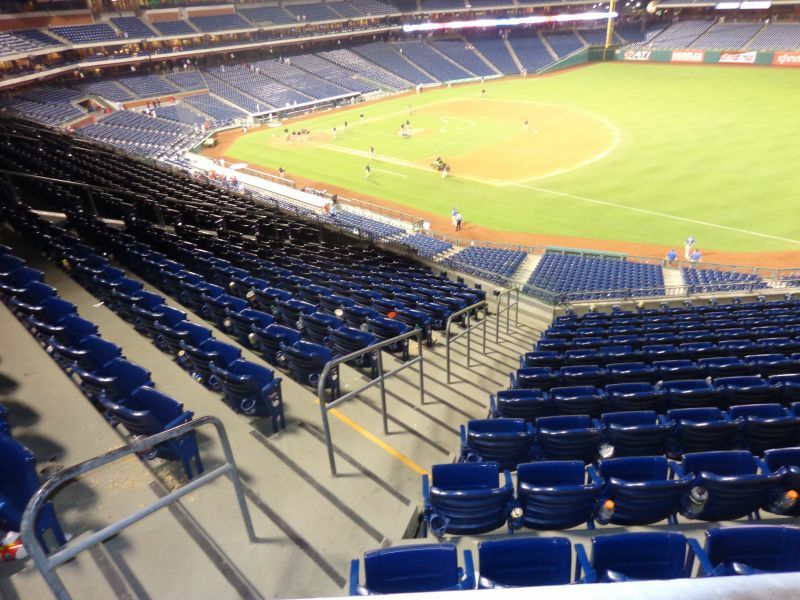 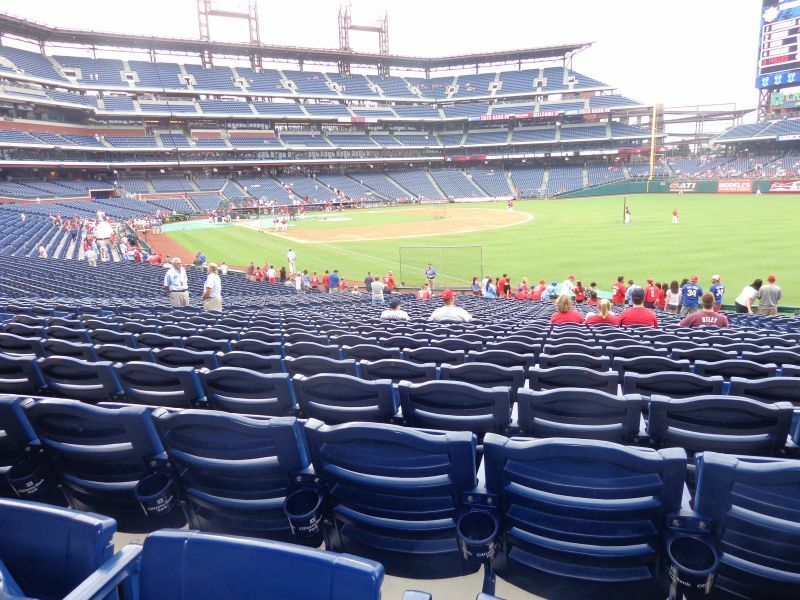 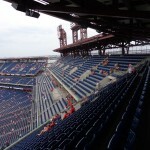 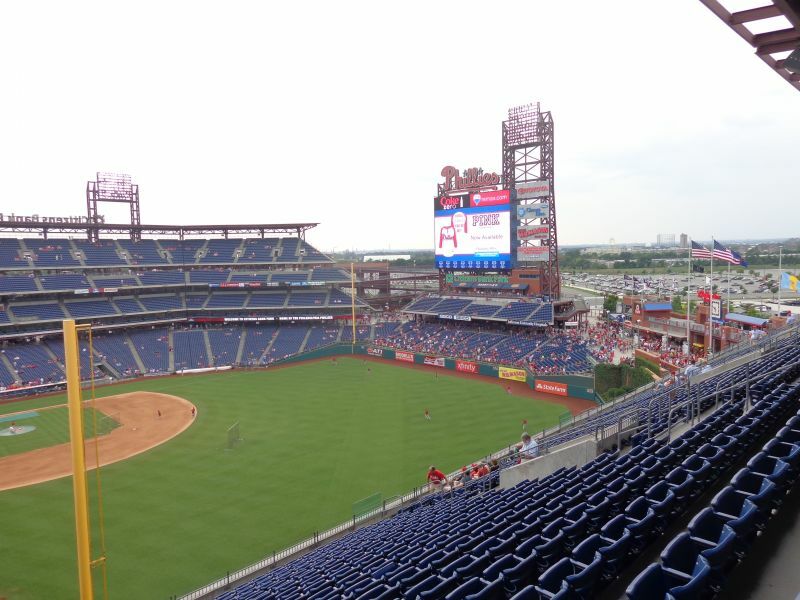 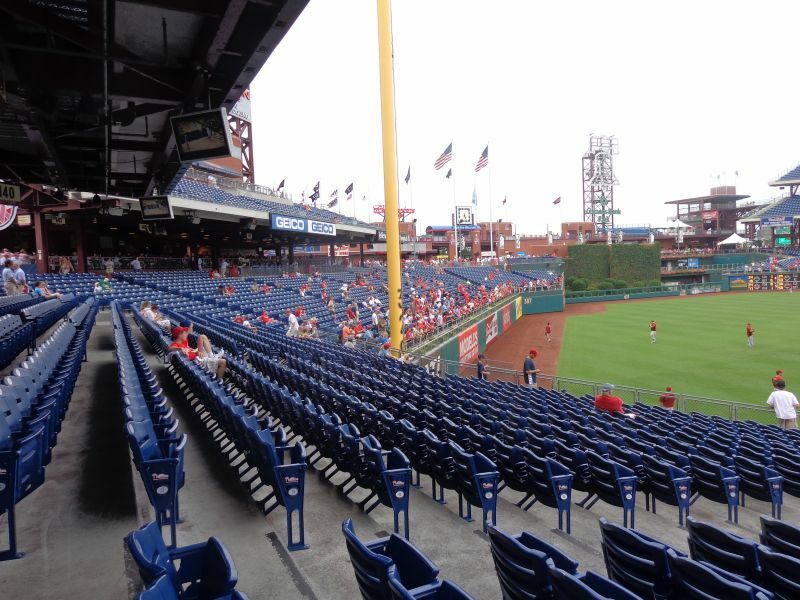 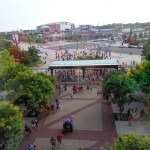 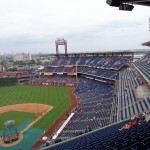 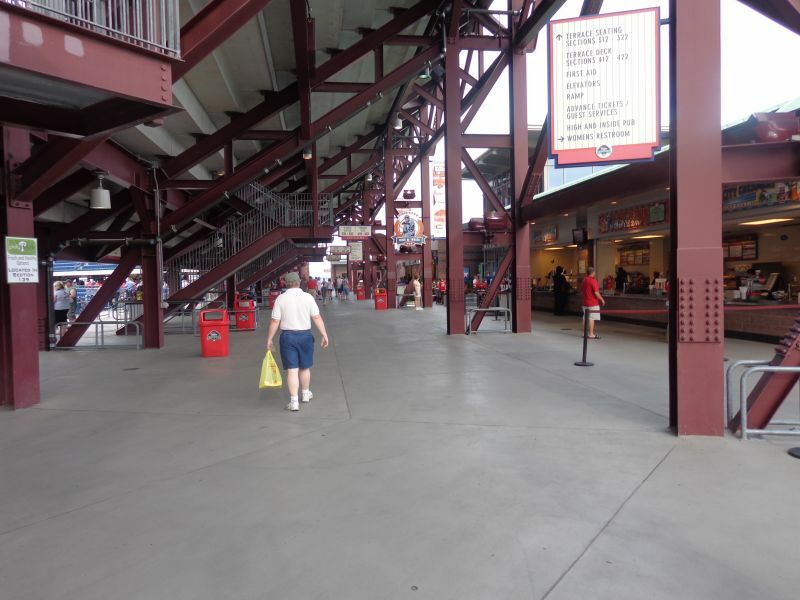 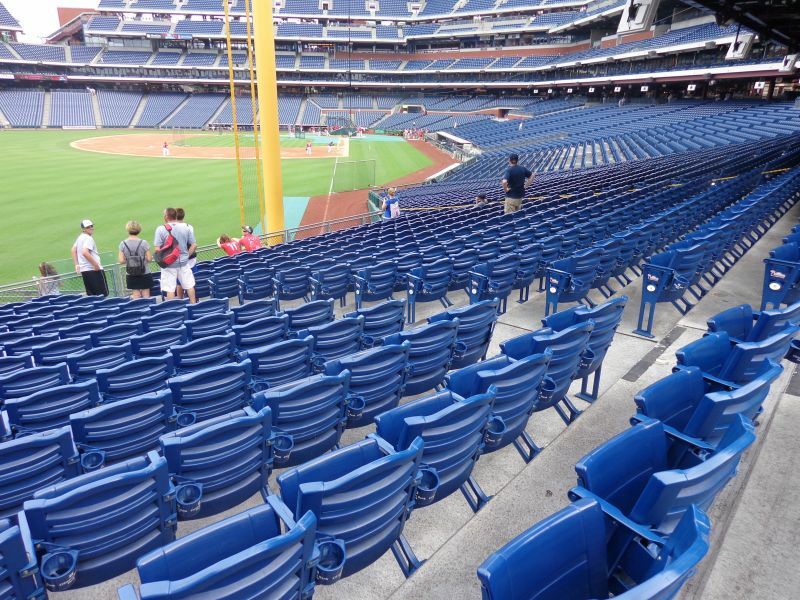 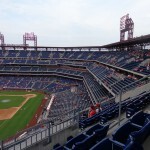 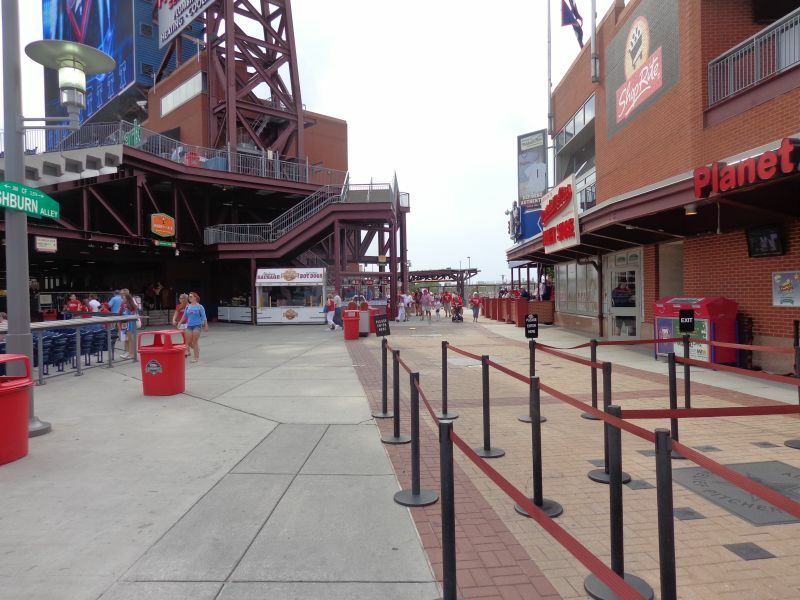 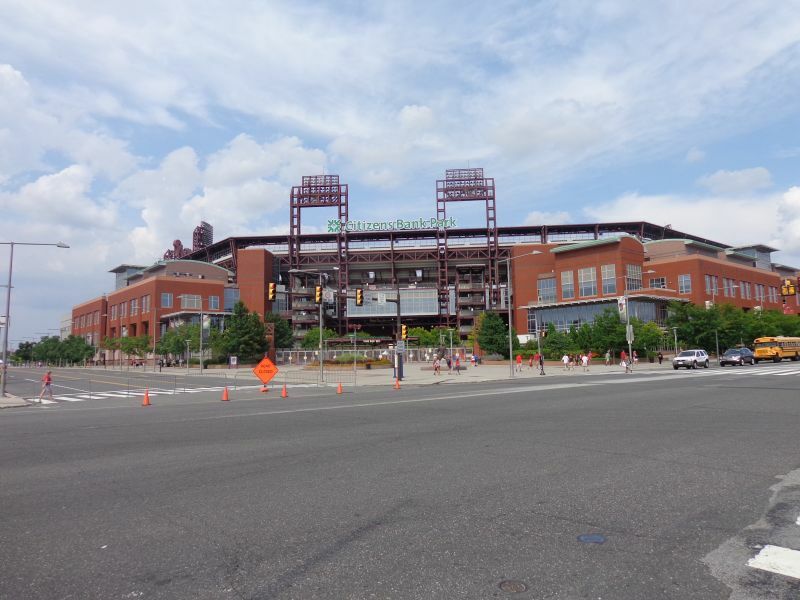 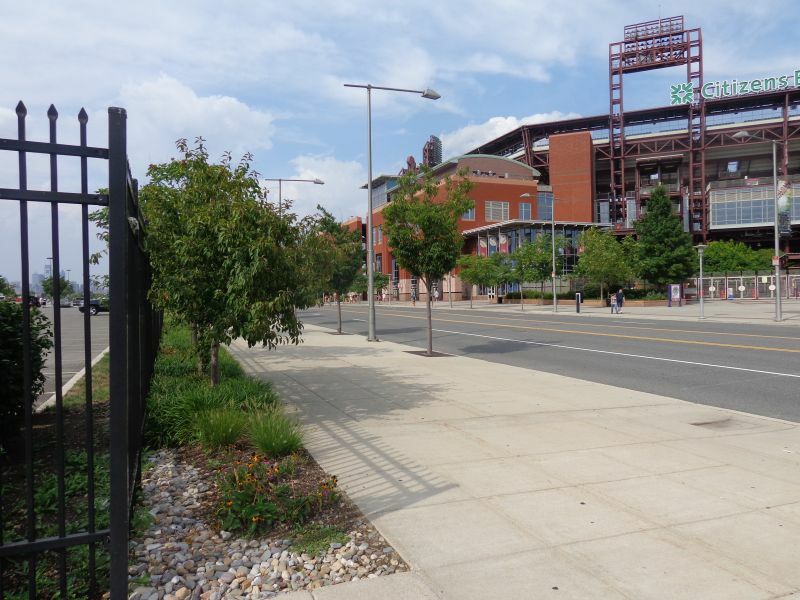 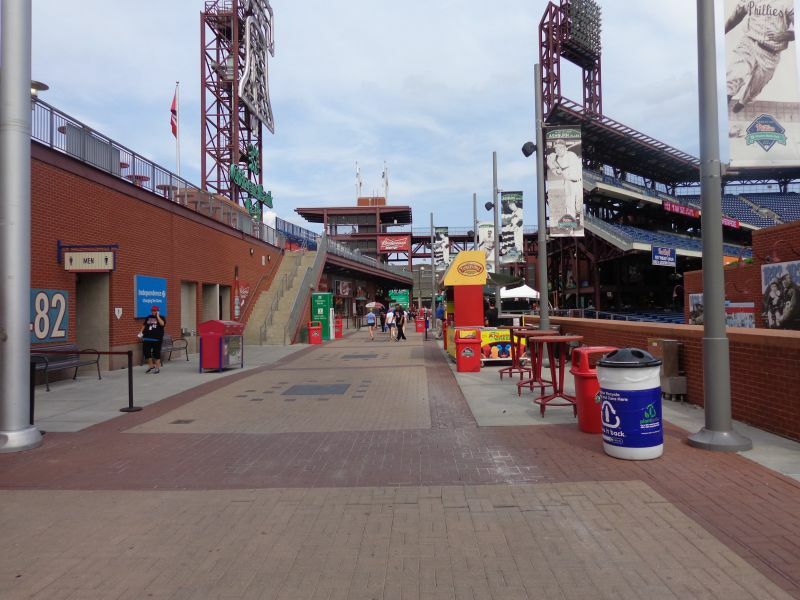 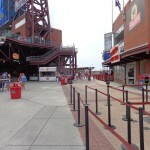 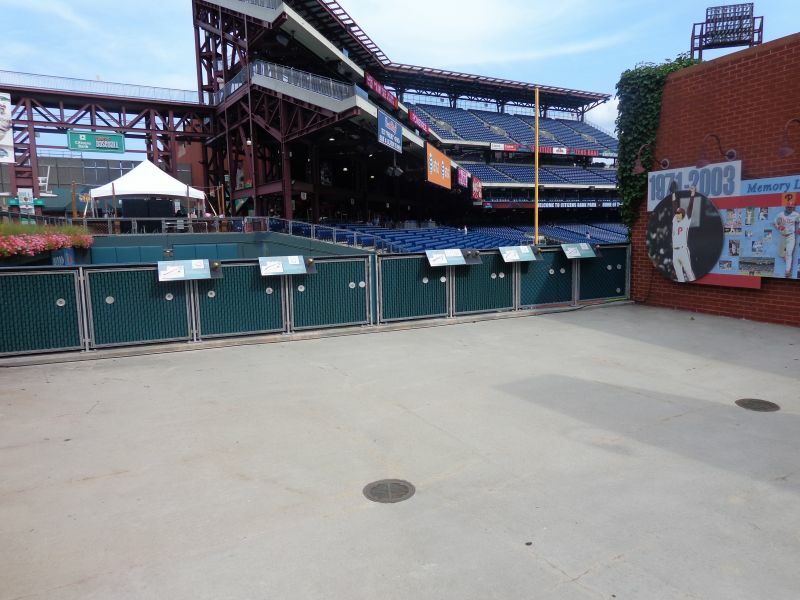 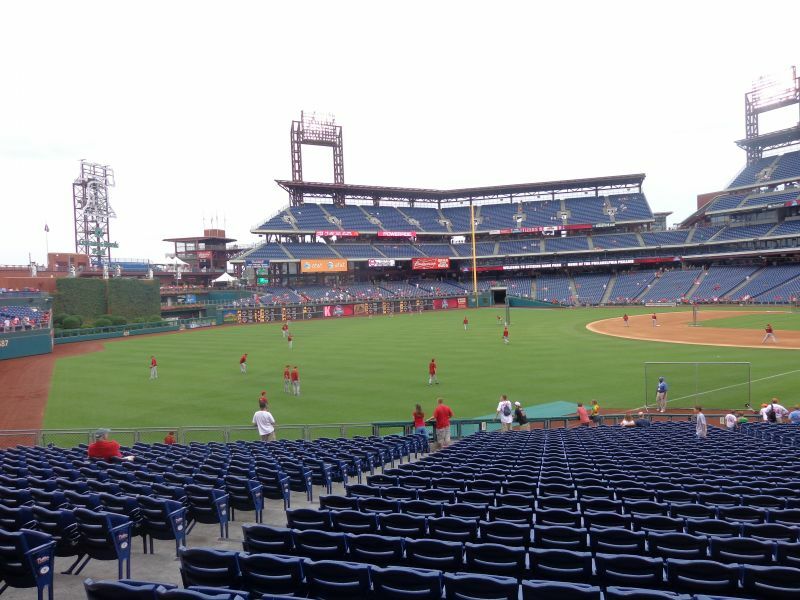 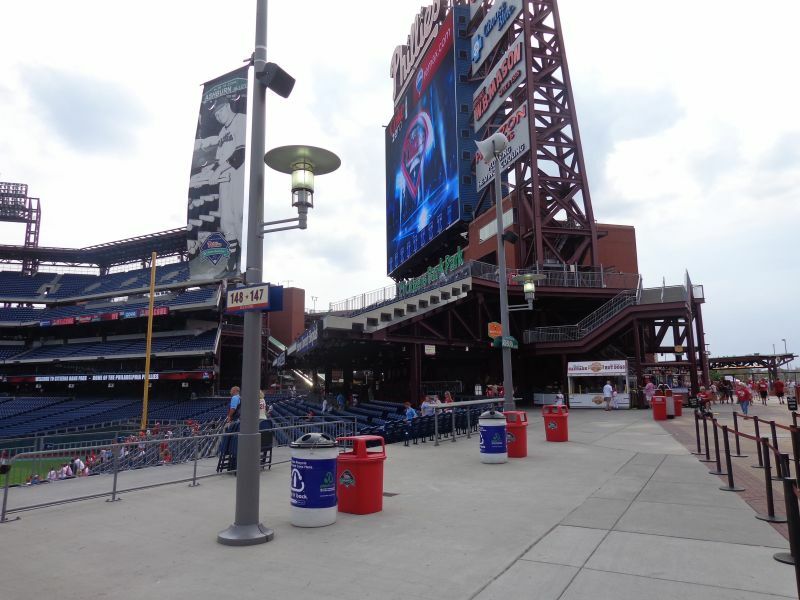 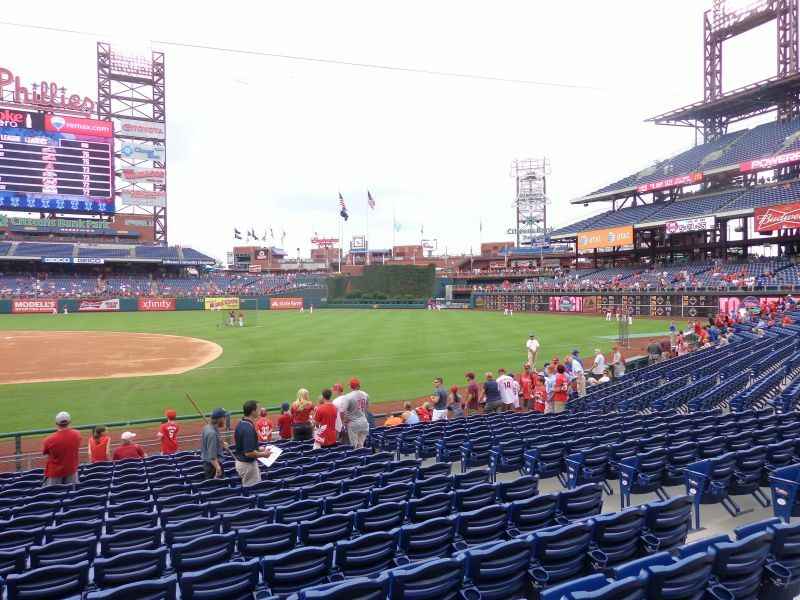 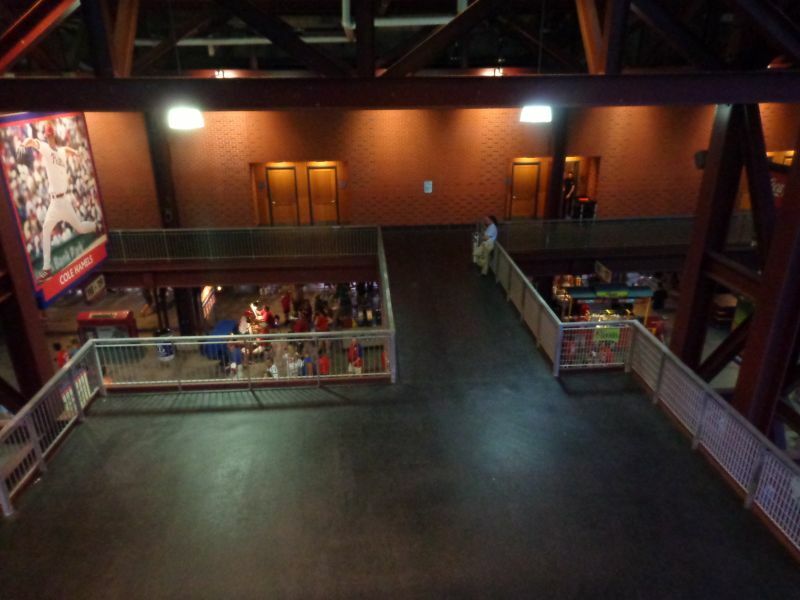 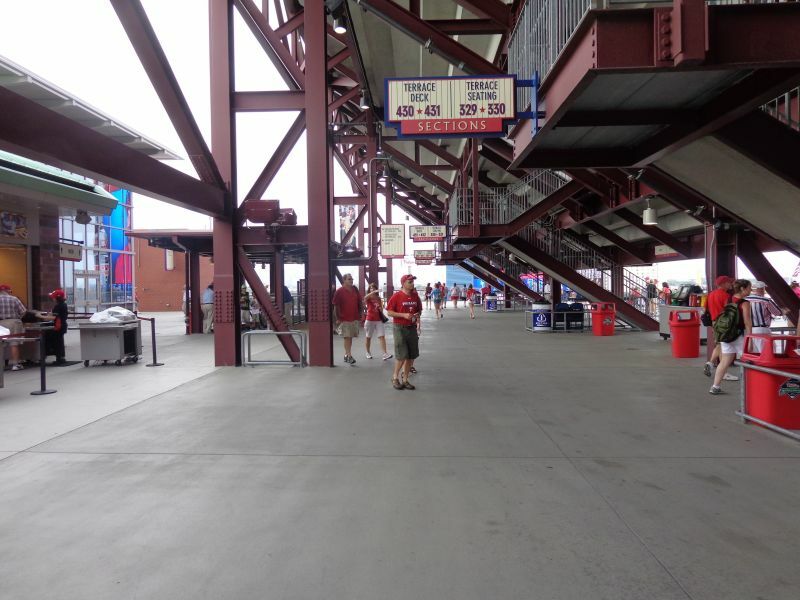 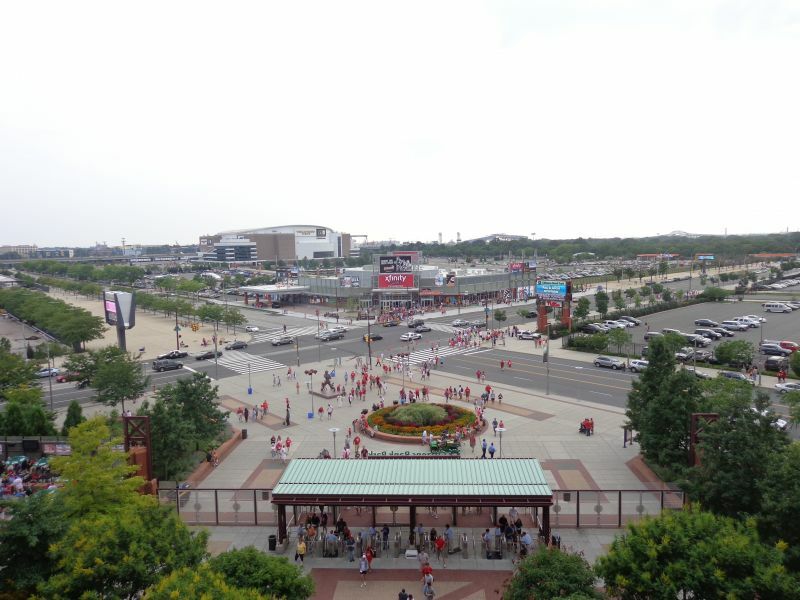 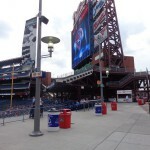 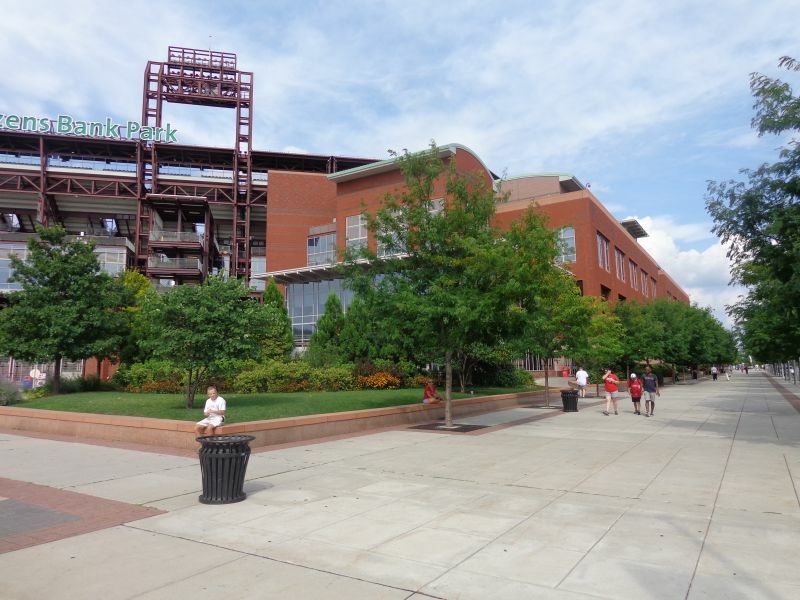 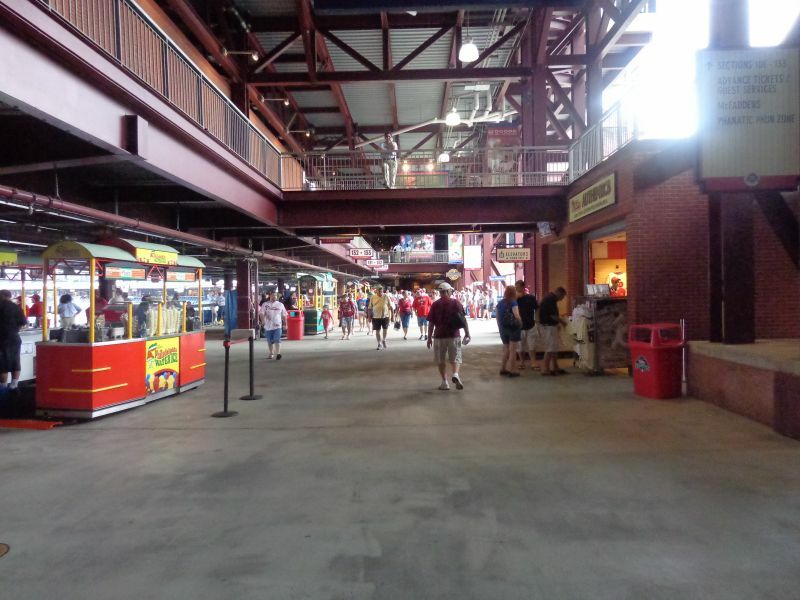 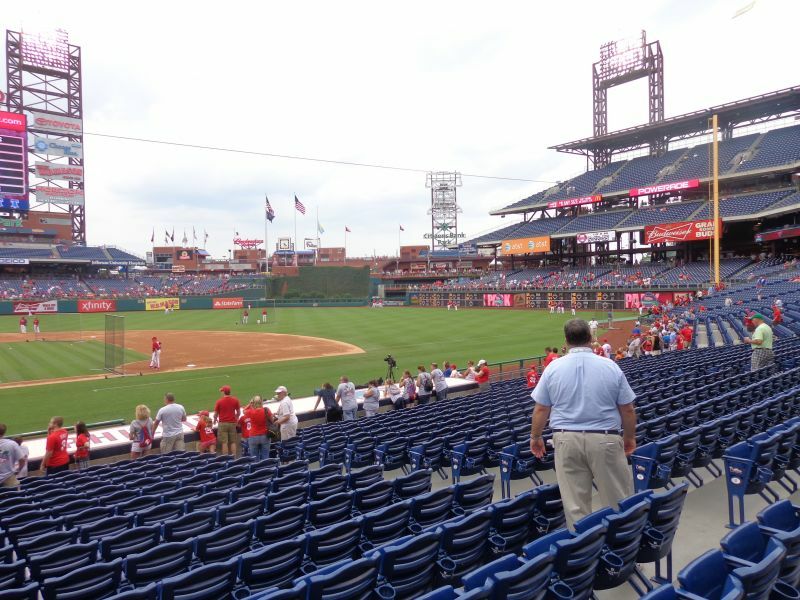 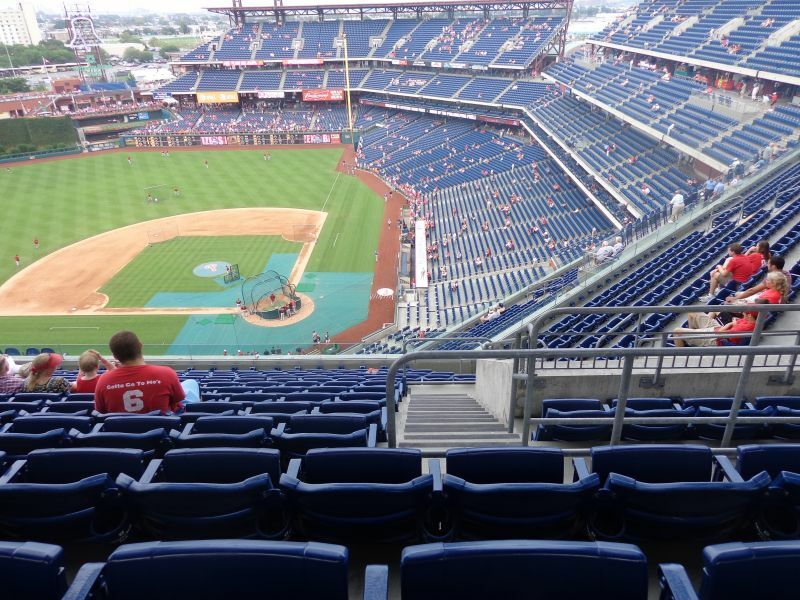 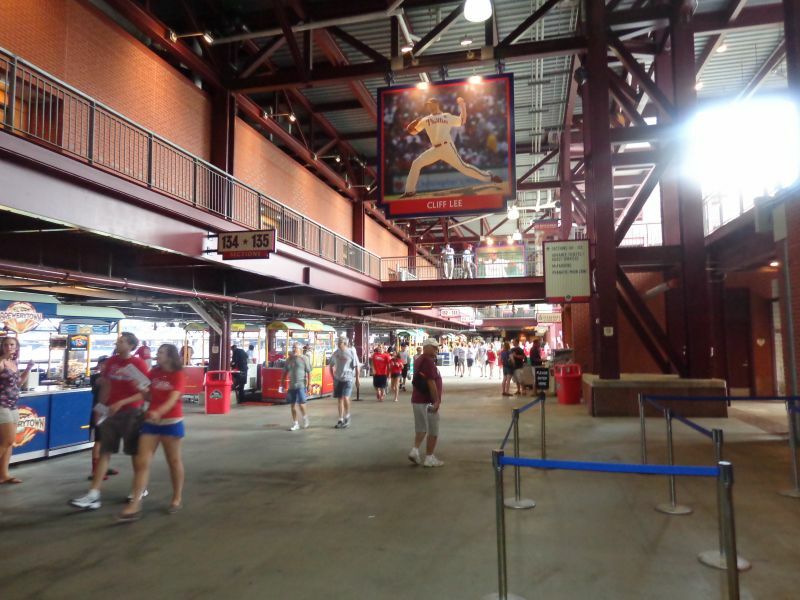 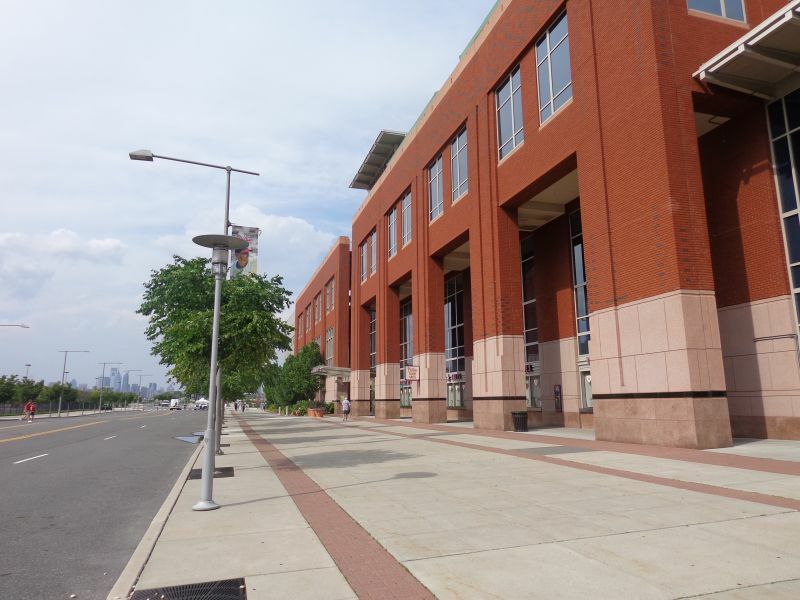 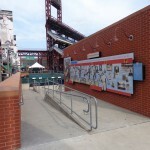 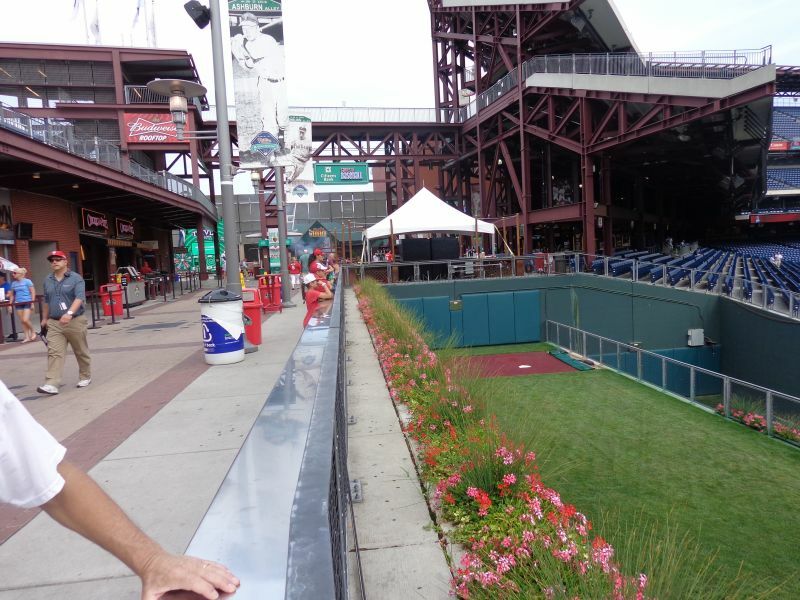 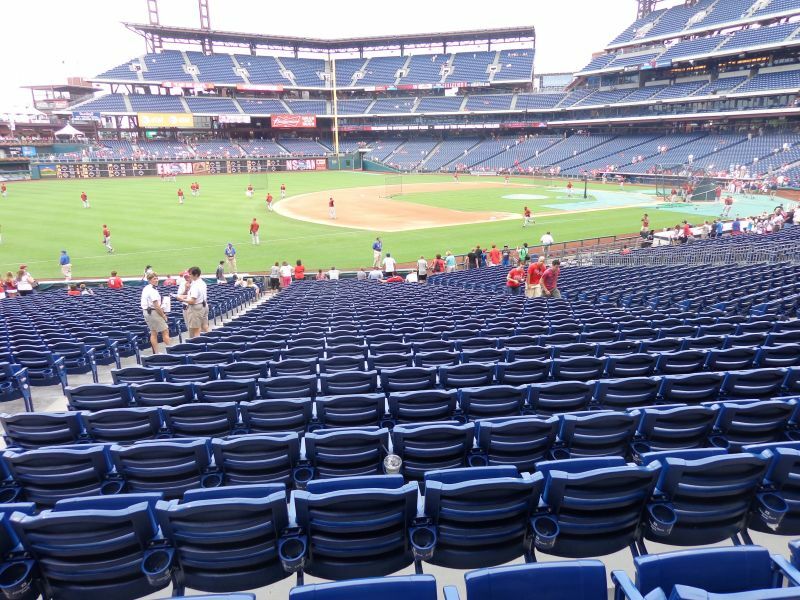 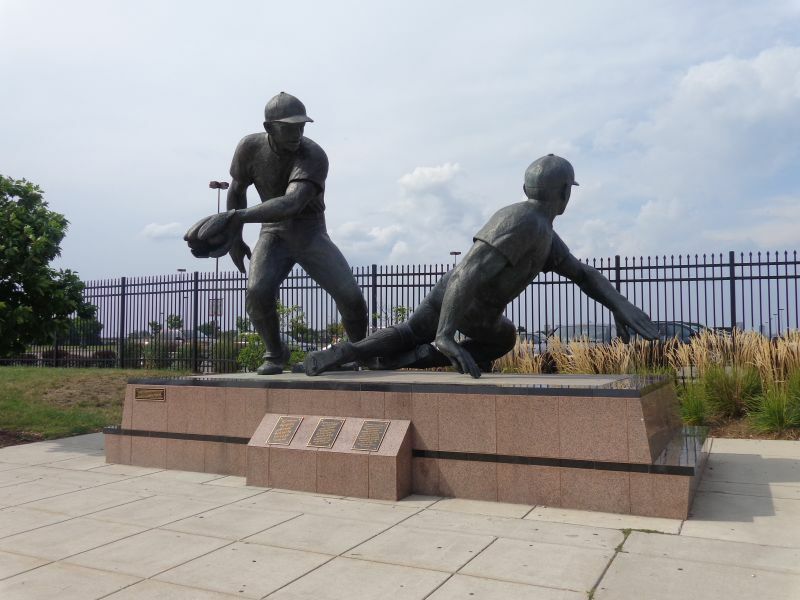 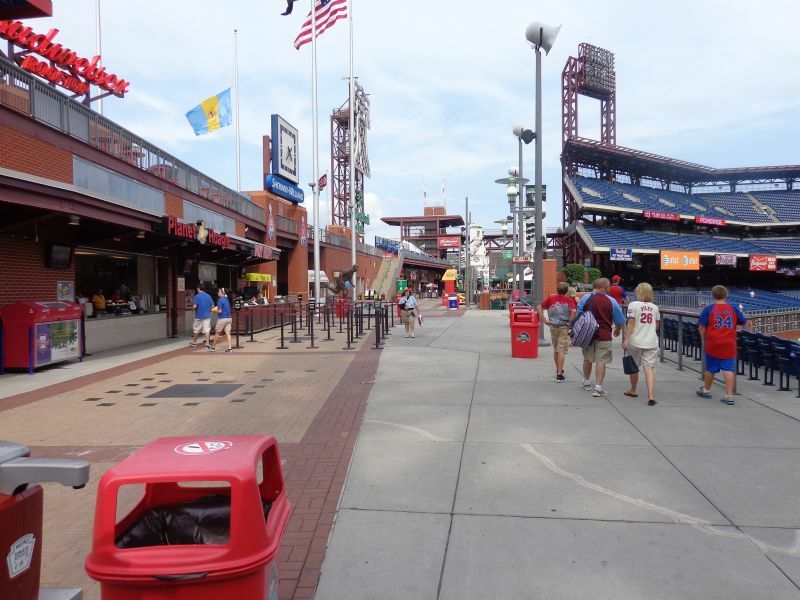 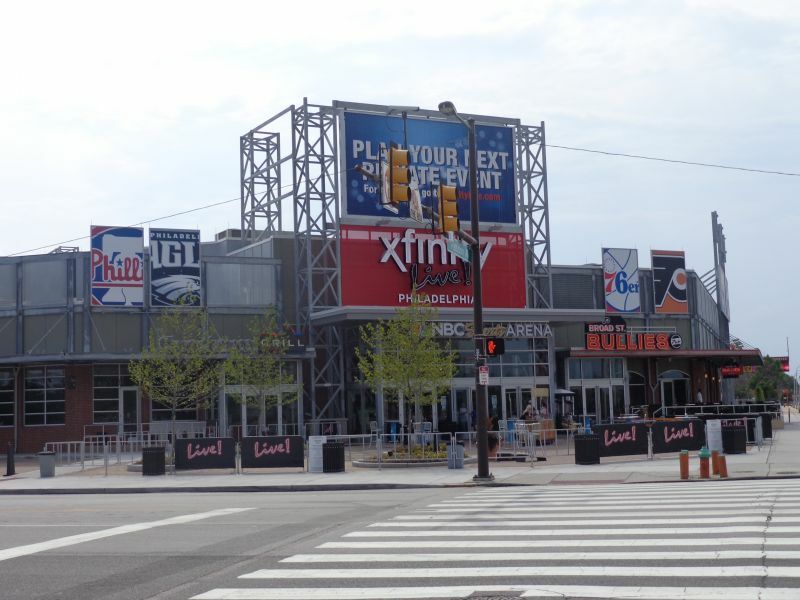 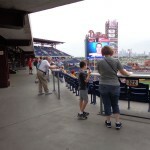 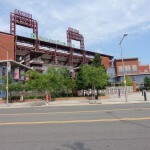 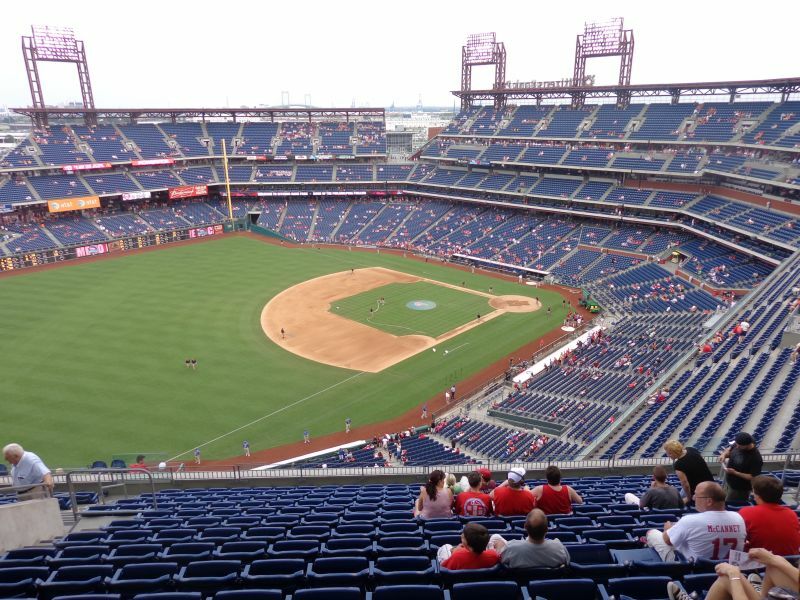 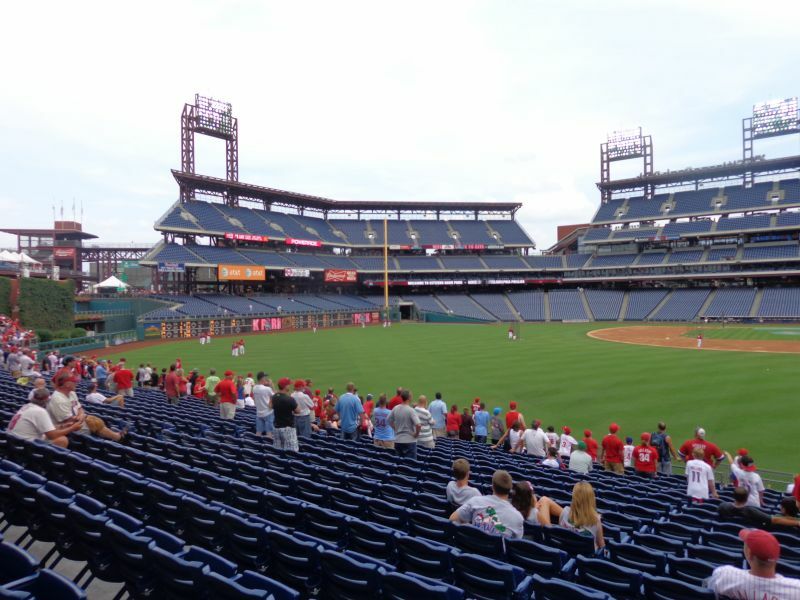 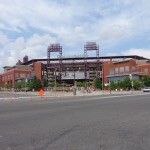 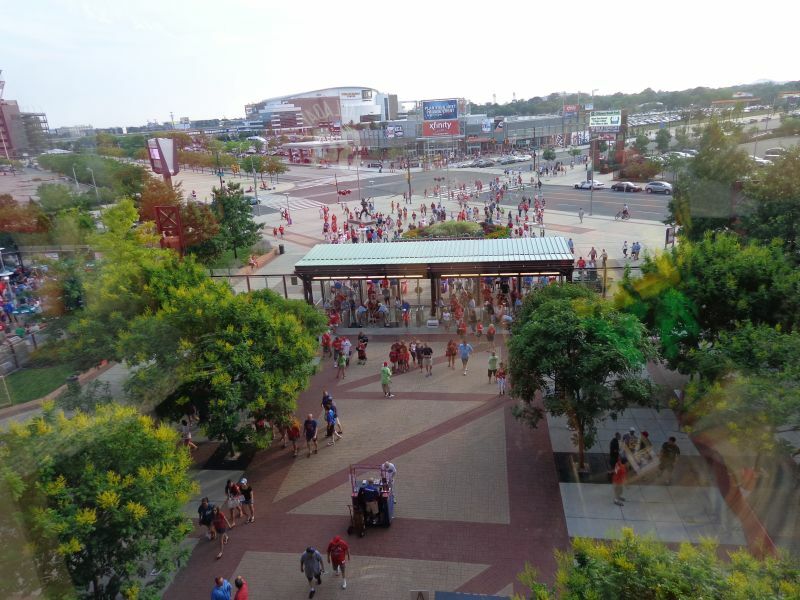 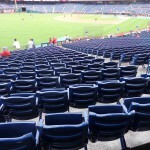 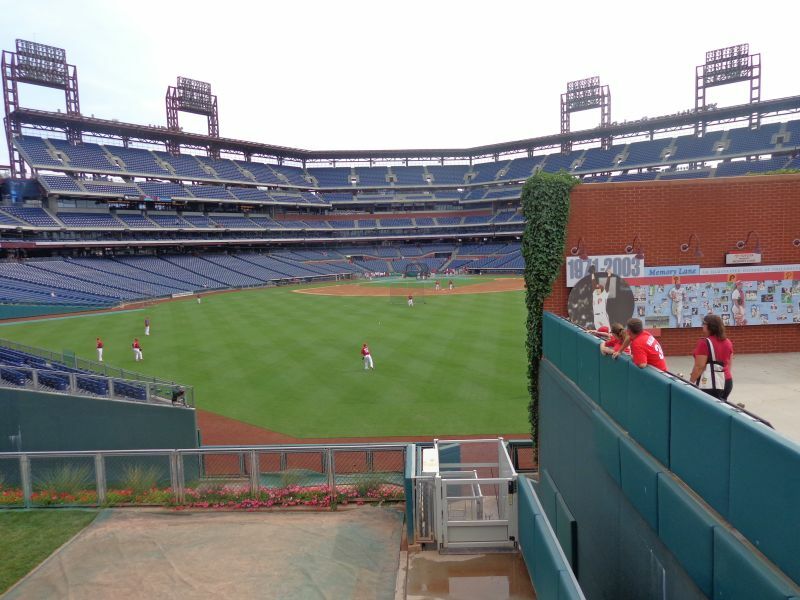 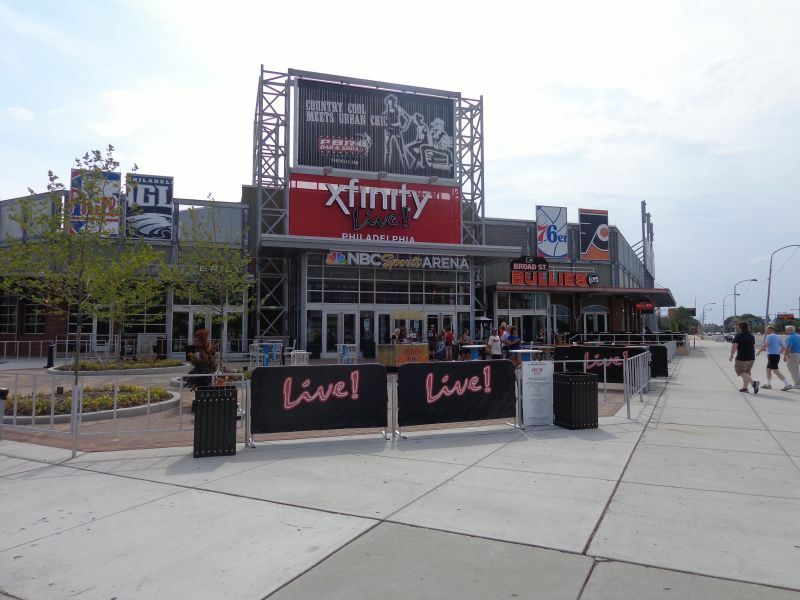 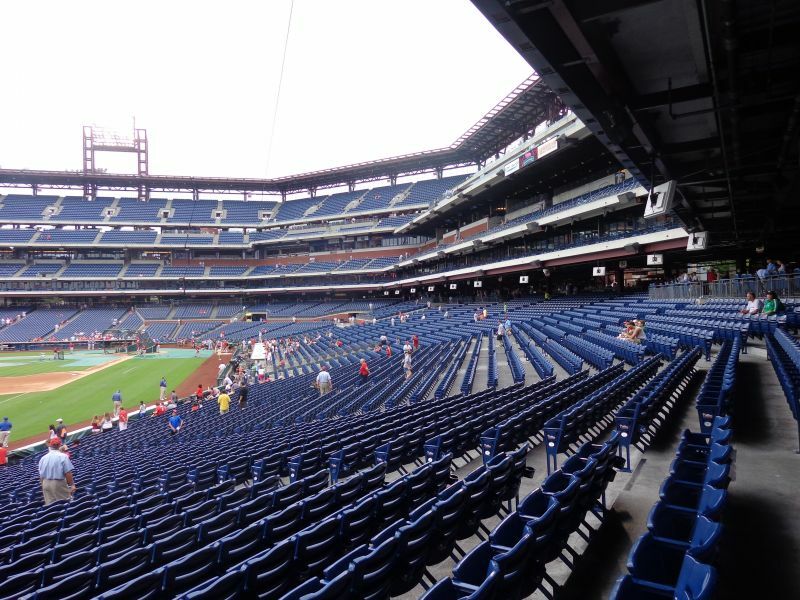 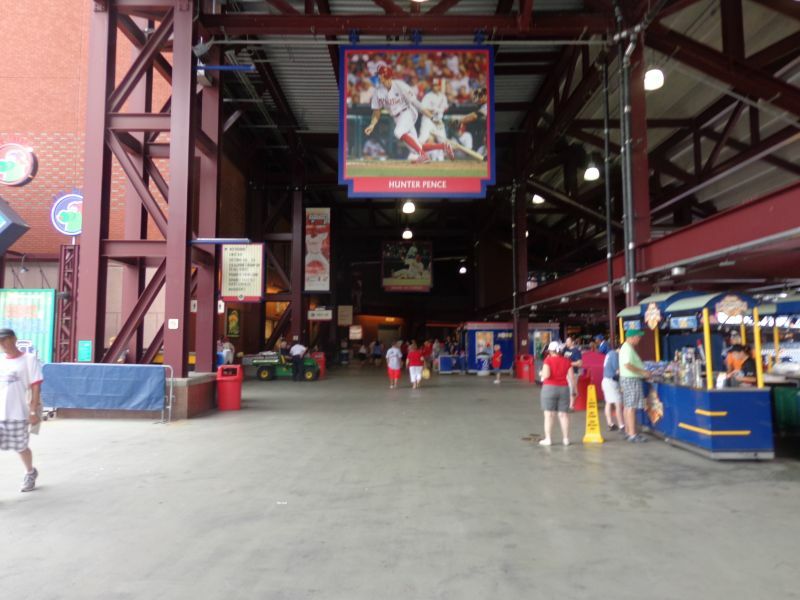 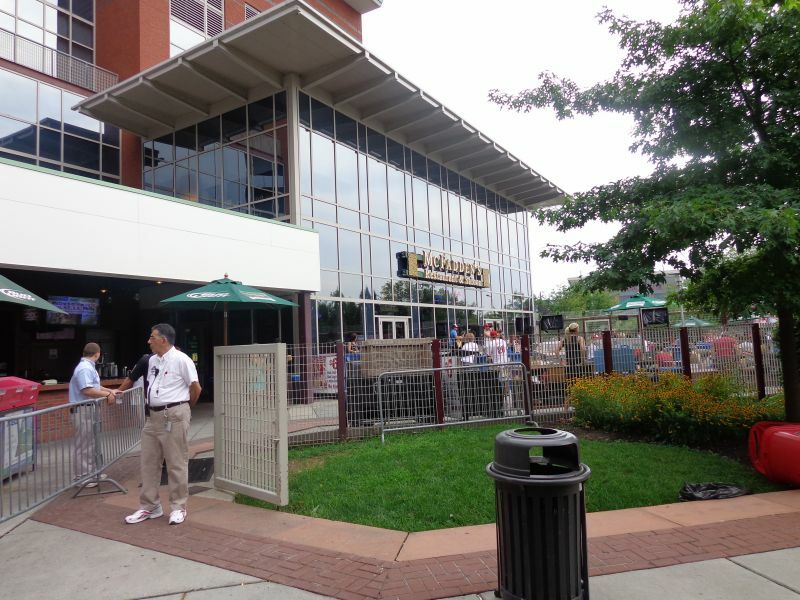 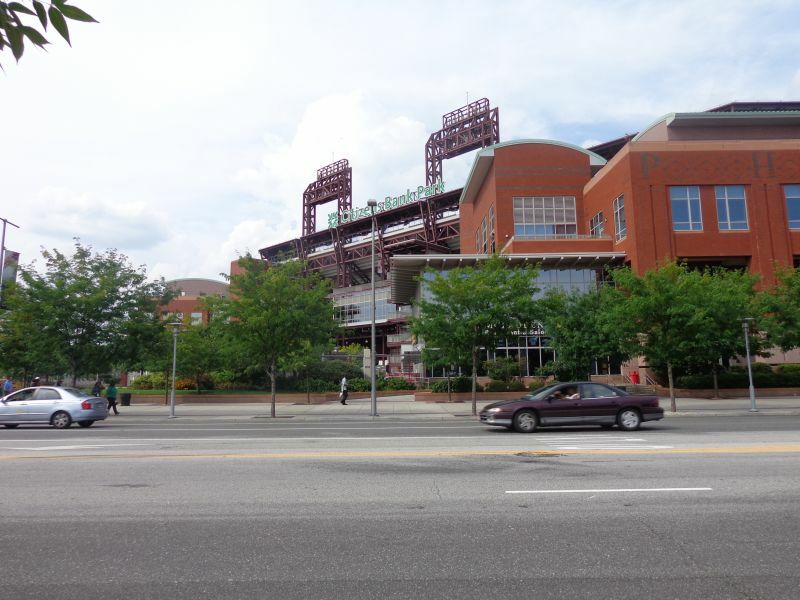 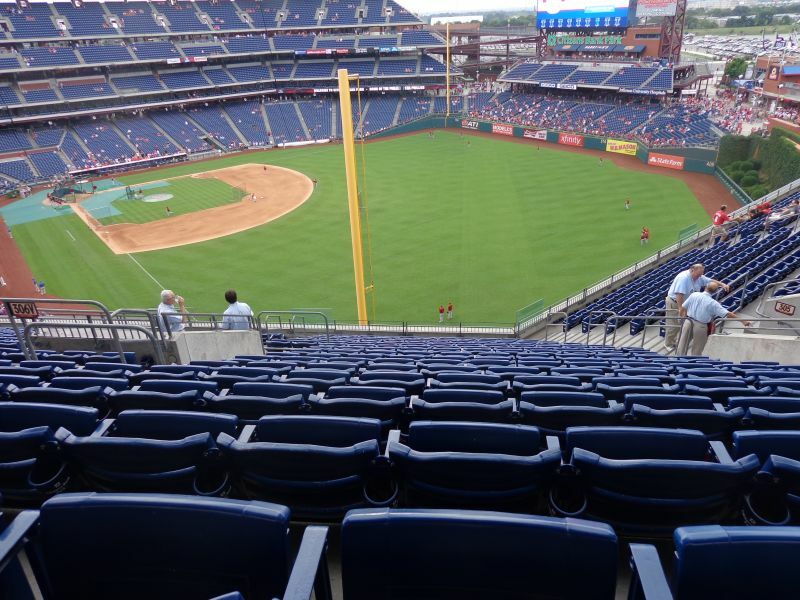 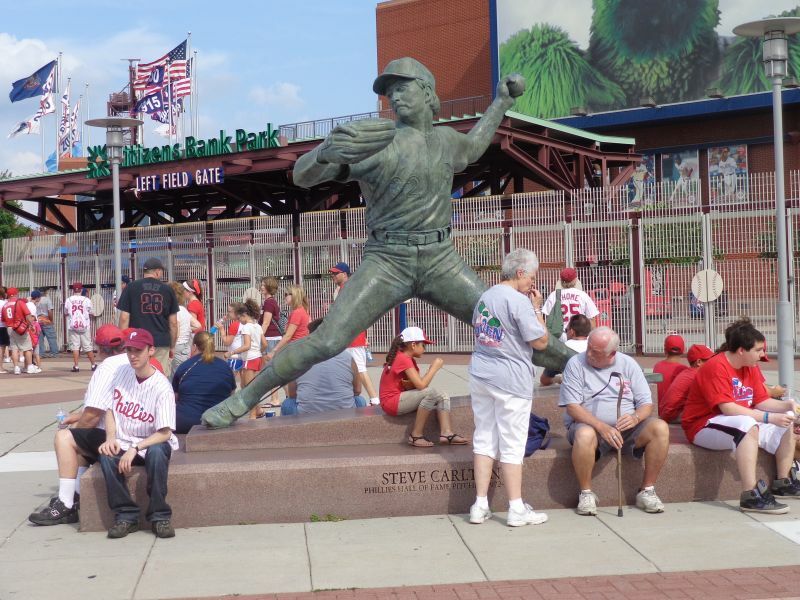 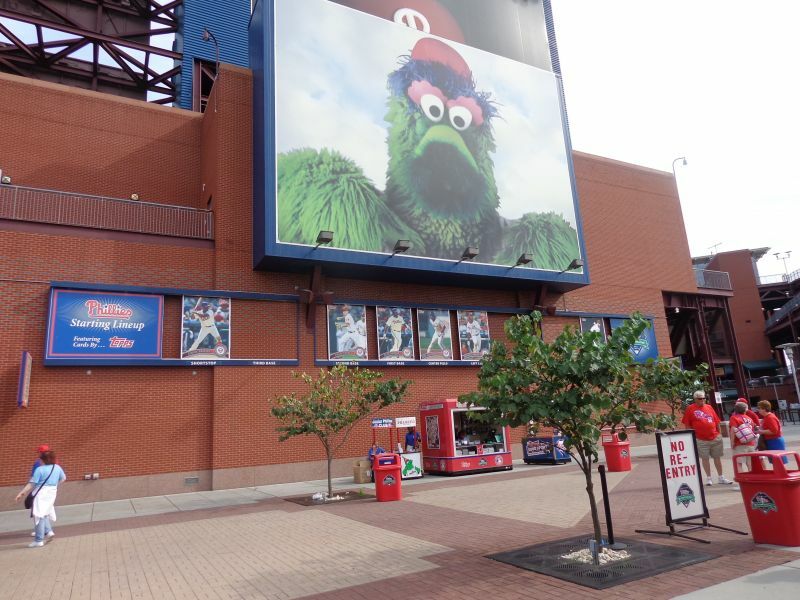 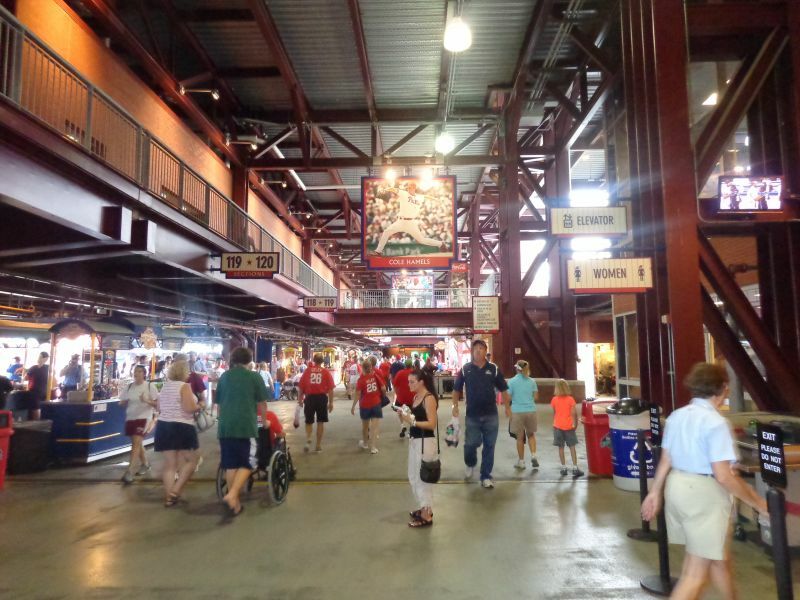 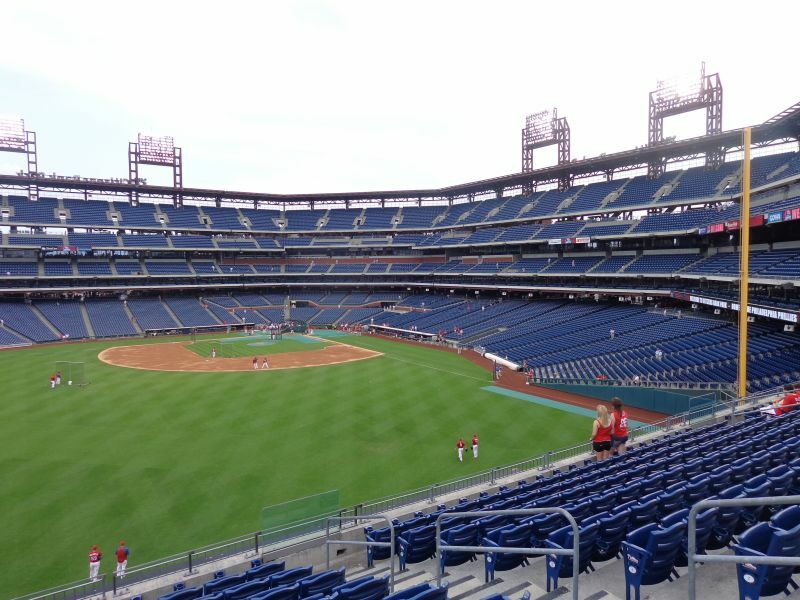 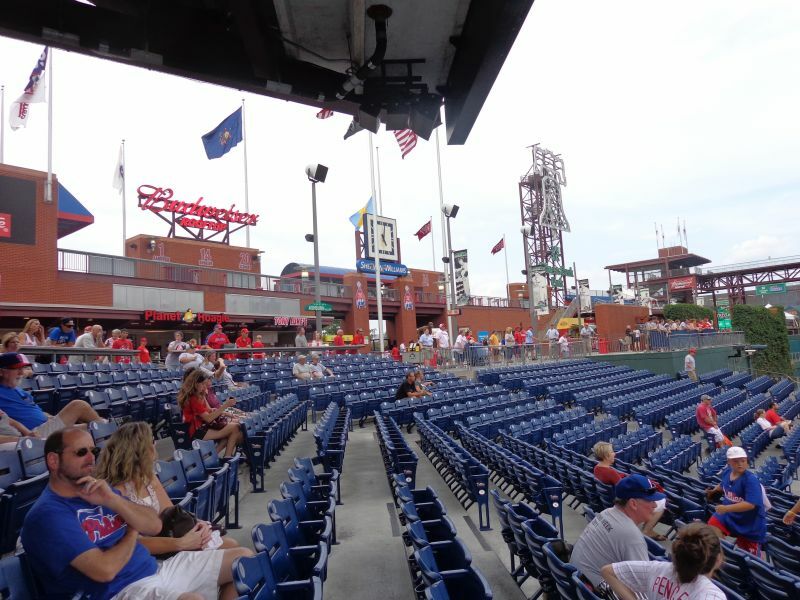 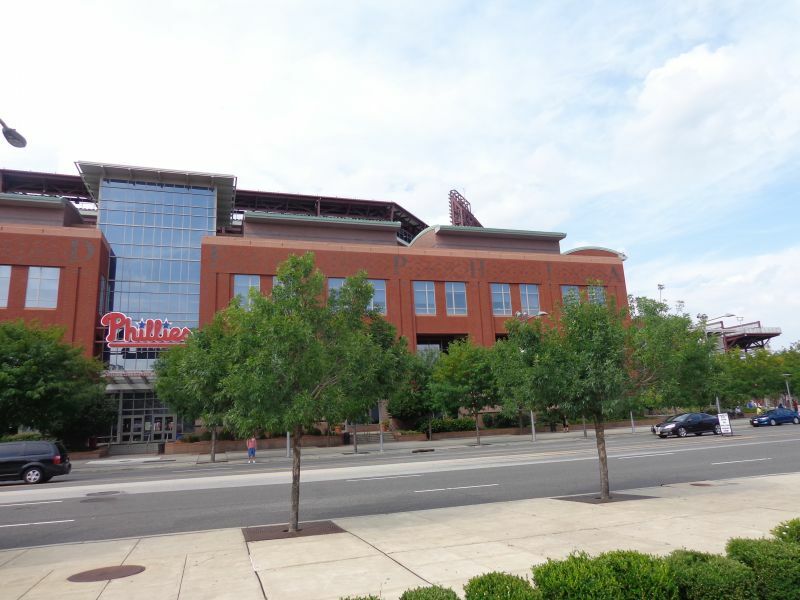 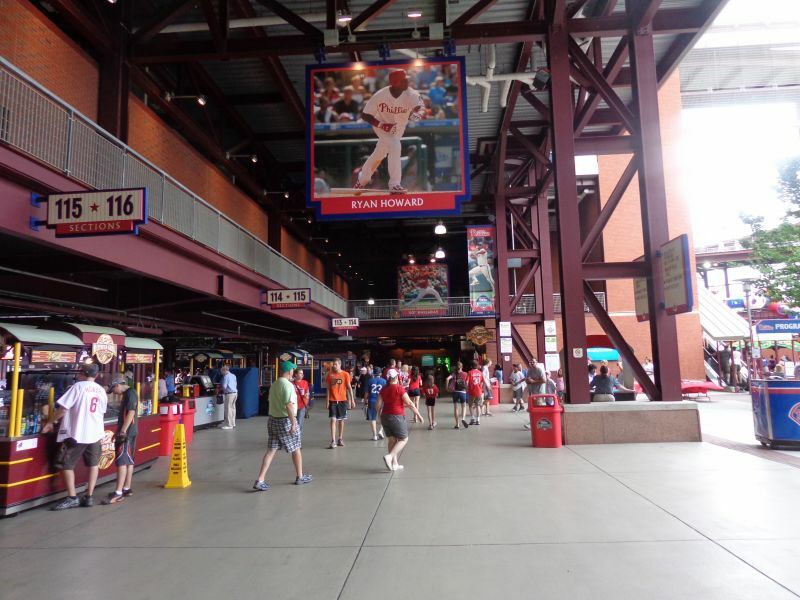 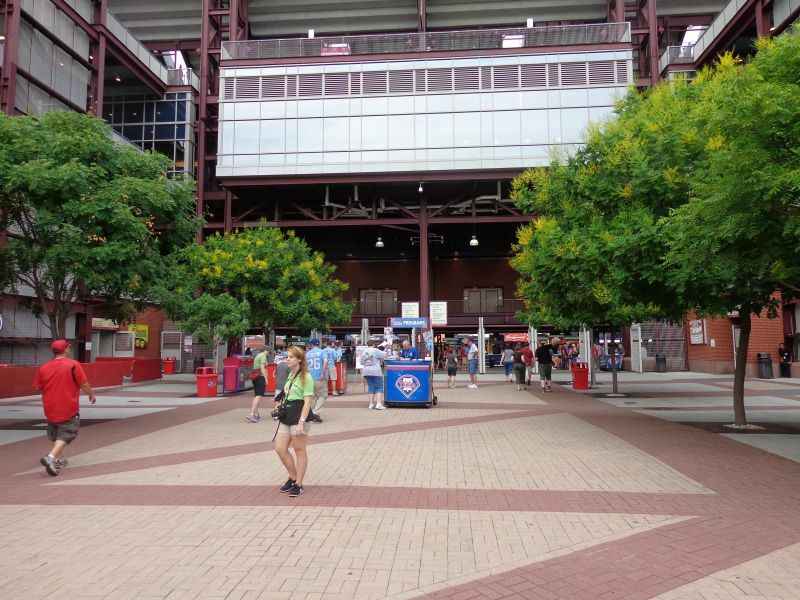 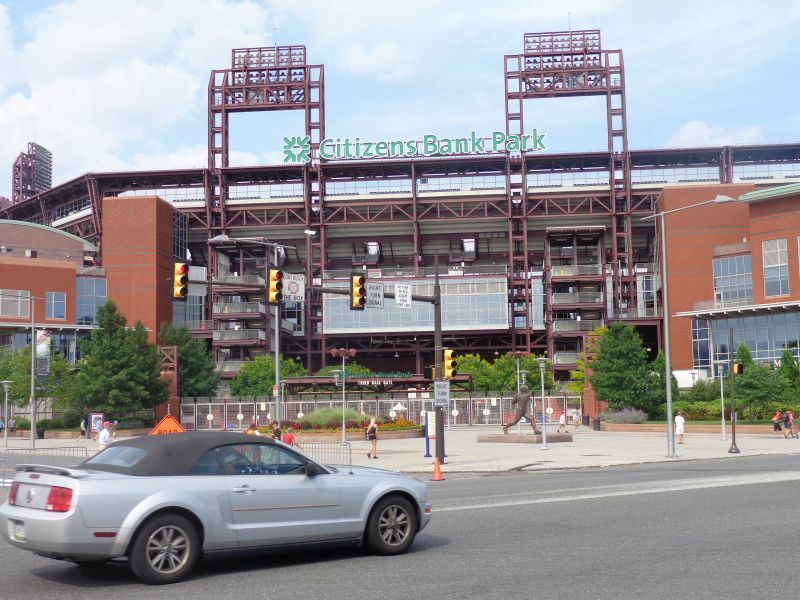 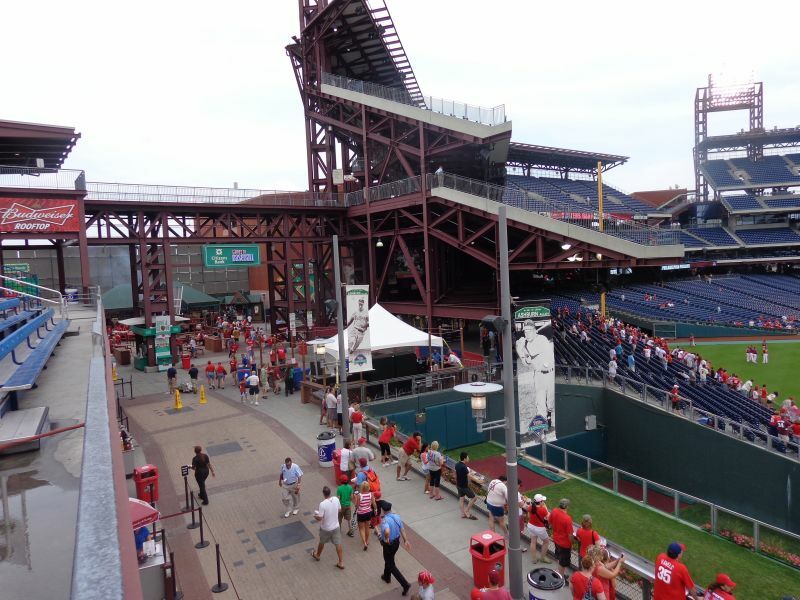 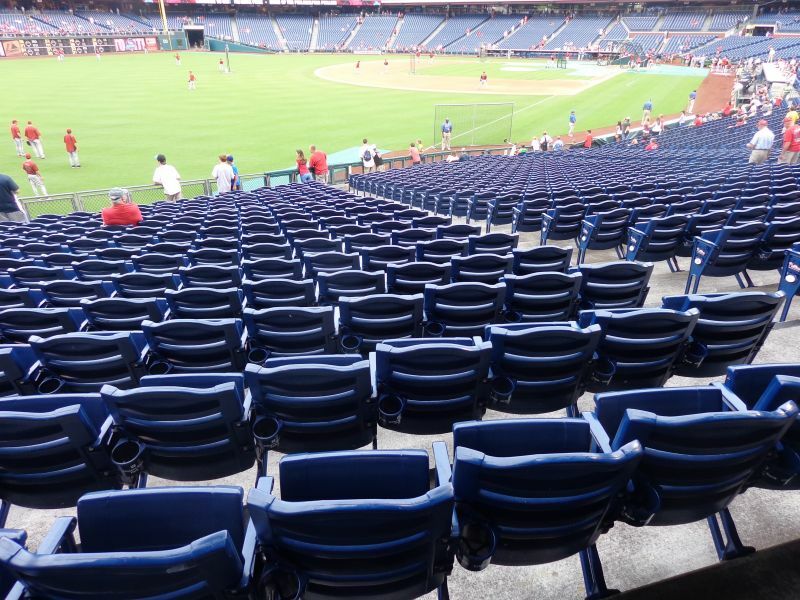 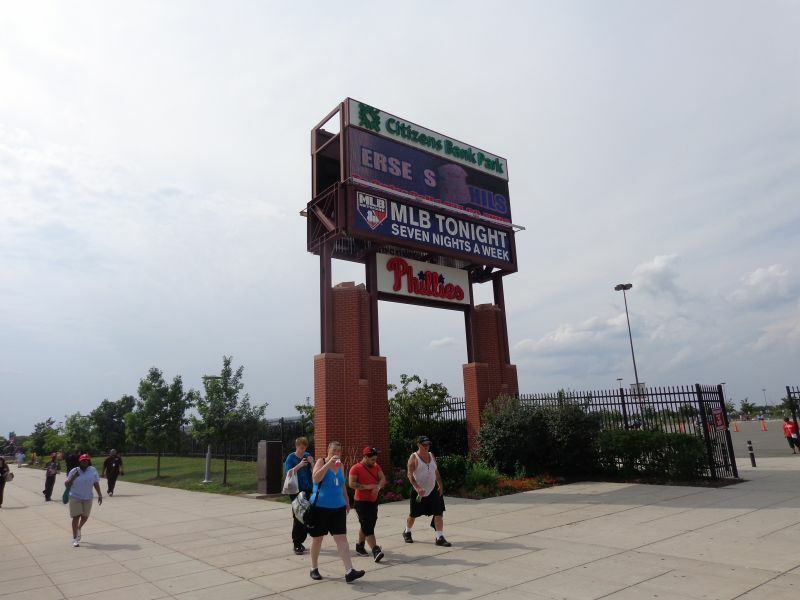 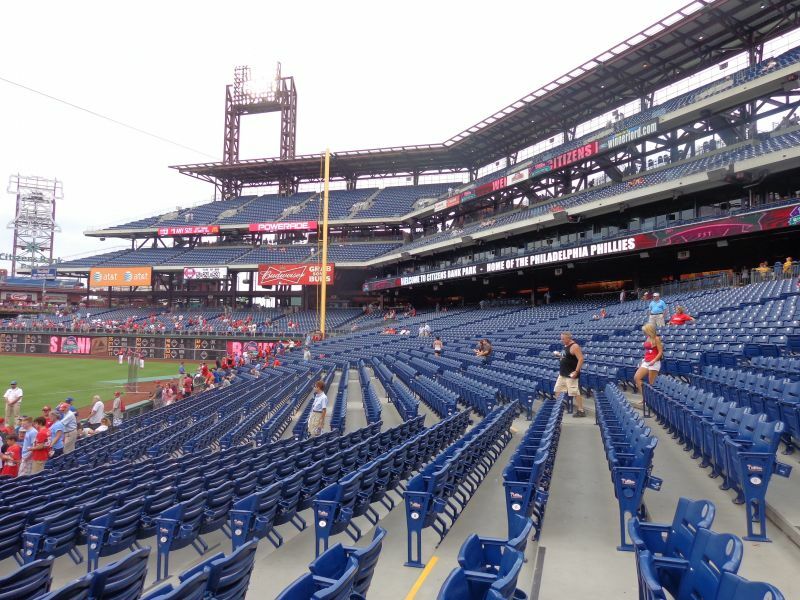 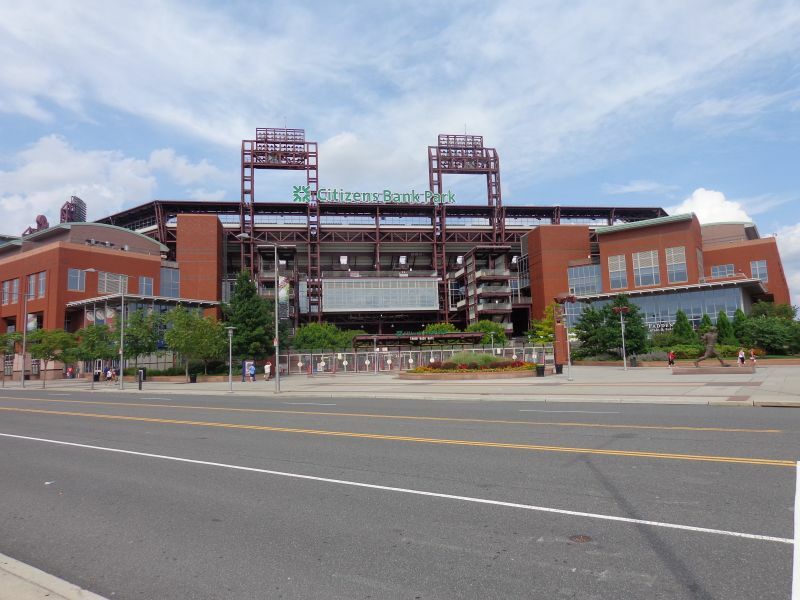 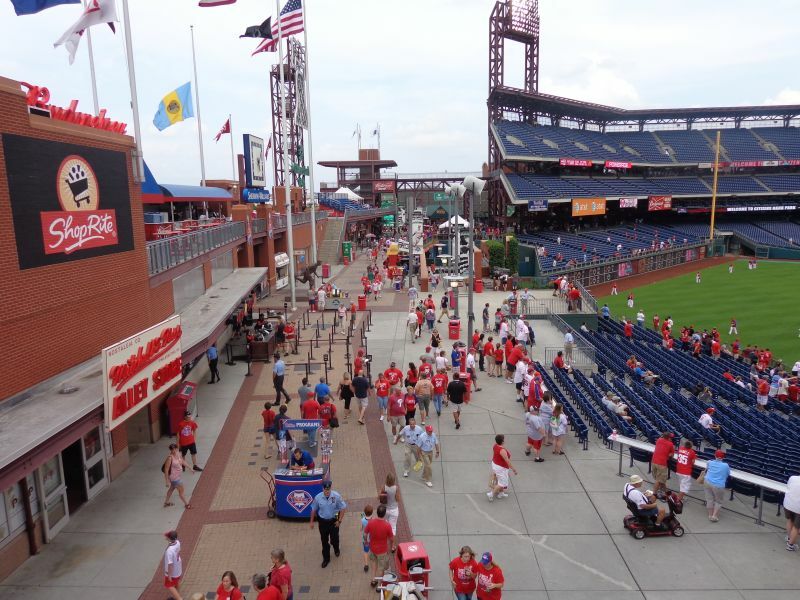 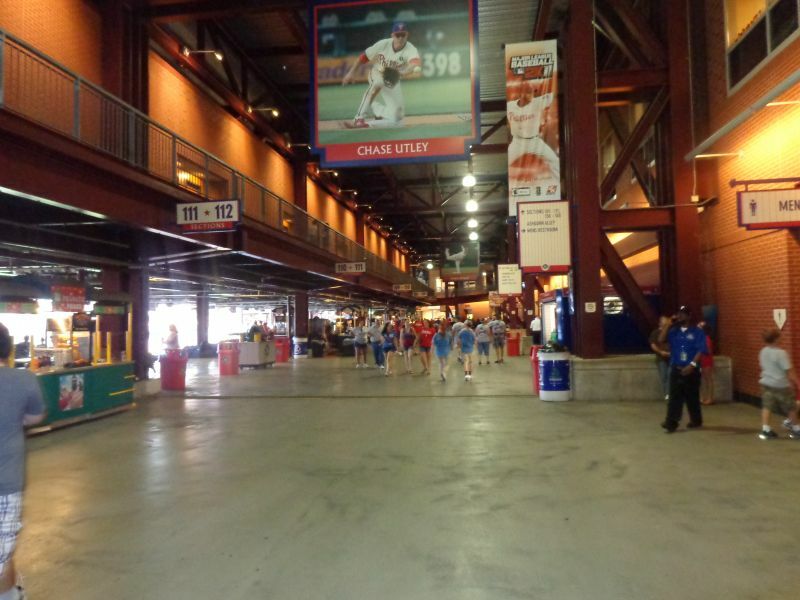 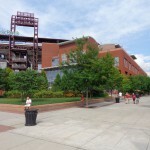 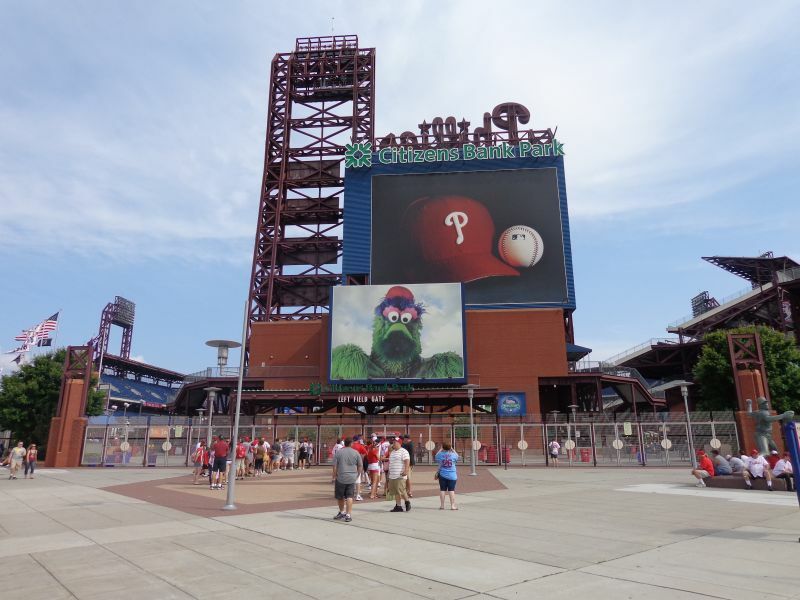 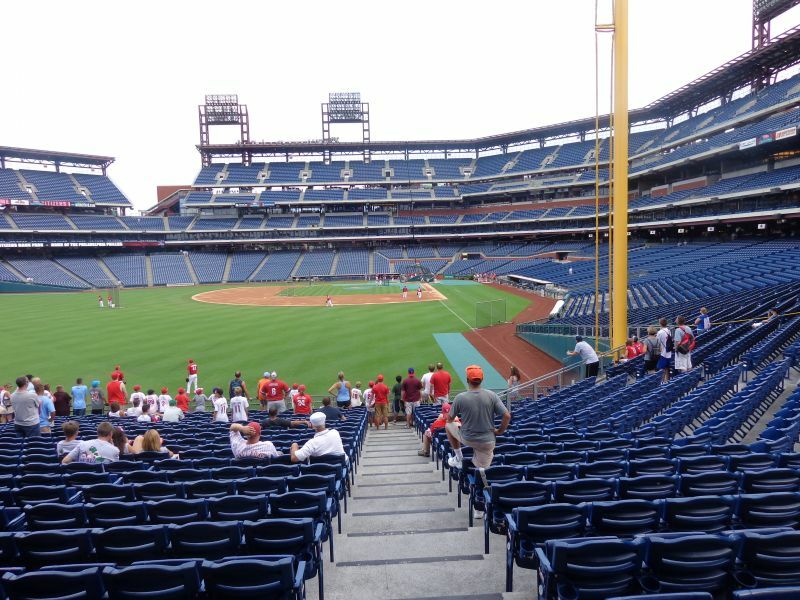 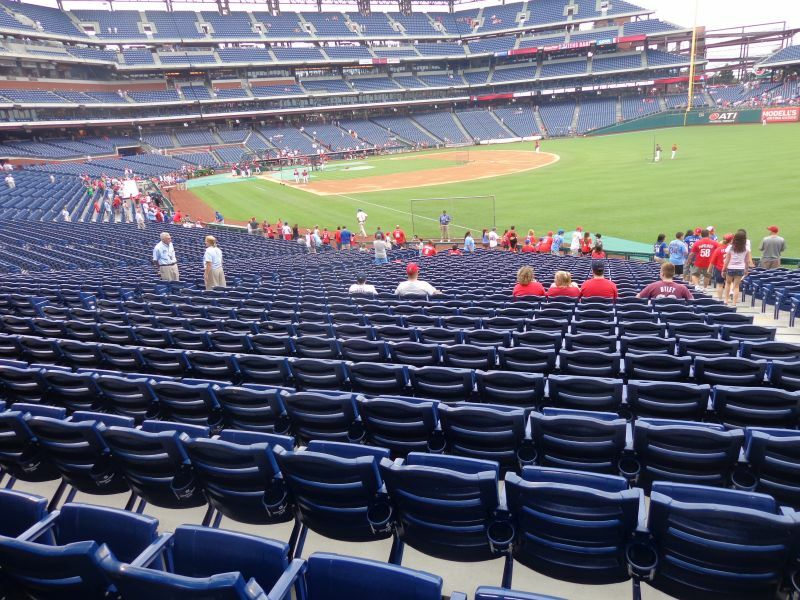 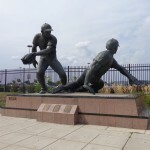 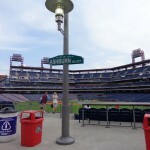 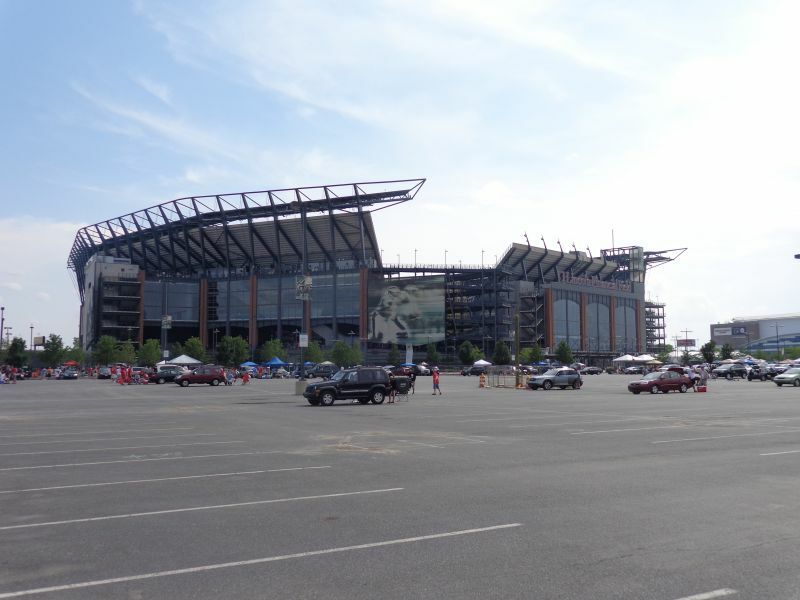 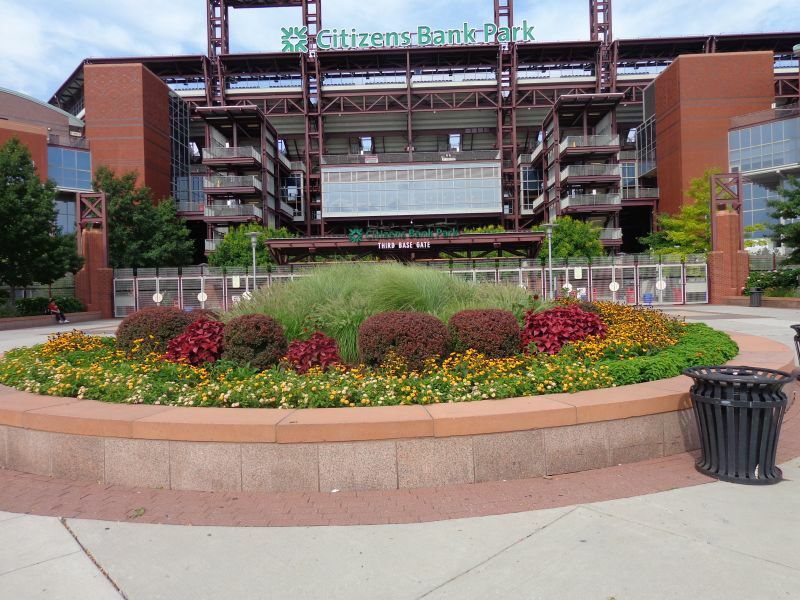 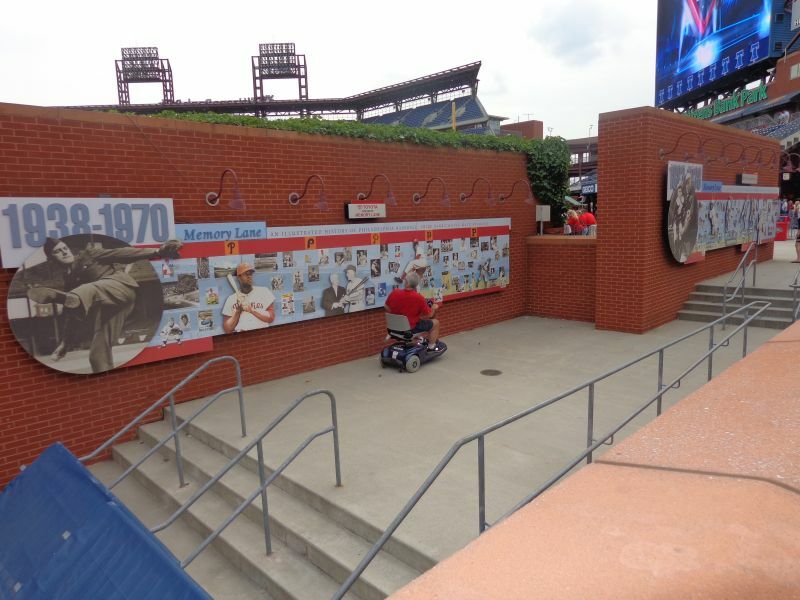 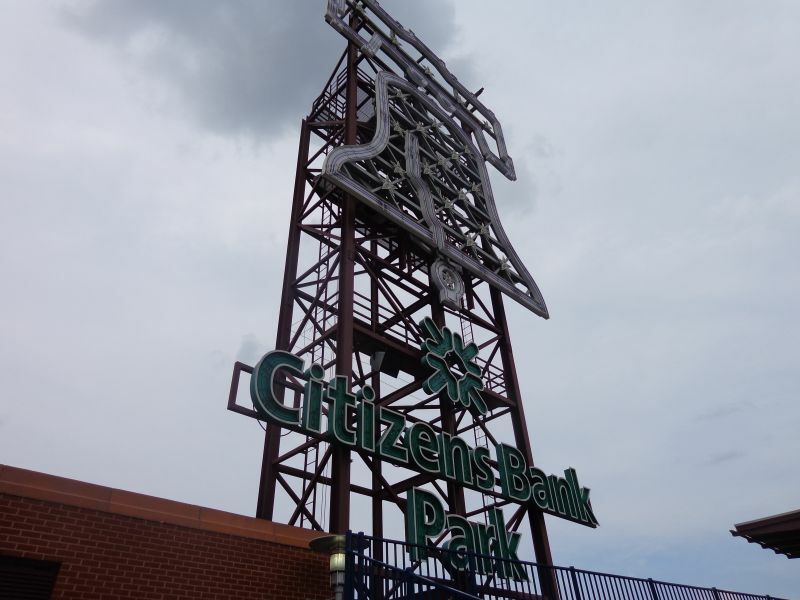 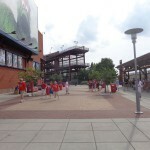 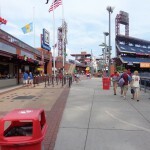 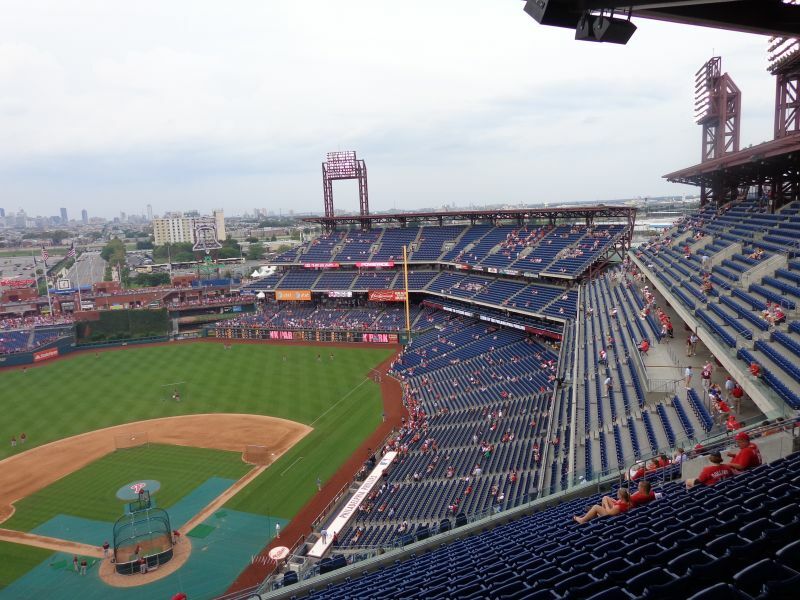 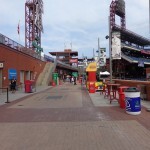 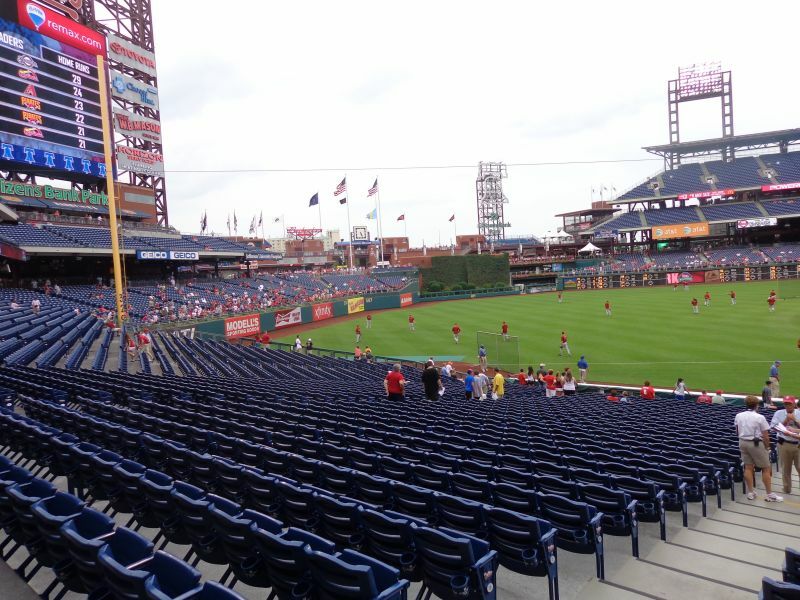 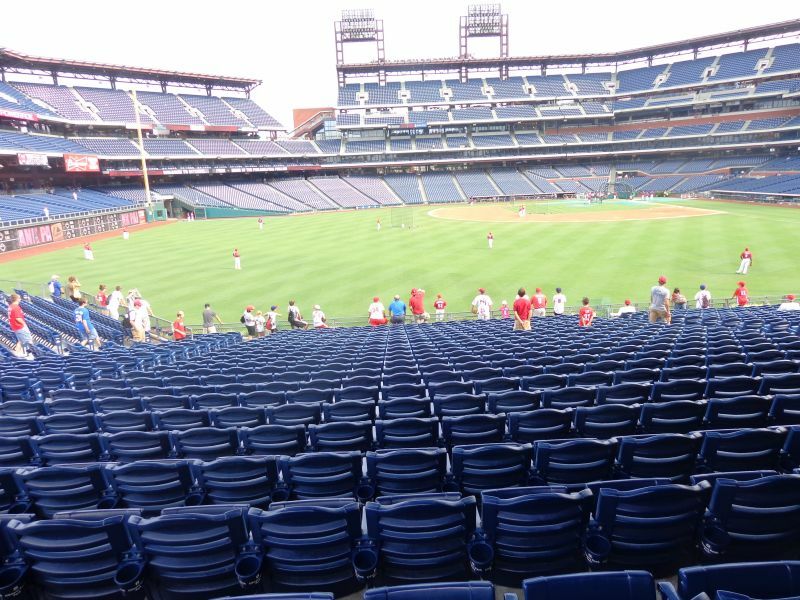 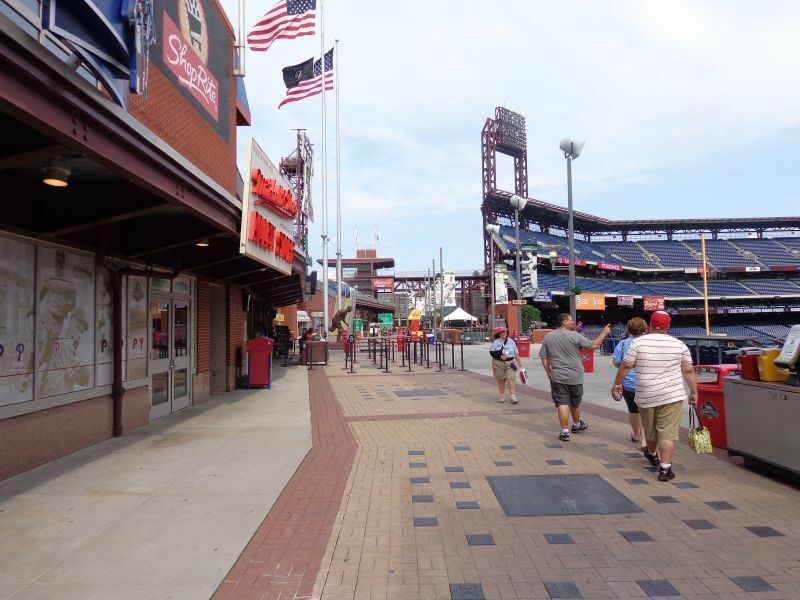 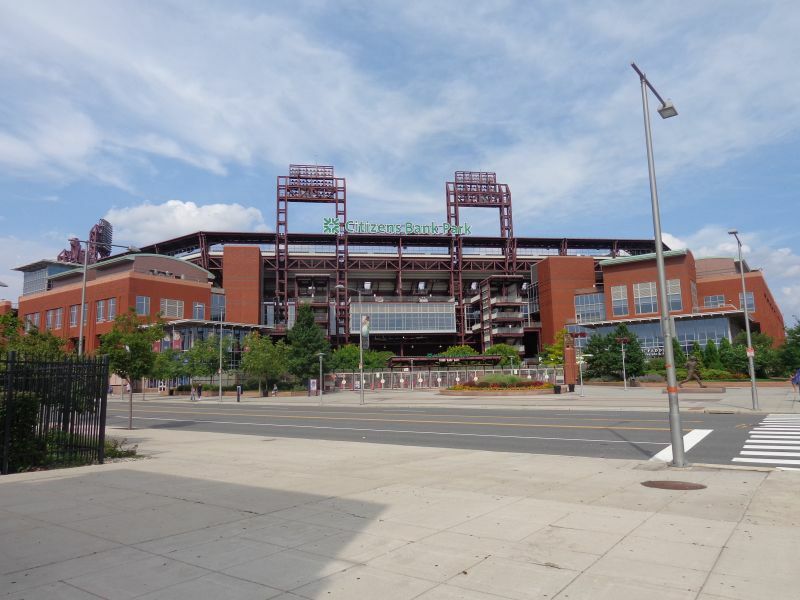 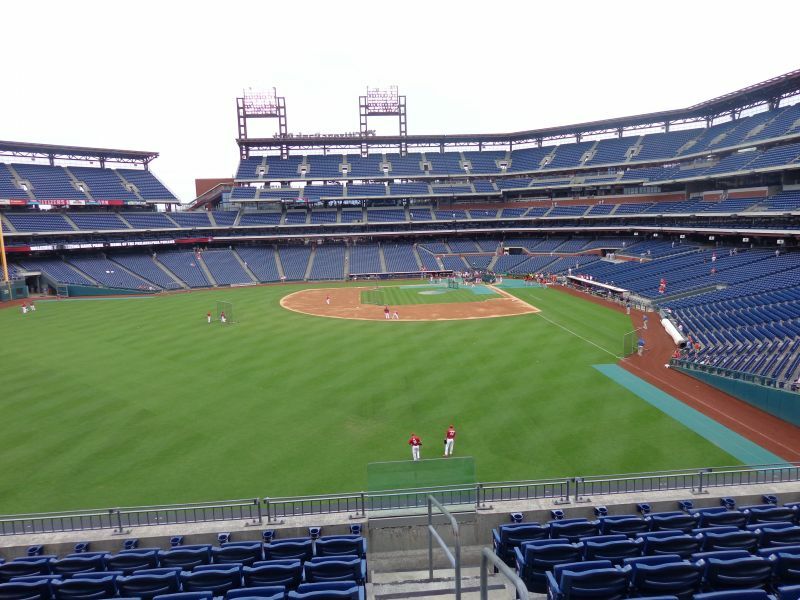 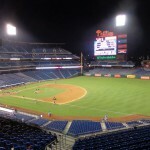 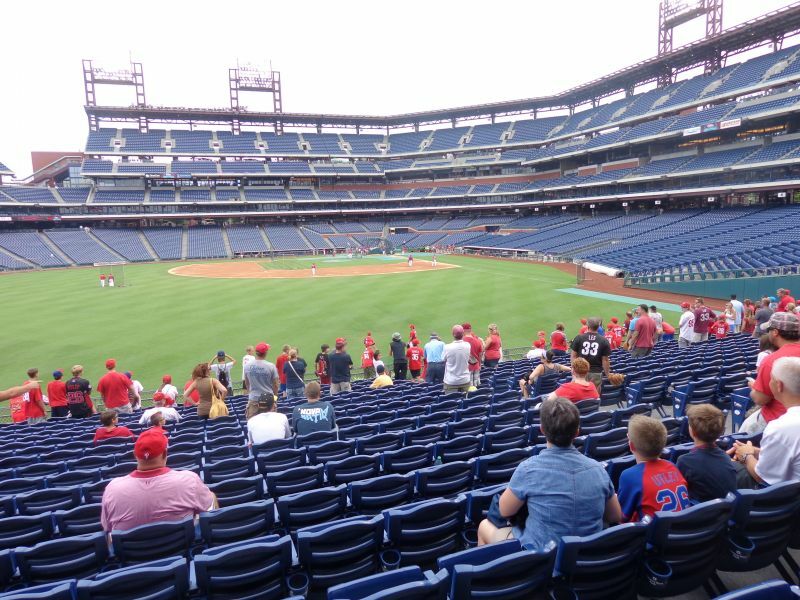 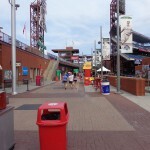 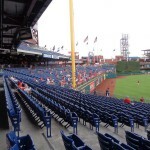 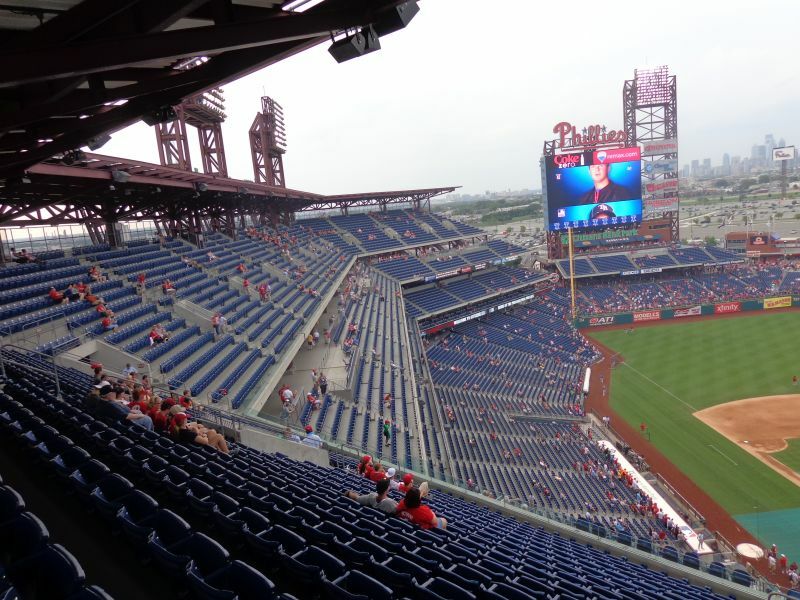 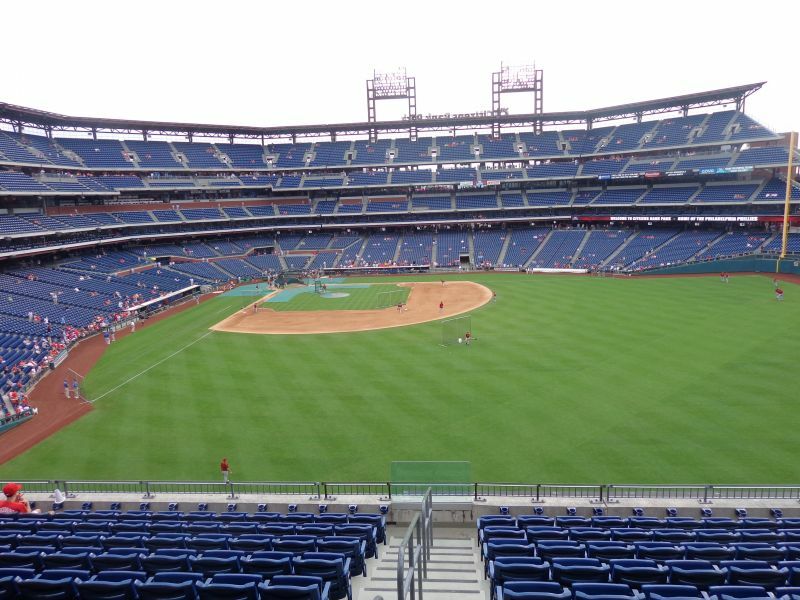 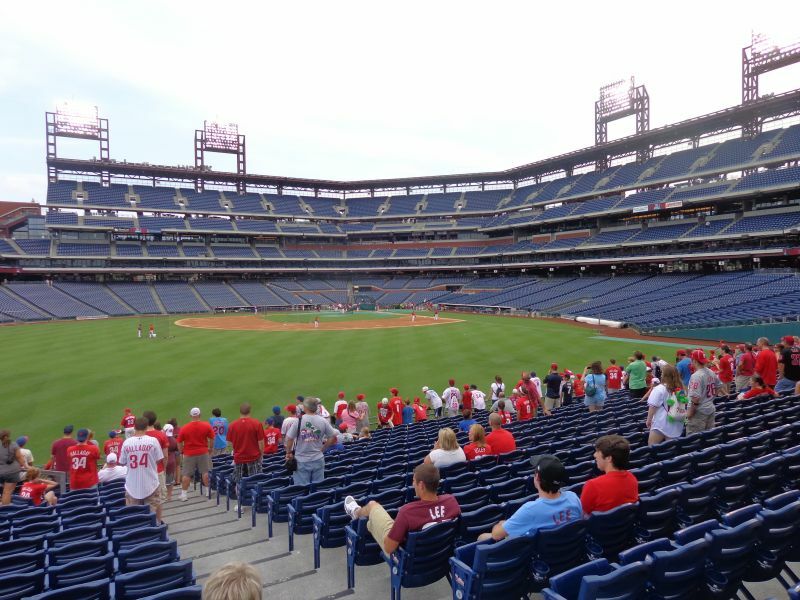 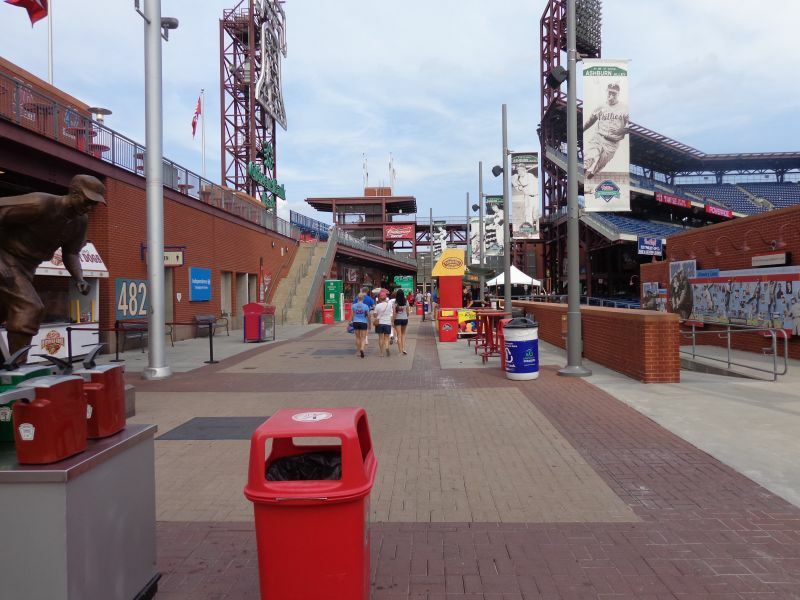 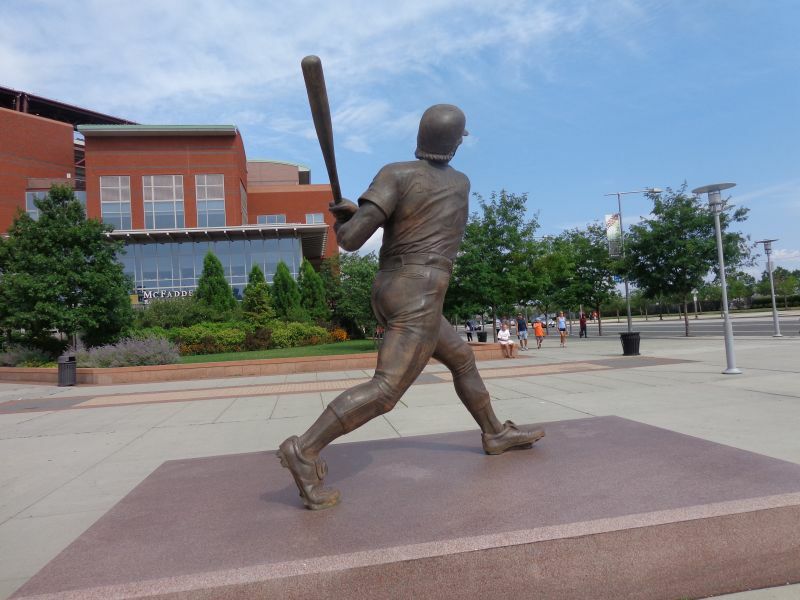 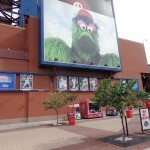 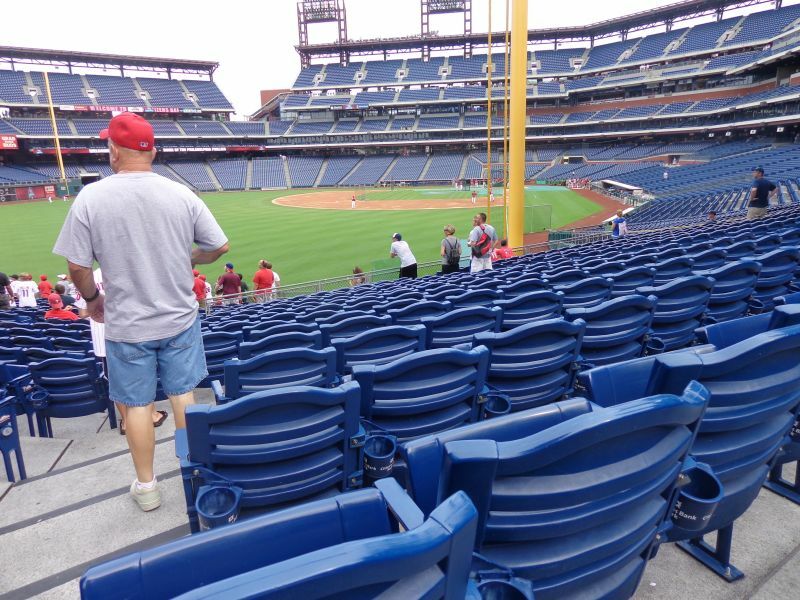 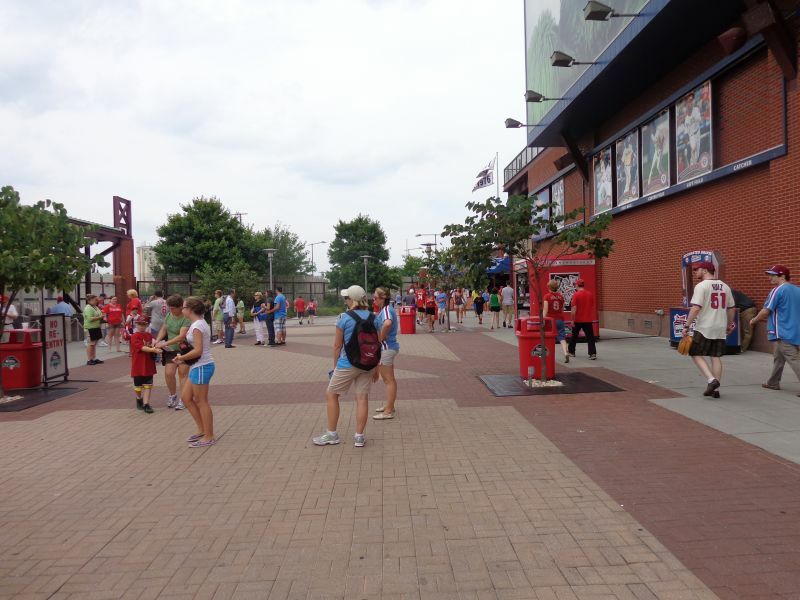 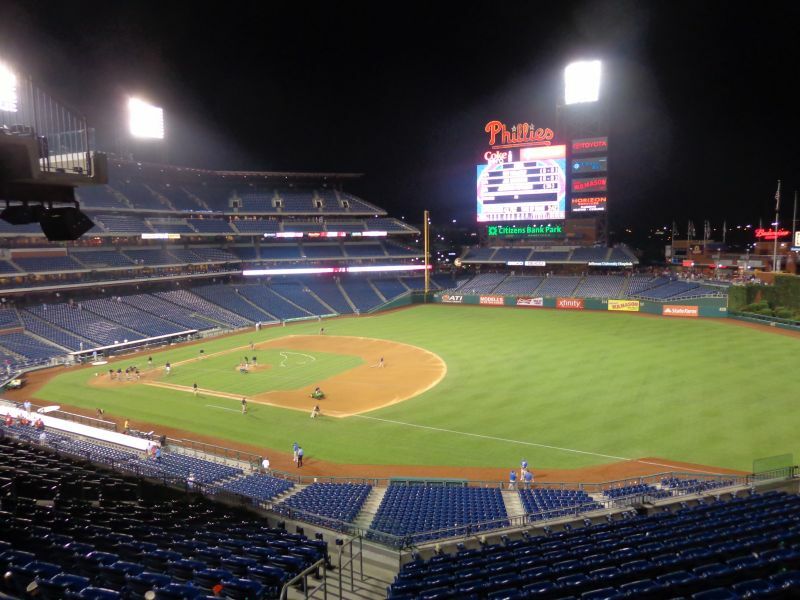 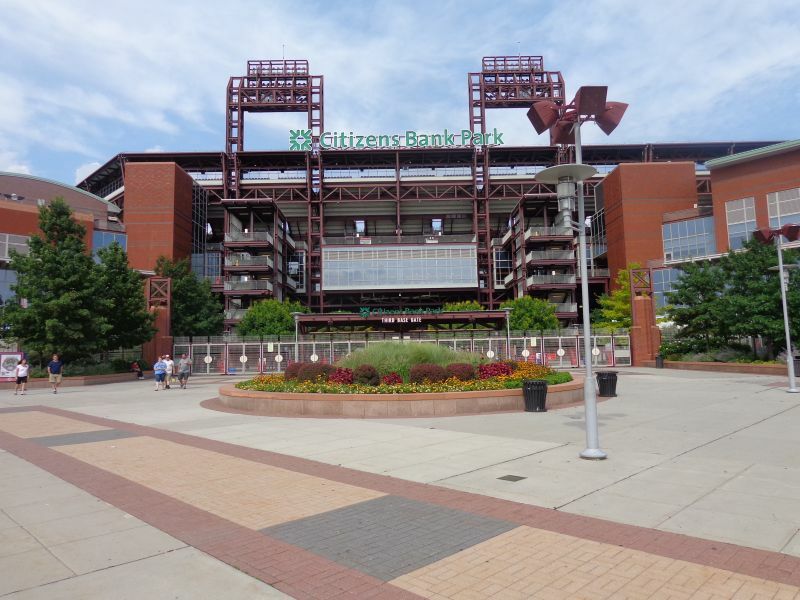 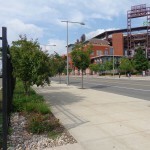 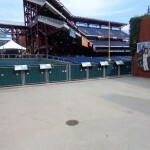 While urban parks were intended to revitalize decaying neighborhoods with new activity, Citizens Bank Park’s energy dissipates into empty spaces. 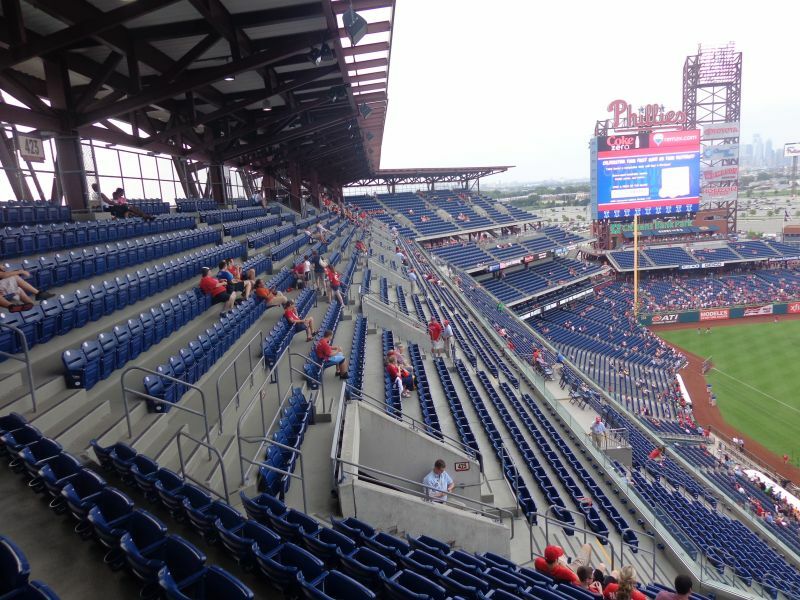 Despite sharp interior lines with fantastic balance and good interior design principles, there’s a certain vacuity to the whole picture, as the absence of anything beyond center field is palpable. 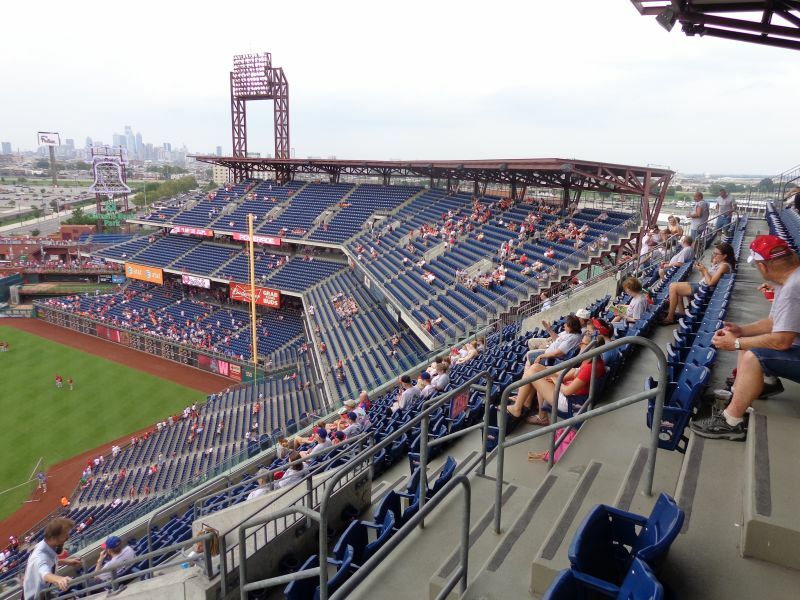 For a ballpark gazing out into miles of oblivion before reaching the cityscape, the interior aesthetics are as good as they could be, but can’t come close to matching parks in Pittsburgh, Baltimore, and a relatively large handful of others. 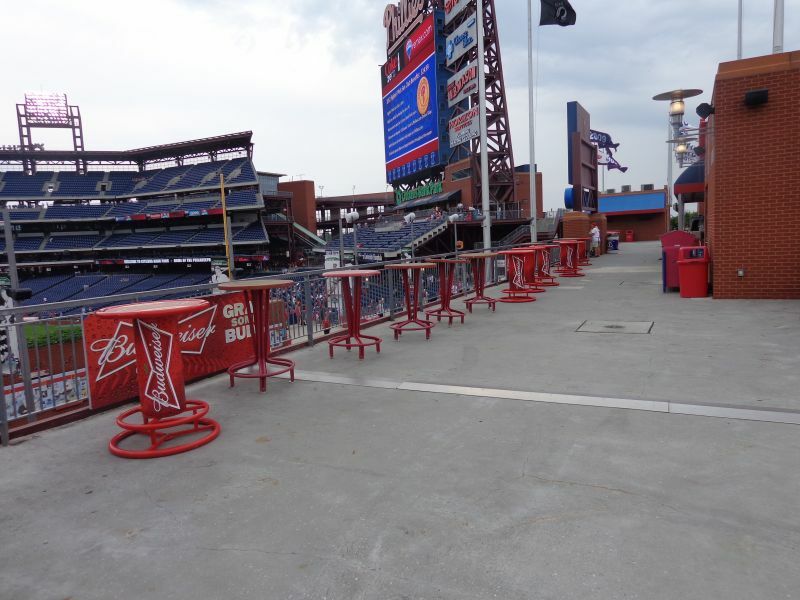 With these standards, the poor setting and the implications of that poor setting are simply too prominent for Citizens Bank Park to be a top 10 ballpark. 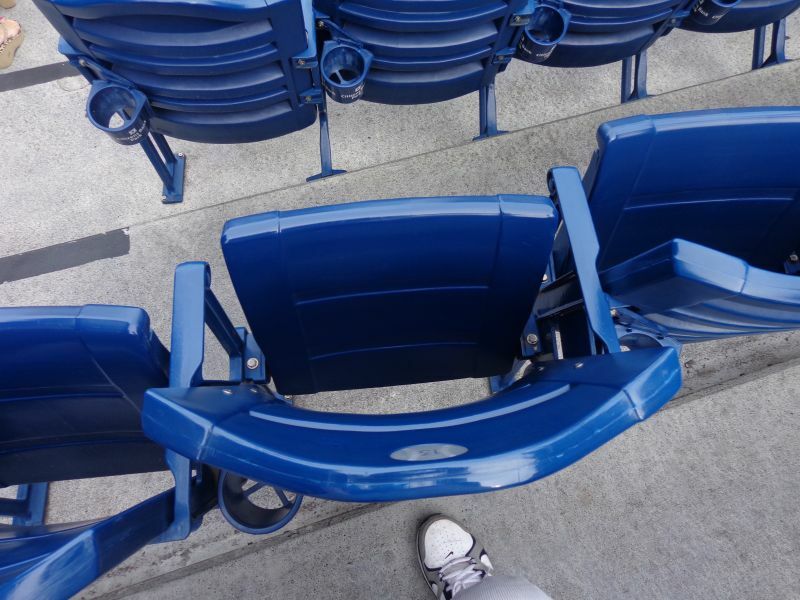 That shouldn’t take away from what has been done here, however. 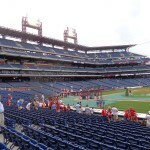 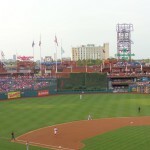 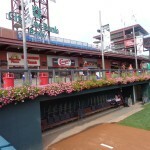 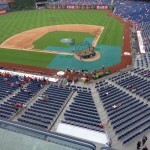 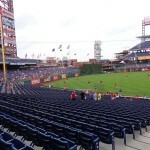 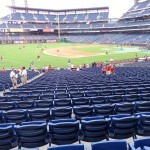 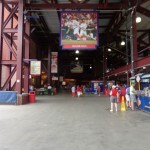 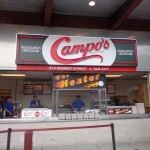 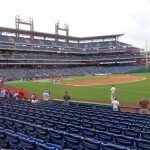 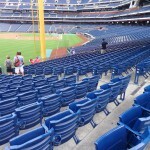 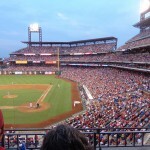 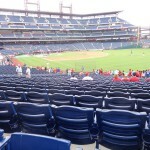 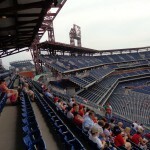 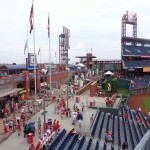 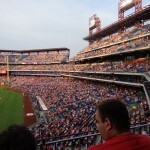 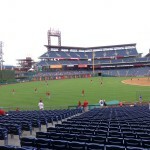 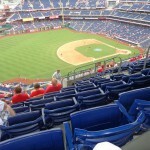 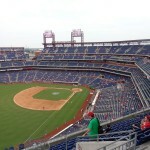 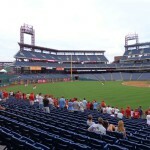 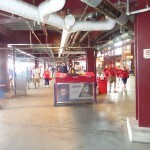 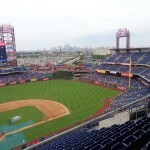 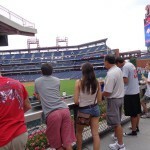 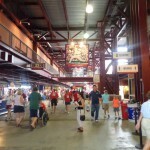 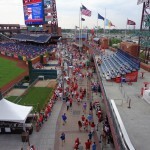 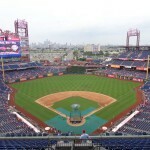 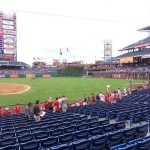 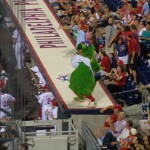 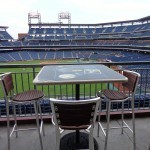 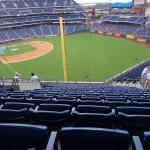 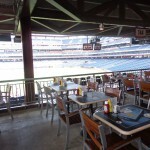 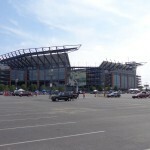 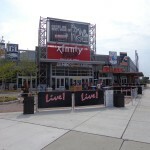 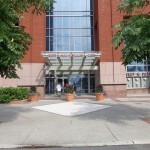 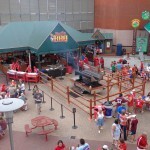 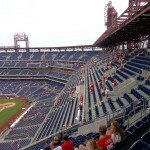 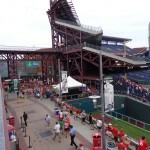 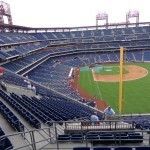 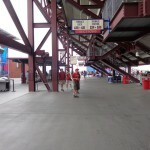 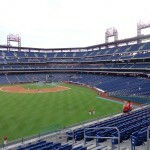 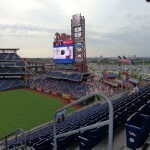 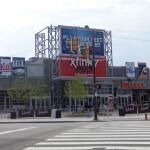 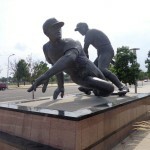 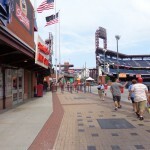 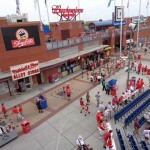 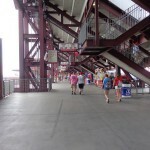 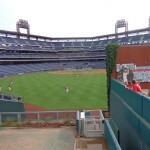 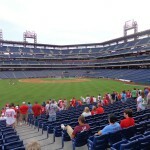 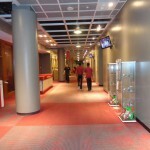 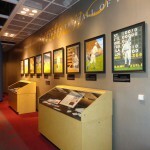 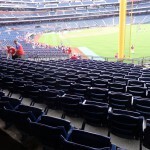 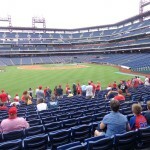 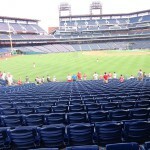 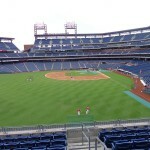 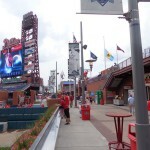 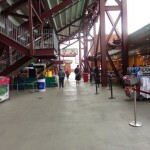 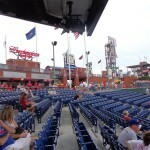 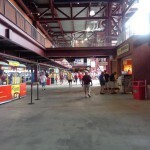 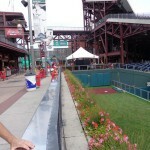 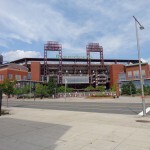 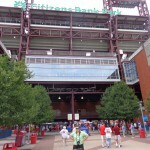 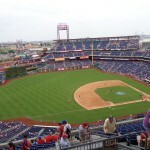 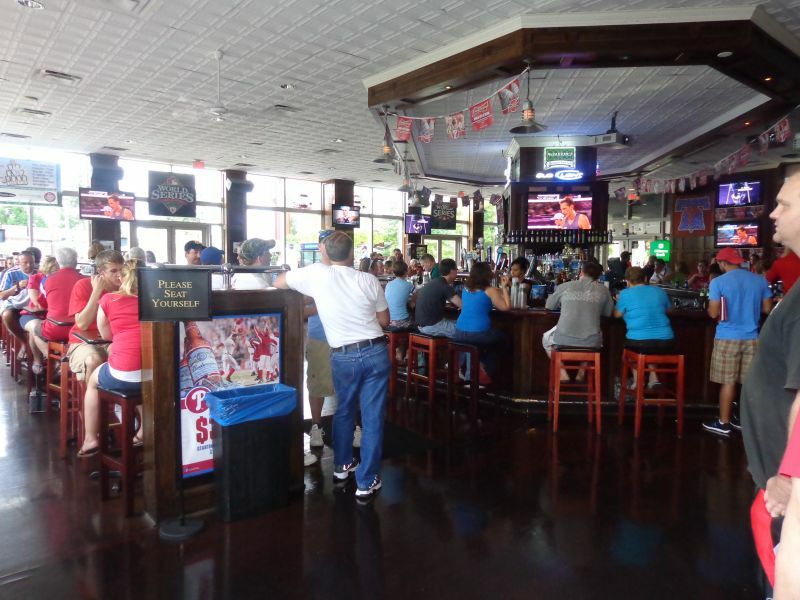 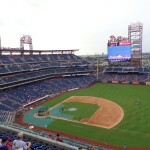 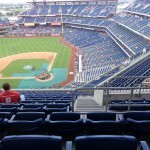 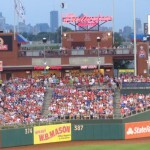 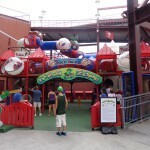 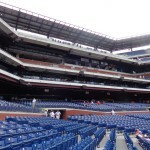 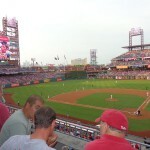 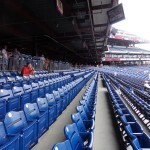 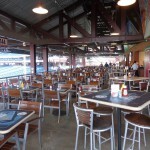 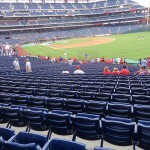 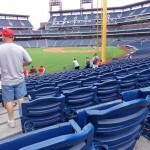 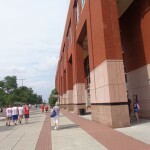 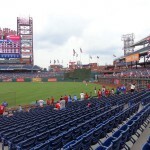 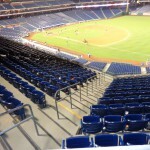 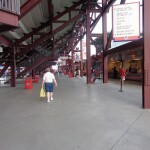 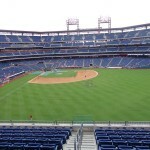 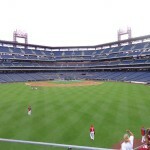 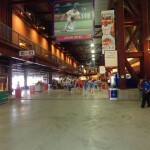 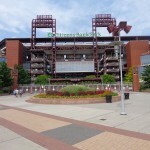 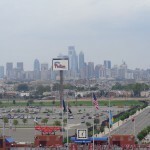 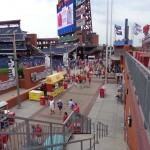 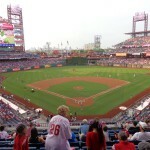 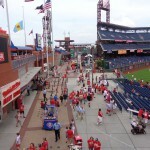 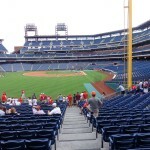 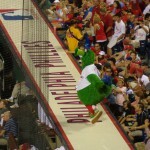 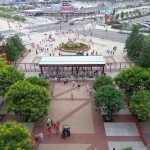 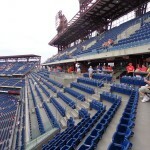 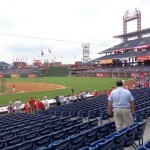 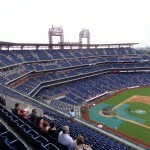 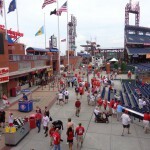 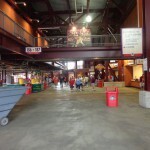 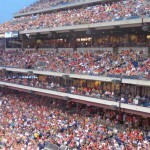 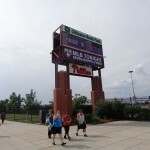 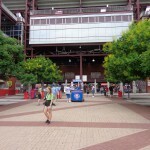 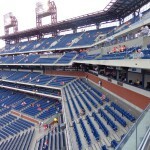 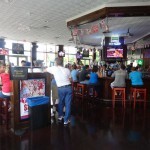 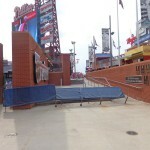 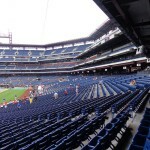 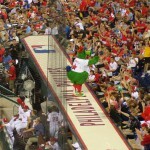 The Phillies had the challenge of making this place function as a self-contained destination, and succeeded masterfully. 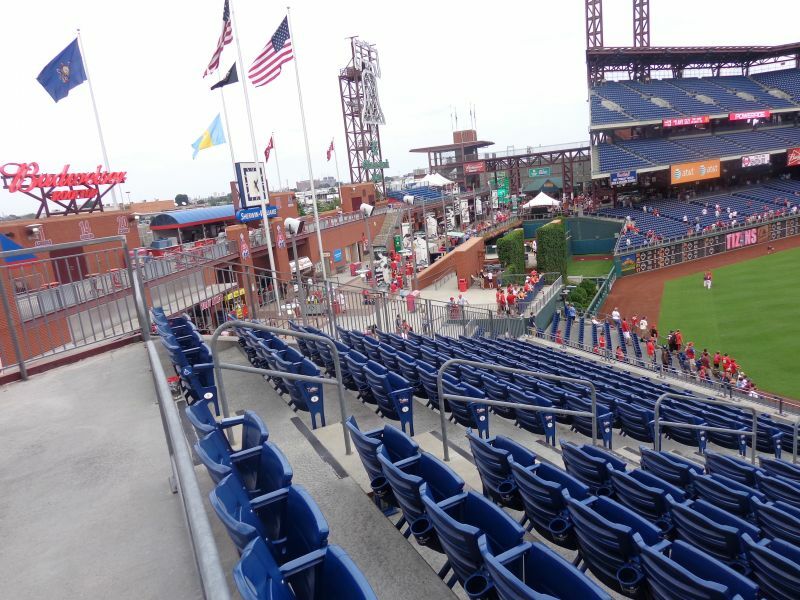 As I’ve mentioned in other reviews, Citizens Bank Park is the best a suburban park with both a poor location and below average local scene could be. 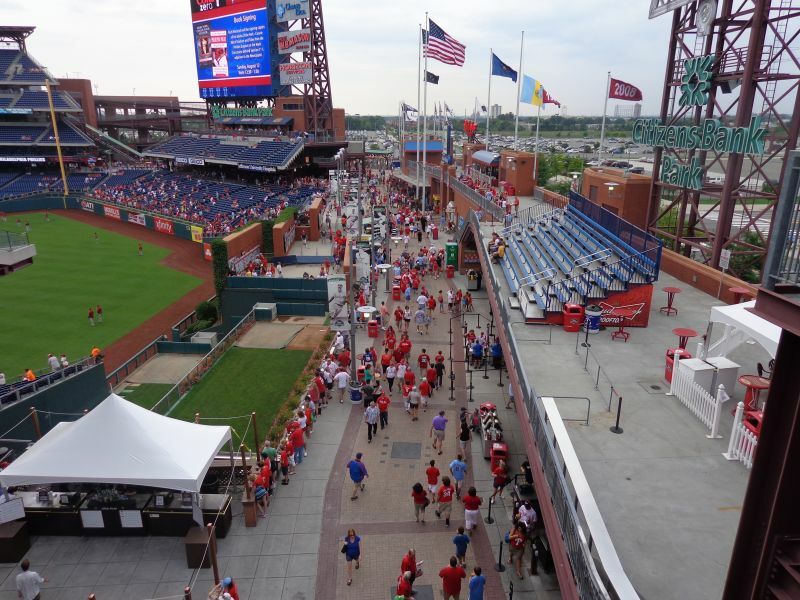 While older parks like Comerica Park (Detroit) and Safeco Field (Seattle) featured standing-room only areas, Citizens Bank Park was the first major league ballpark that really invited fans to walk around and enjoy the game from multiple vantage points. 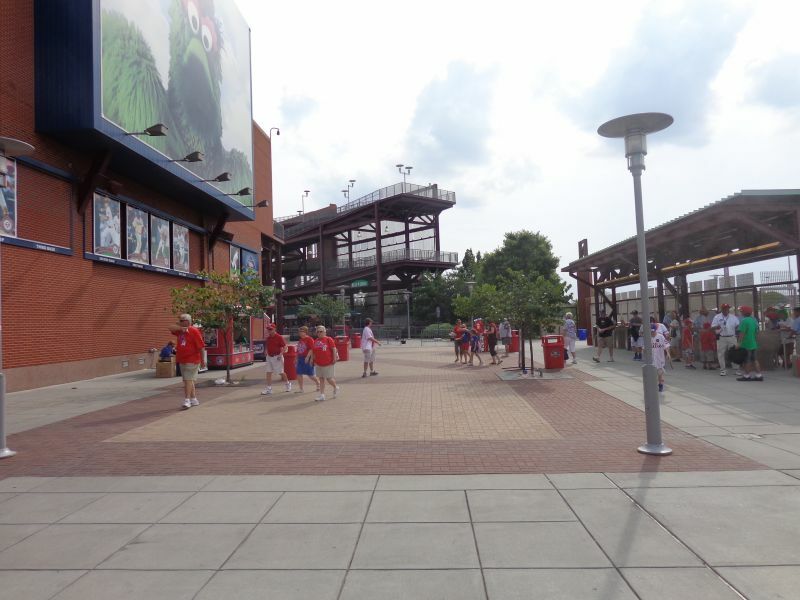 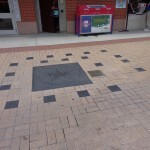 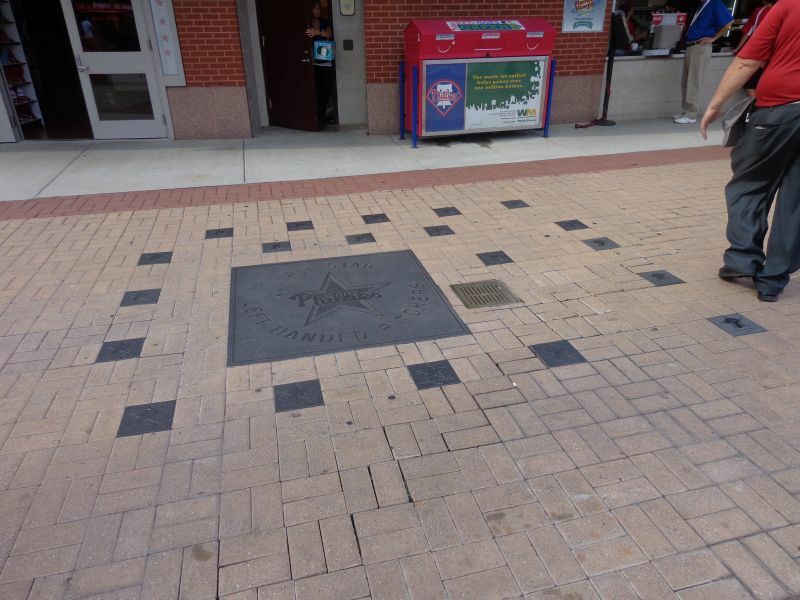 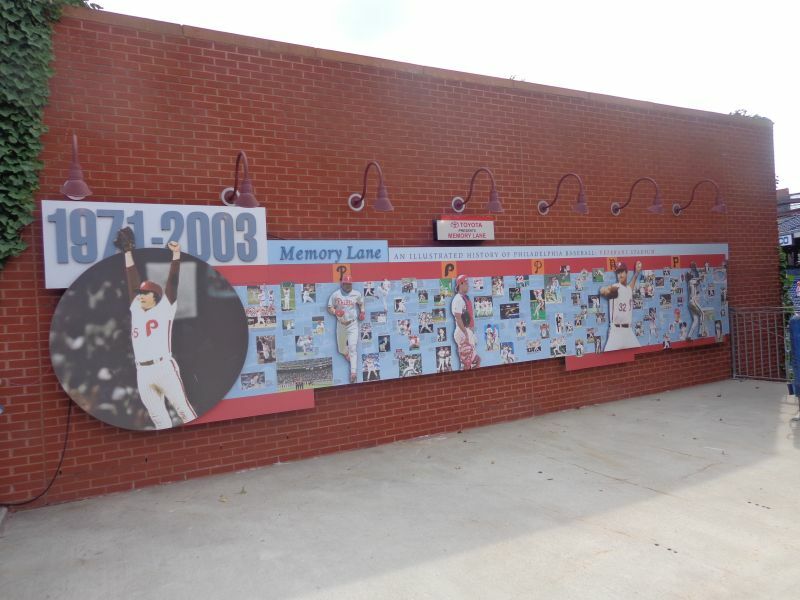 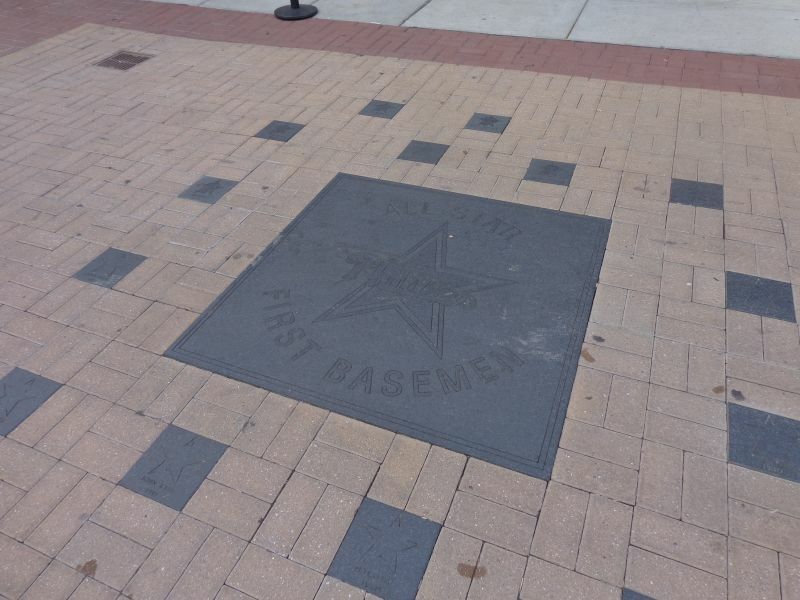 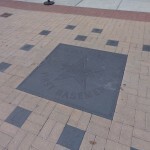 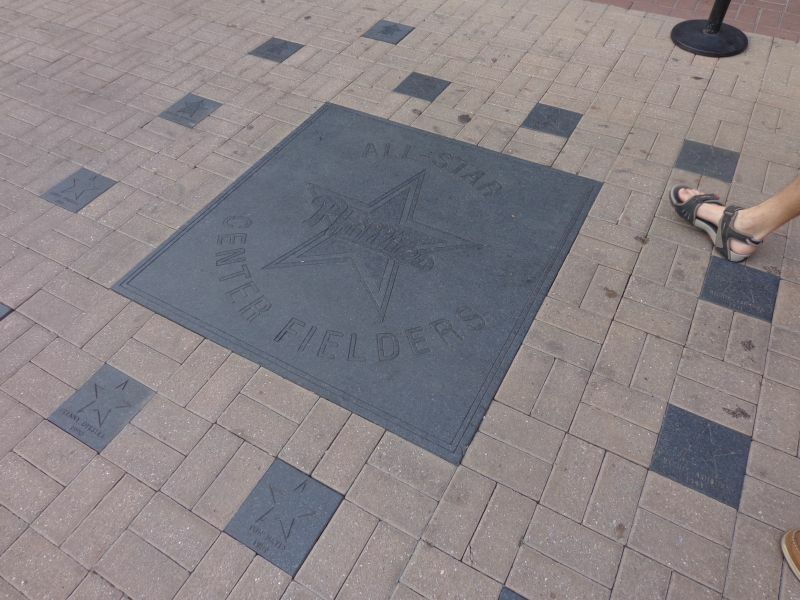 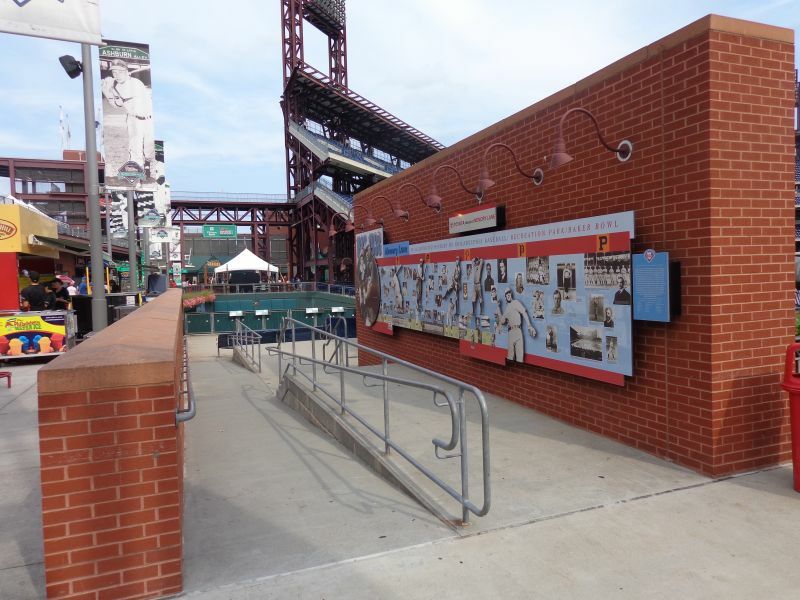 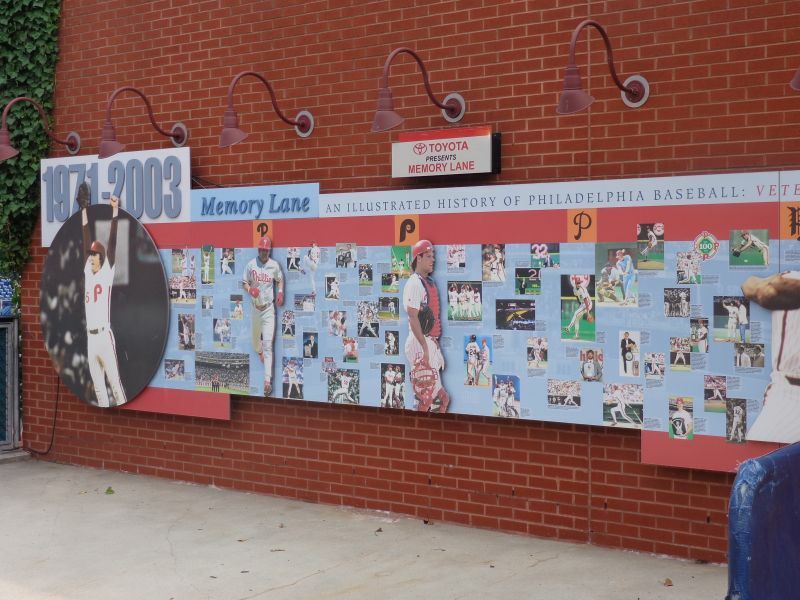 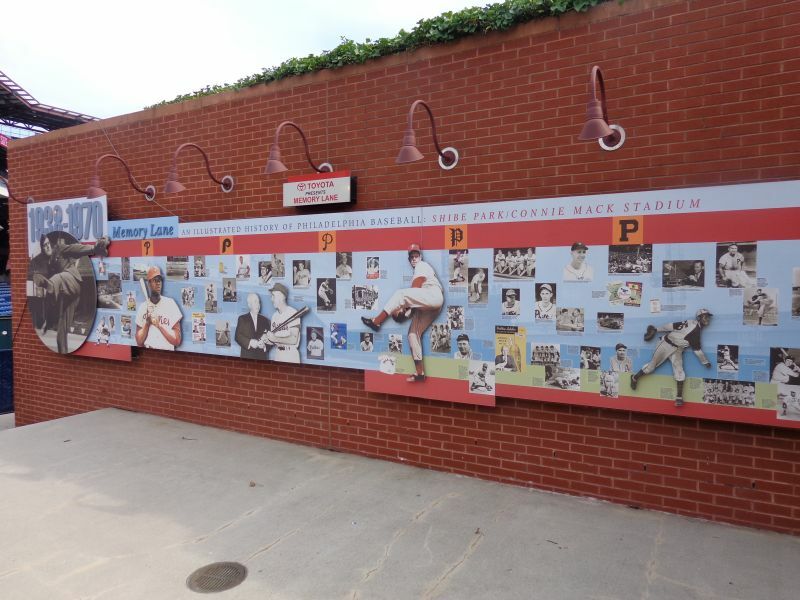 In the current era where “walkability” and “selfie spots” are key, the Phillies’ park was ahead of its time. 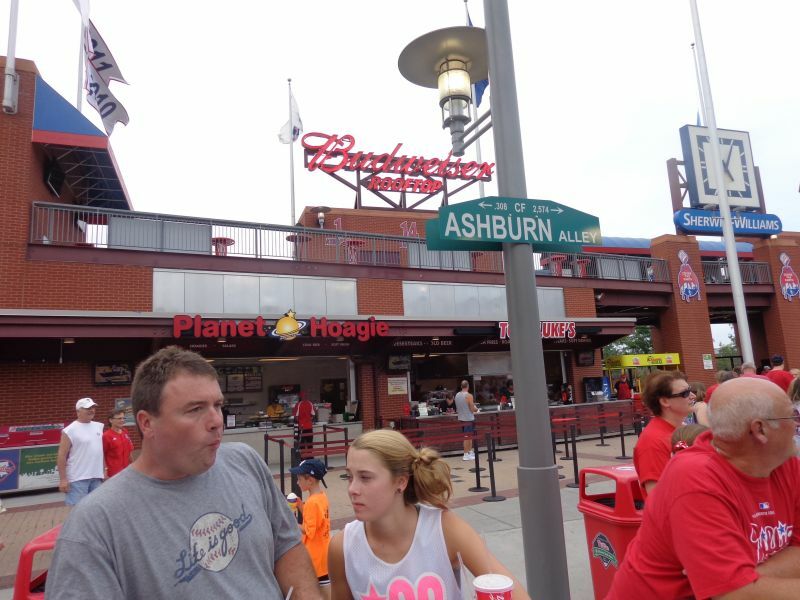 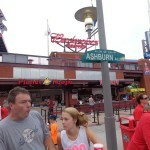 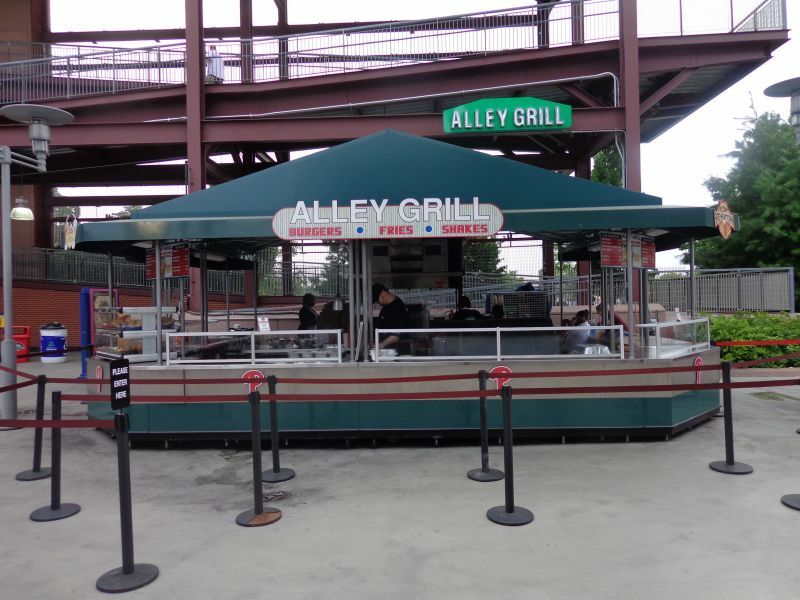 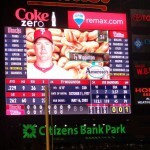 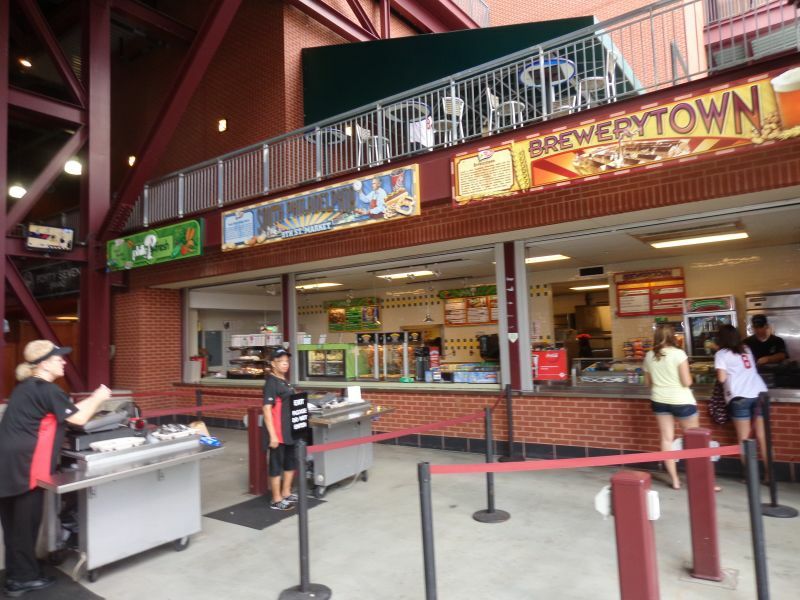 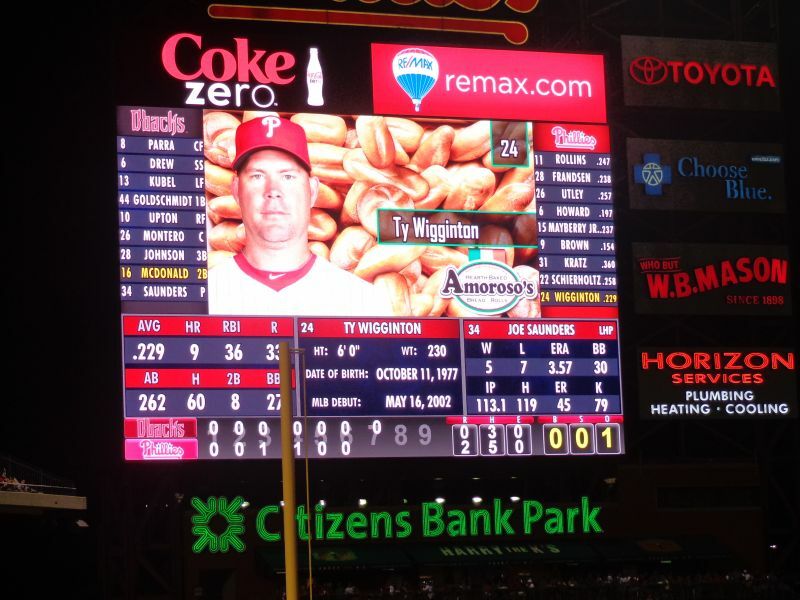 Citizens Bank Park arguably has the best concourses in baseball, anchored by the magnificent Ashburn Alley. 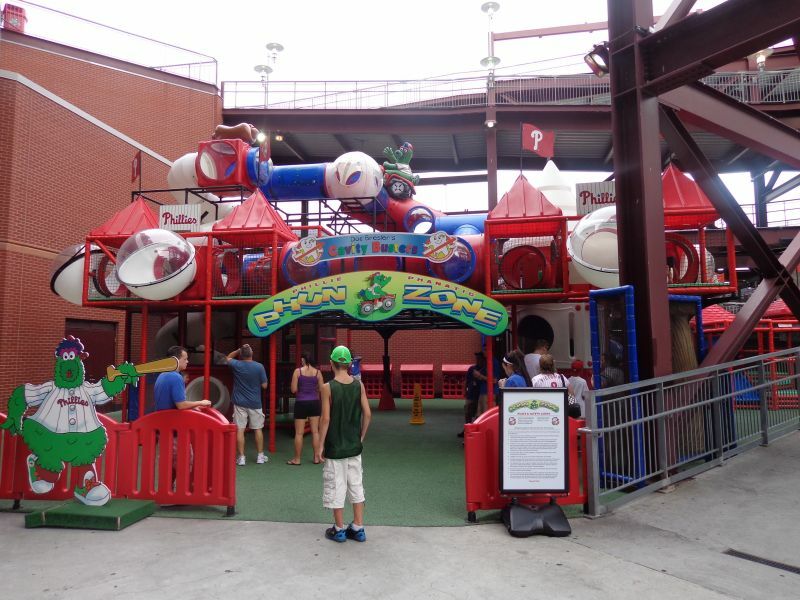 Local eateries, fun kids’ games, numerous historical references, and fantastically designed standing room only areas are packed into this fan friendly space. 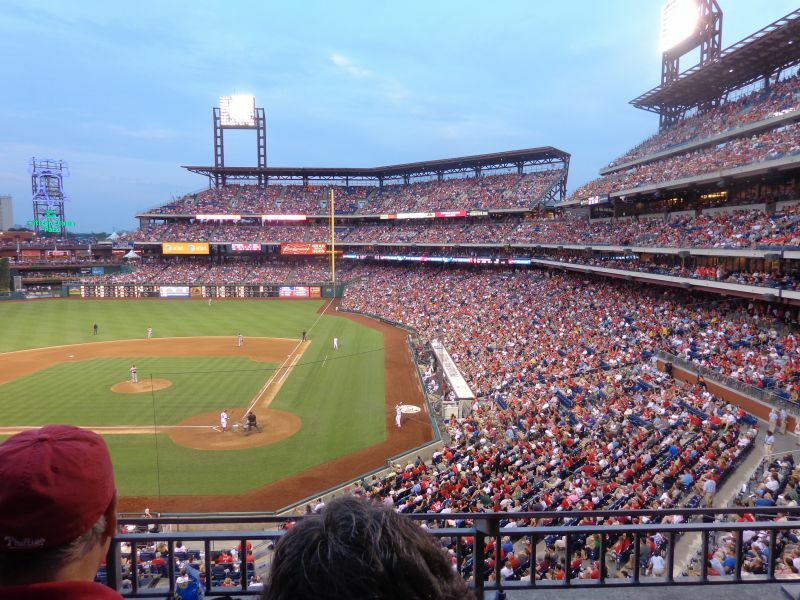 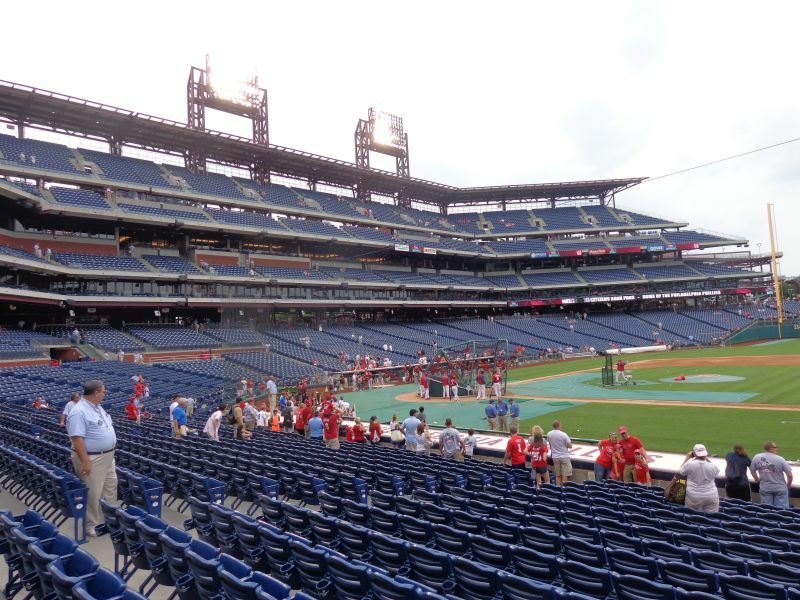 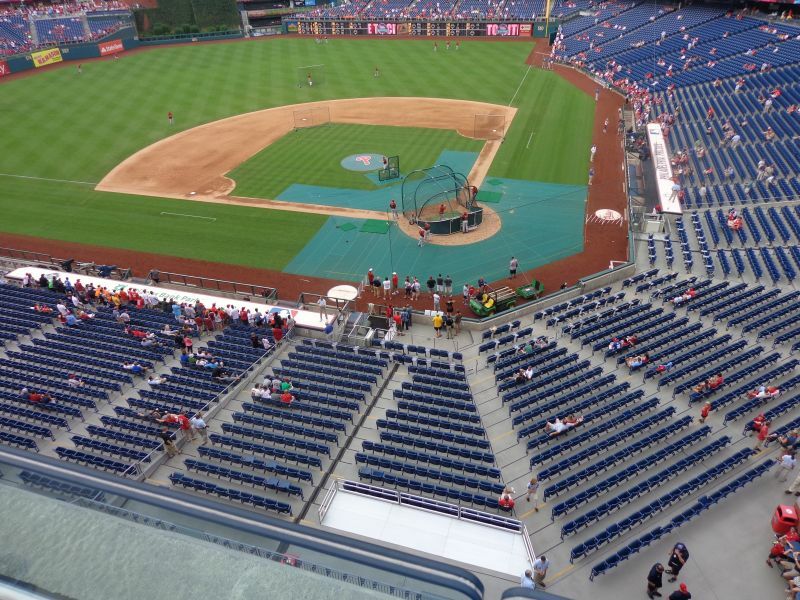 Functionally, Citizens Bank Park is still one of the best in baseball. 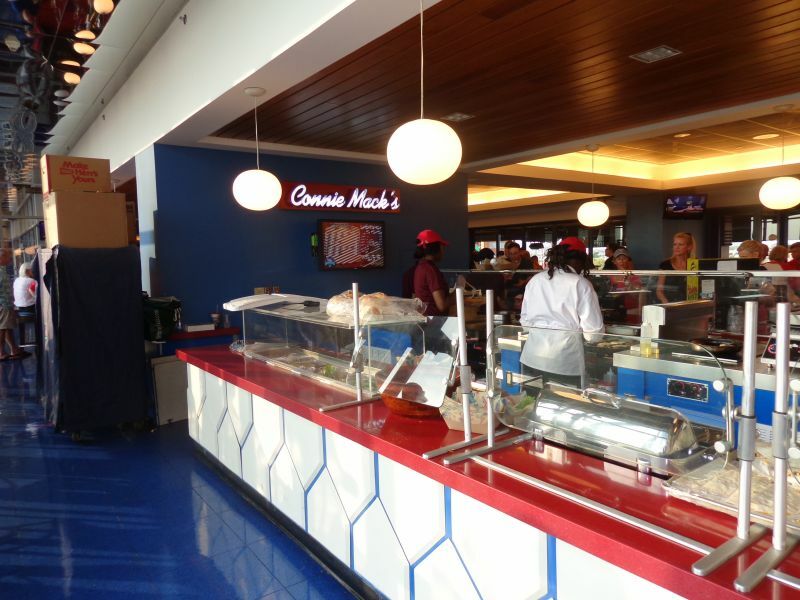 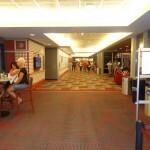 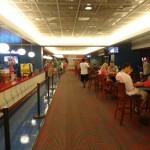 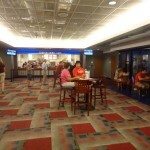 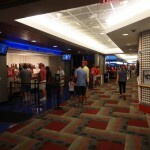 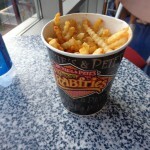 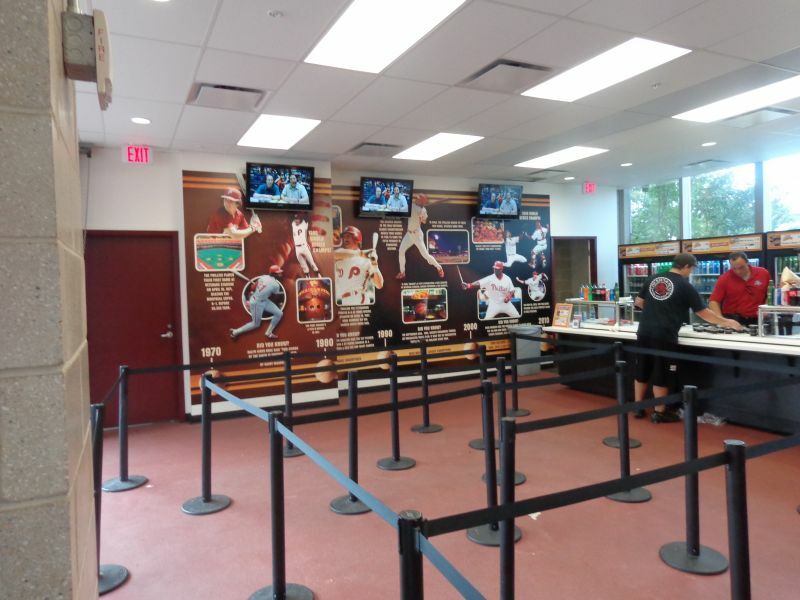 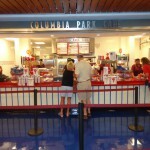 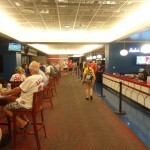 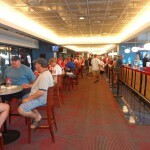 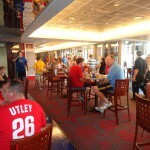 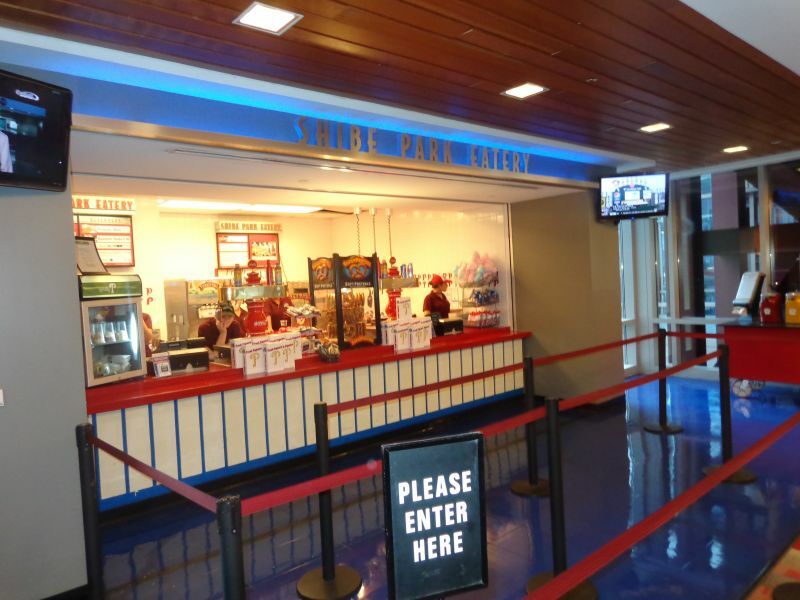 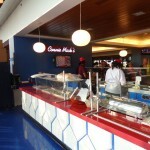 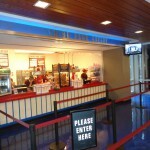 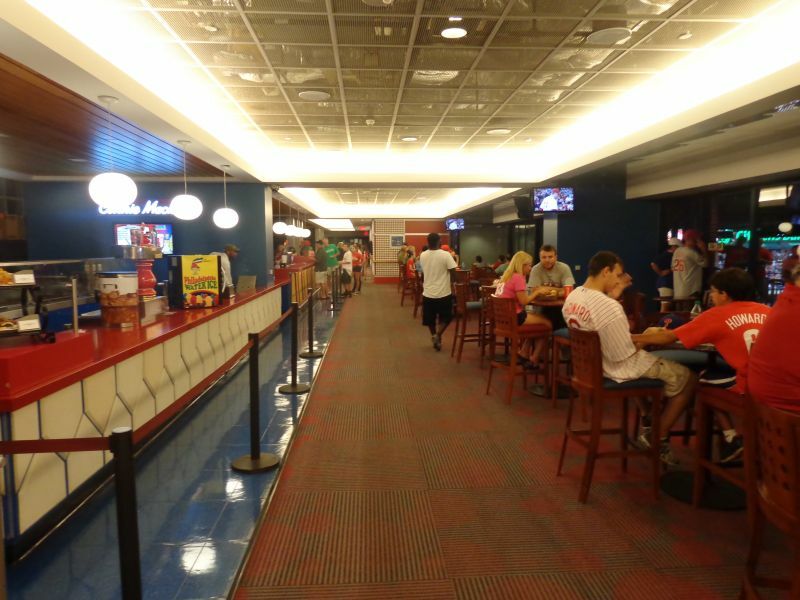 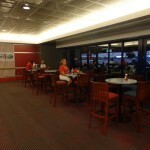 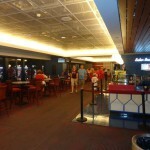 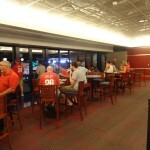 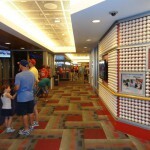 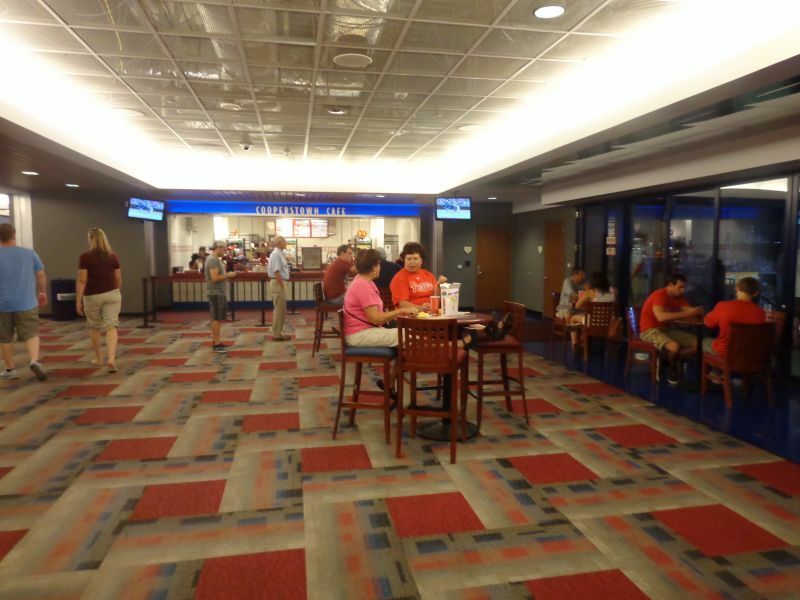 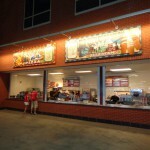 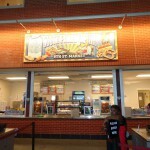 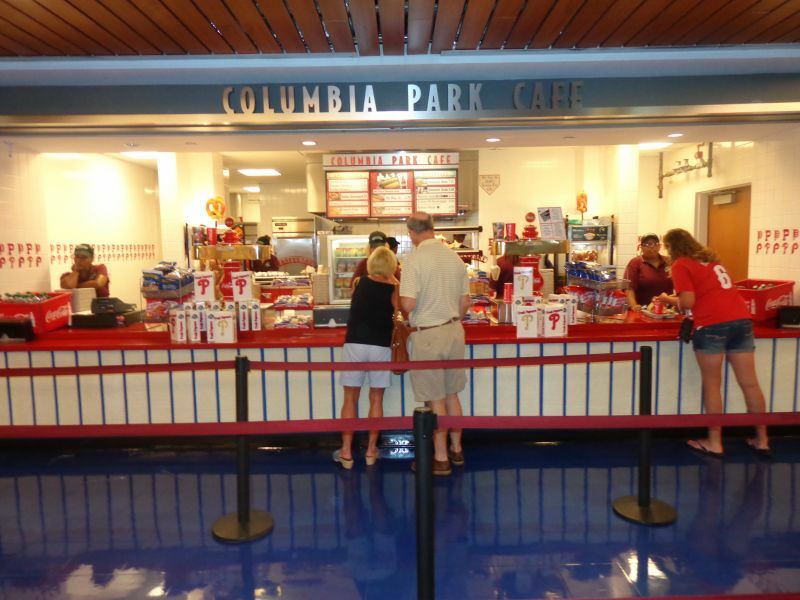 While subsequent ballparks emulated them, Citizens Bank Park has the best concourses in baseball. 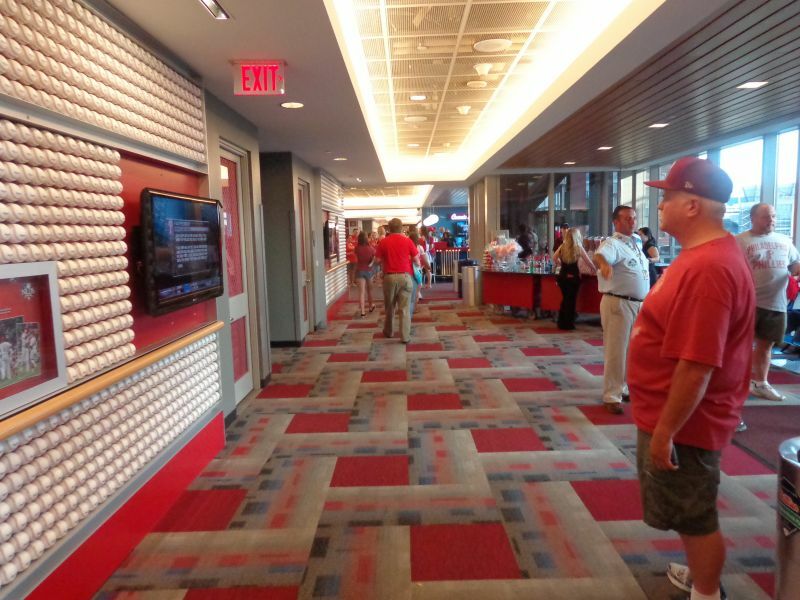 The theme of openness is emphasized throughout the wide 360-degree system, as your view of the field is almost never obstructed. 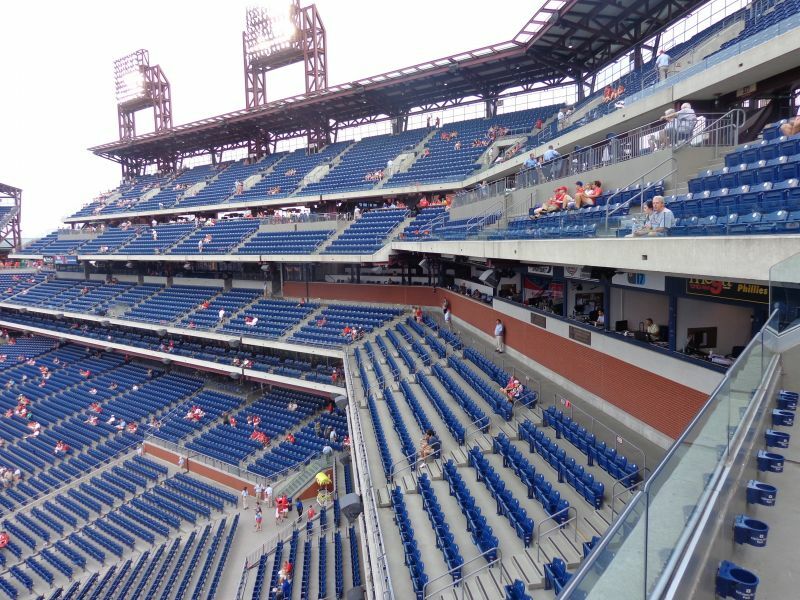 At similar parks, the view from the main concourse may be obstructed by clubs, suites, or press boxes behind home plate, but not here. 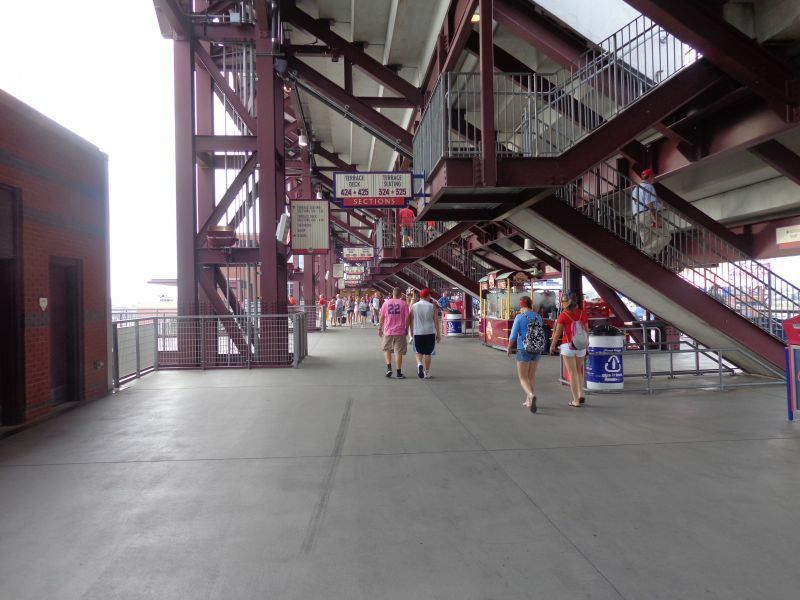 Citizens Bank Park also pioneered the idea of open concourses in the upper deck, ensuring fans hanging out in the nosebleeds would also never lose sight of the game (at least in theory). 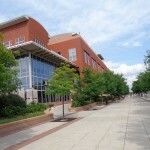 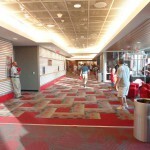 Concourses are open on all three levels. 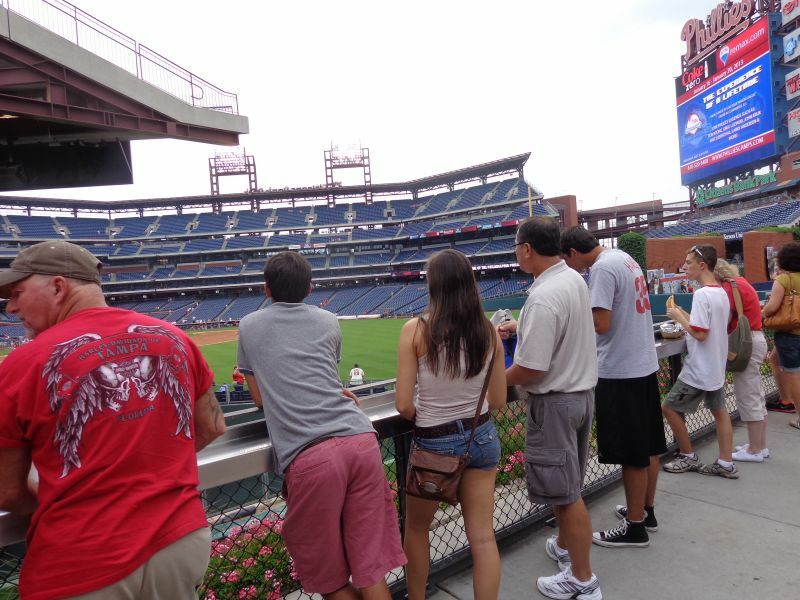 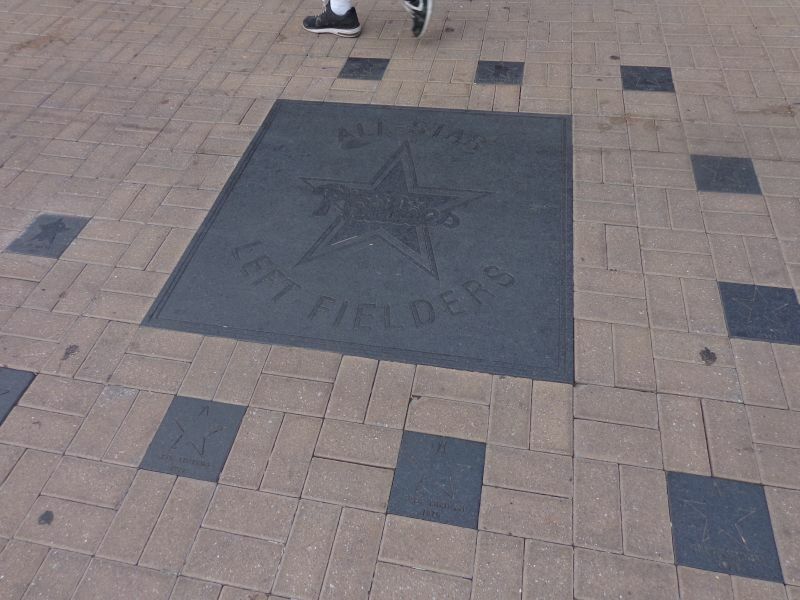 There are so many wonderful places to stand around the ballpark. 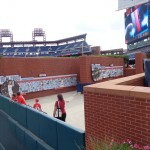 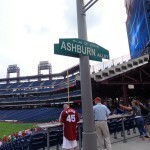 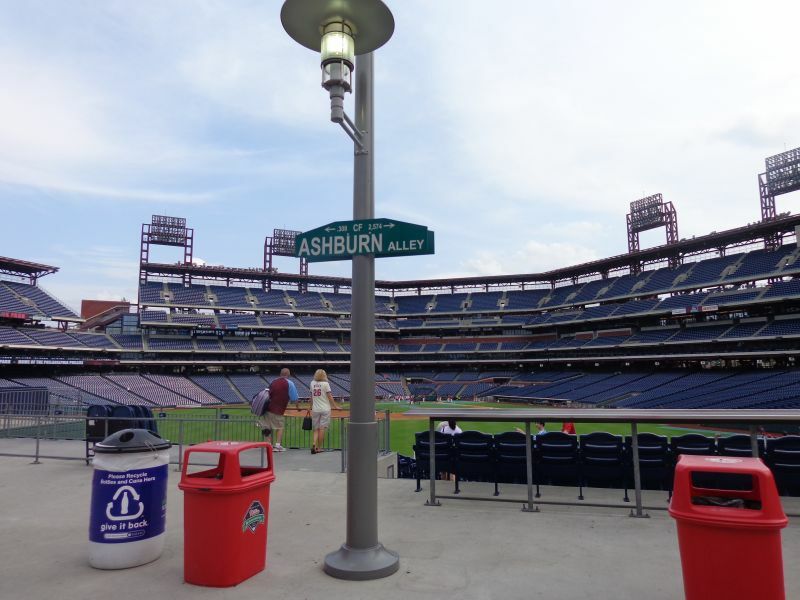 The Phillies’ vision of openness culminates in Ashburn Alley, the center field concourse. 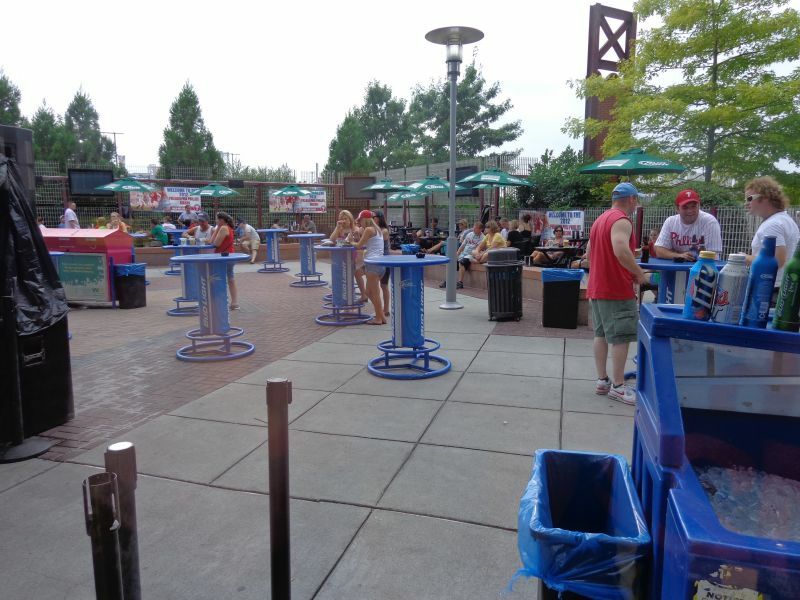 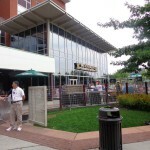 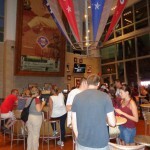 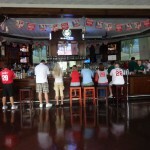 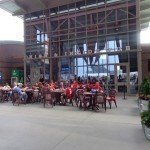 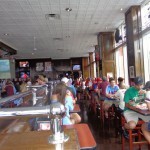 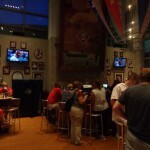 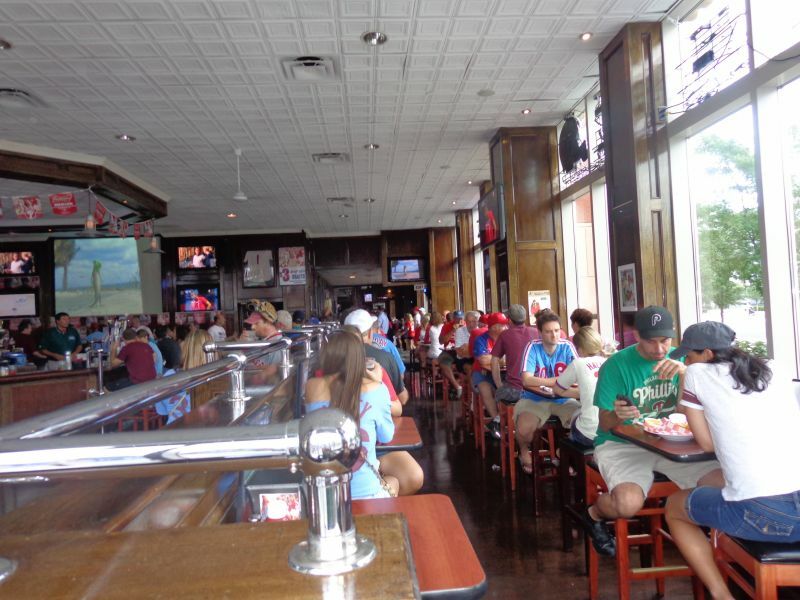 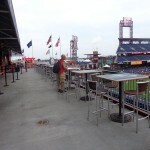 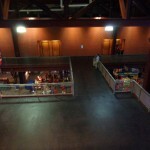 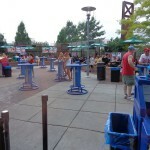 Featuring multiple tiers of standing-room only areas, prime bullpen views, local foods, historical references, and kids’ entertainment, you could argue this was major league baseball’s first “social space.” However, “social spaces” have come to mean destination bars (I’d like to see the Phillies add this on the rooftop area). 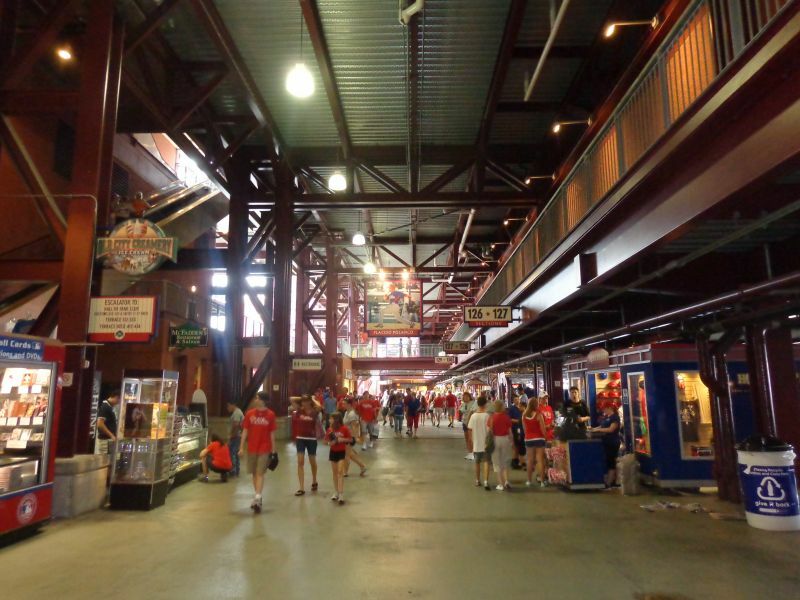 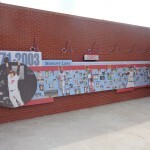 Ashburn Alley also popularized the concept of ballpark “outfield experiences” that open before the other gates. 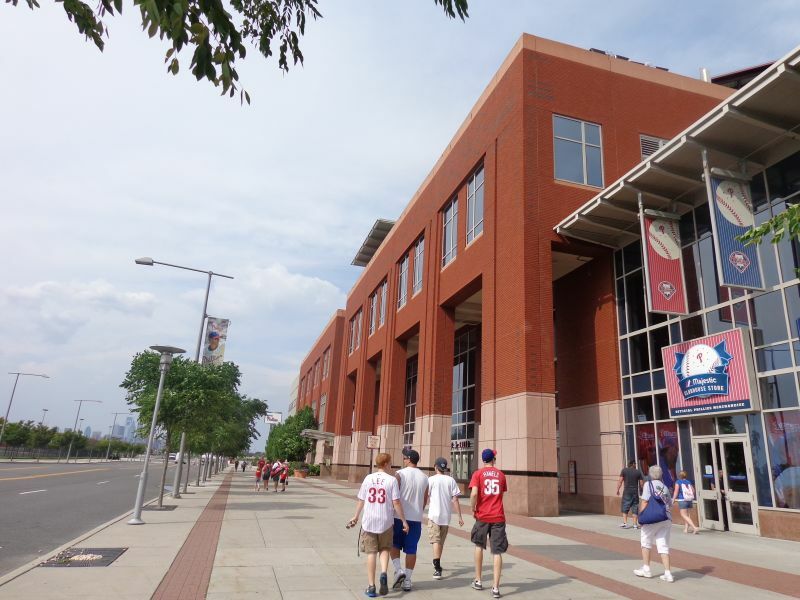 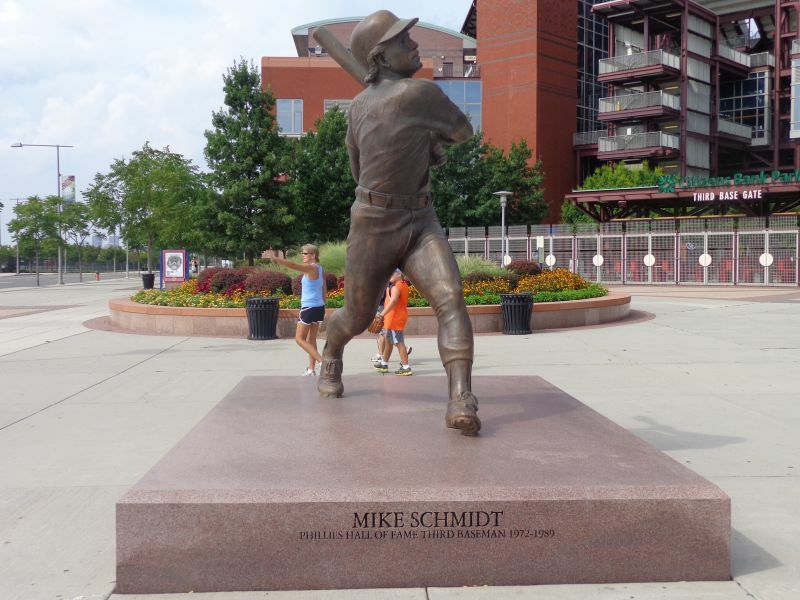 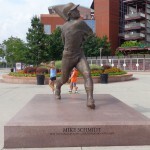 Architects like Craig Schmidt at EwingCole were among the first to understand that baseball’s leisurely pace with delays and in-between inning breaks required other ballpark features to pacify younger fans looking for instant gratification. 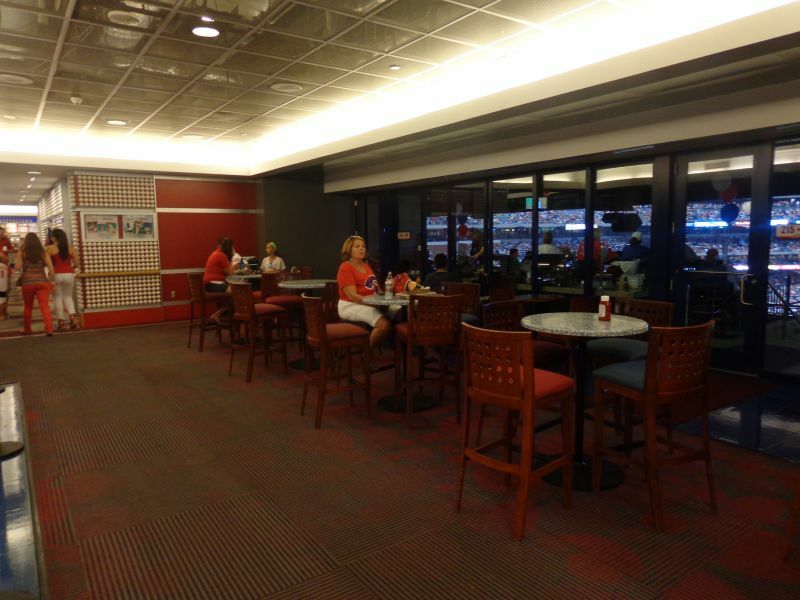 While you can still keep track of the game, social spaces would be vital for filling these stops in play. 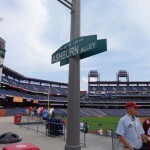 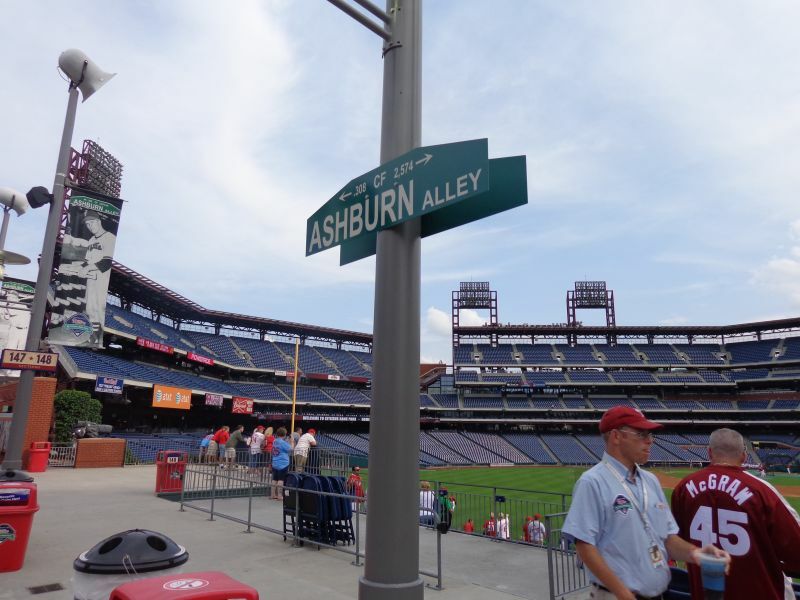 “The whole group that enjoys hanging out on Ashburn Alley; those people didn’t come to the Vet,” Phillies president Dave Montgomery said in 2010. 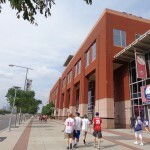 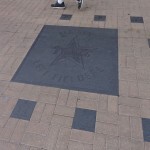 “We were dependent on hard-core fans there and families. 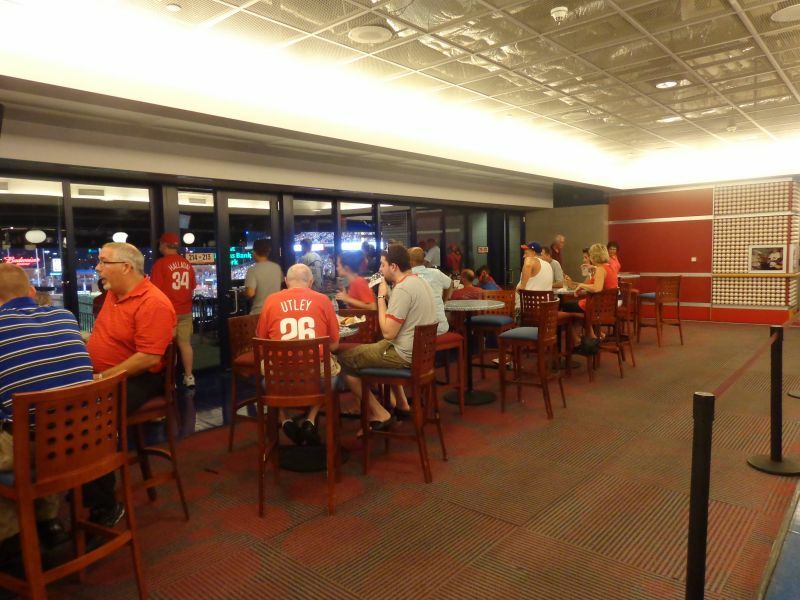 Now we’re benefiting from that 18-to-32 age group.” Similar outfield gathering spaces have been copied at most subsequent ballparks. 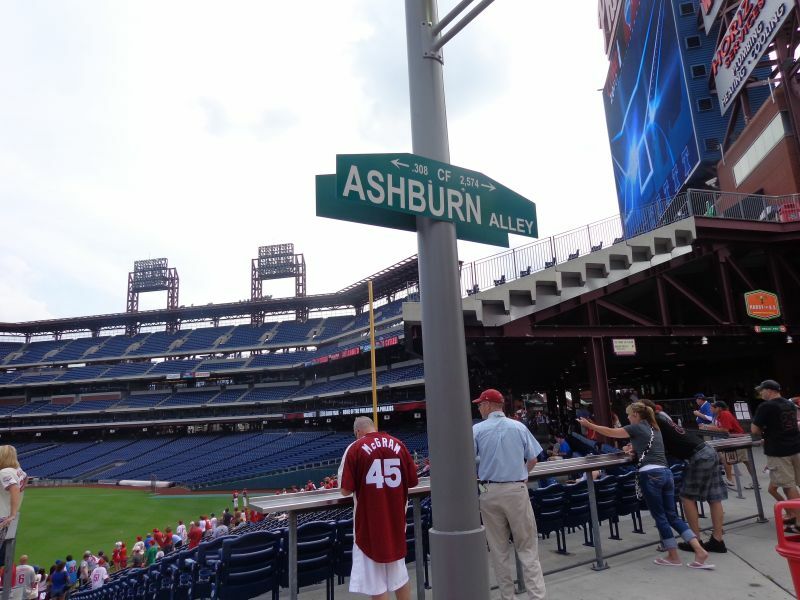 While often not replicated as successfully (for reasons that escape me), Ashburn Alley is the most influential ballpark feature of the century. 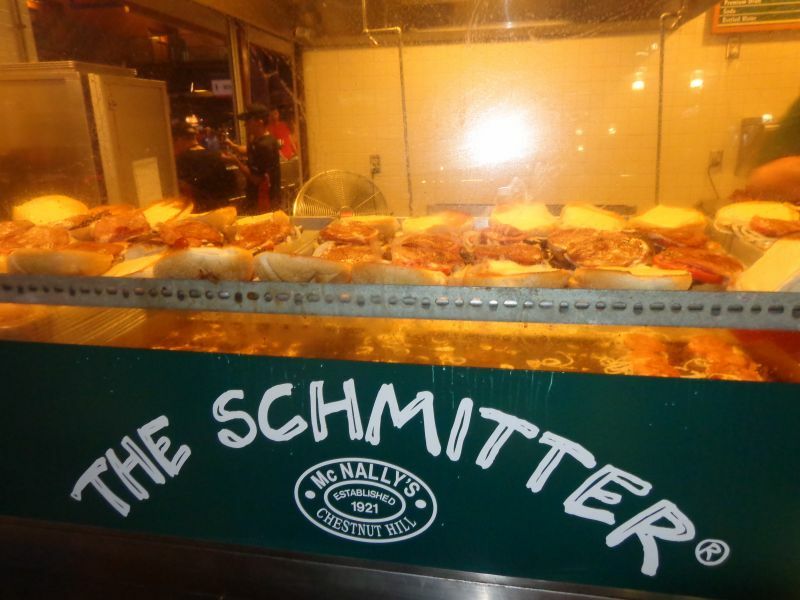 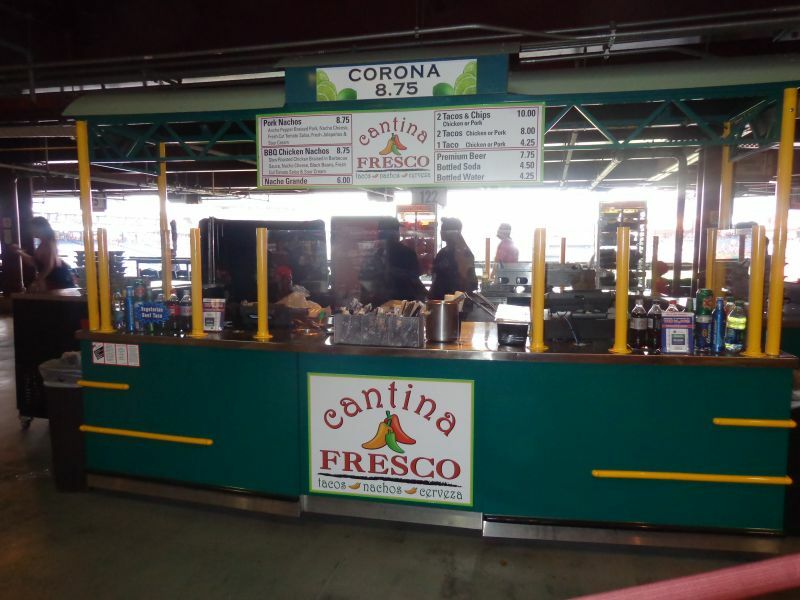 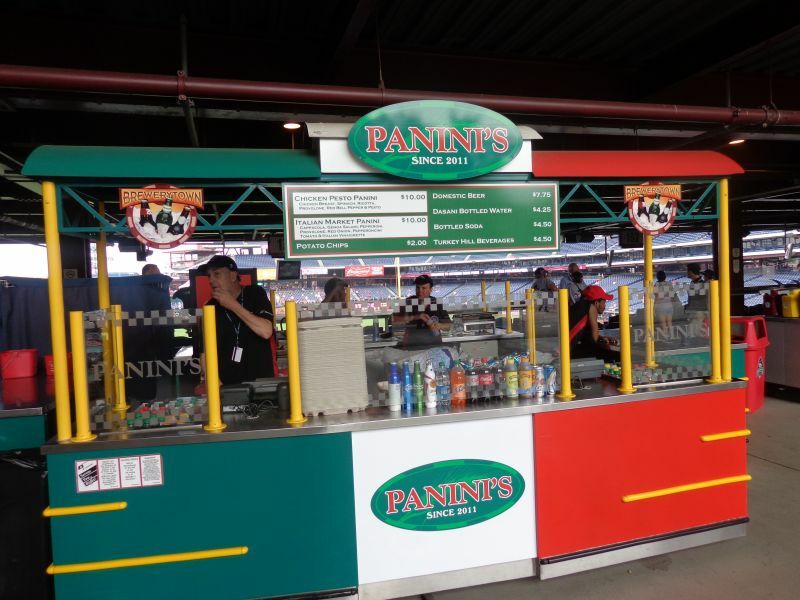 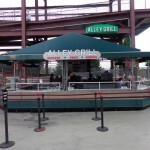 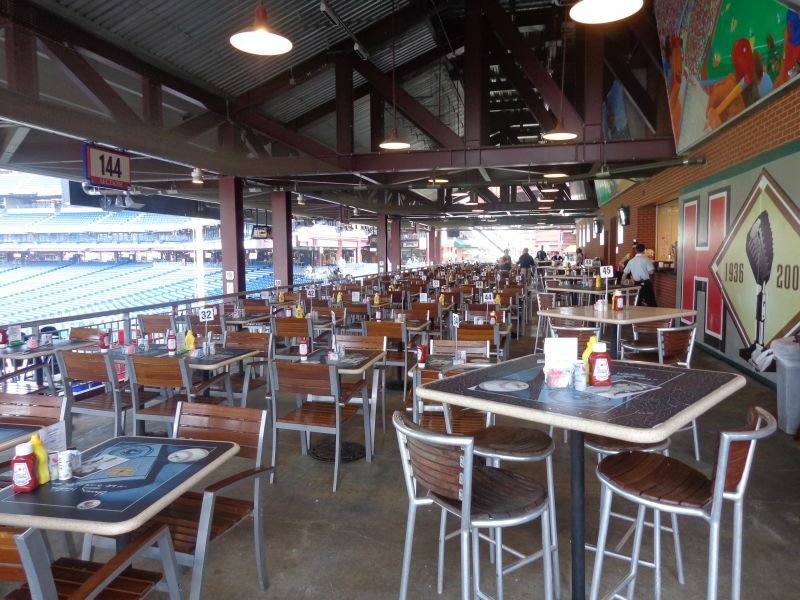 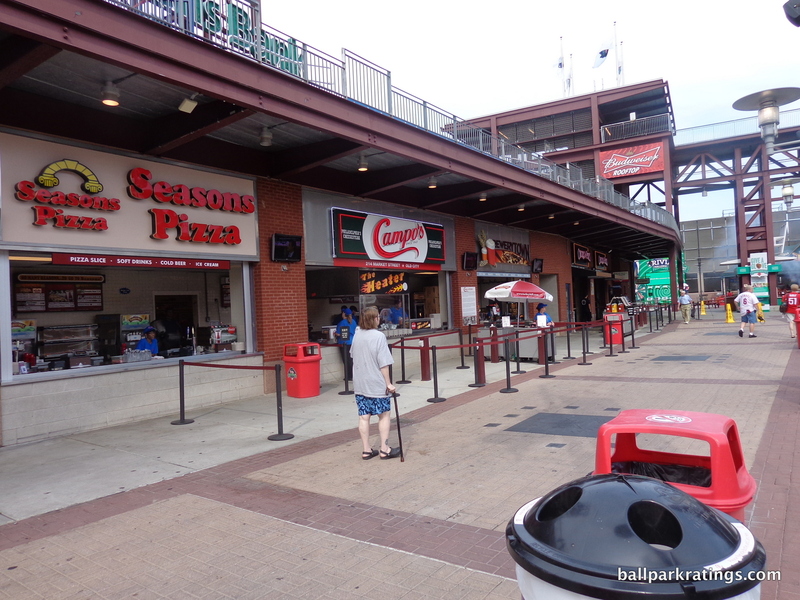 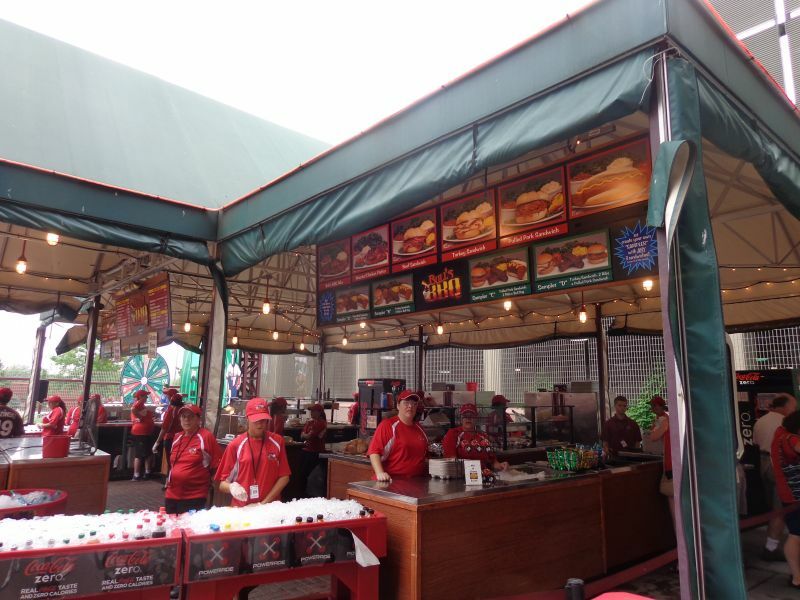 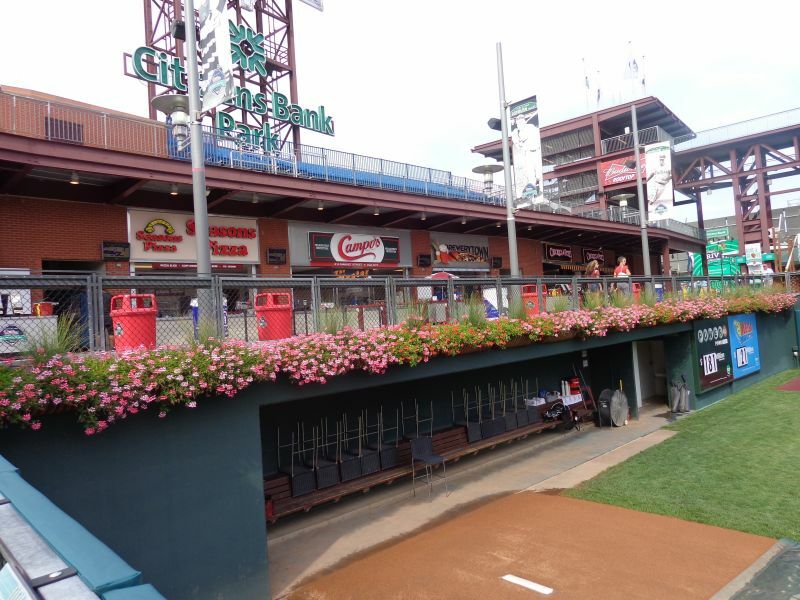 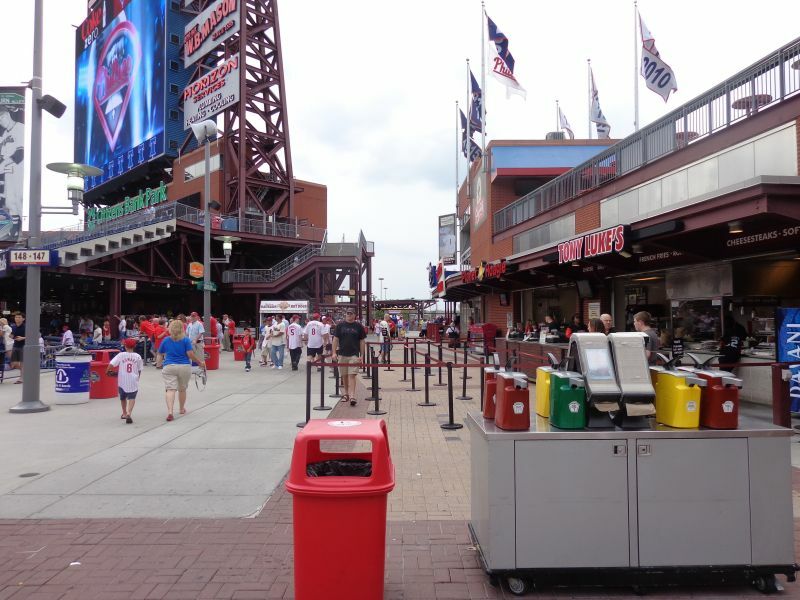 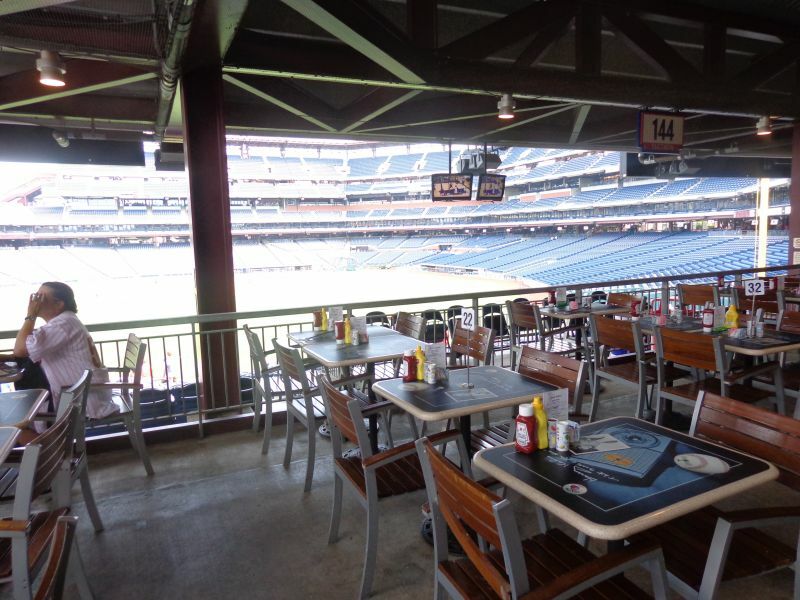 While the Giants’ AT&T Park brought stadium food to an entirely new level, Citizens Bank Park was the first to stress multiple high quality local restaurants and concessionaires within a major league ballpark. 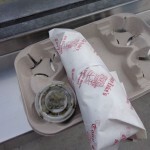 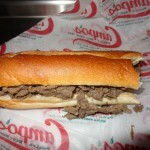 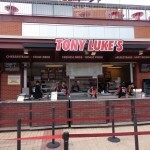 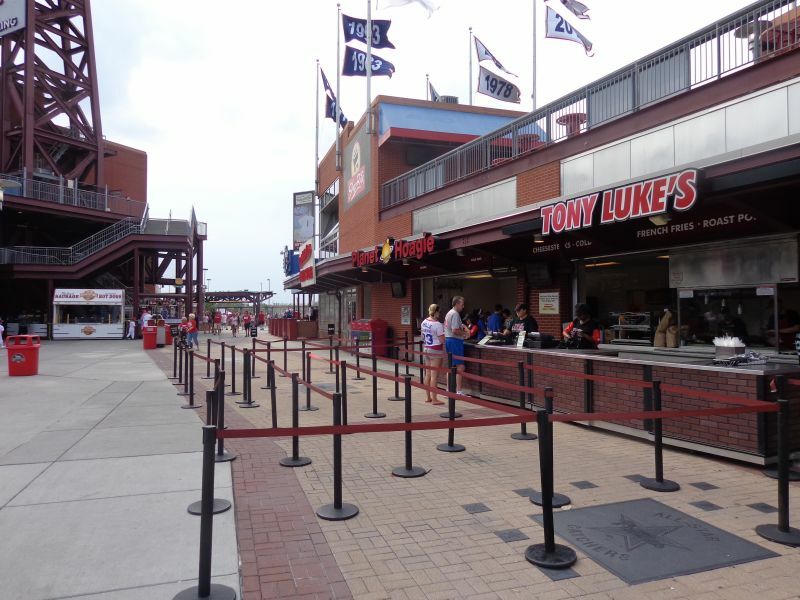 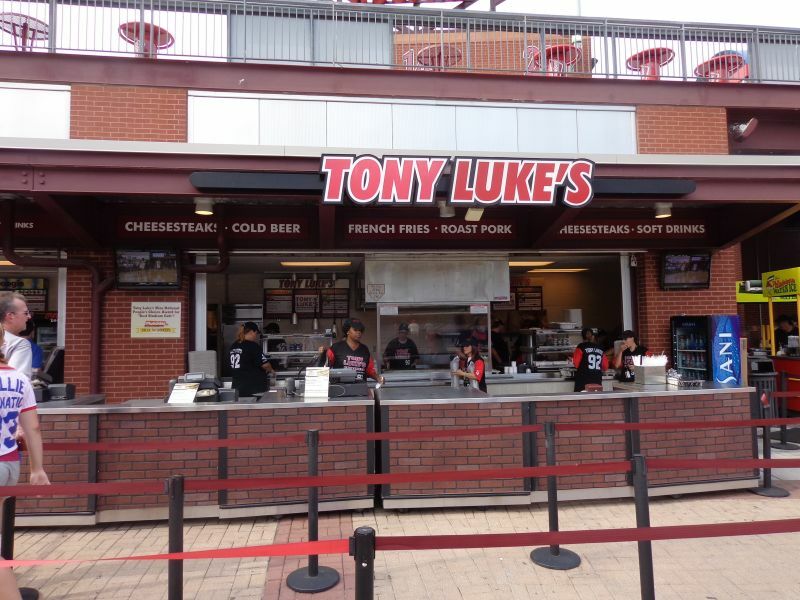 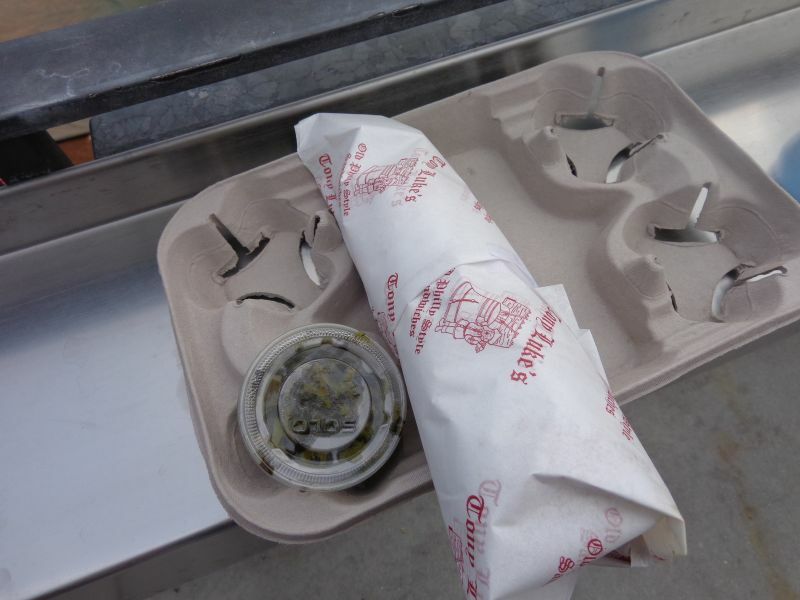 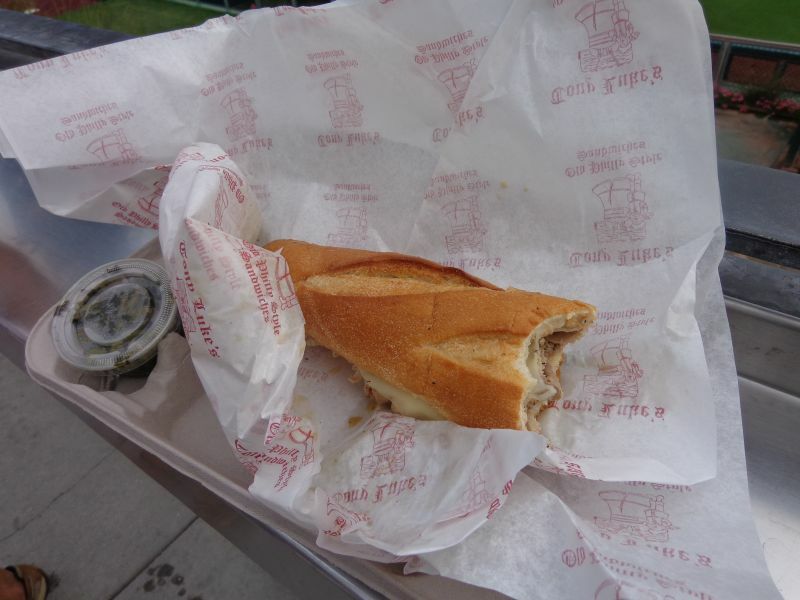 Tony Luke’s remains the most memorable staple. 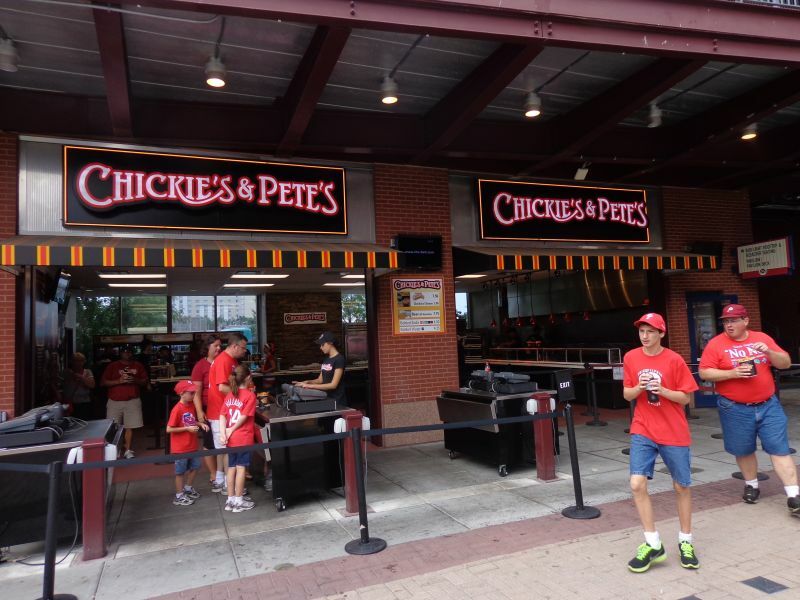 Almost every ballpark today tries to showcase a local eatery, not just a regional concession item, with the trend really accelerating this decade. 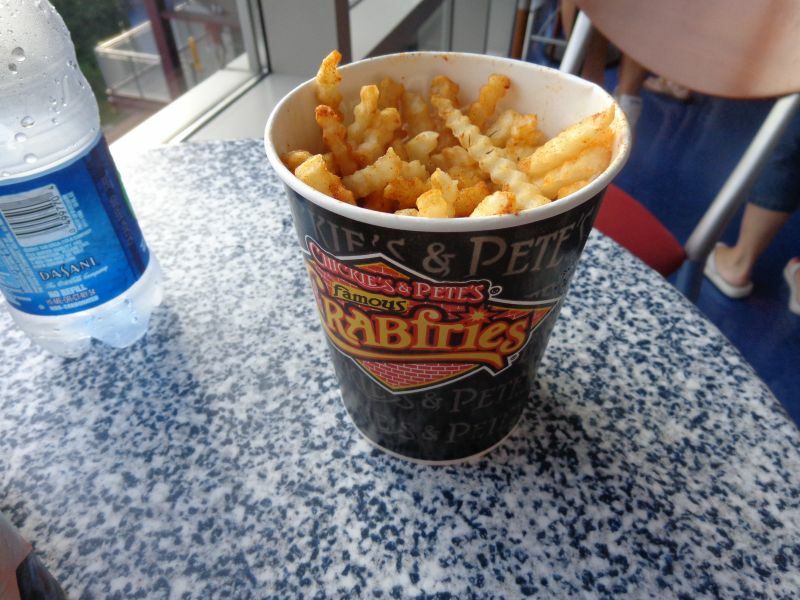 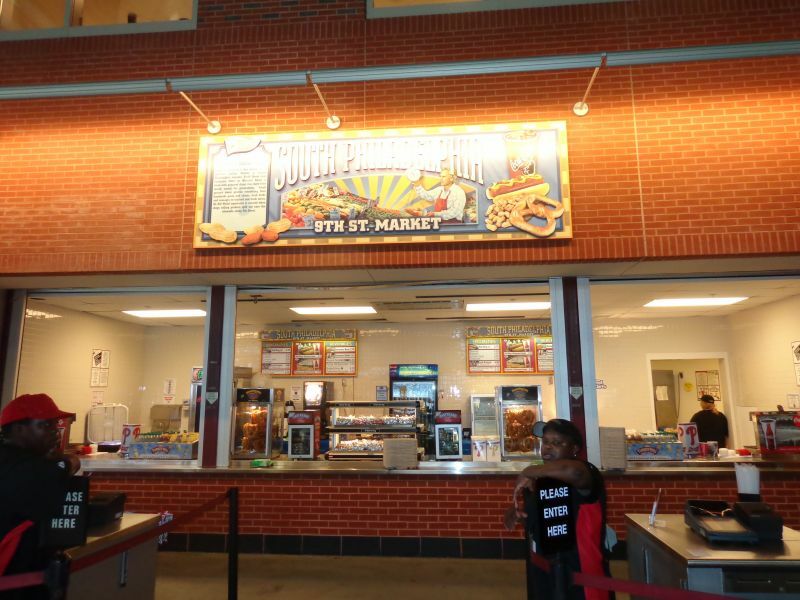 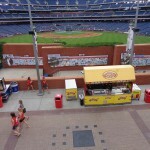 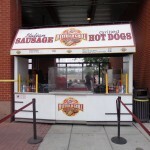 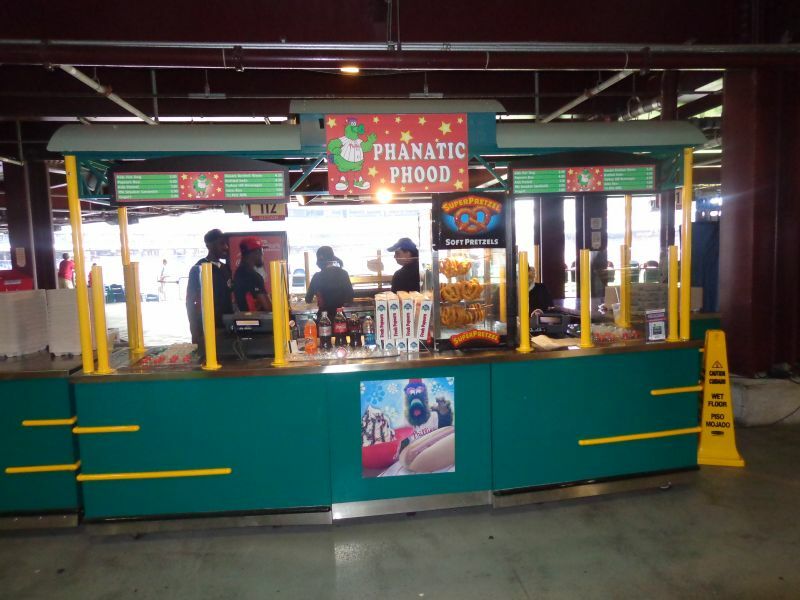 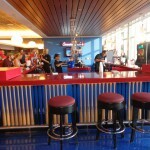 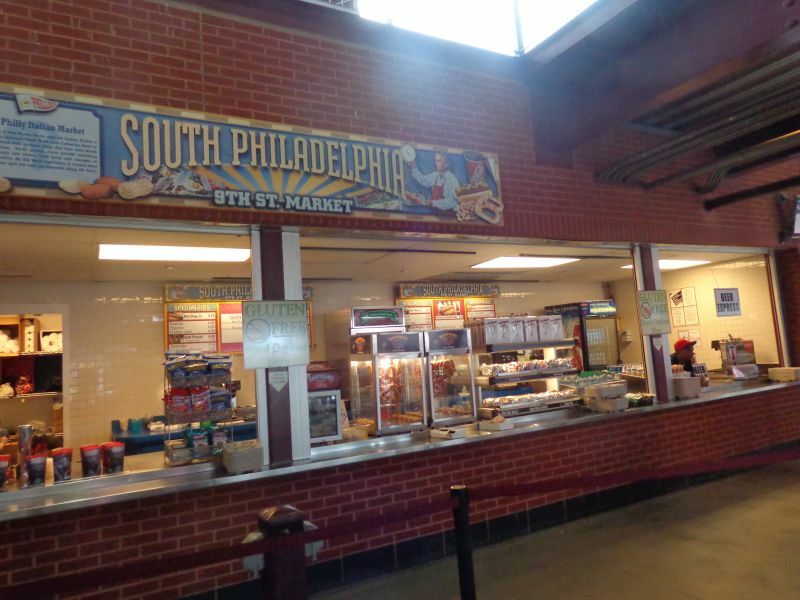 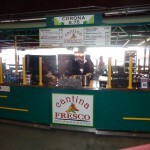 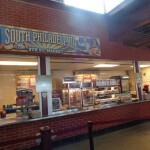 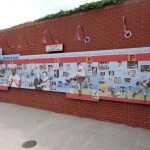 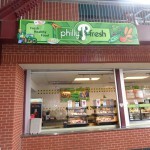 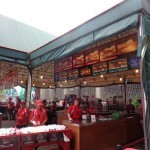 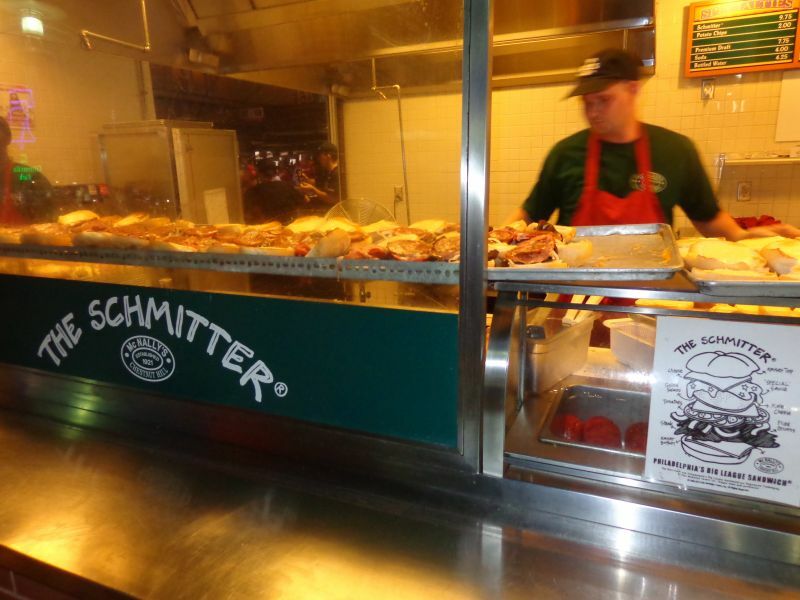 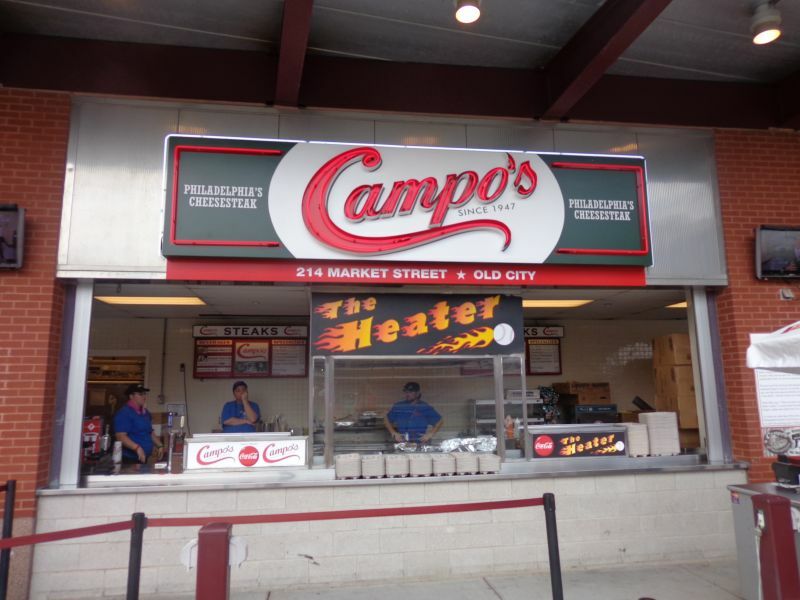 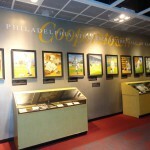 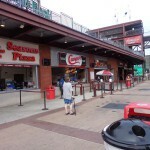 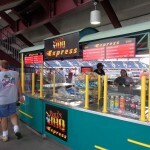 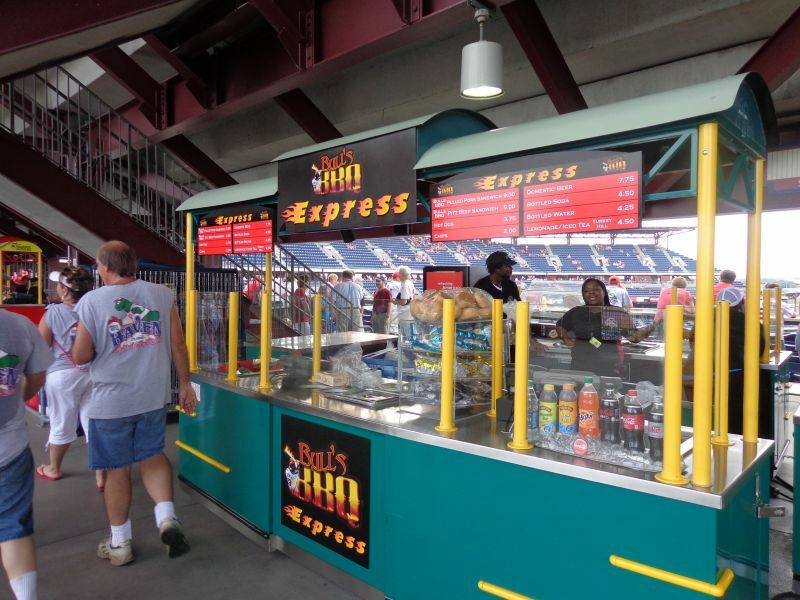 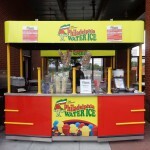 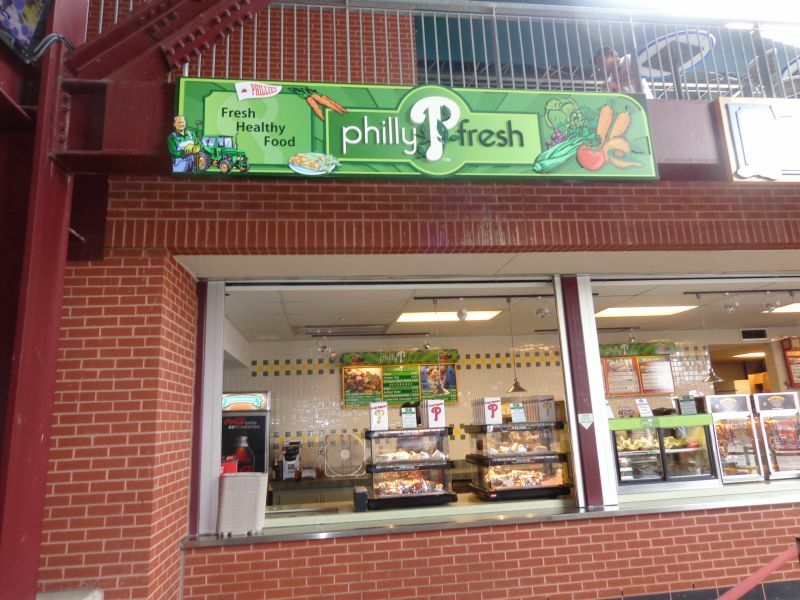 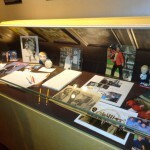 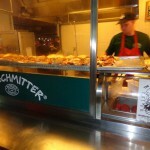 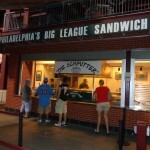 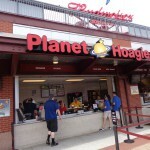 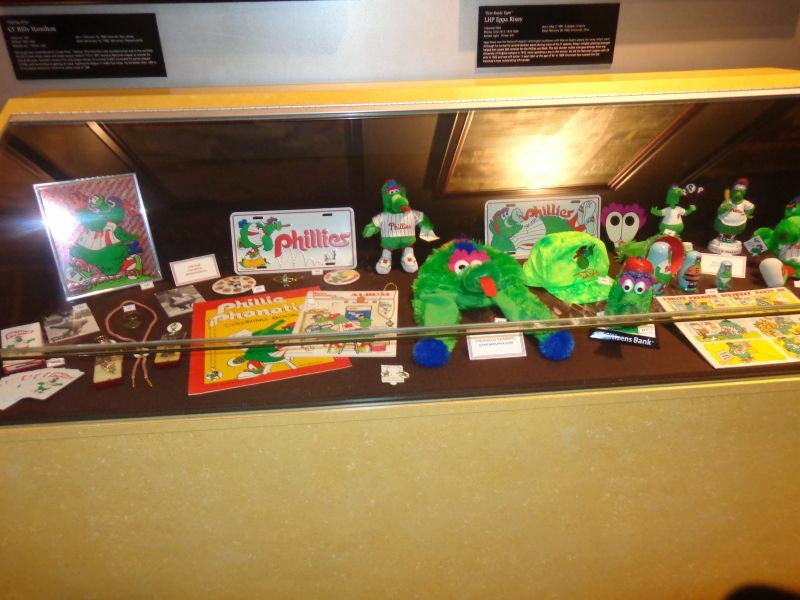 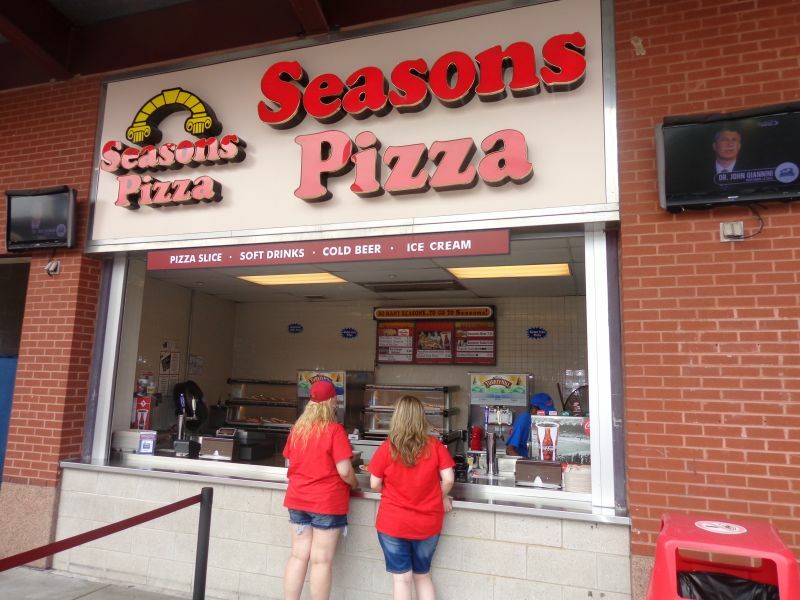 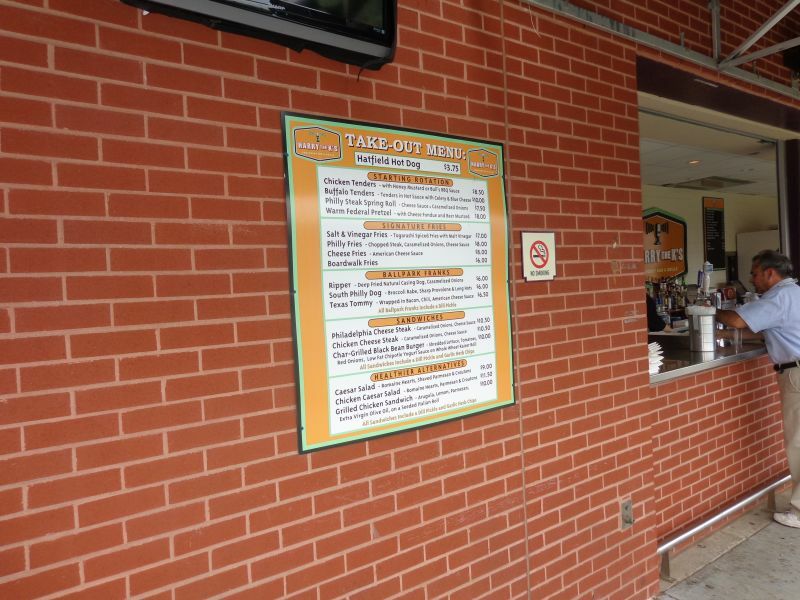 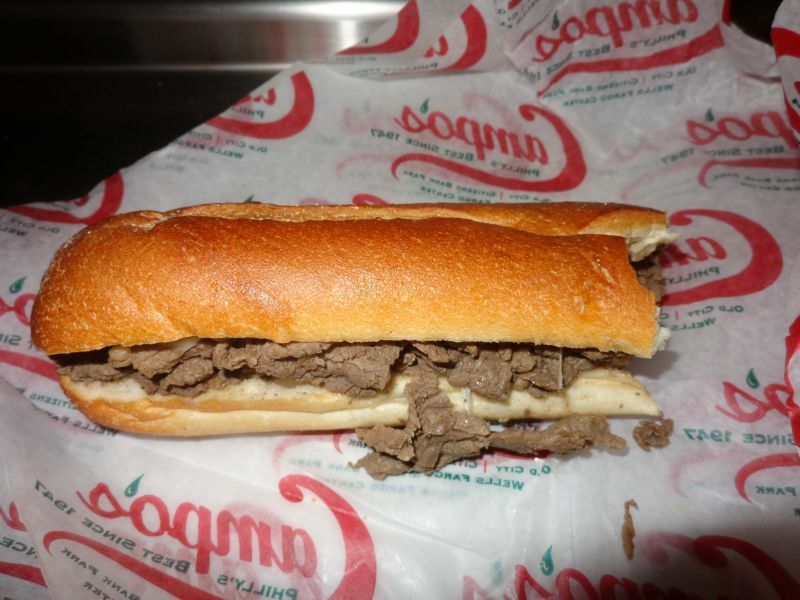 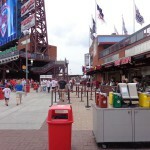 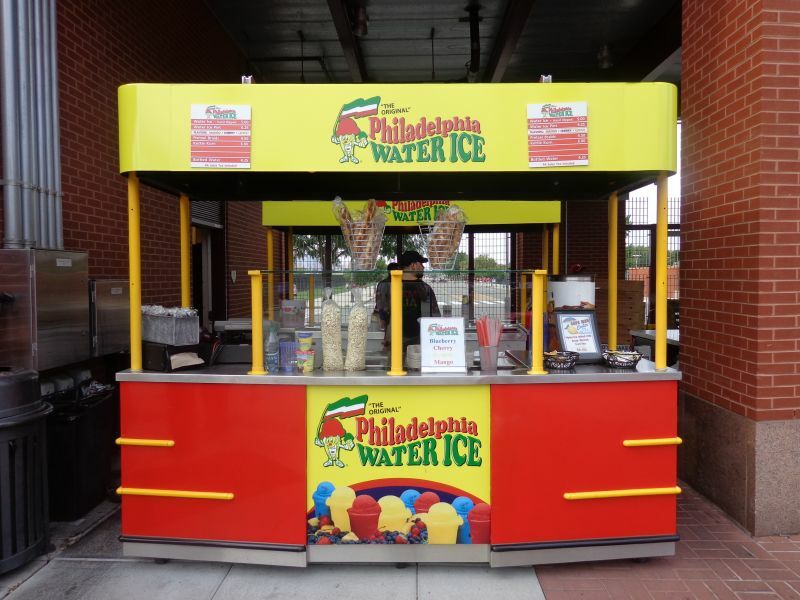 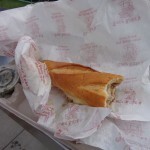 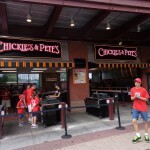 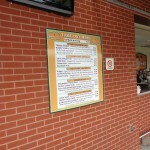 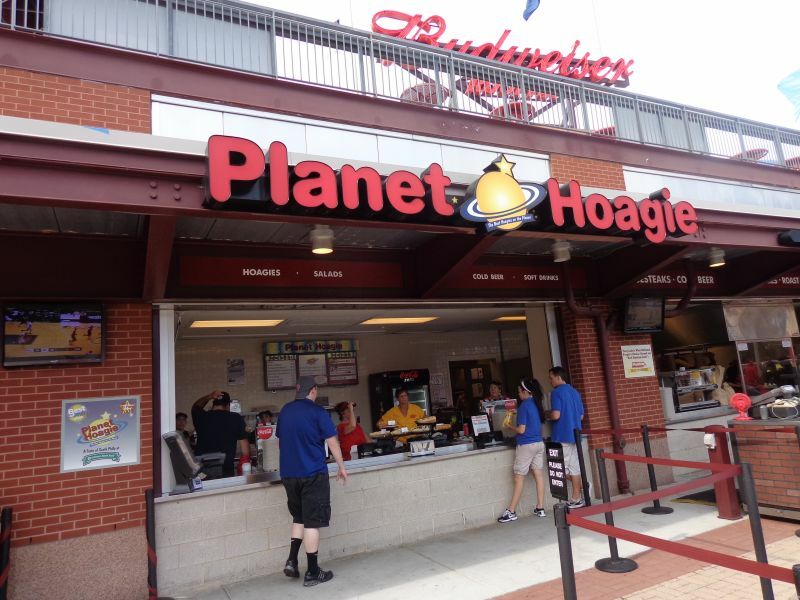 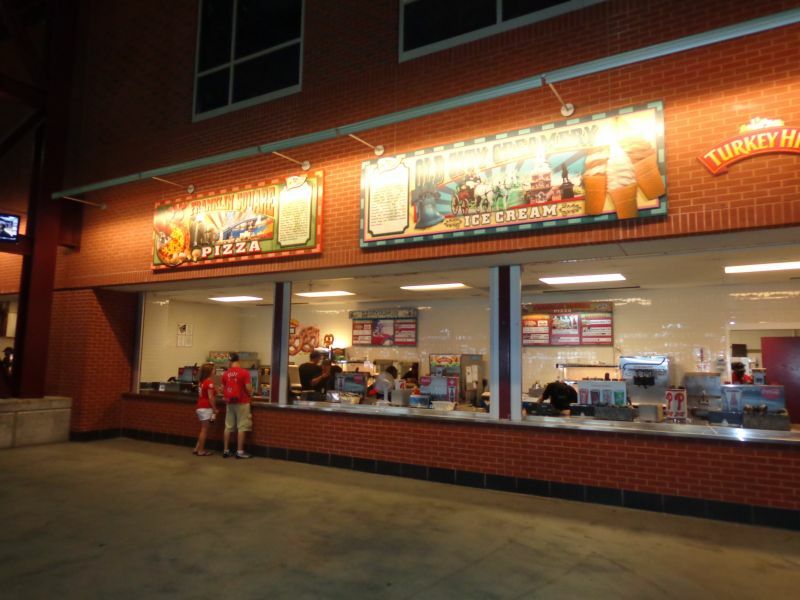 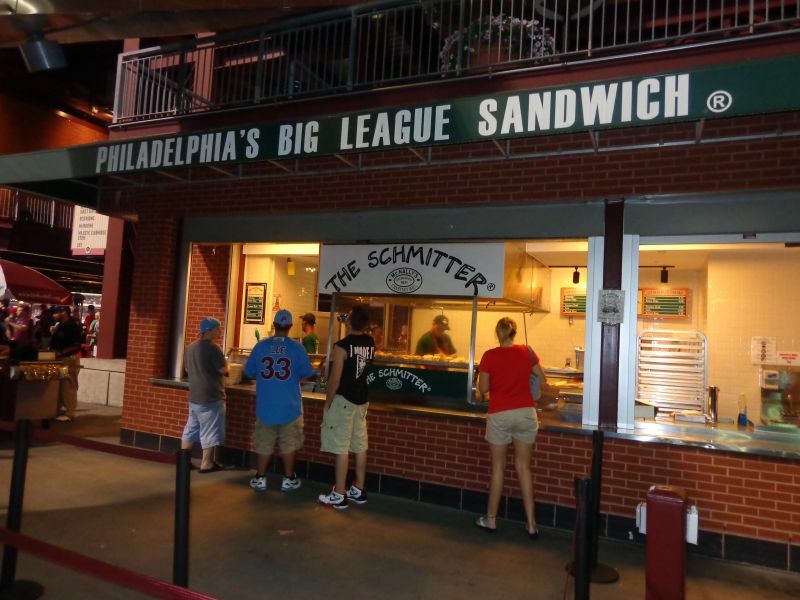 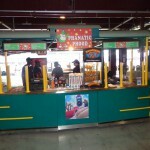 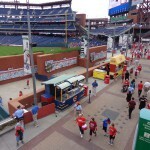 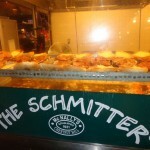 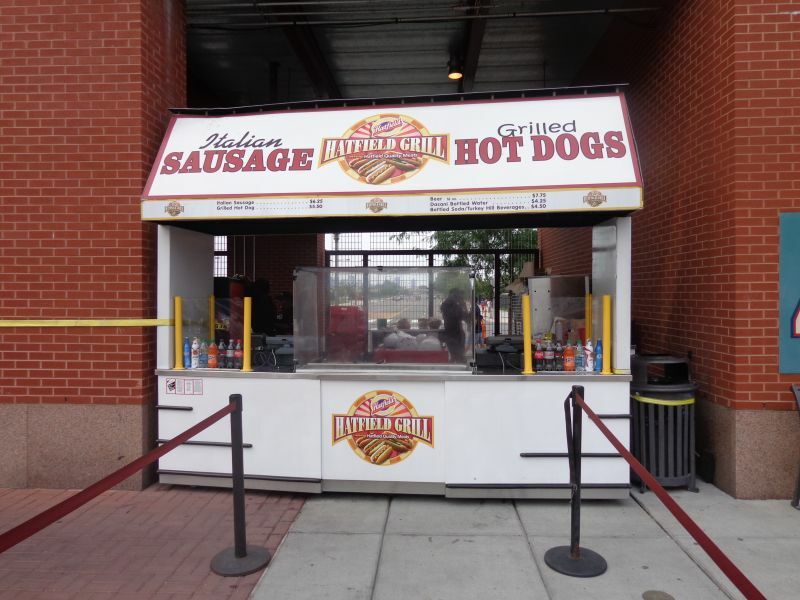 The Phillies were one of the first teams to primarily emphasize local eateries, not just isolated regional food items, as the focal point of their concession presentation. 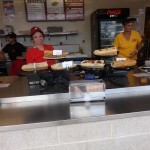 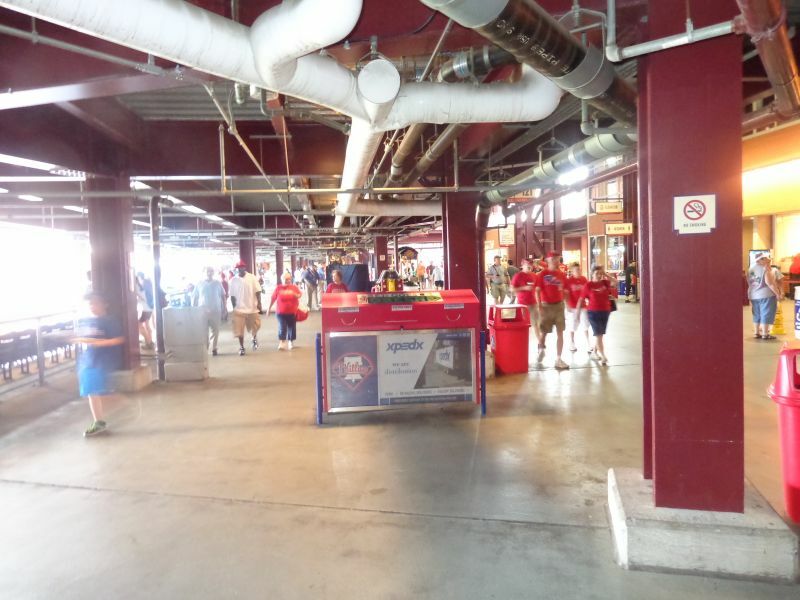 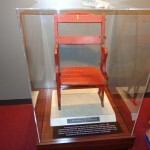 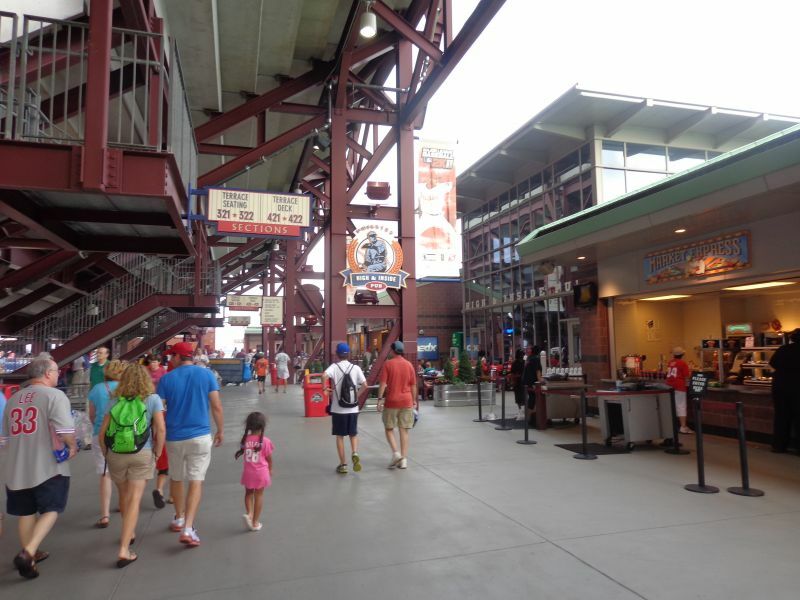 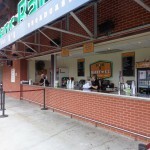 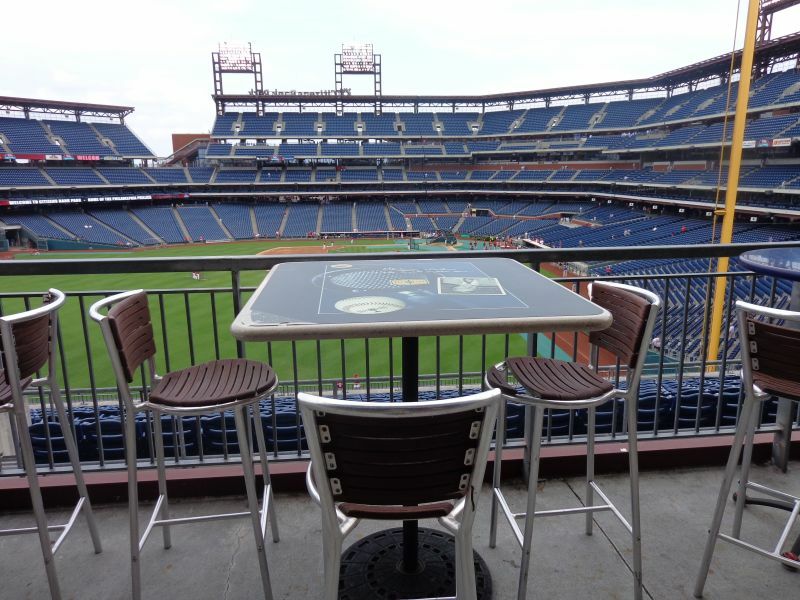 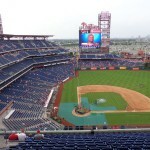 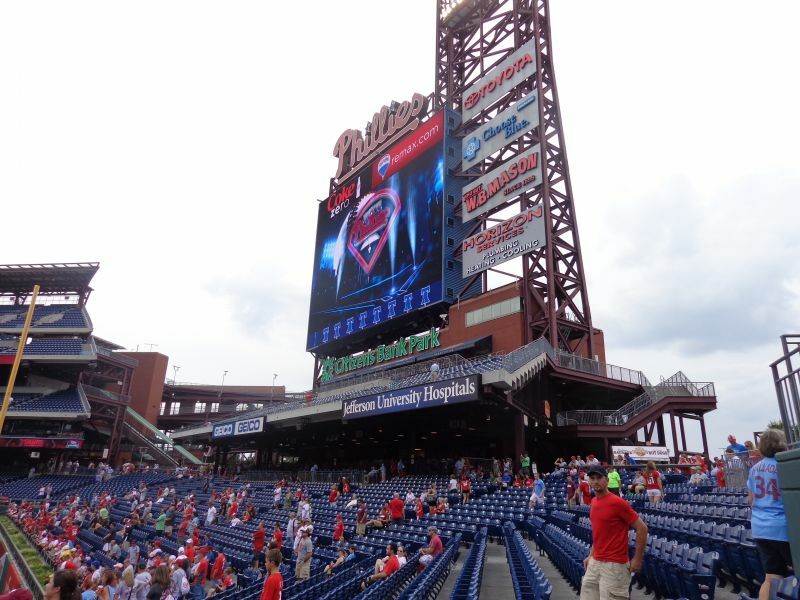 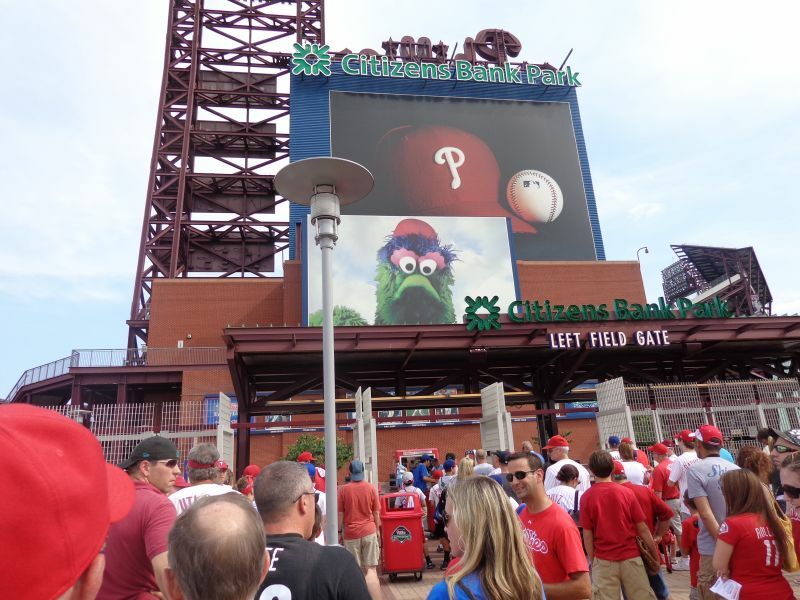 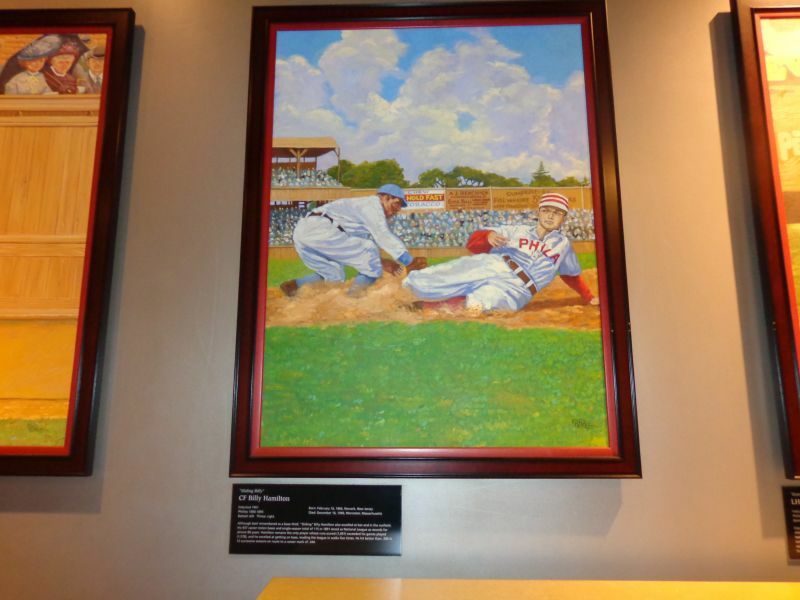 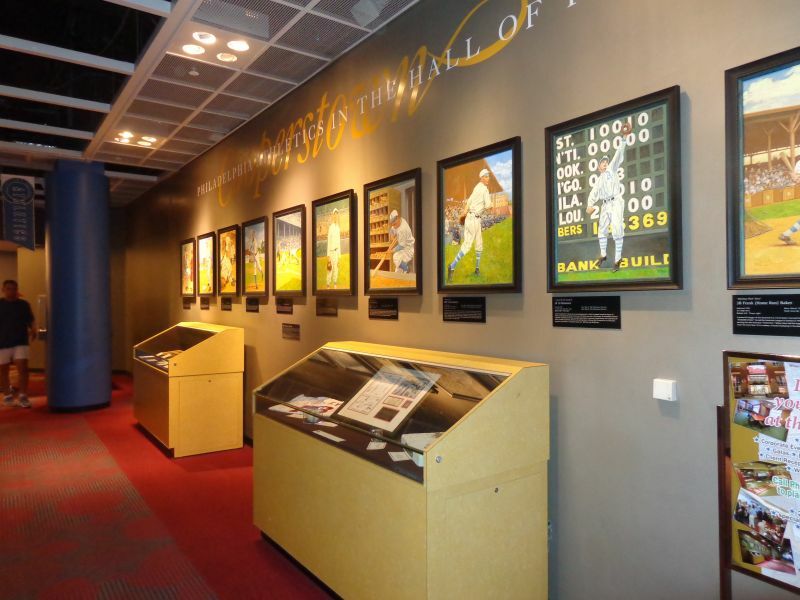 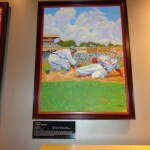 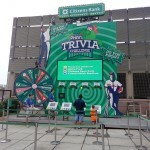 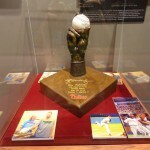 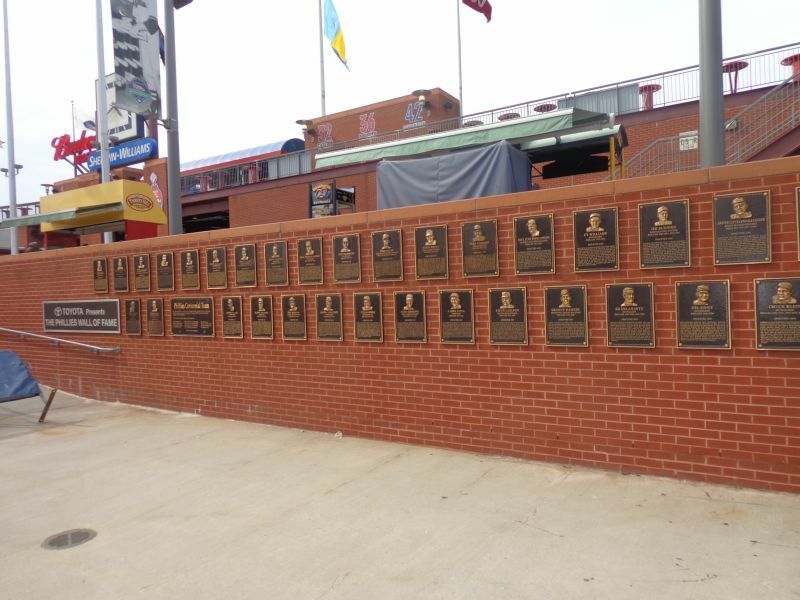 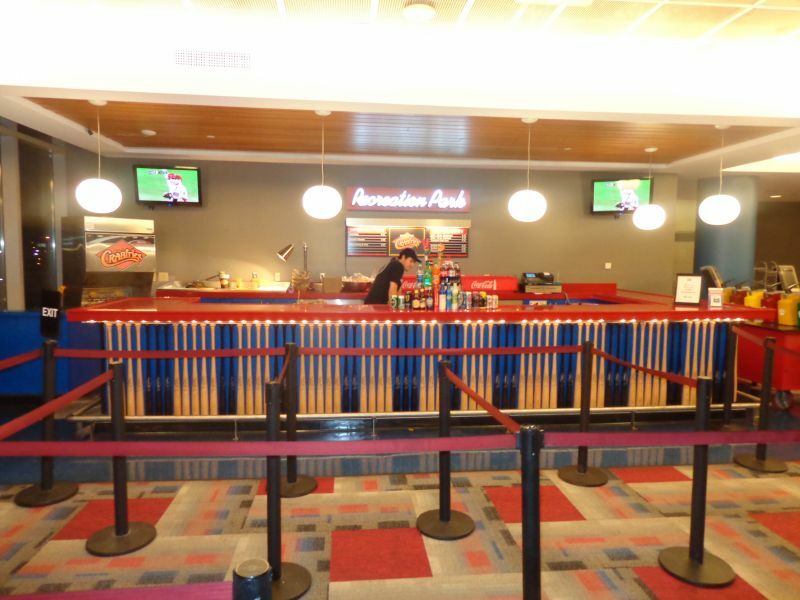 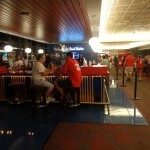 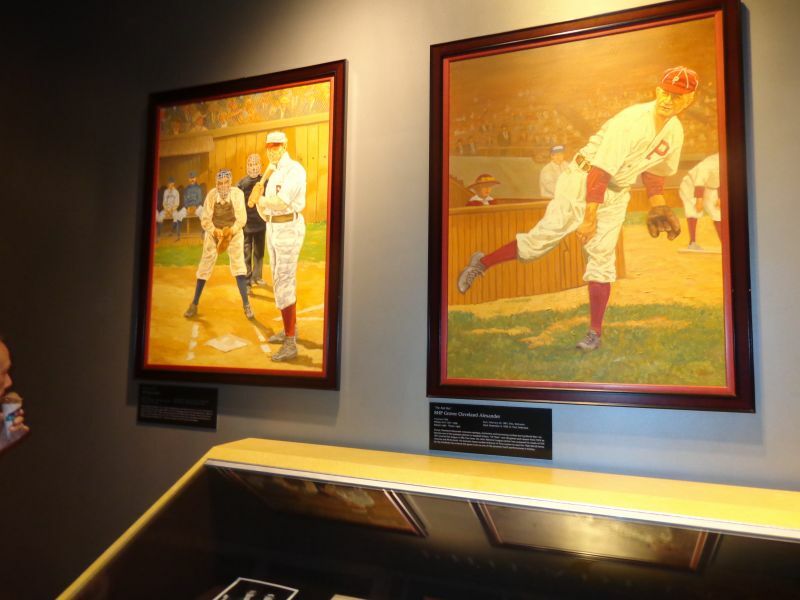 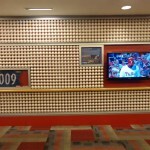 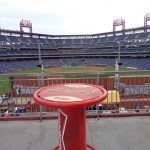 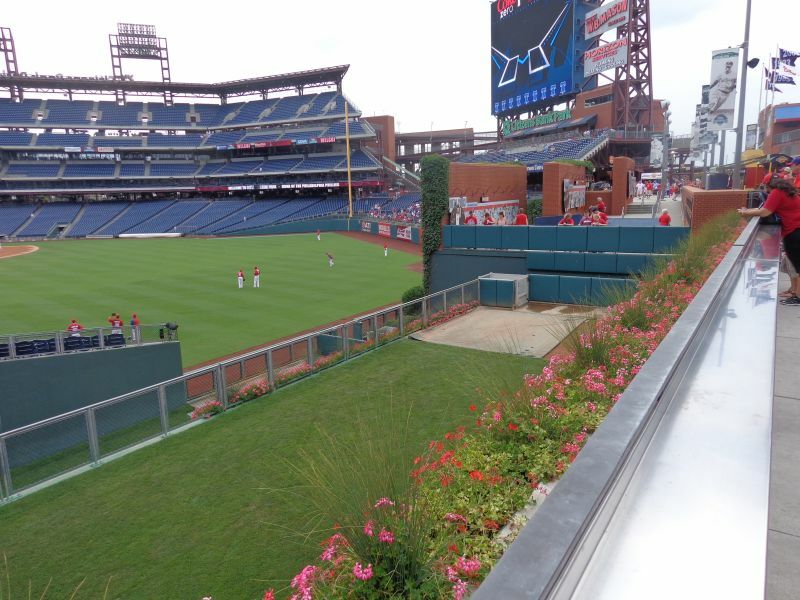 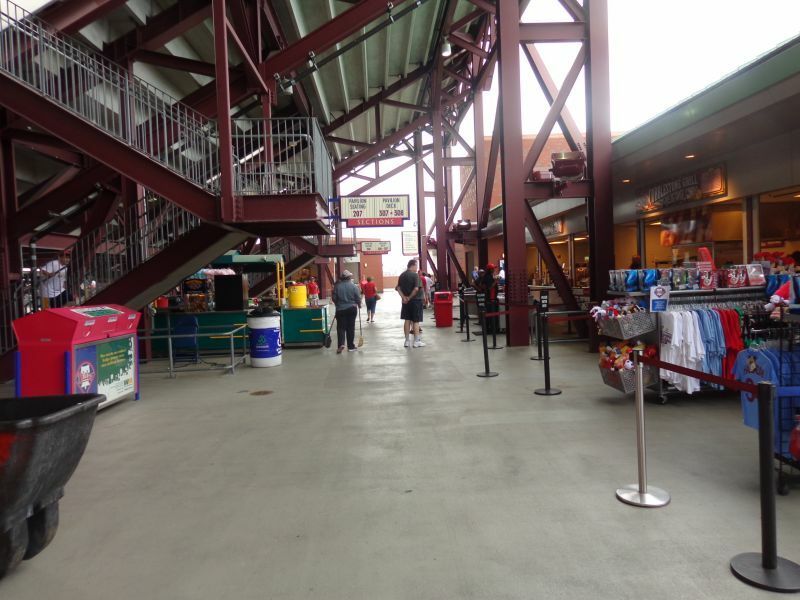 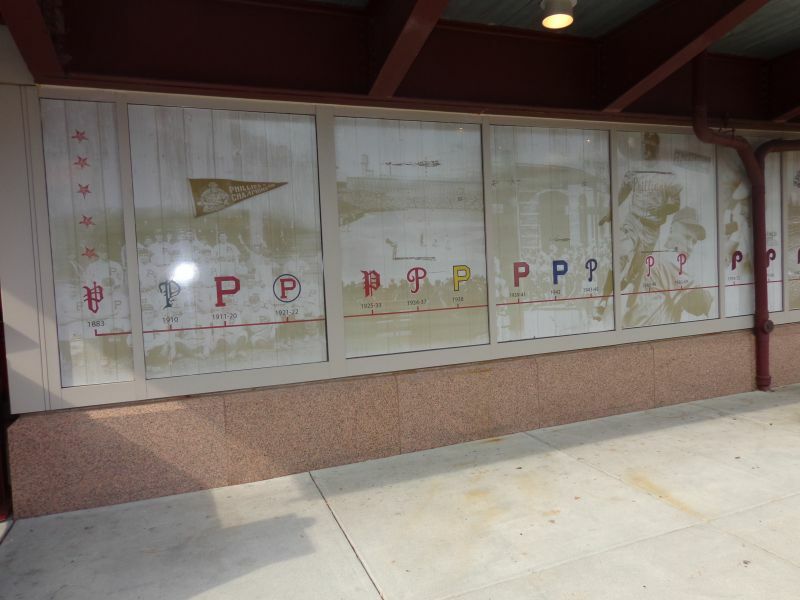 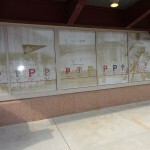 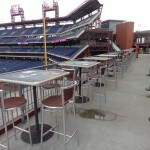 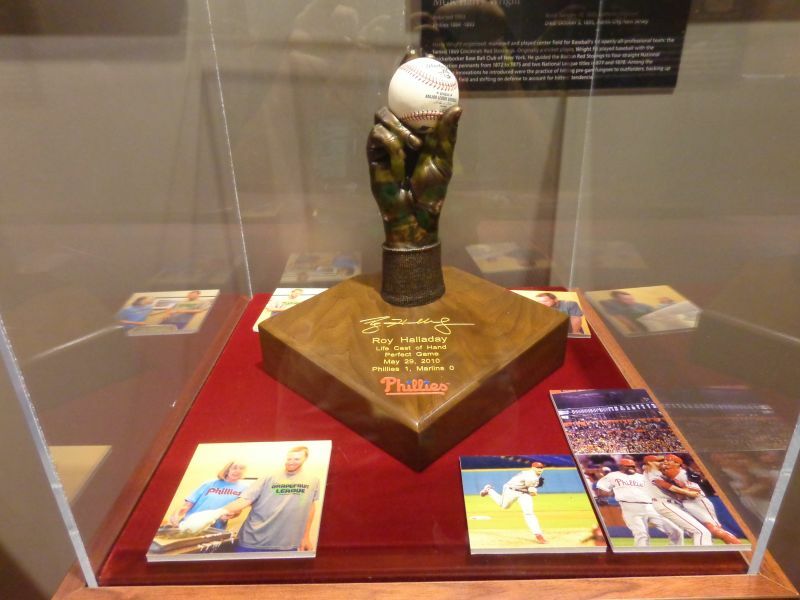 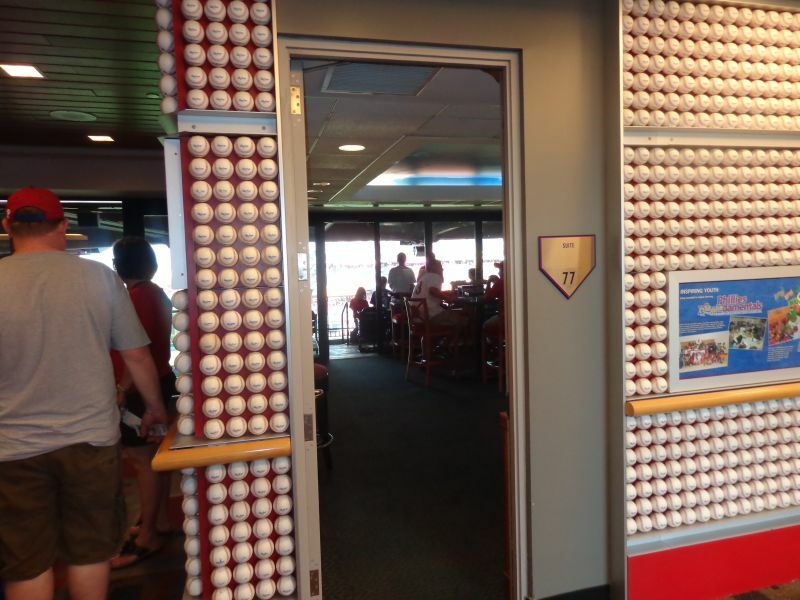 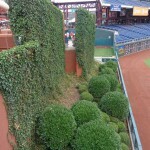 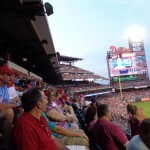 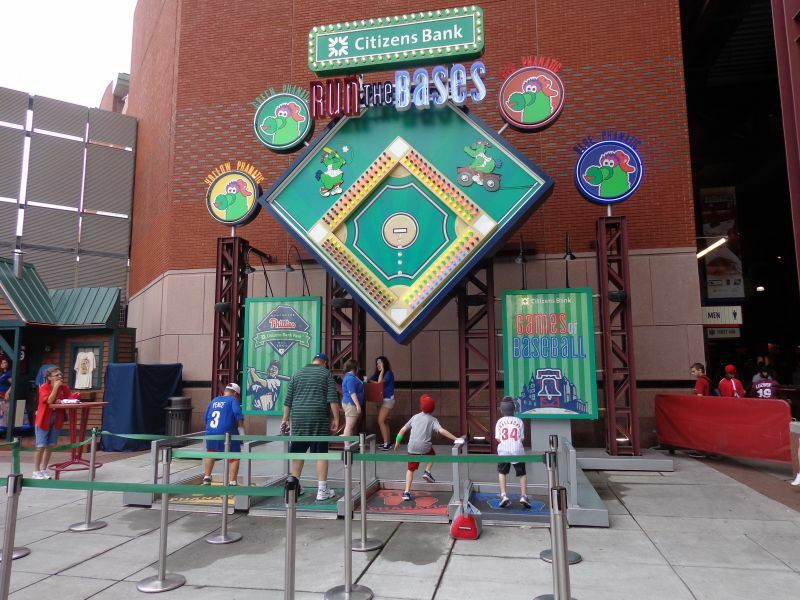 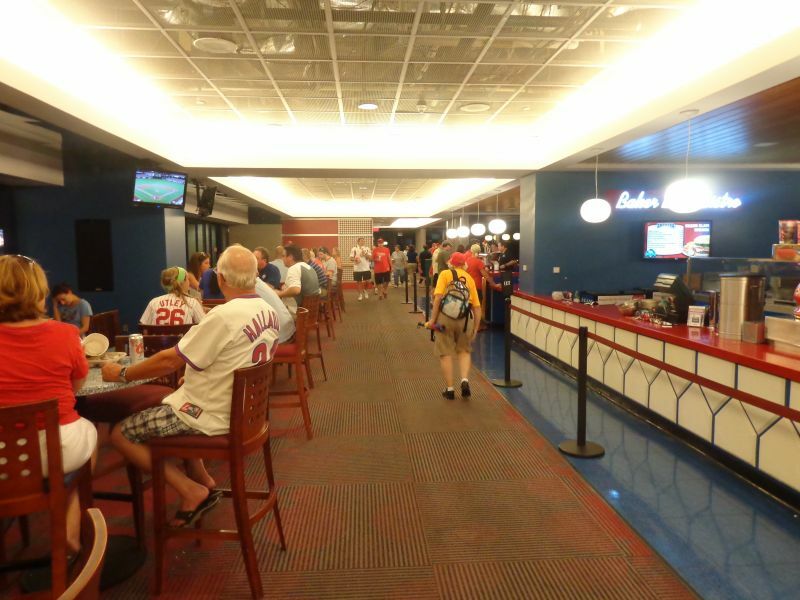 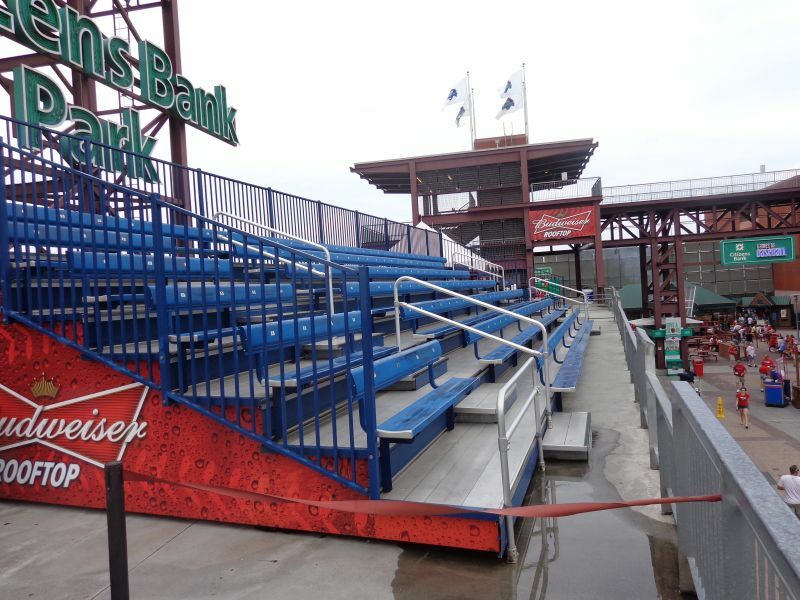 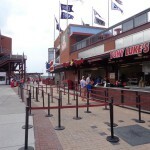 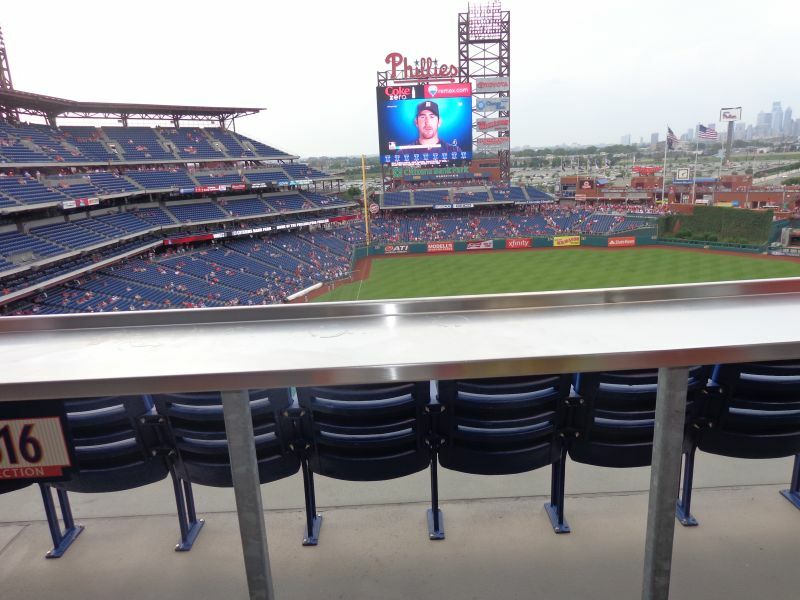 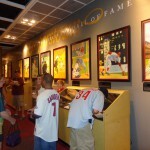 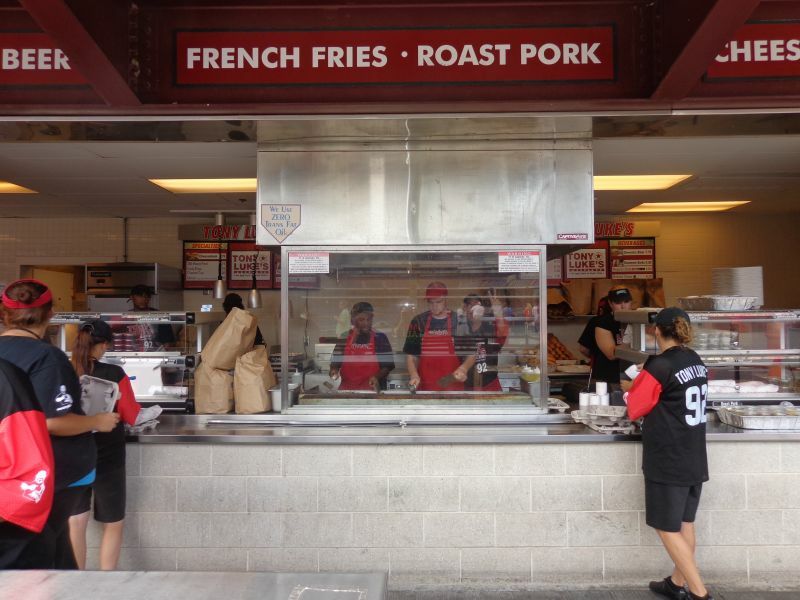 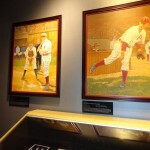 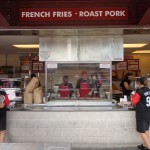 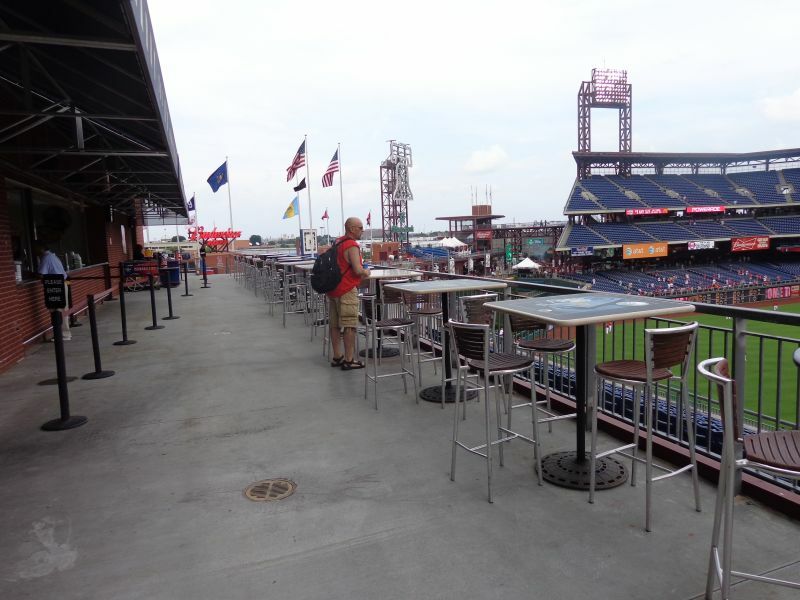 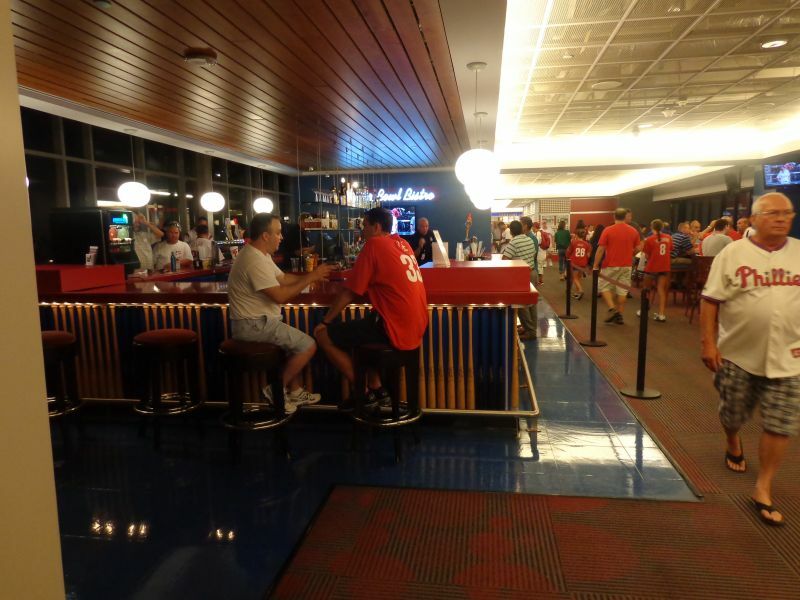 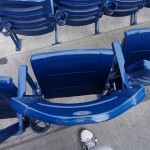 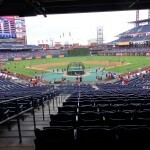 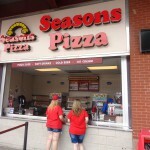 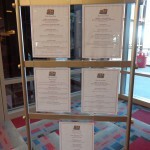 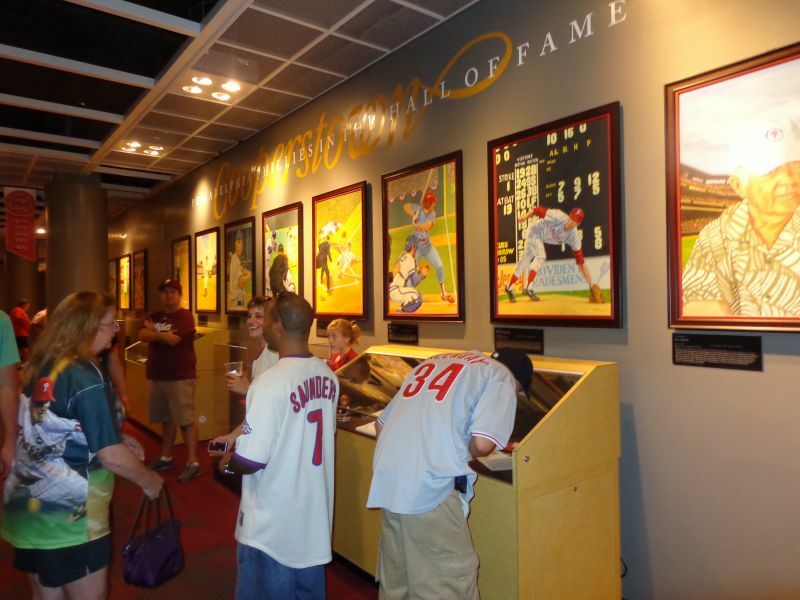 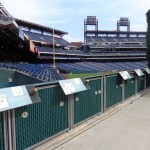 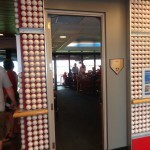 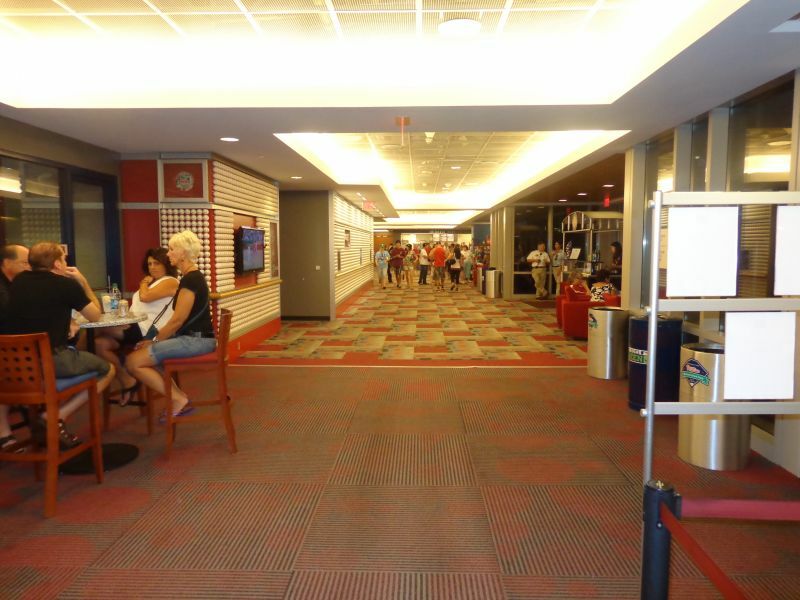 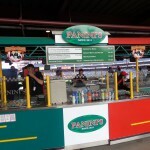 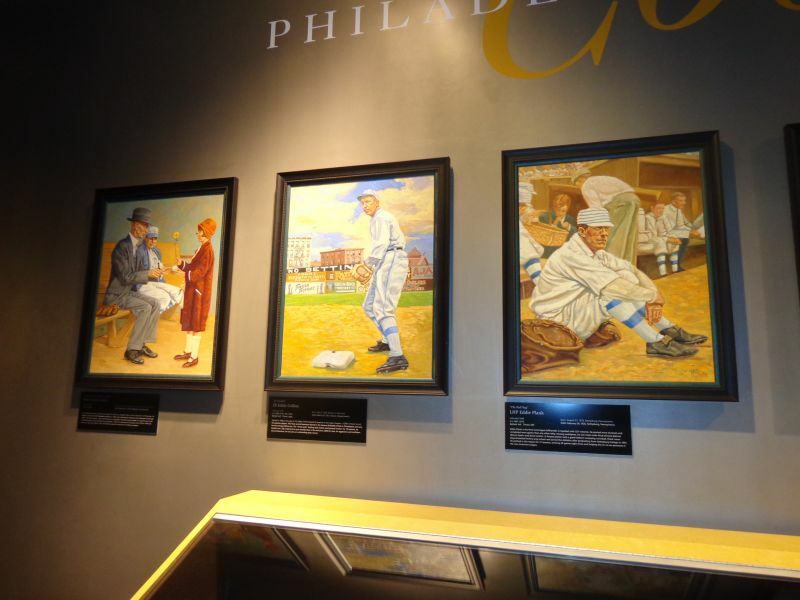 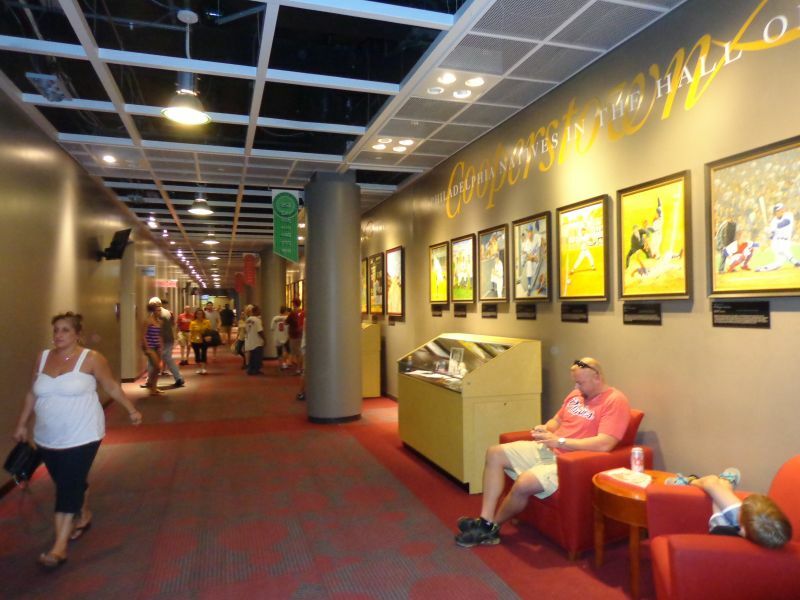 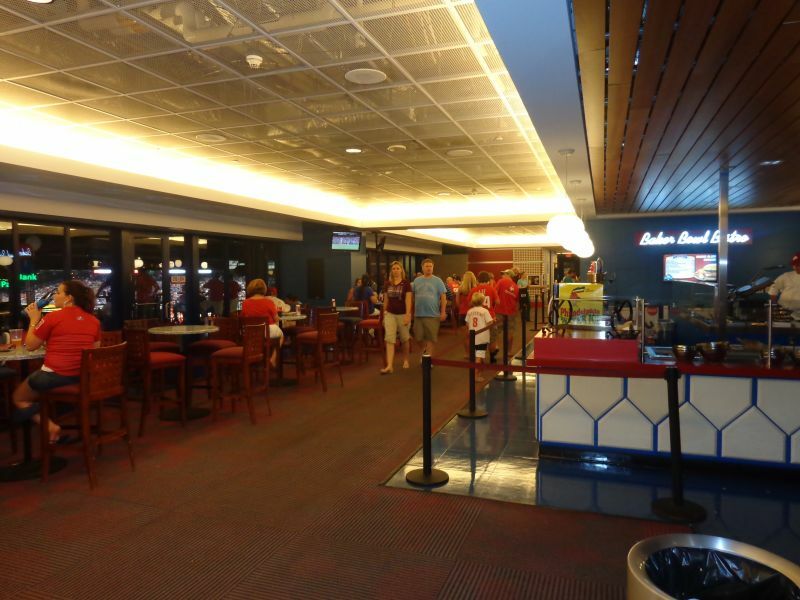 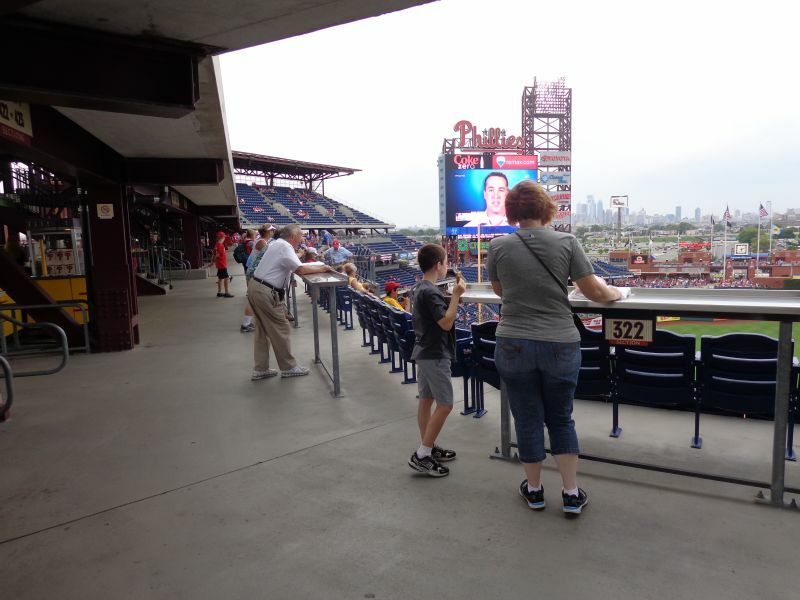 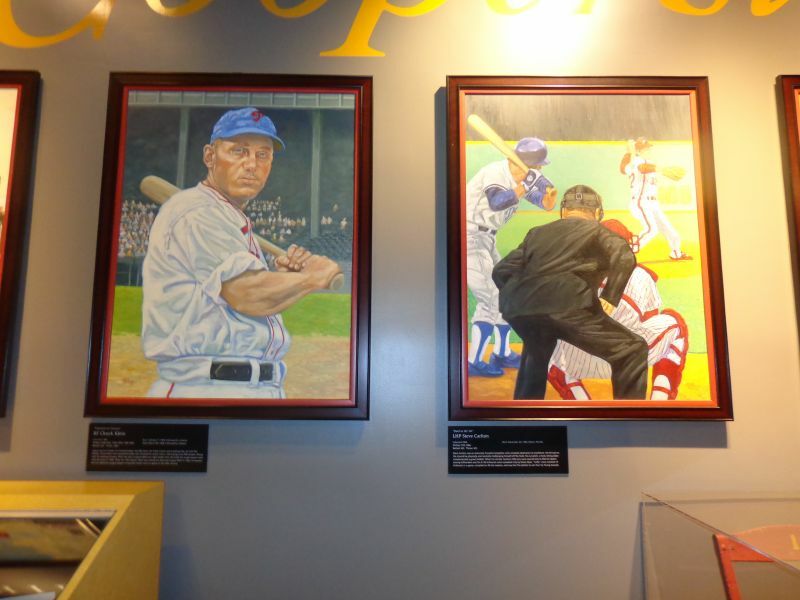 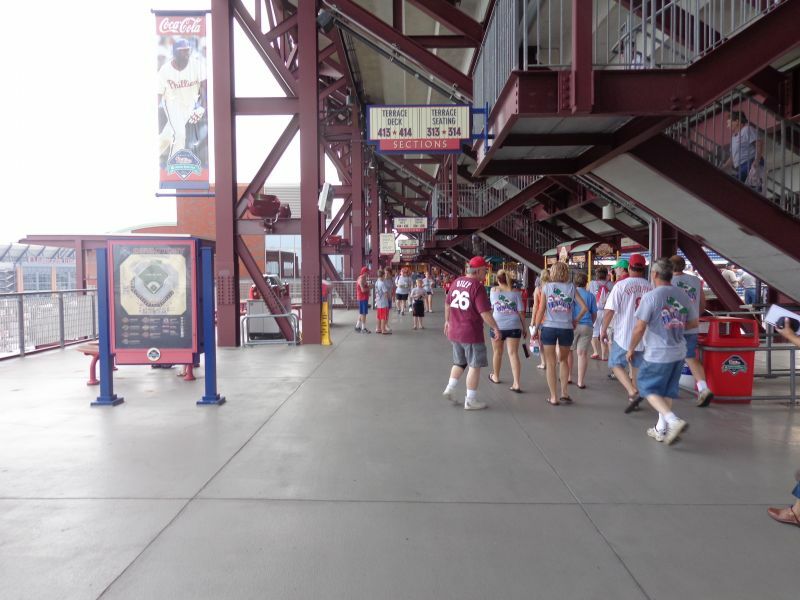 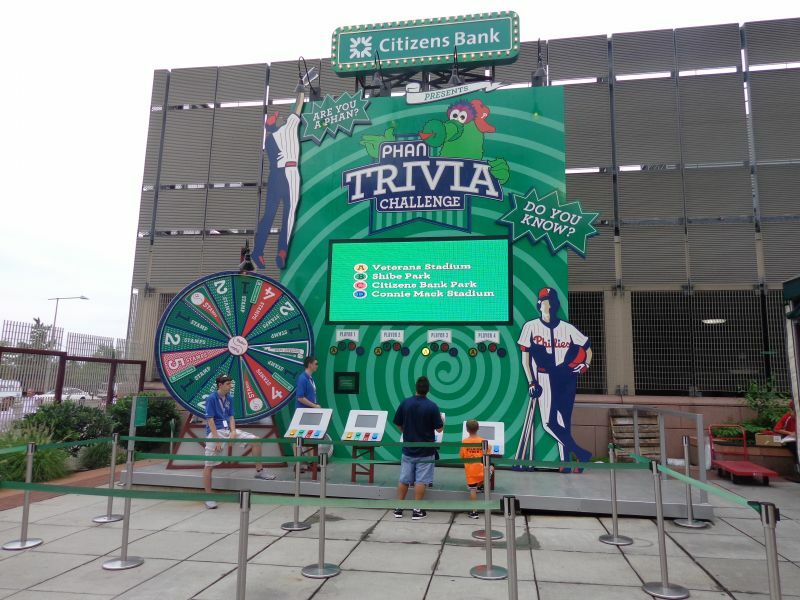 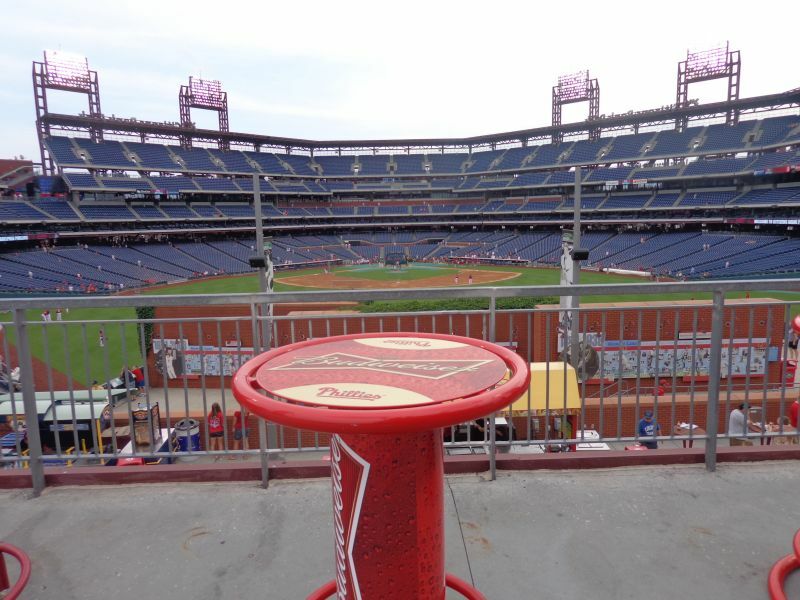 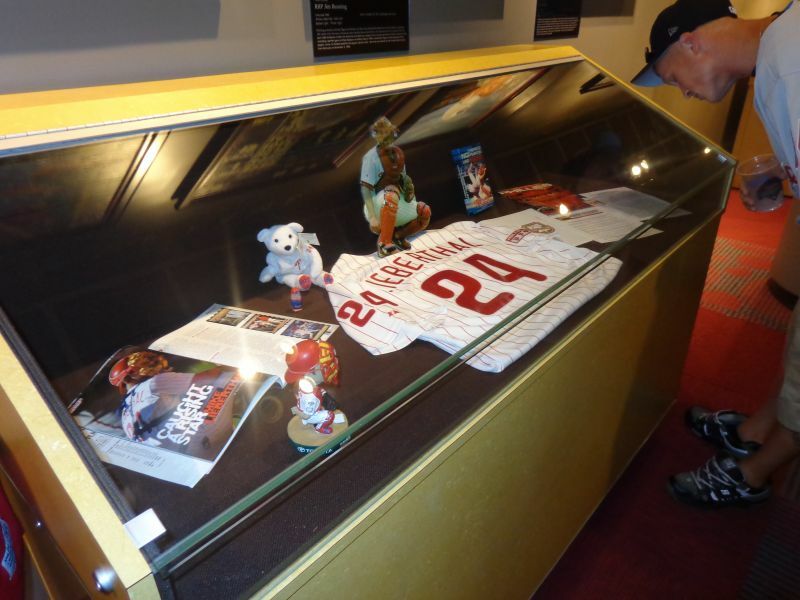 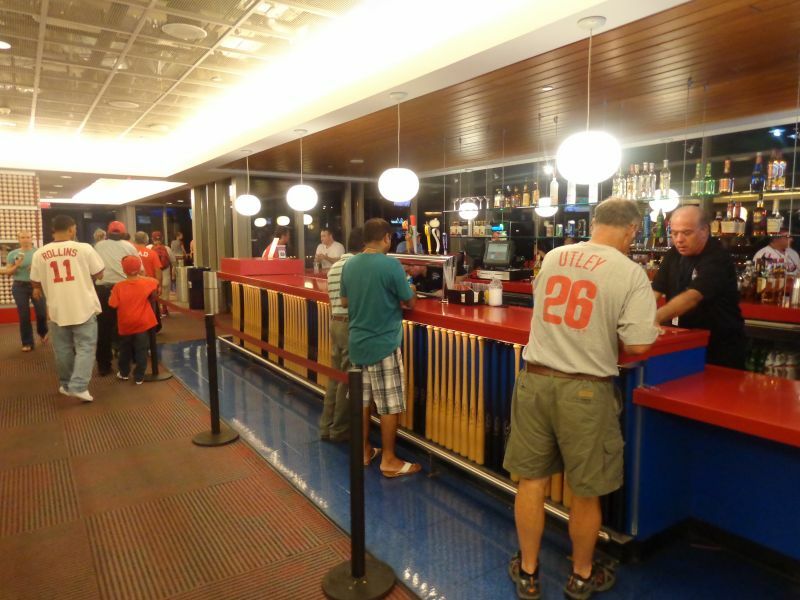 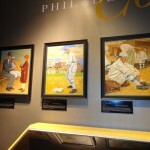 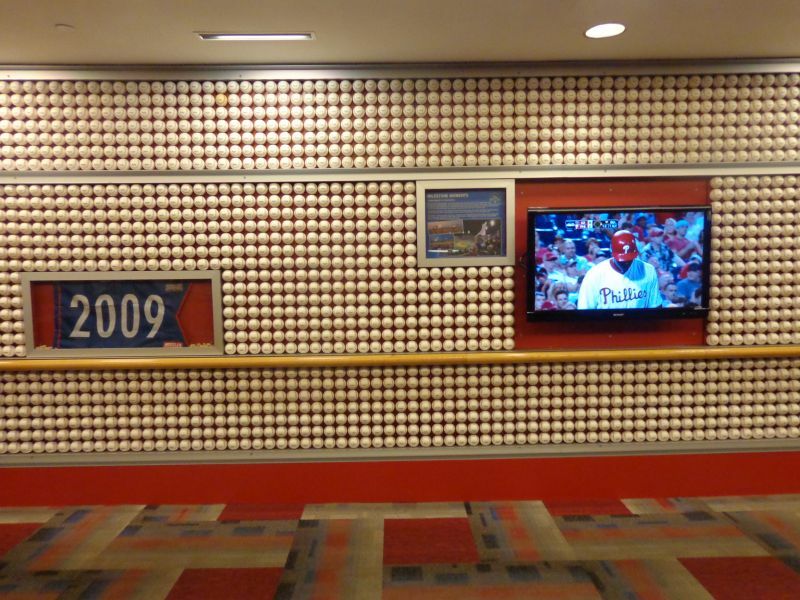 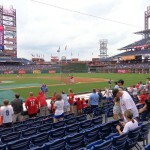 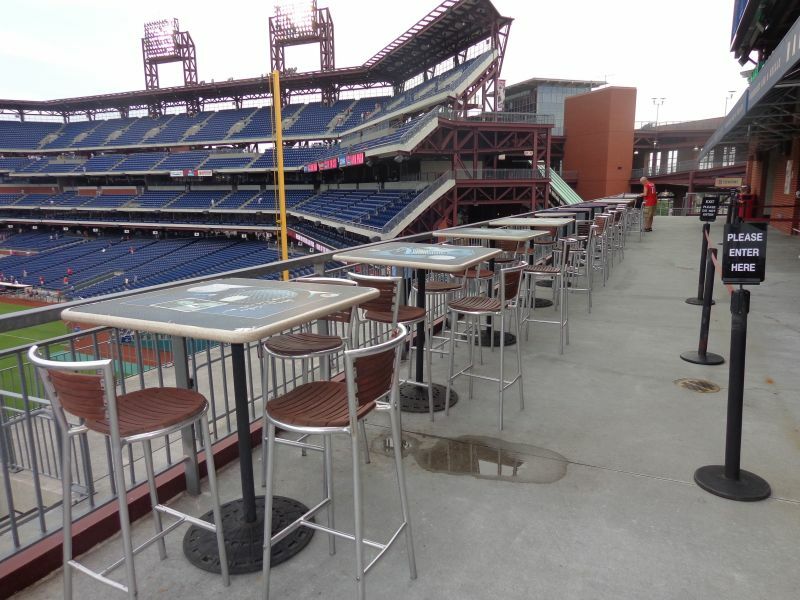 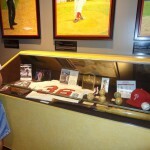 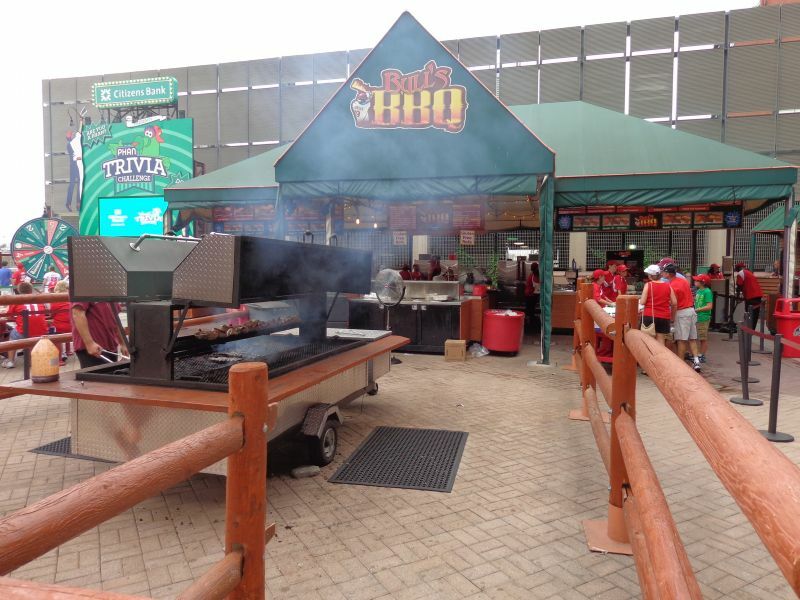 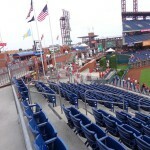 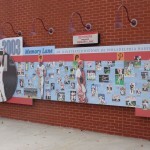 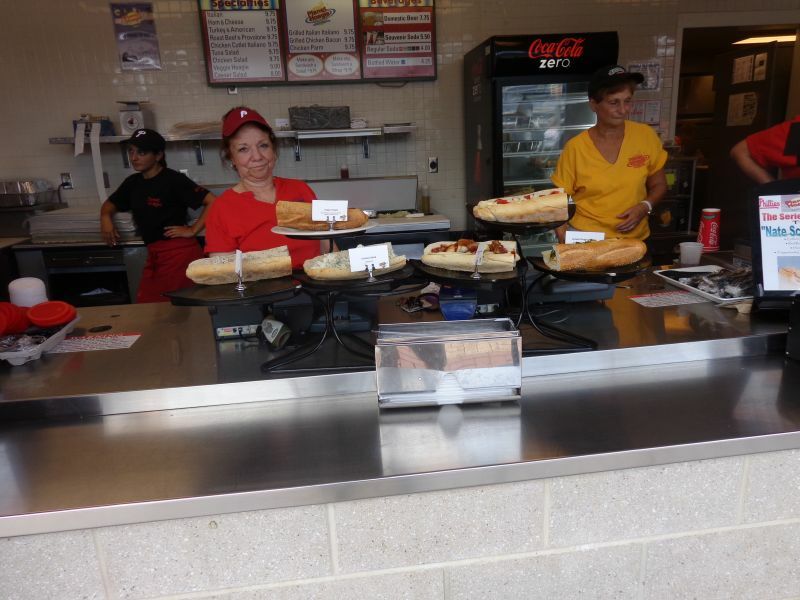 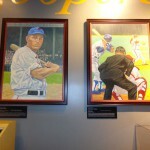 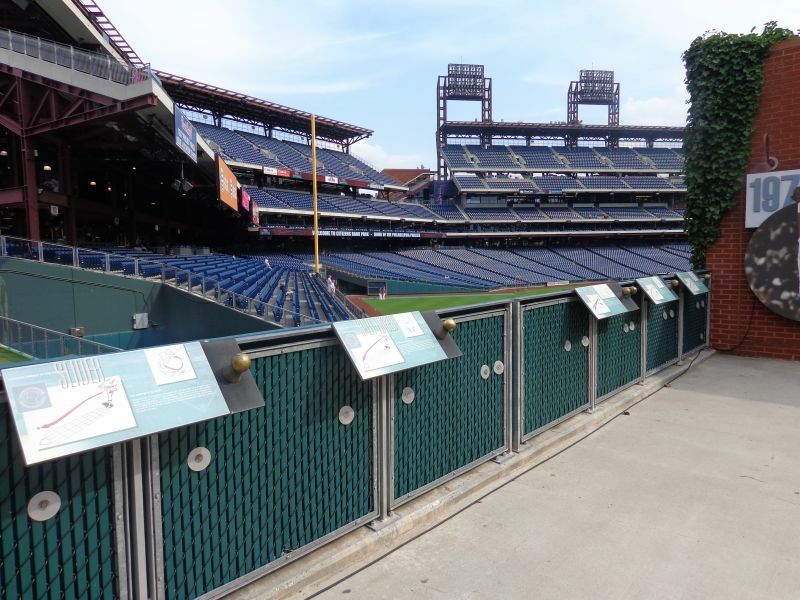 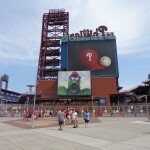 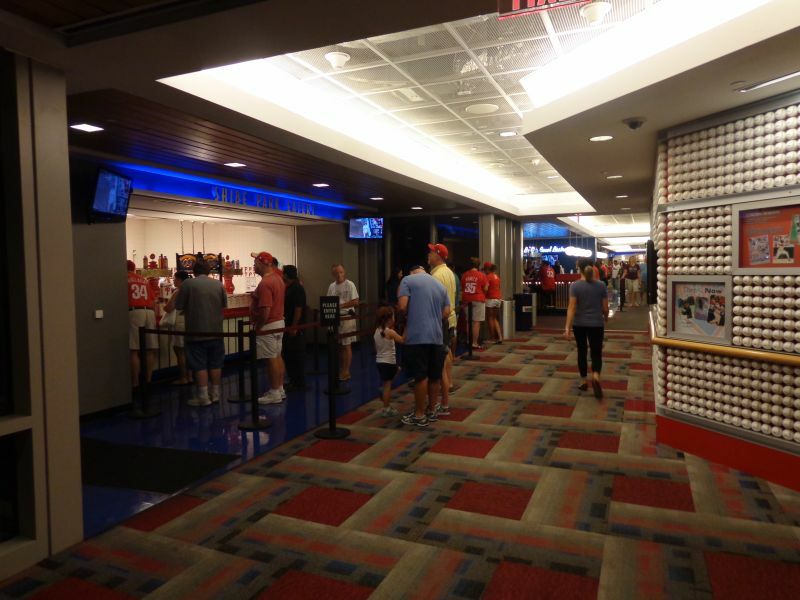 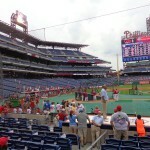 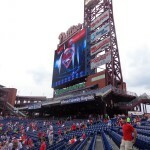 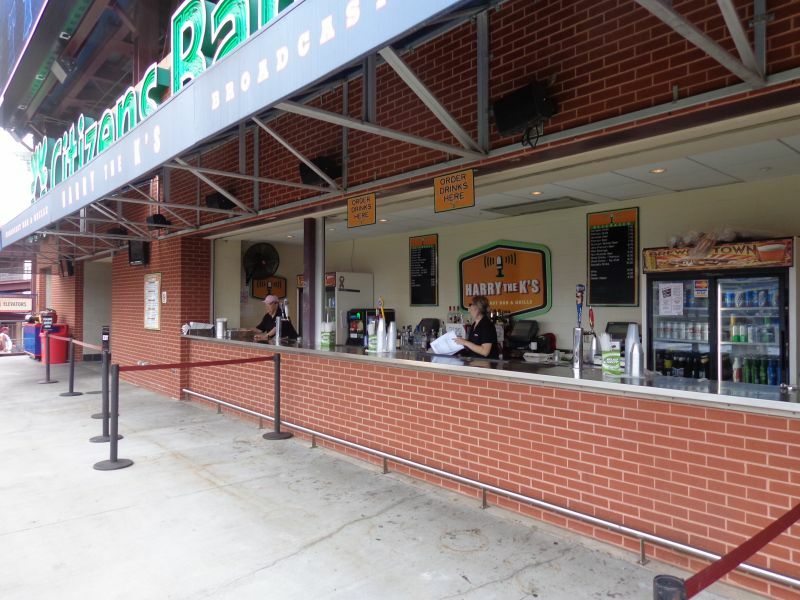 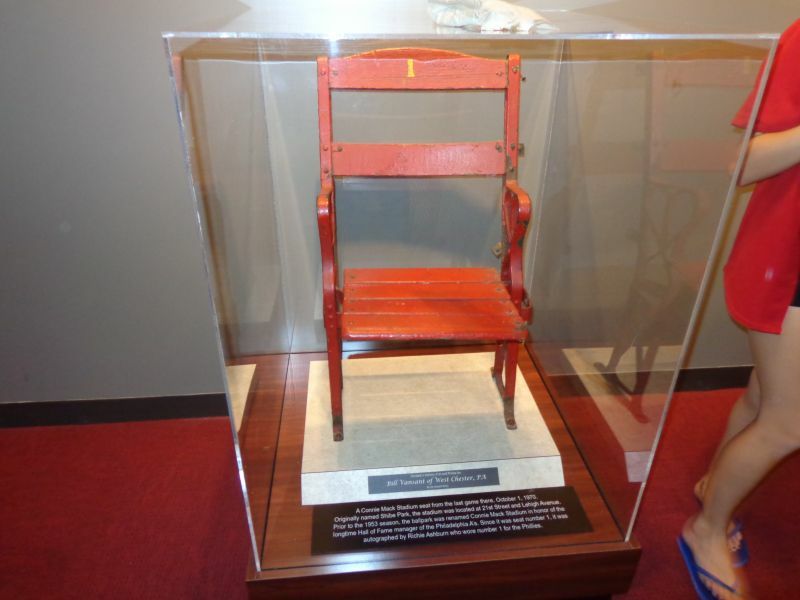 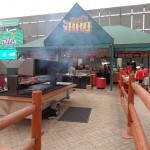 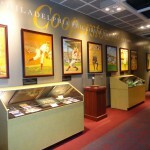 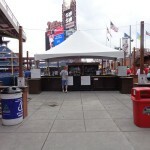 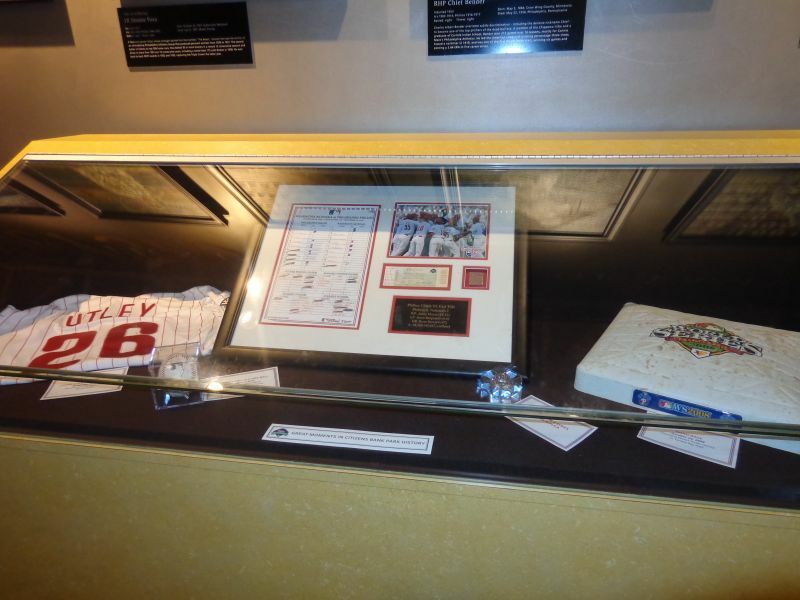 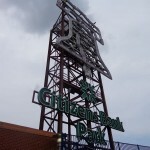 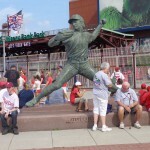 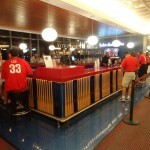 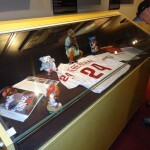 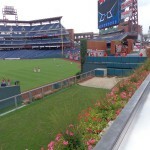 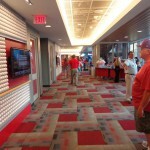 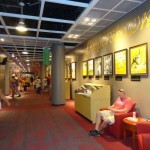 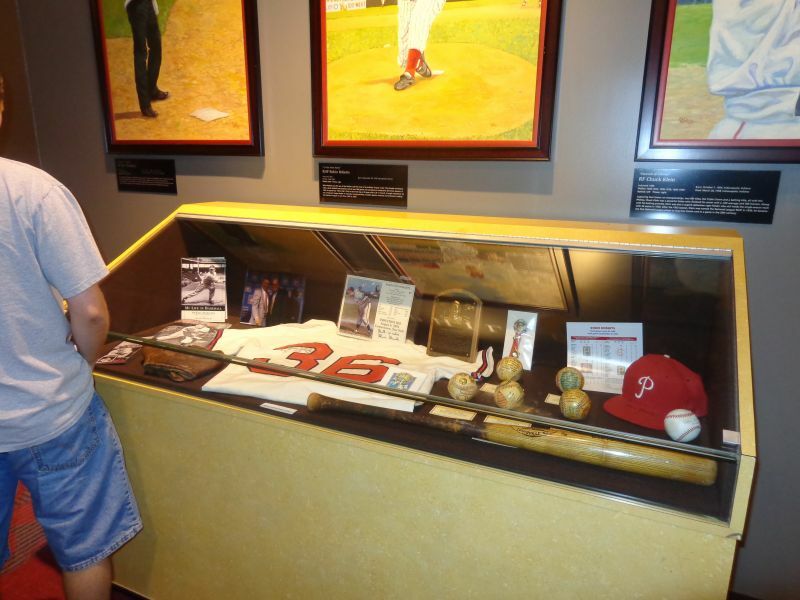 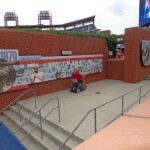 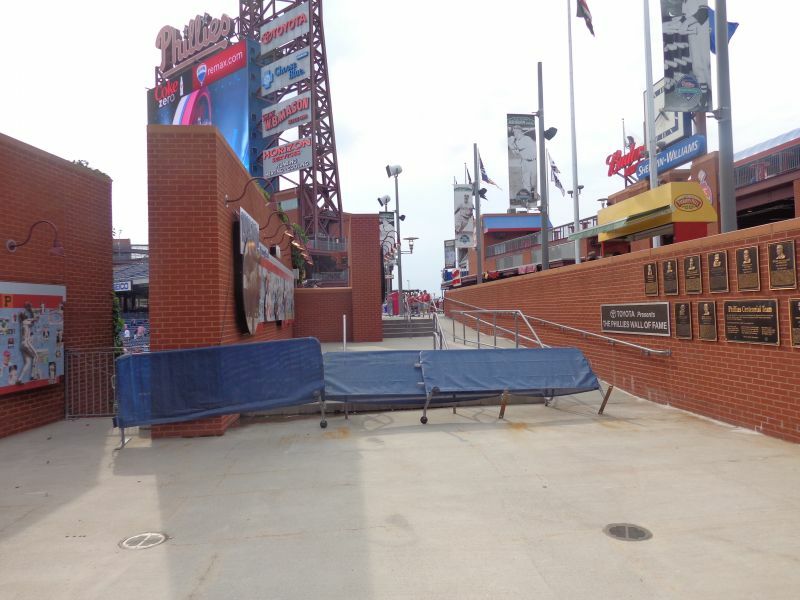 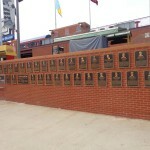 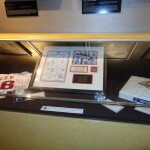 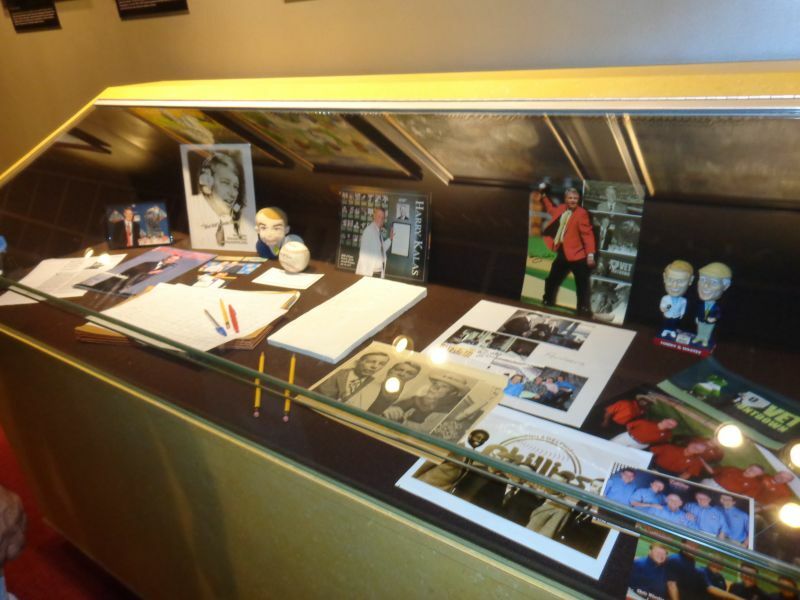 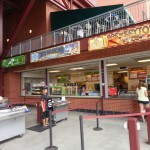 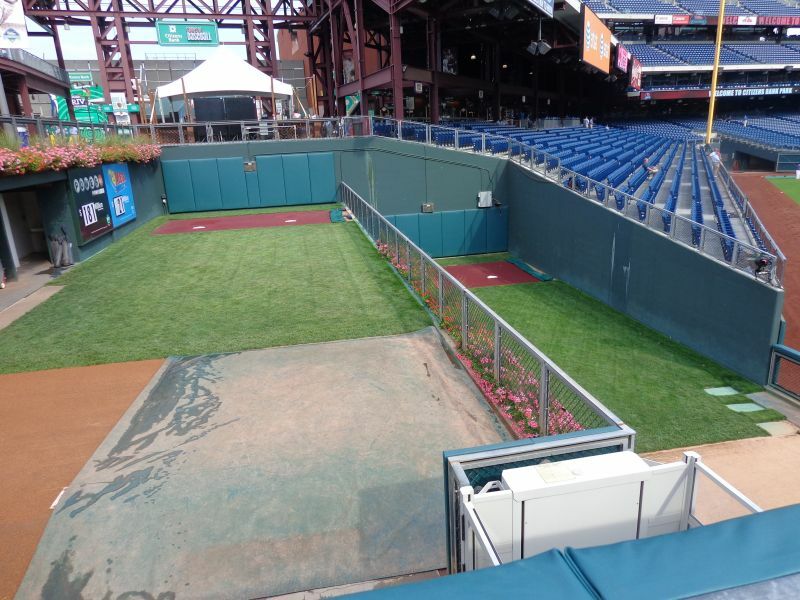 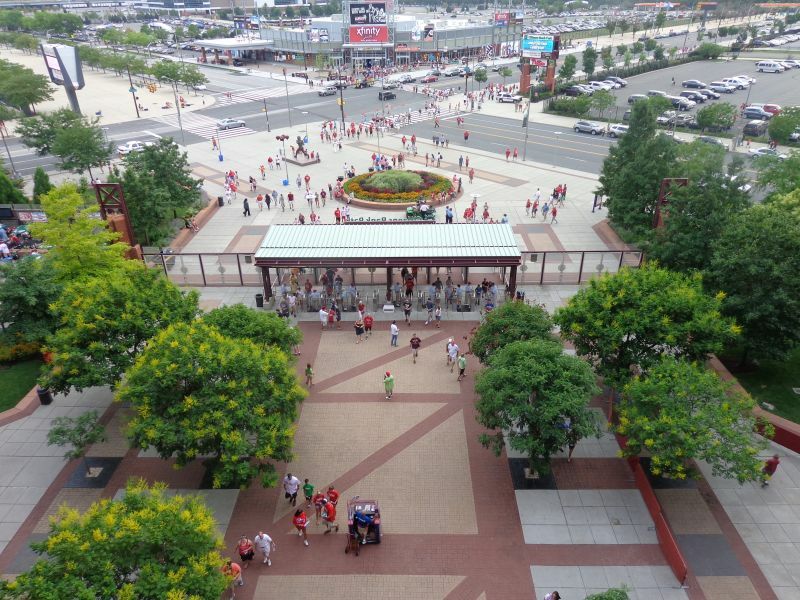 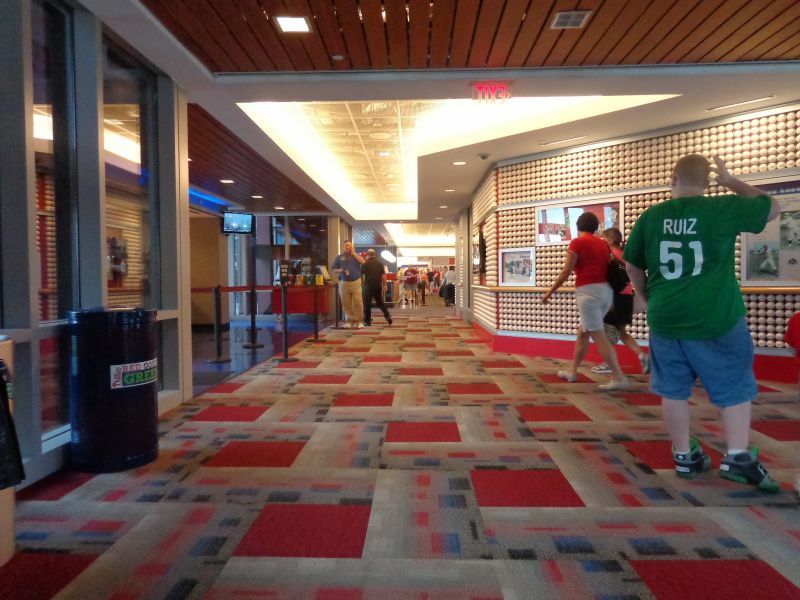 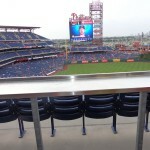 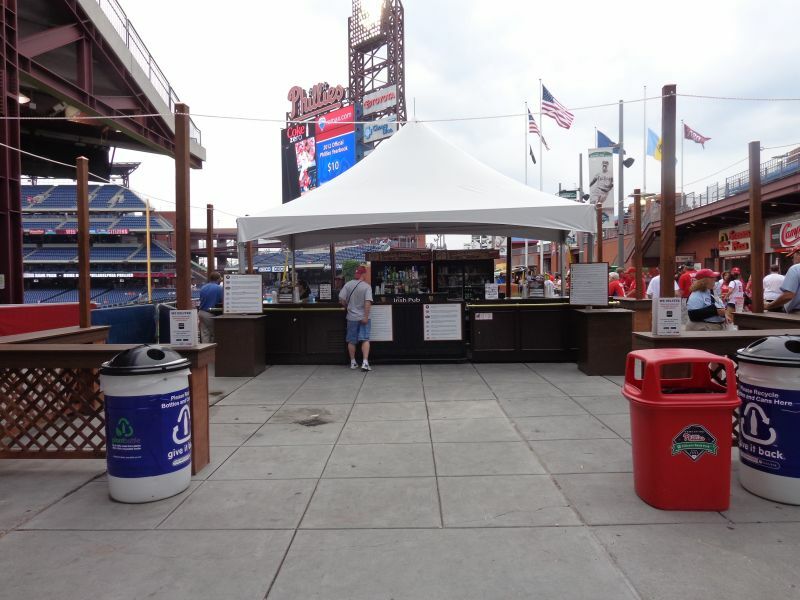 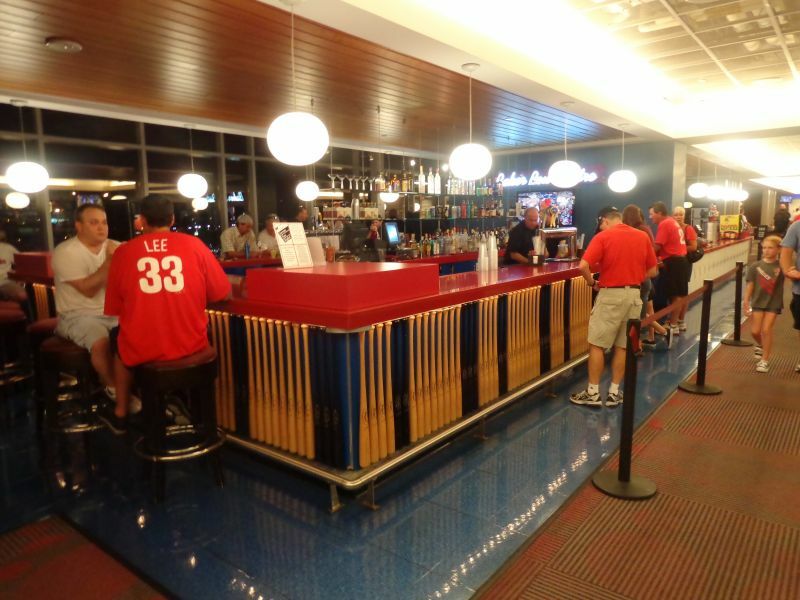 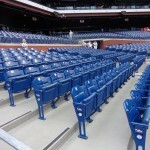 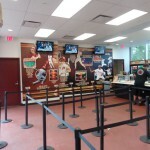 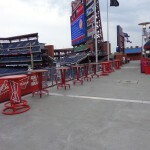 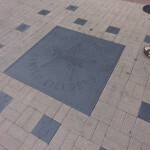 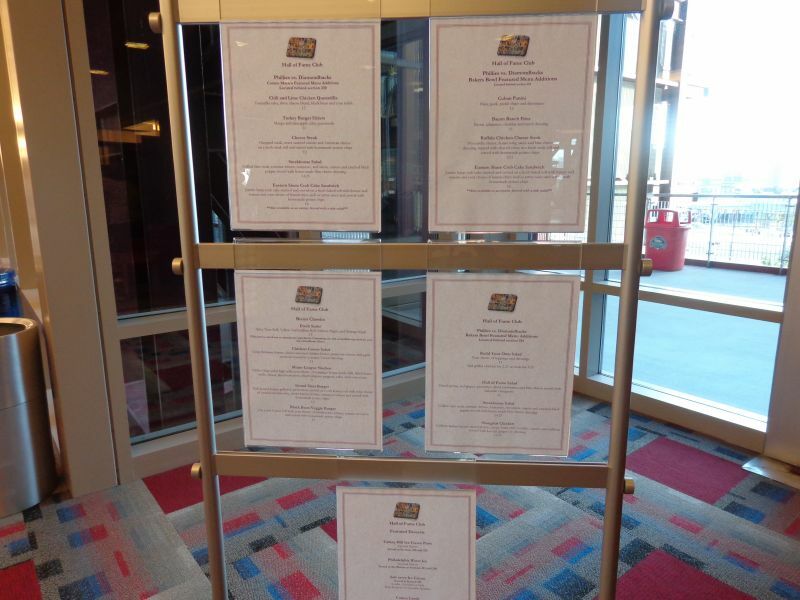 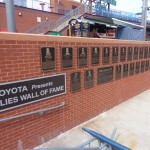 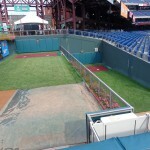 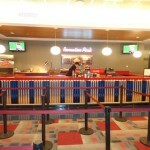 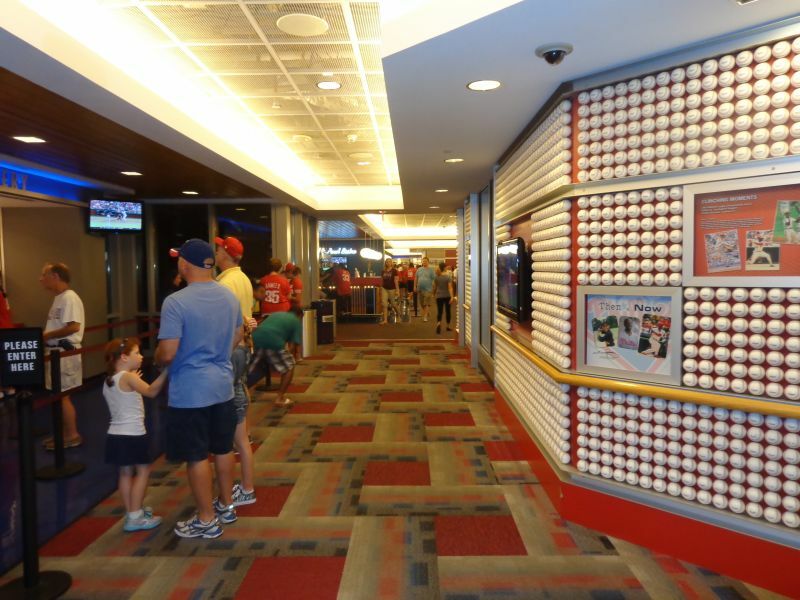 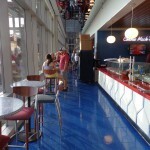 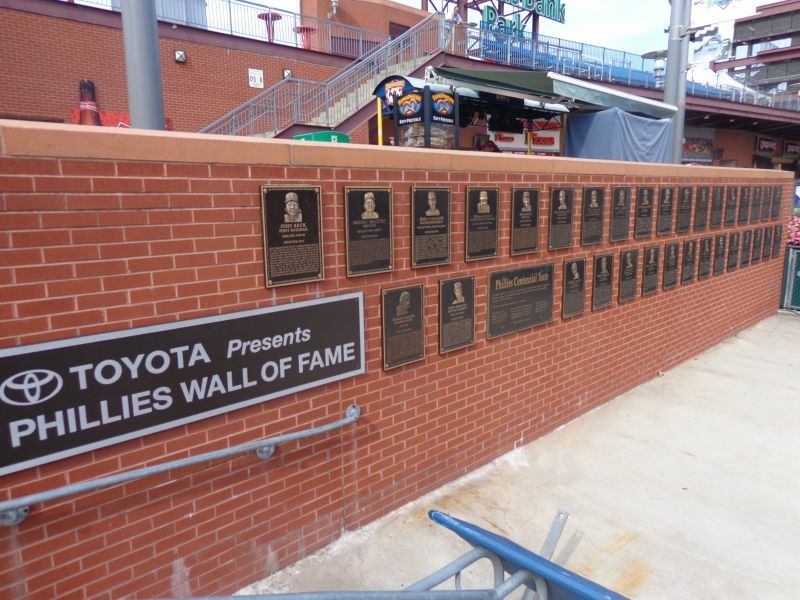 Little touches with great attention to detail have also come to define Citizens Bank Park. 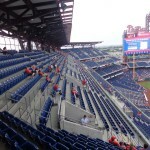 Like Comerica Park, they broke up the upper deck down the right field line, in order to put the farther upper deck closer and lower to the field. 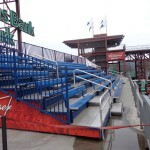 The grandstand features an angular design instead of a circular one, which is a nice change of pace. 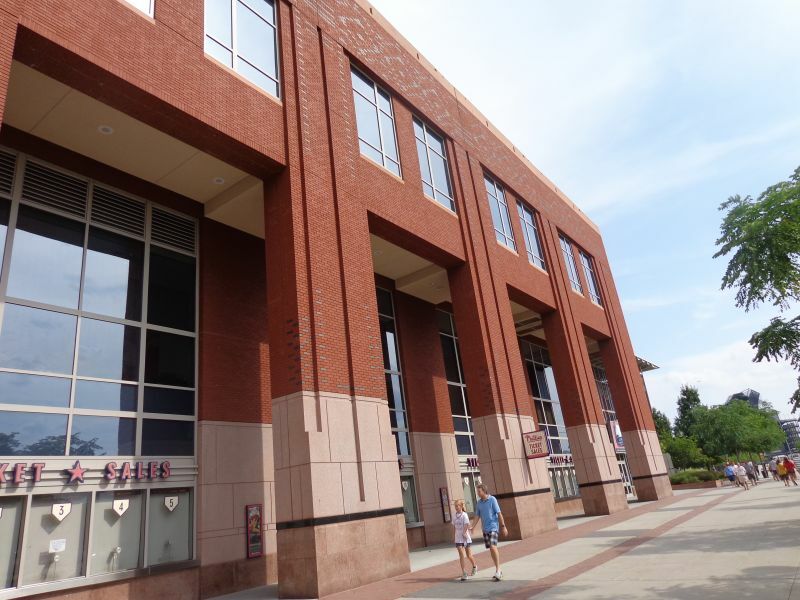 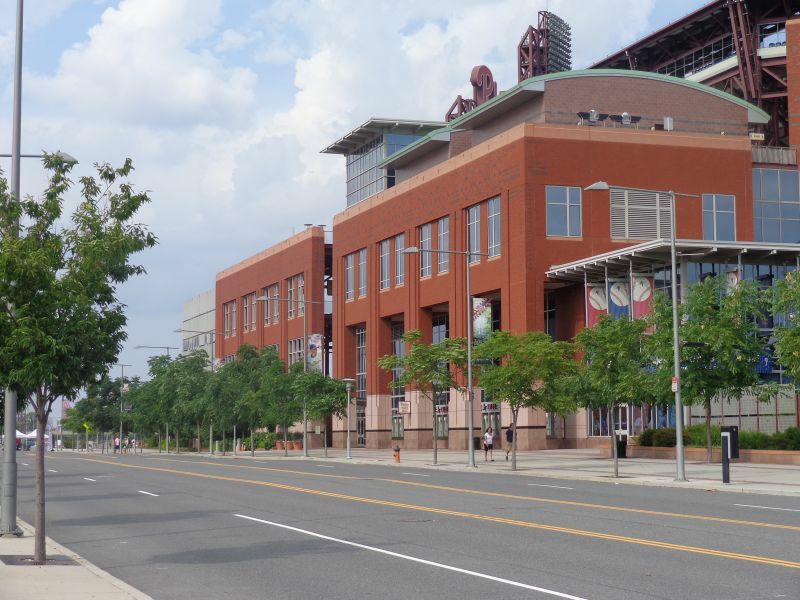 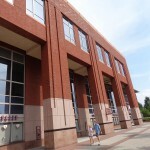 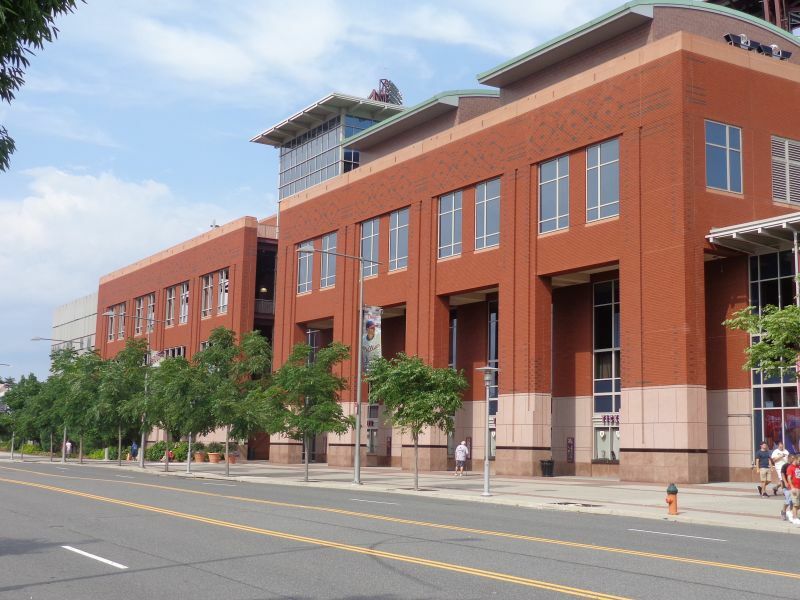 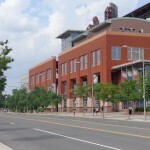 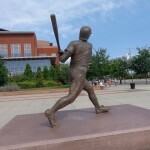 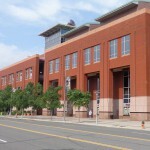 The brick exterior may leave much to be desired, but attractive red brick is omnipresent inside the ballpark, particularly around the batters’ eye, and it really works well. 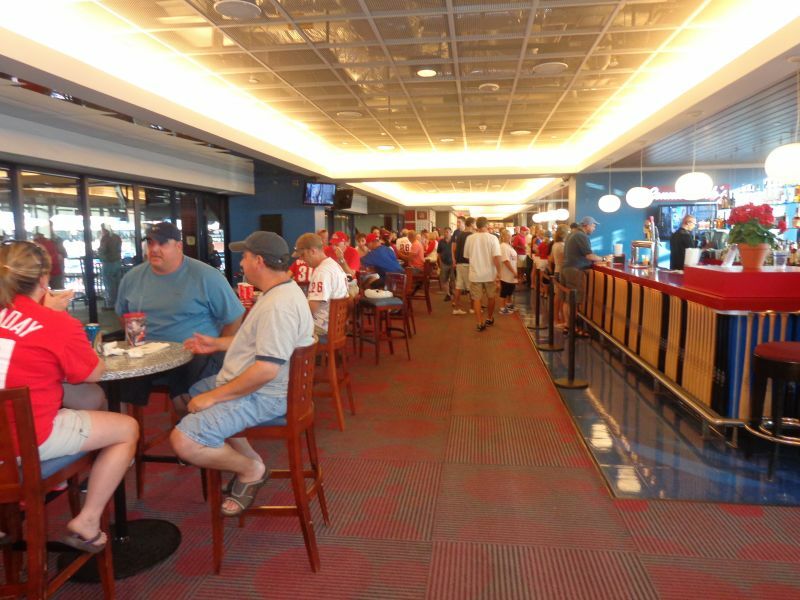 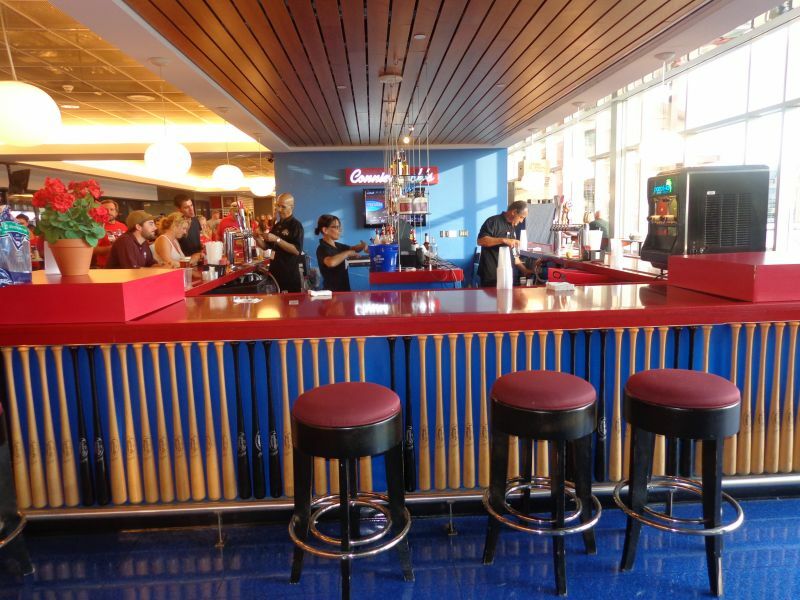 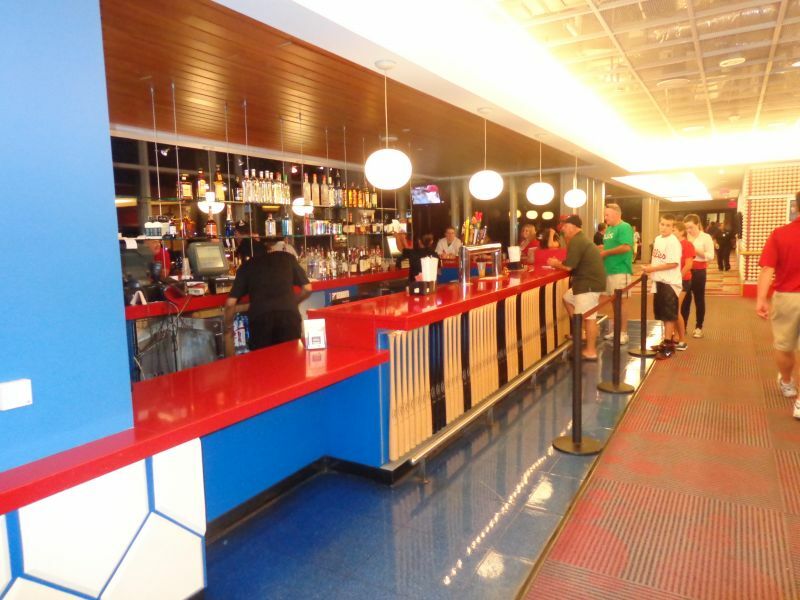 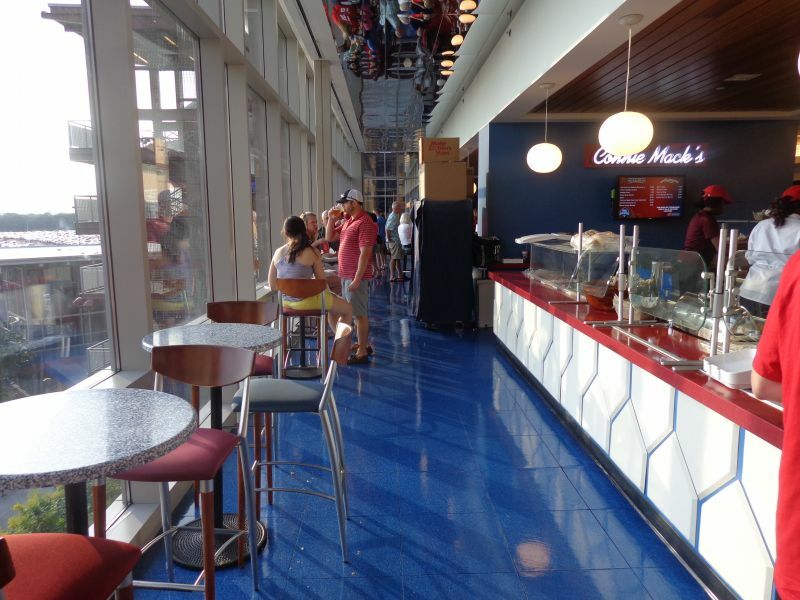 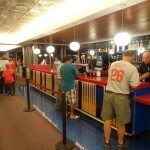 You might note the metal counter tops at the top of open concourses at other ballparks around baseball, allowing fans to put their food or drink down to watch the game from the concourse. 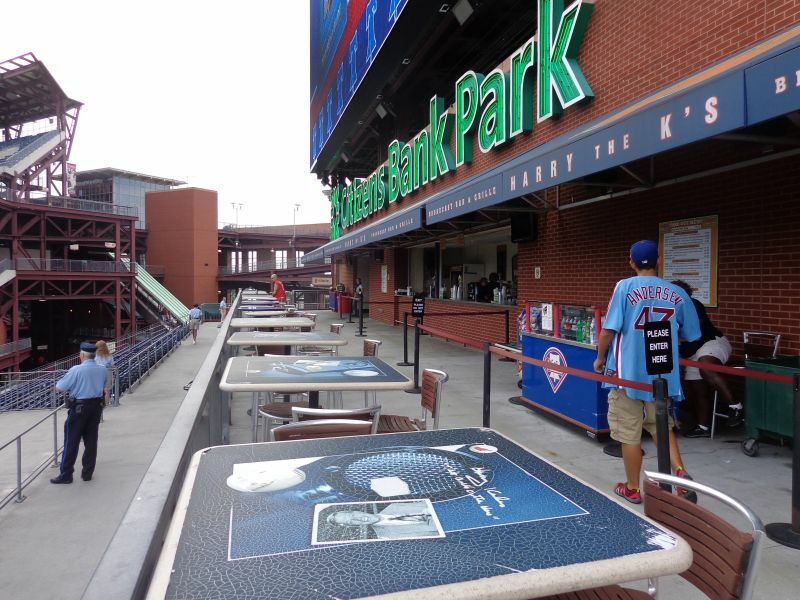 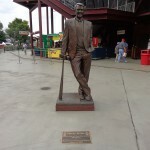 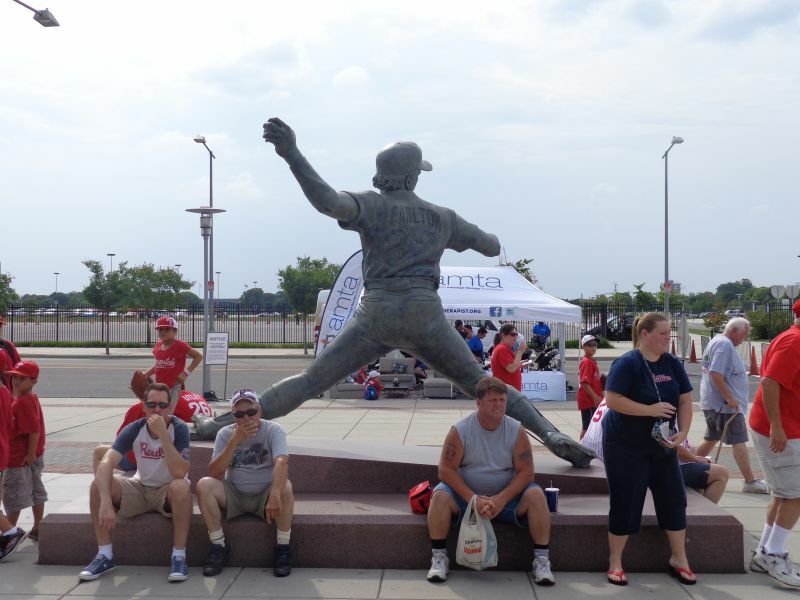 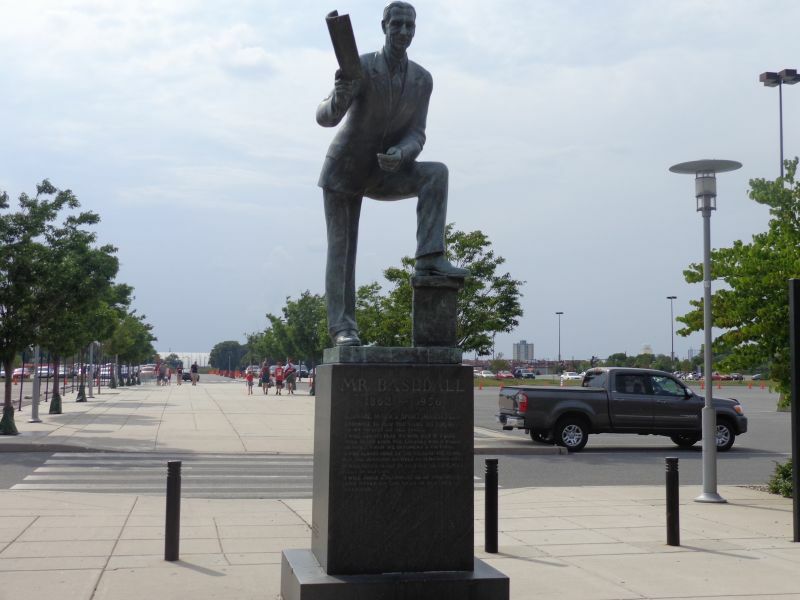 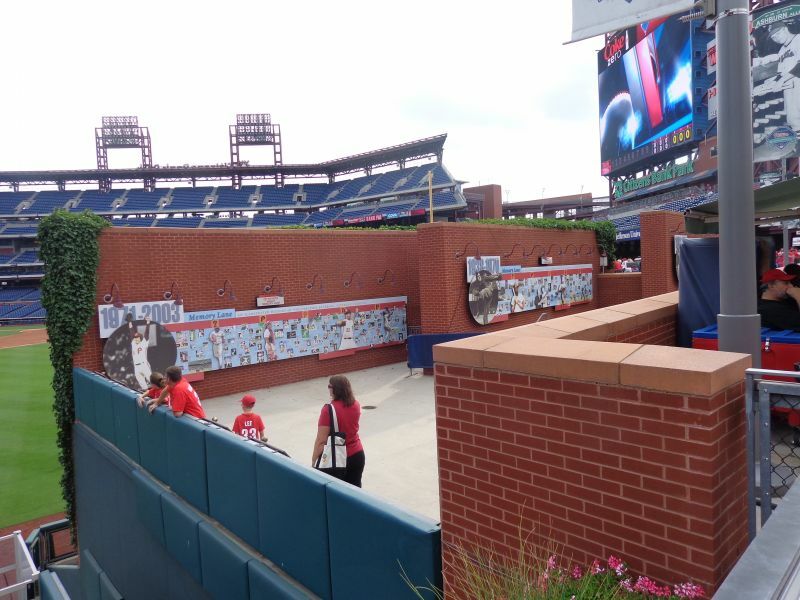 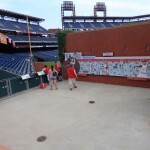 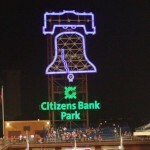 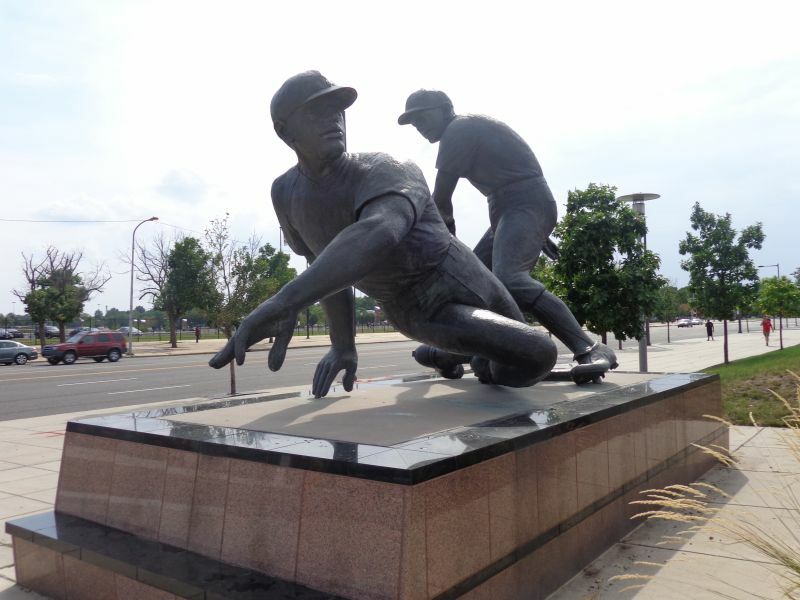 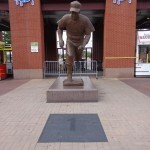 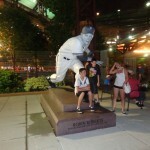 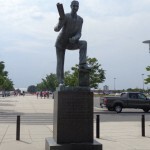 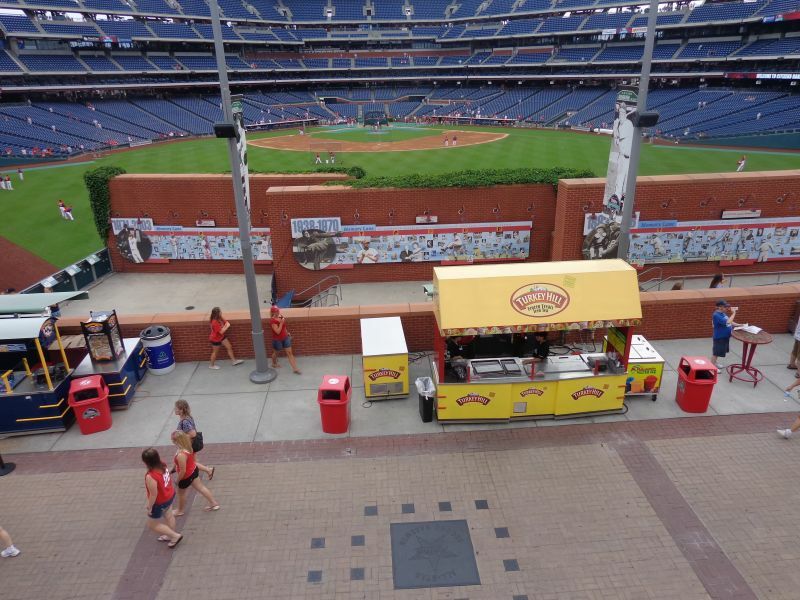 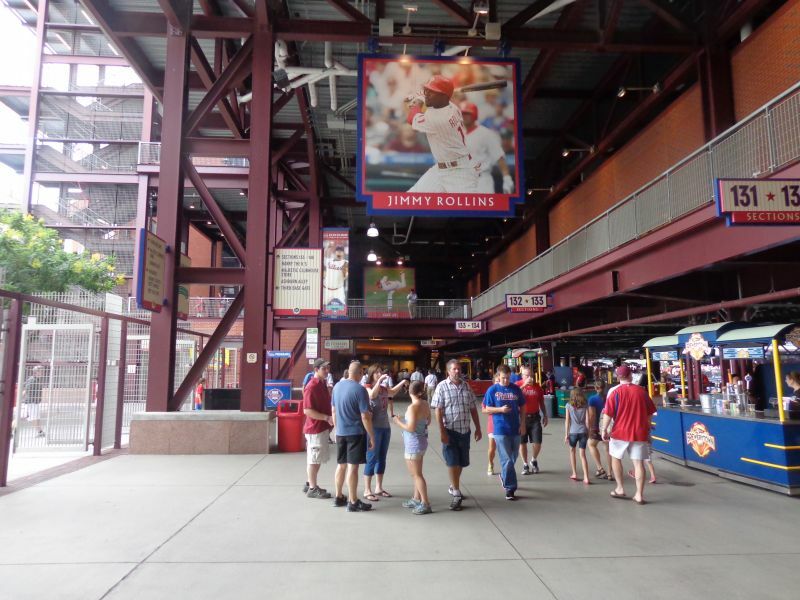 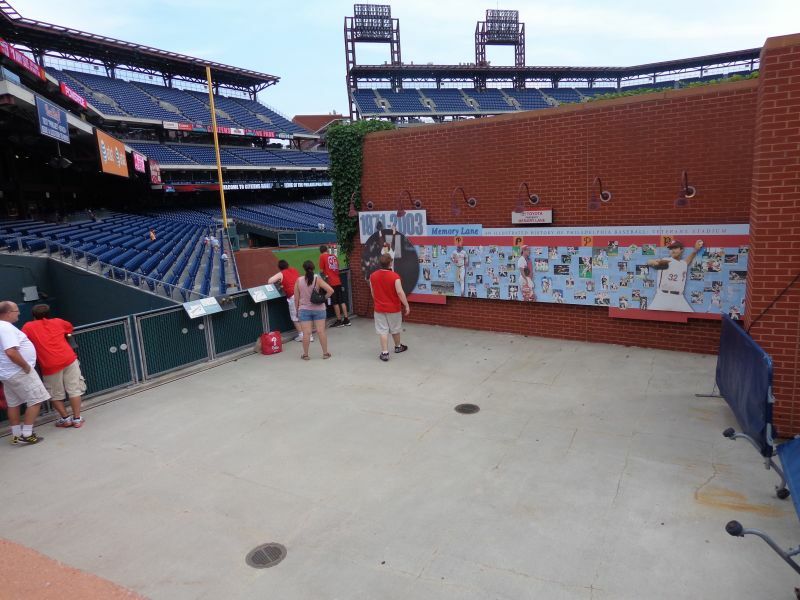 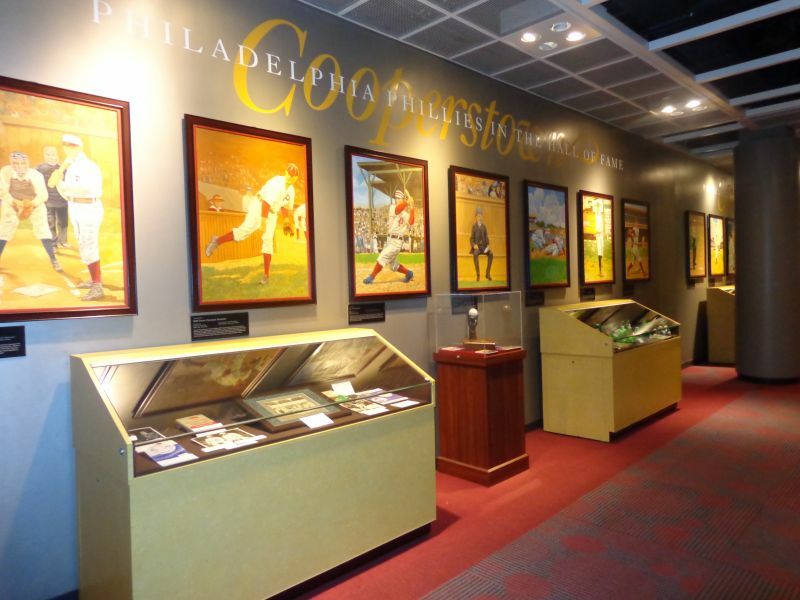 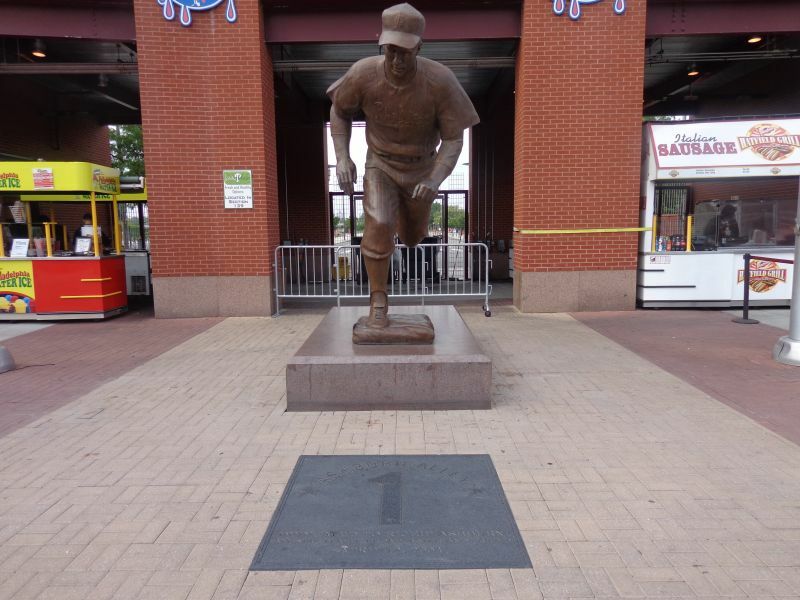 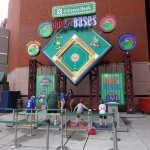 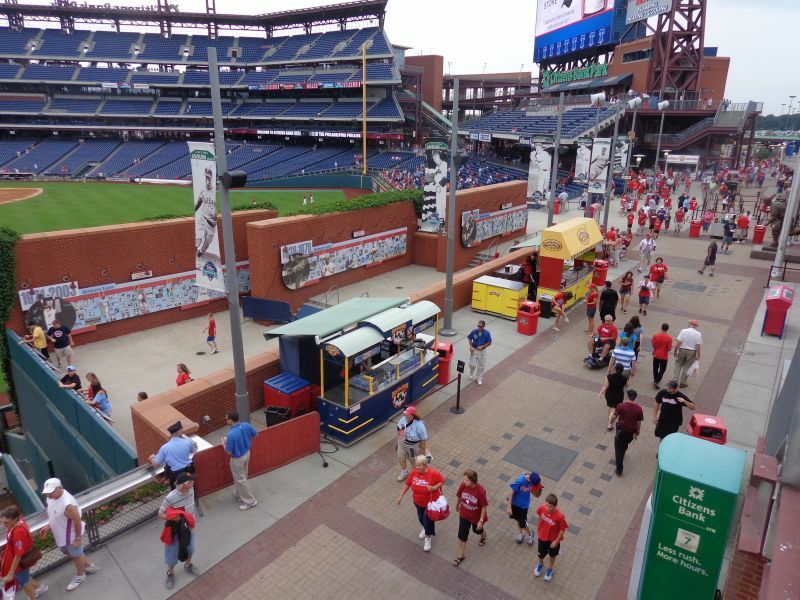 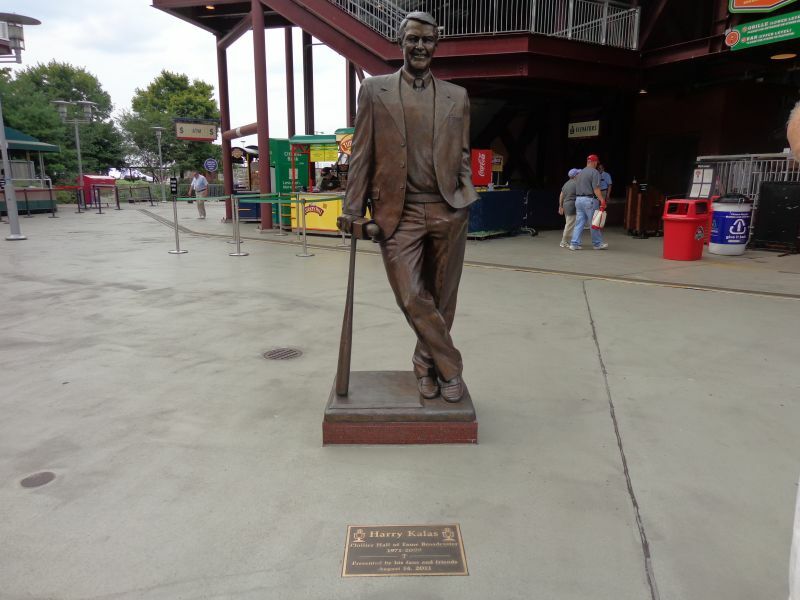 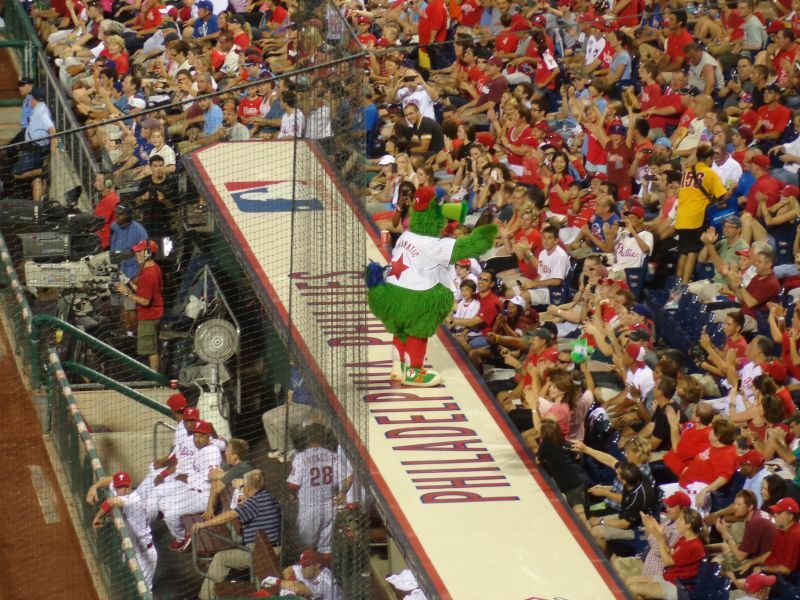 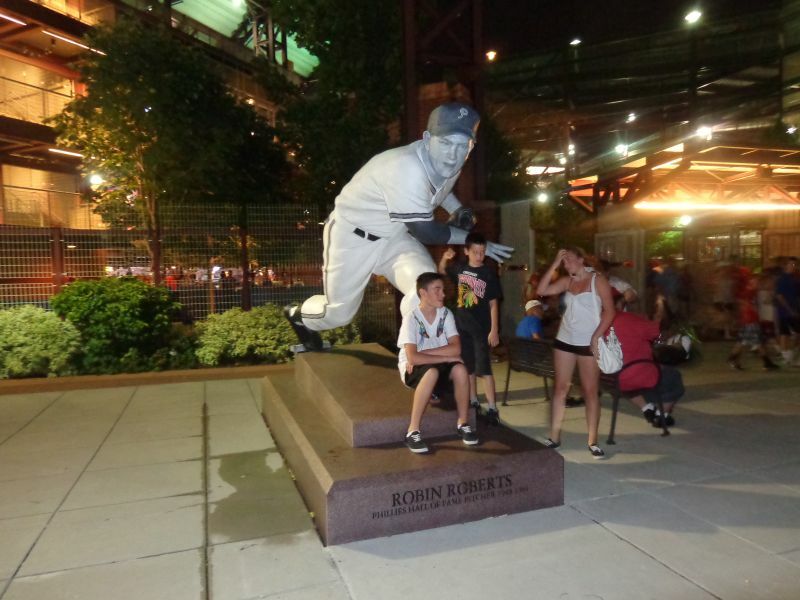 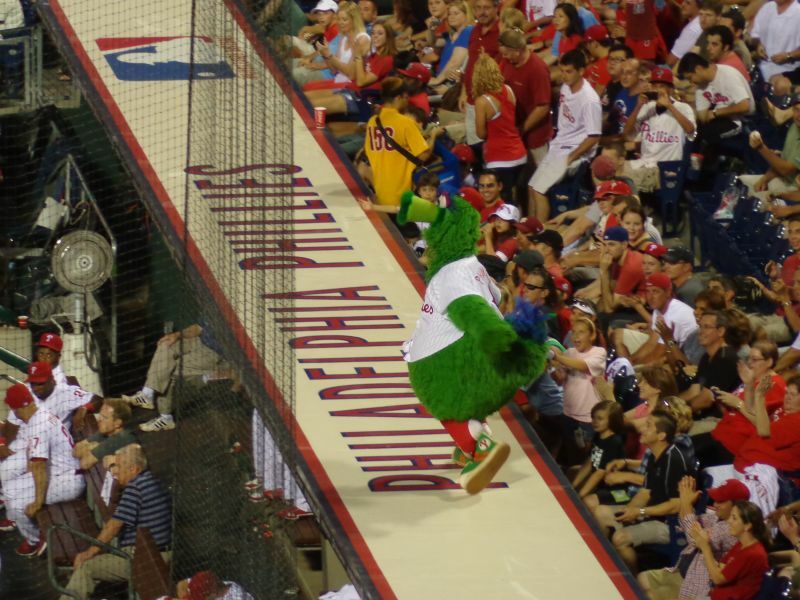 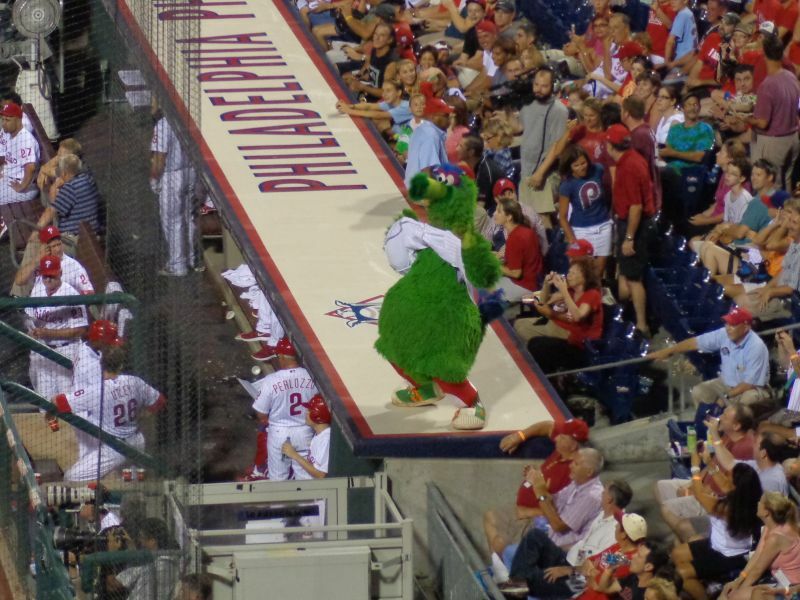 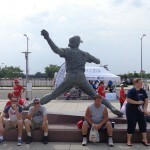 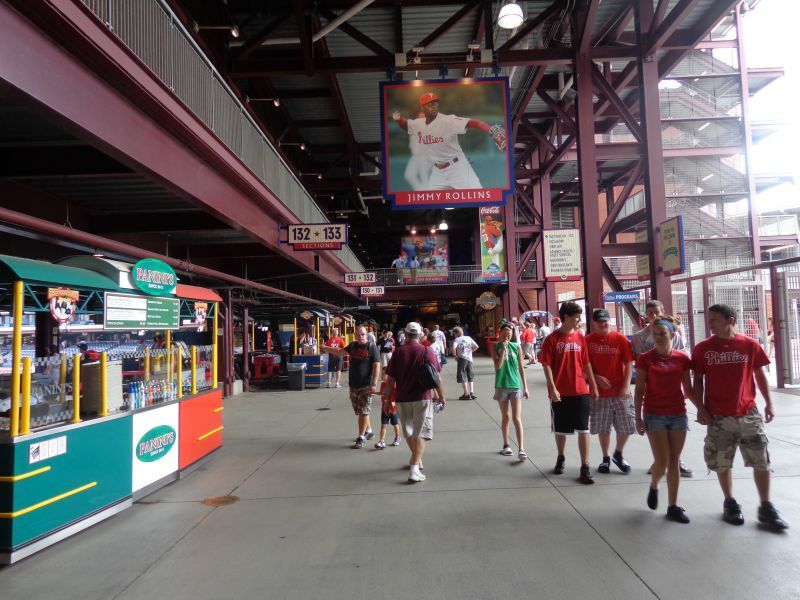 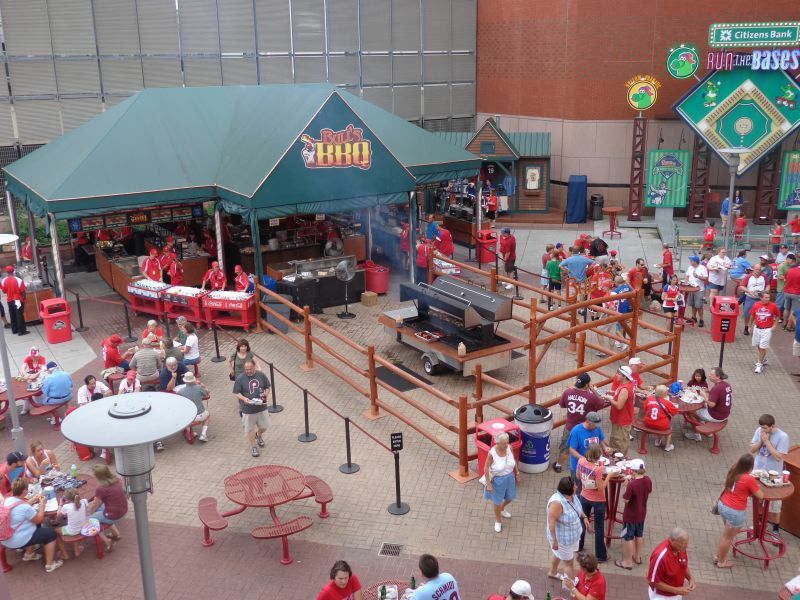 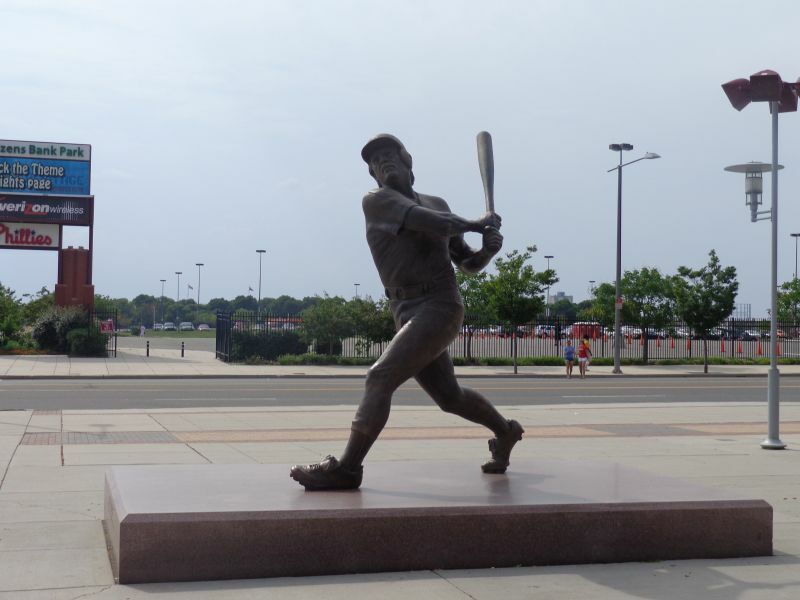 Citizens Bank Park started that, and other parks have retroactively emulated it. 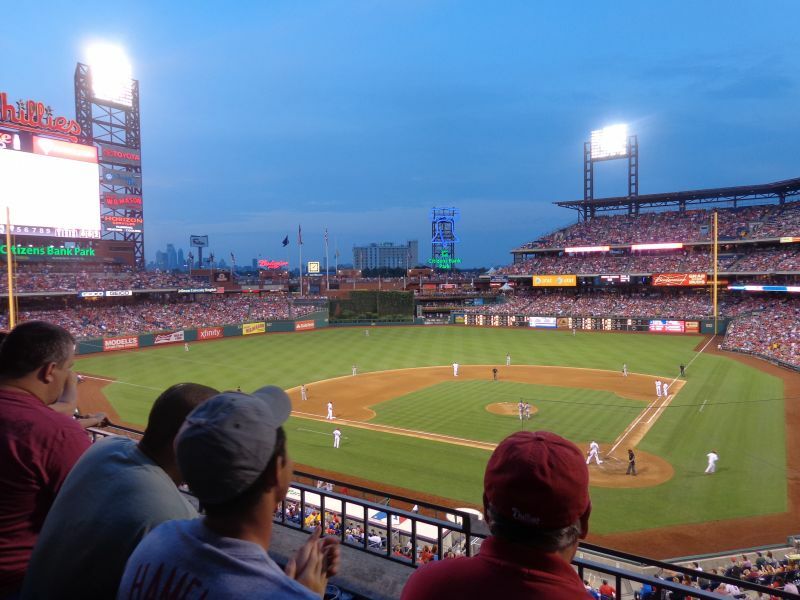 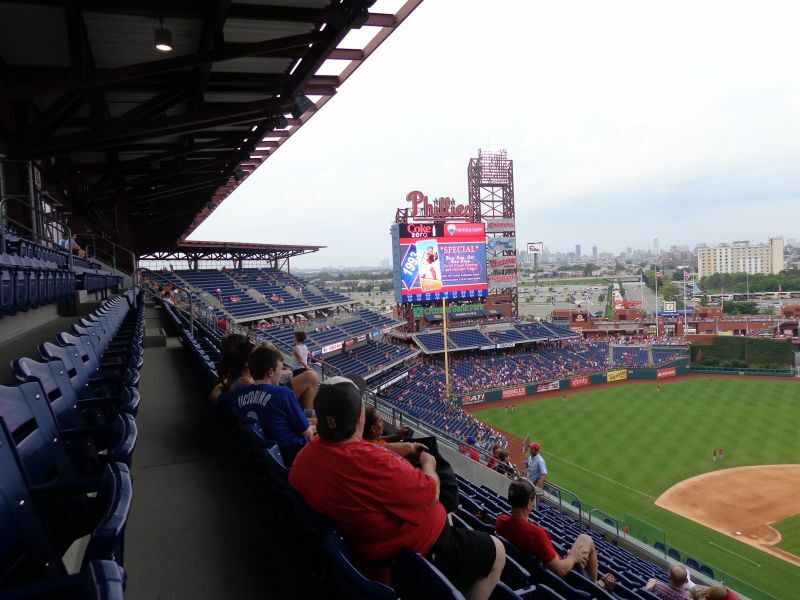 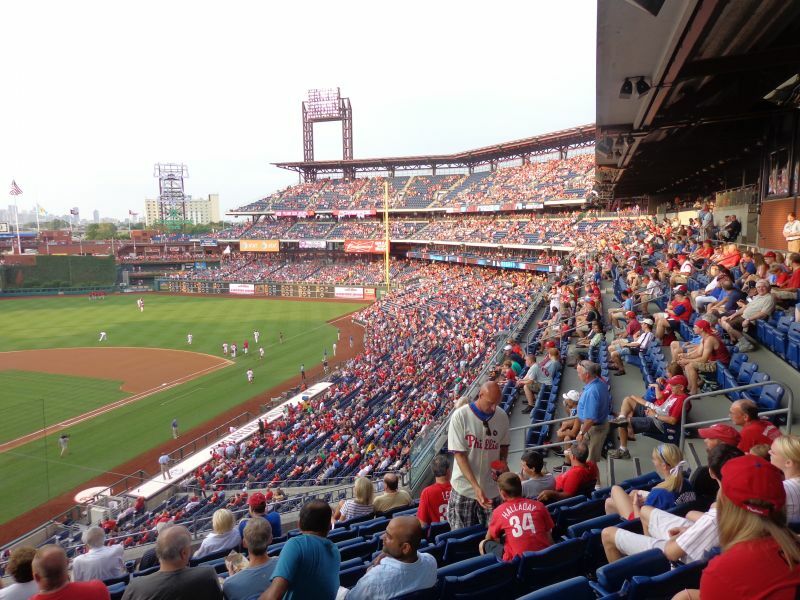 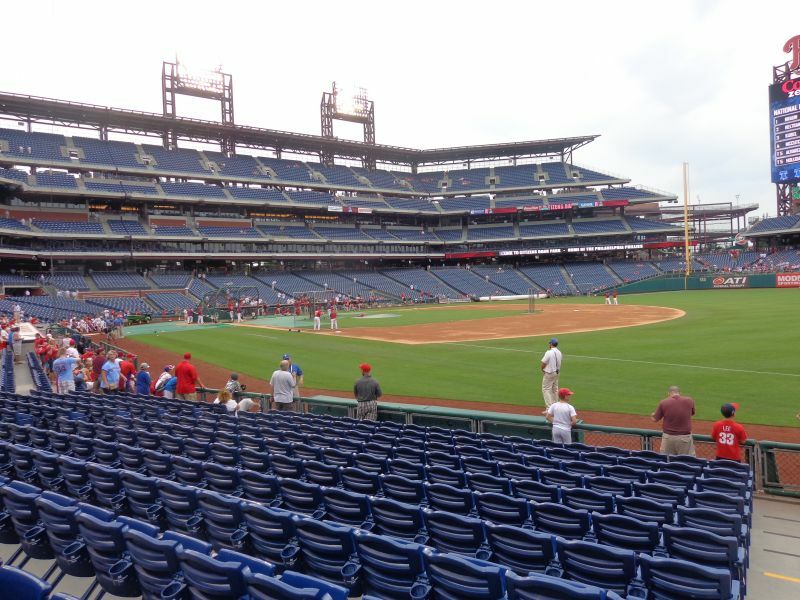 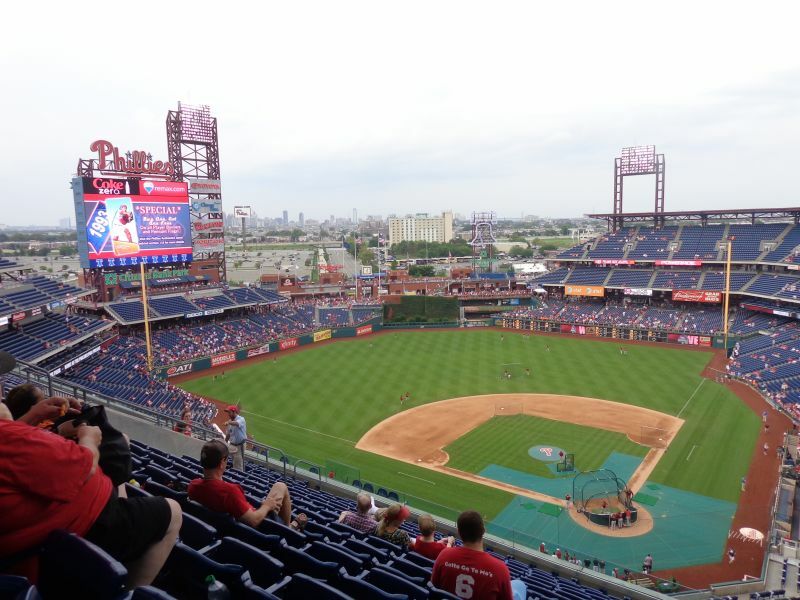 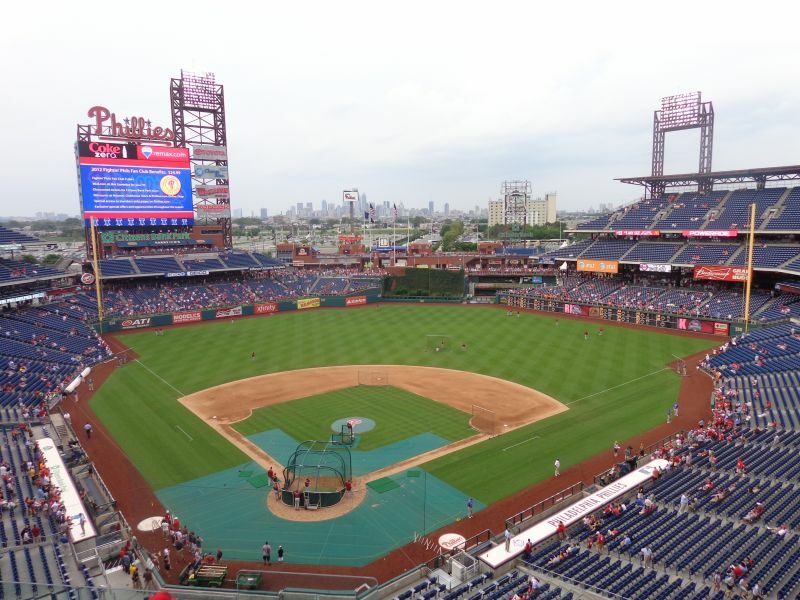 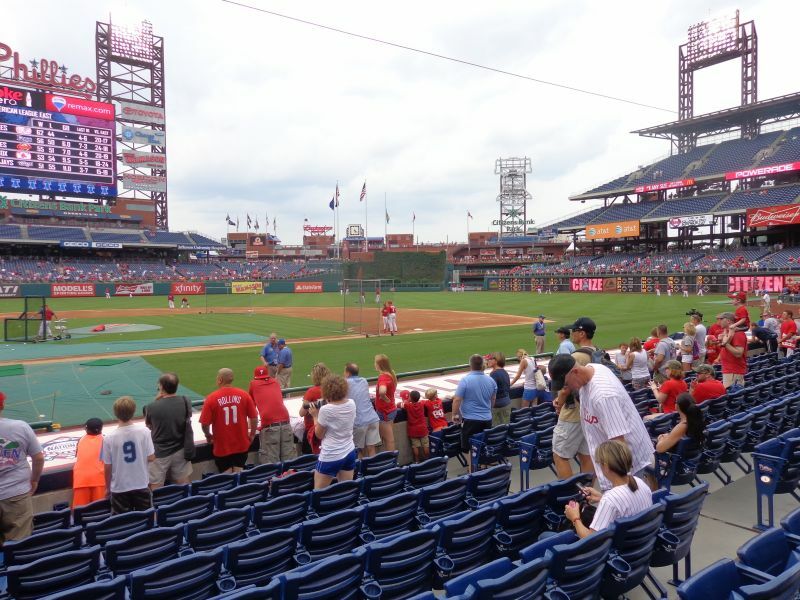 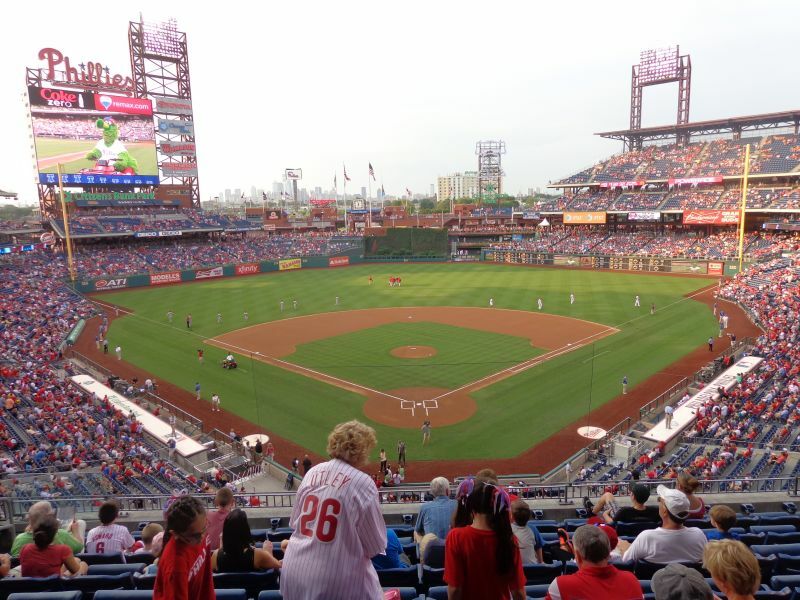 While the setting and its consequences for the exterior and interior aesthetics prevent Citizens Bank Park from reaching the level of the best parks in baseball, the Phillies’ ballpark is still an outstanding place to see a game. 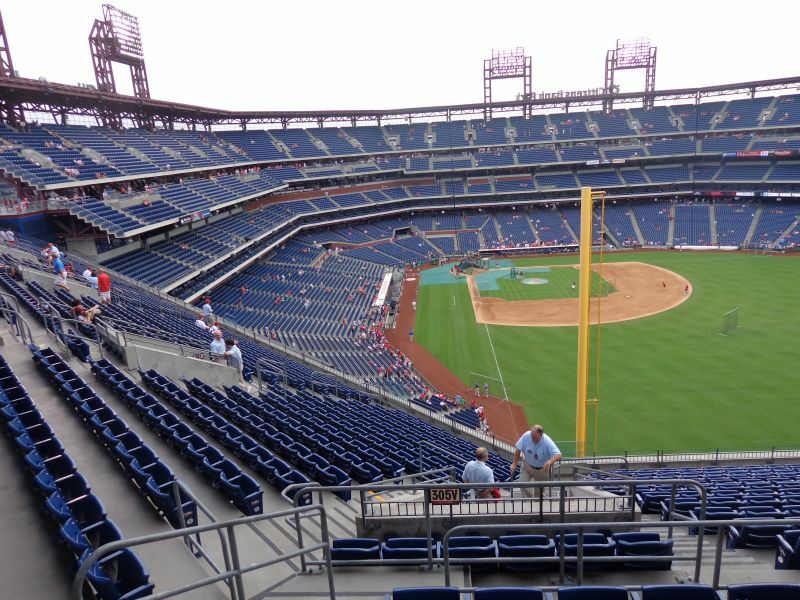 In a way, Citizens Bank Park is kind of like the second Camden Yards in ballpark design, but from a functional point of view. 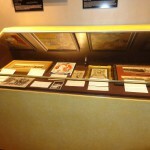 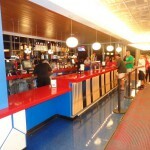 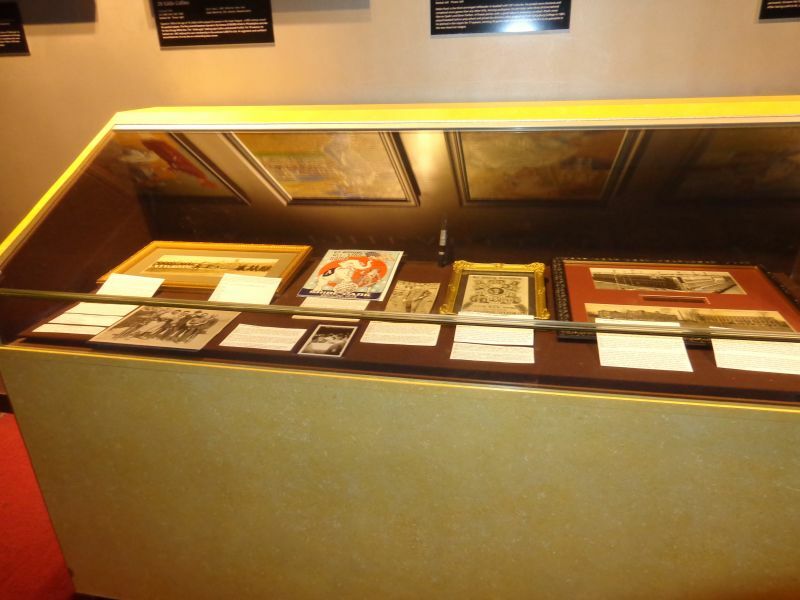 Many of the fan friendly amenities and effective design cues you see here have been copied in subsequent parks.